Congratulations Ajit pal Singh & Parminder Kaur. They got tourist visa of Australia. 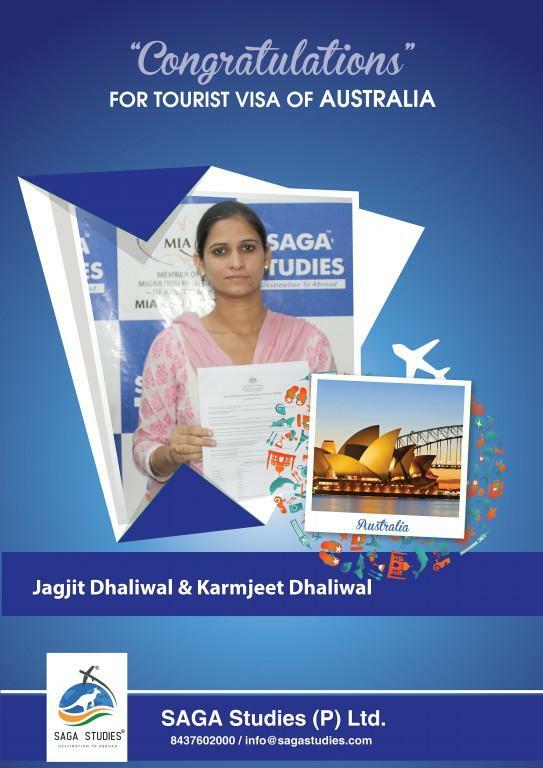 SAGA Studies wishing you success and Prosperous life ahead. 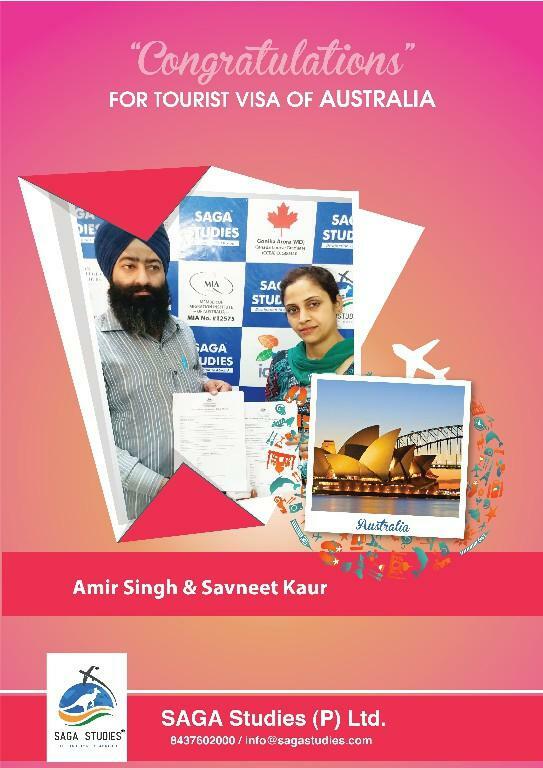 Congratulations Amrik Singh & Sukhwant Kaur. They got tourist visa of Canada. 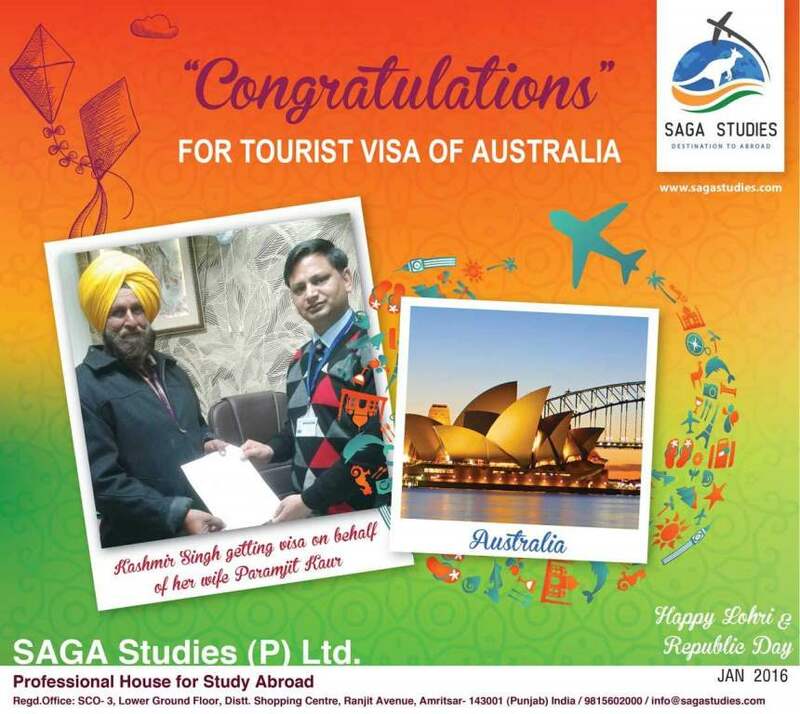 SAGA Studies wishing you success and Prosperous life ahead. 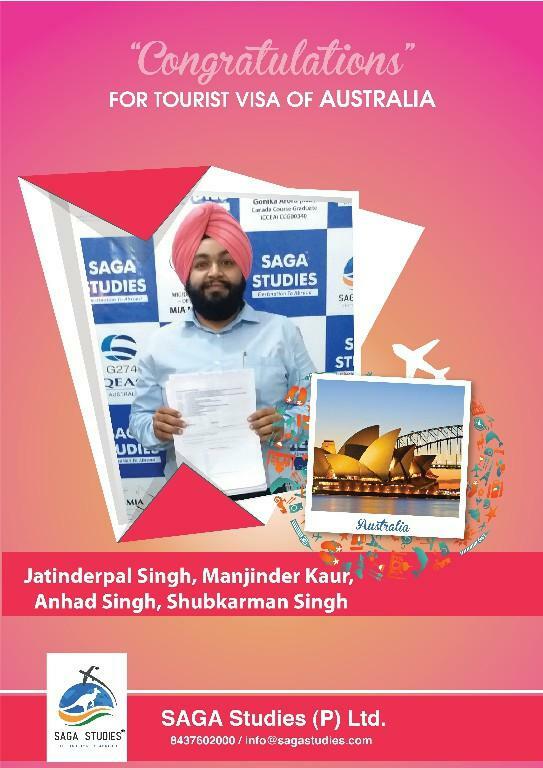 Congratulations Amandeep Singh, Khushbir Kaur & Sahibveer Singh. They got tourist visa of Australia. 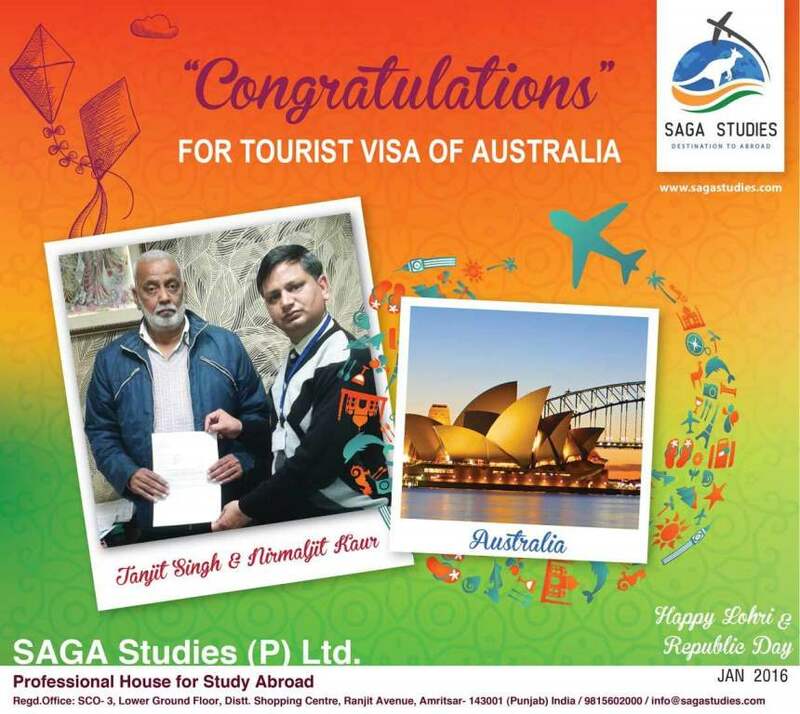 SAGA Studies wishing you success and Prosperous life ahead. Congratulations Gurwinder Kaur. She got tourist visa of Australia. SAGA Studies wishing you success and Prosperous life ahead. Congratulations Jagdeep Singh & Harkomal Singh. 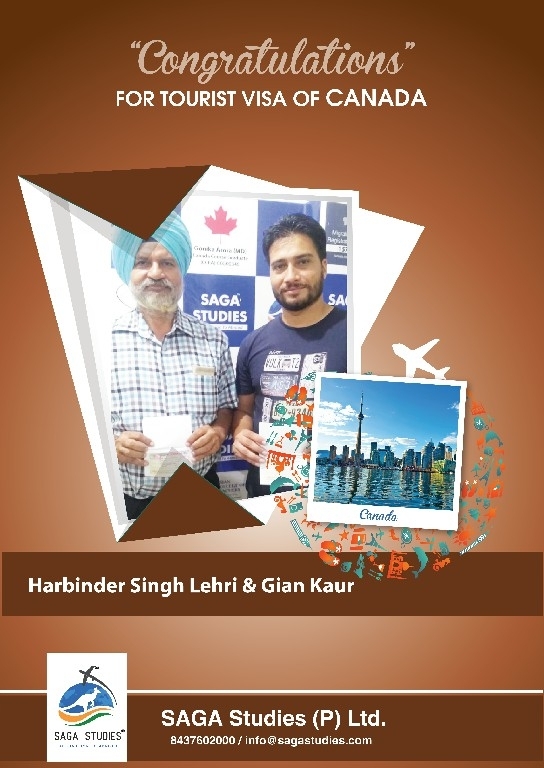 They got tourist visa of Canada. SAGA Studies wishing you success and Prosperous life ahead. 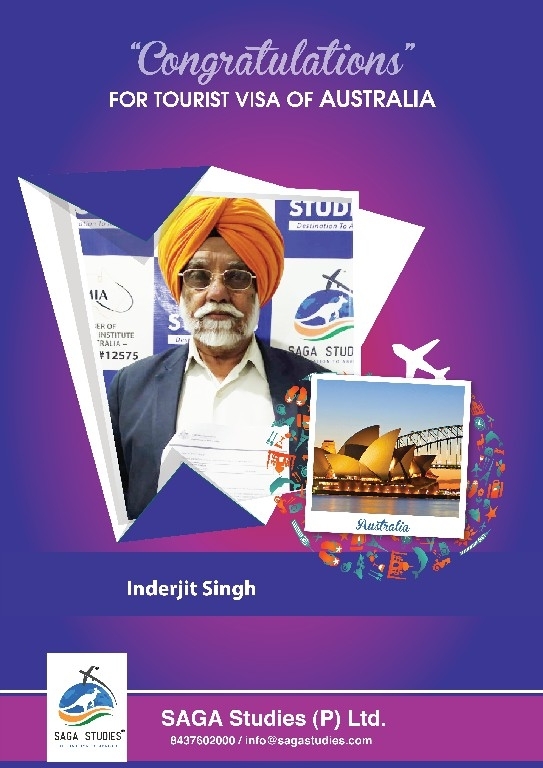 Congratulations Inderjit Singh. 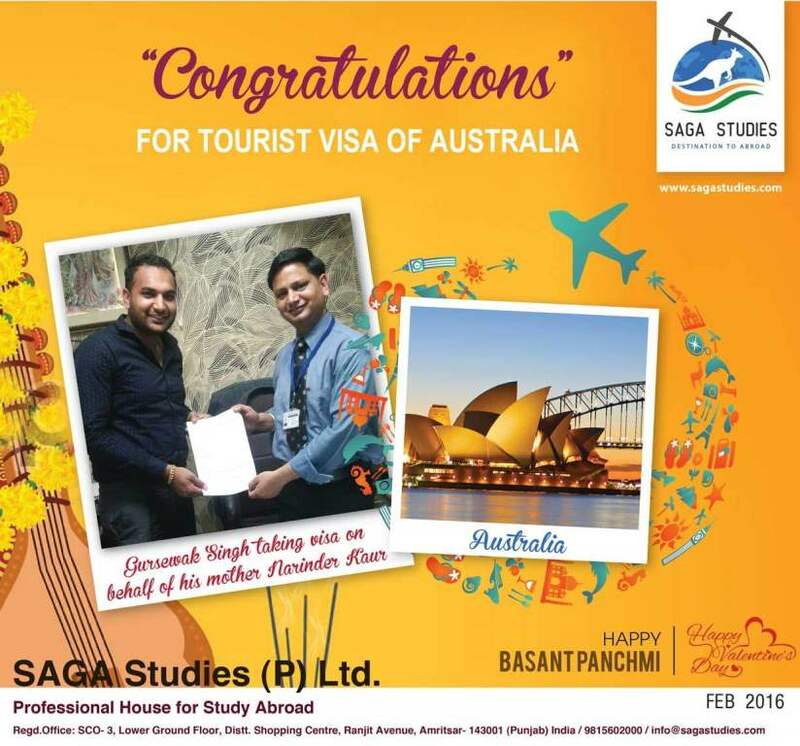 He got tourist visa of Australia. SAGA Studies wishing you success and Prosperous life ahead. 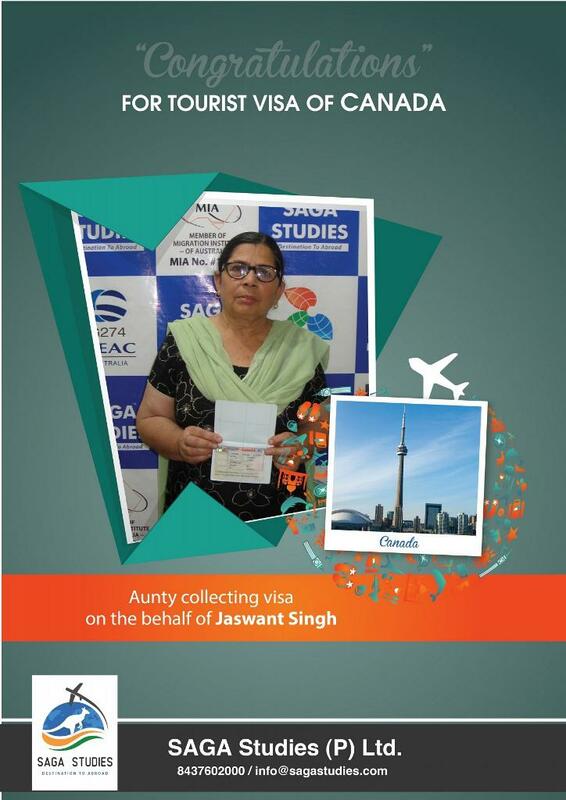 Congratulations Jasbir Kaur. She got tourist visa of Canada. 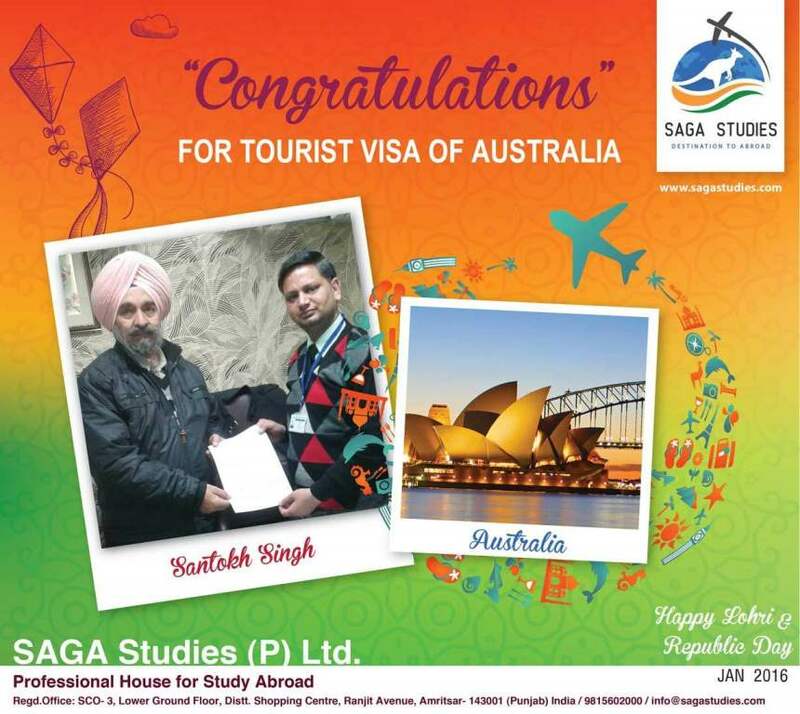 SAGA Studies wishing you success and Prosperous life ahead. Congratulations Jagdish chander, Kusam & Priya. 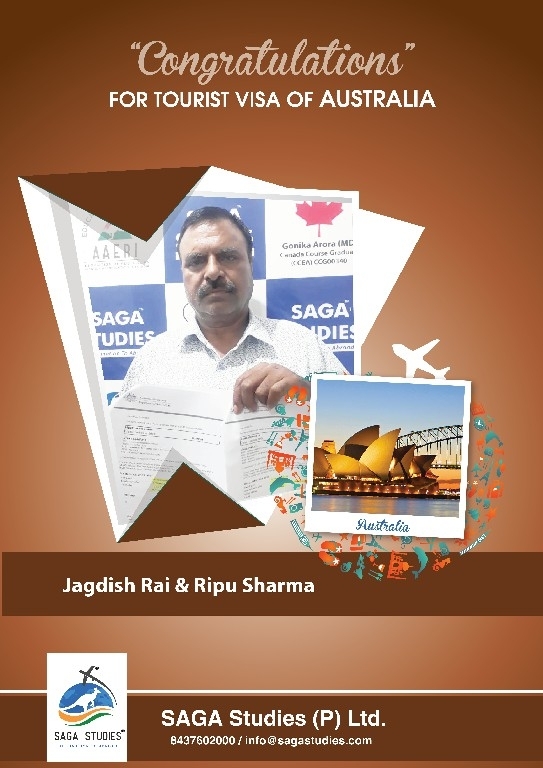 They got tourist visa of Australia. SAGA Studies wishing you success and Prosperous life ahead. — at SAGA Studies (P) Ltd.
Congratulations Rajinder Kaur. 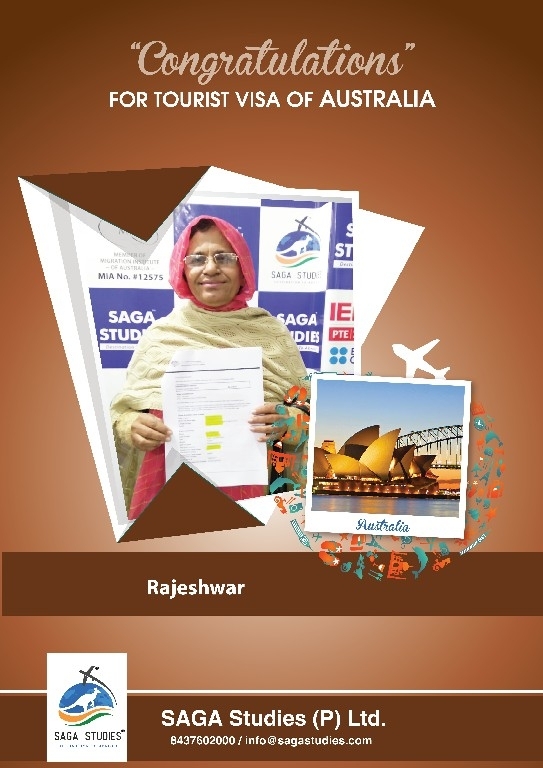 She got tourist visa of Australia. 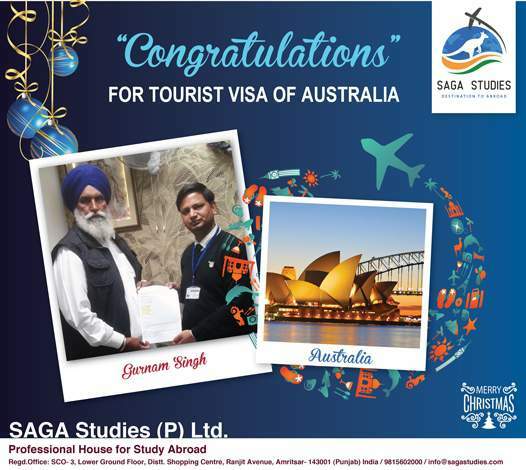 SAGA Studies wishing you success and Prosperous life ahead. 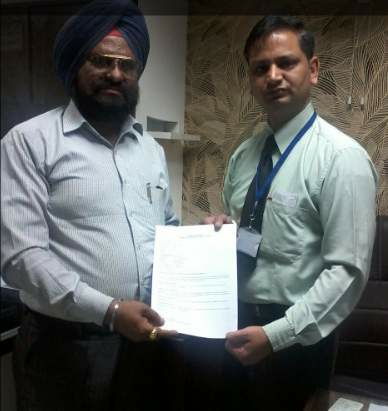 Congratulations Ramesh Bhasin & Kulwant Bhasin. They got tourist visa of Australia. SAGA Studies wishing you success and Prosperous life ahead. Congratulations Satnam Singh & Rajwant Kaur. 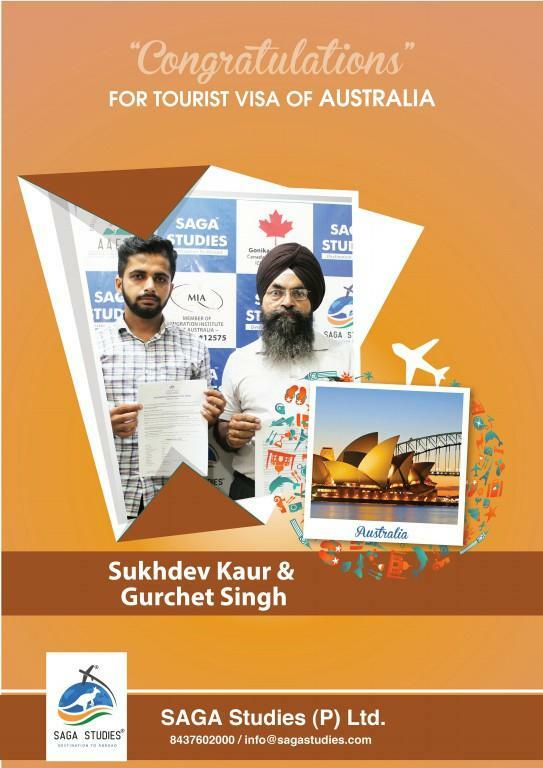 They got tourist visa of Australia. SAGA Studies wishing you success and Prosperous life ahead. 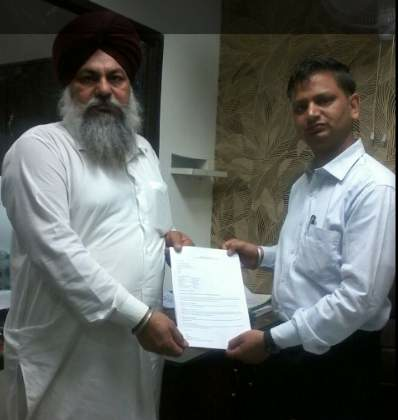 Congratulations Satpal Singh Nijjar & Malkit Kaur Nijjar. They got tourist visa of Australia. SAGA Studies wishing you success and Prosperous life ahead. 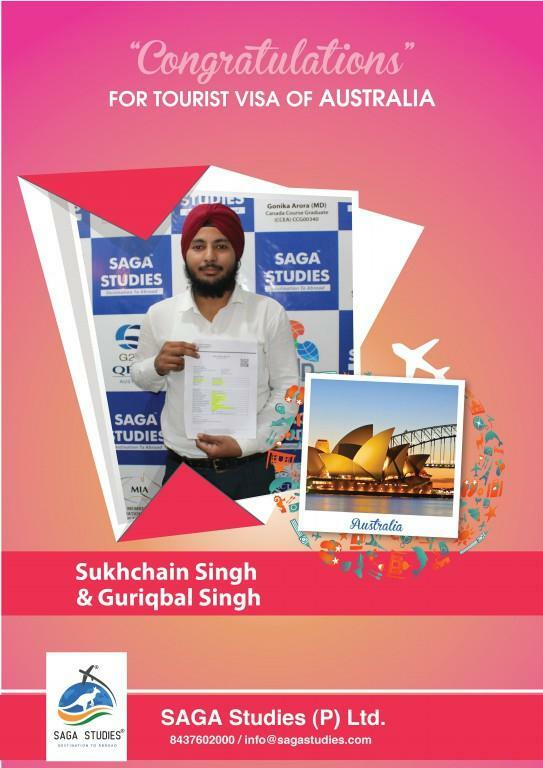 Congratulations Sukhbir Singh. 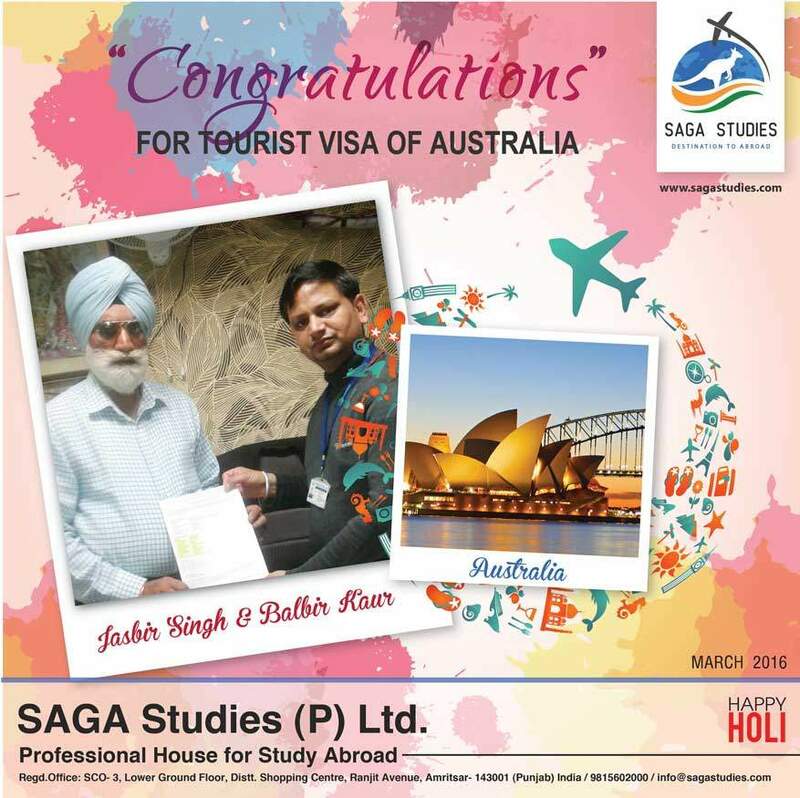 He got tourist visa of Australia. SAGA Studies wishing you success and Prosperous life ahead. Congratulations Amritpal Singh & Navninder Kaur. They got tourist visa of Australia. SAGA Studies wishes you success and Prosperous life ahead. 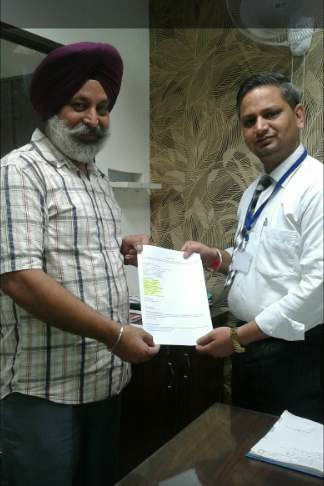 Baldev Singh & Amrik Kaur. 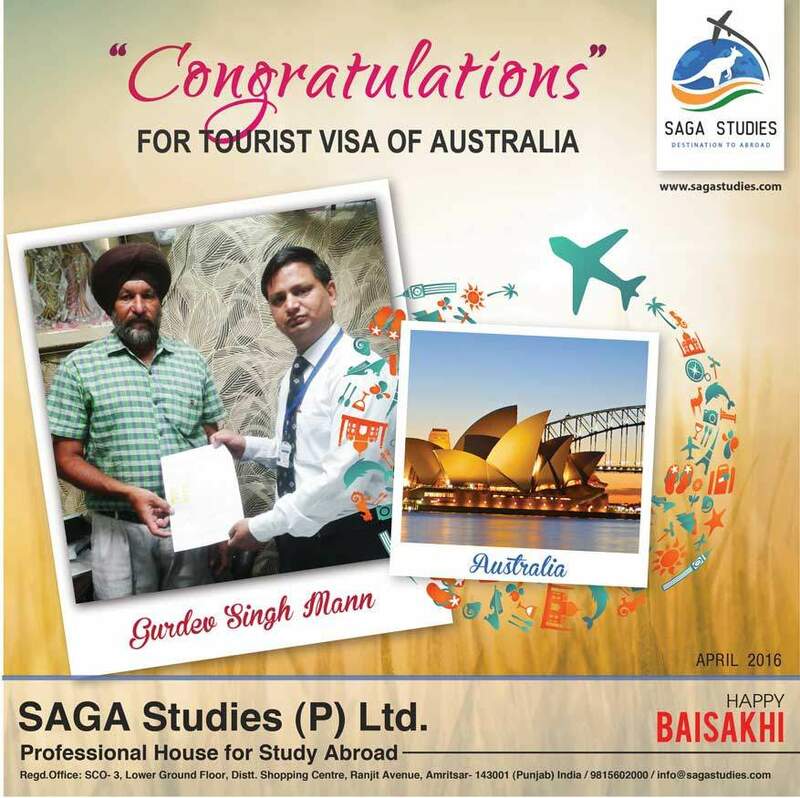 Congratulations Baldev Singh & Amrik Kaur. They got tourist visa of Canada. SAGA Studies wishing you success and Prosperous life ahead. Congratulations Balvinder Singh. 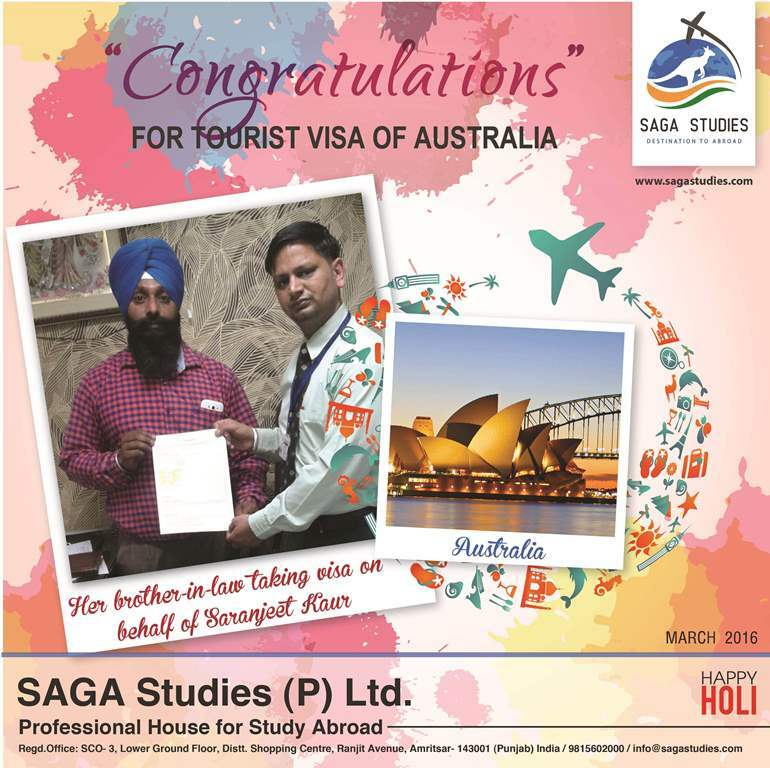 He got tourist visa of Australia. SAGA Studies wishes you success and Prosperous life ahead. 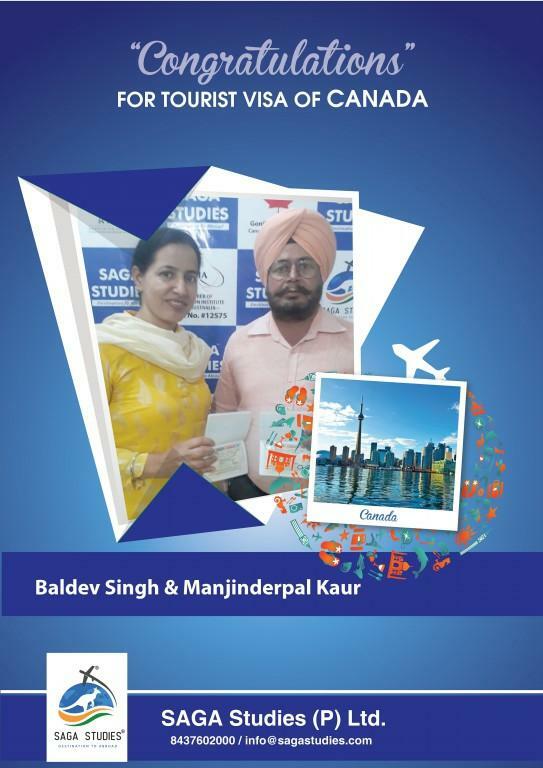 Congratulations Balwinder Kaur & Davinder Singh. They got tourist visa of Australia. SAGA Studies wishes you success and Prosperous life ahead. 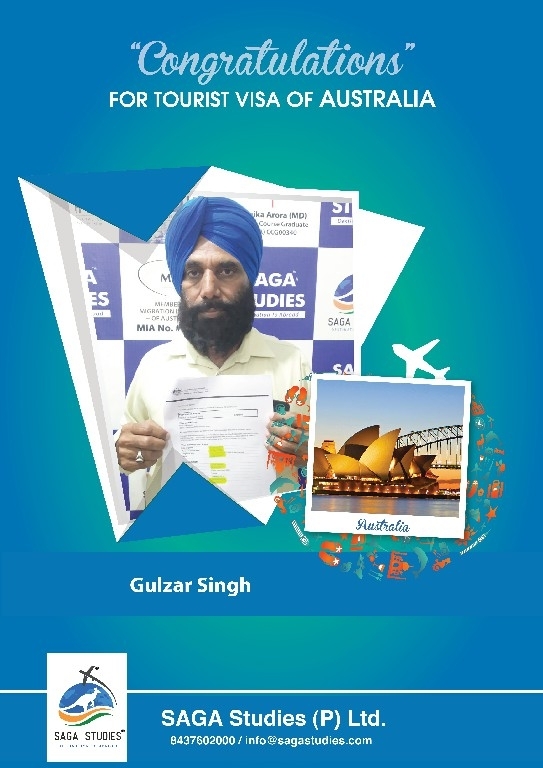 Congratulations Gulzar Singh. 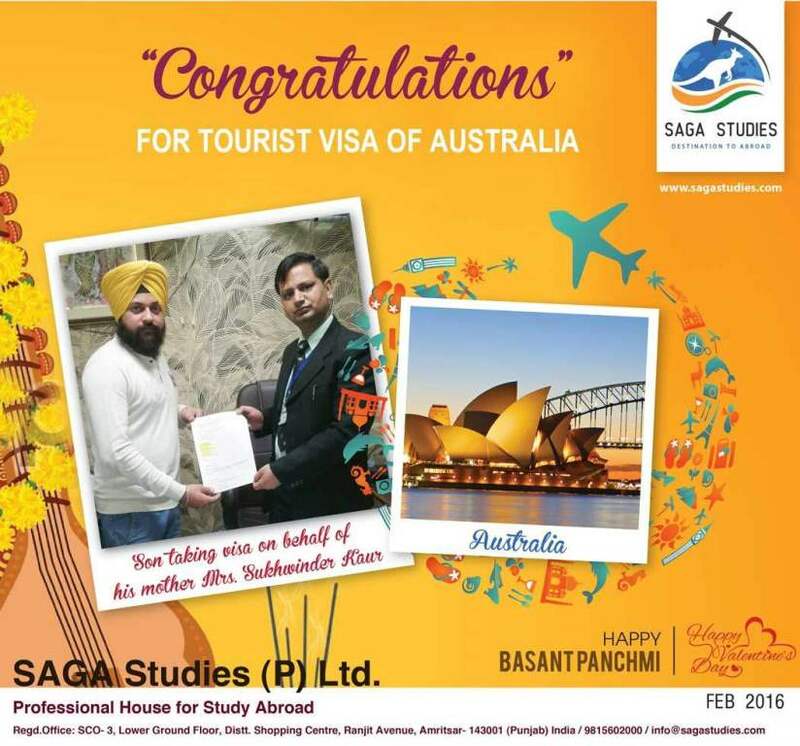 He got tourist visa of Australia. SAGA Studies wishes you success and Prosperous life ahead. Congratulations Gurbinder jeet Singh & Lakhwinder Kaur. 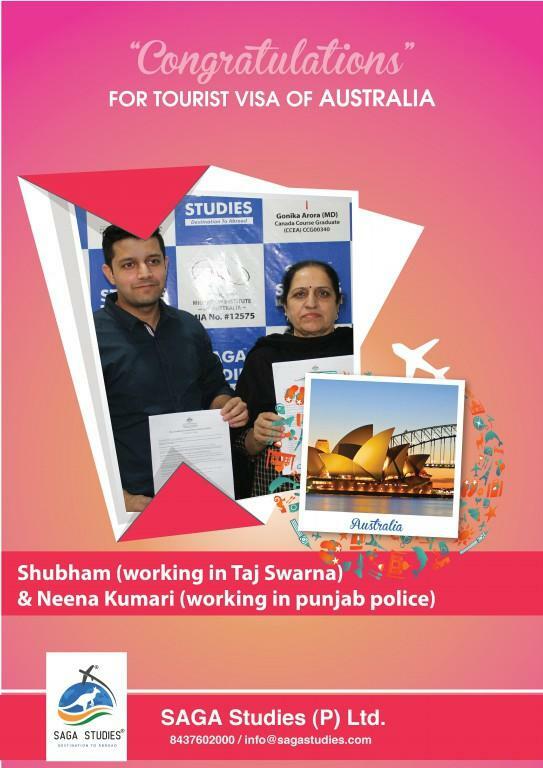 They got tourist visa of Australia. SAGA Studies wishes you success and Prosperous life ahead. 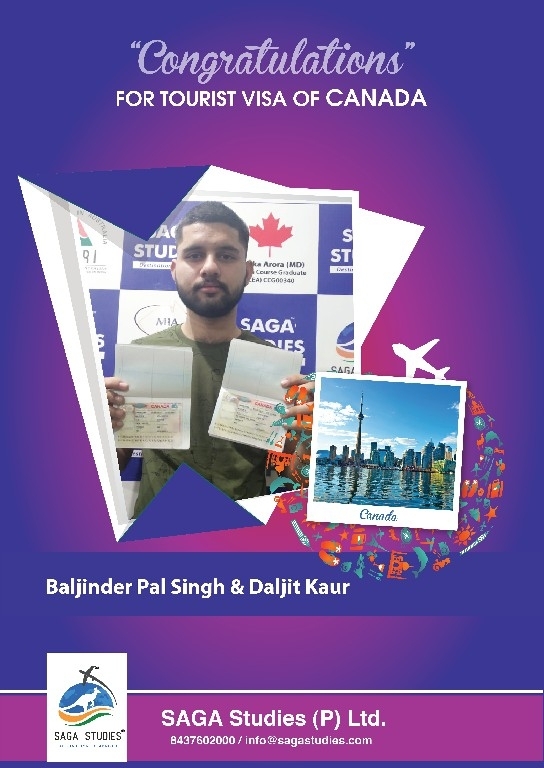 Congratulations Gurbir Singh, Davinder pal Singh & Baljit Kaur. They got tourist visa of Australia. SAGA Studies wishes you success and Prosperous life ahead. Congratulations Gurwinder Kaur. 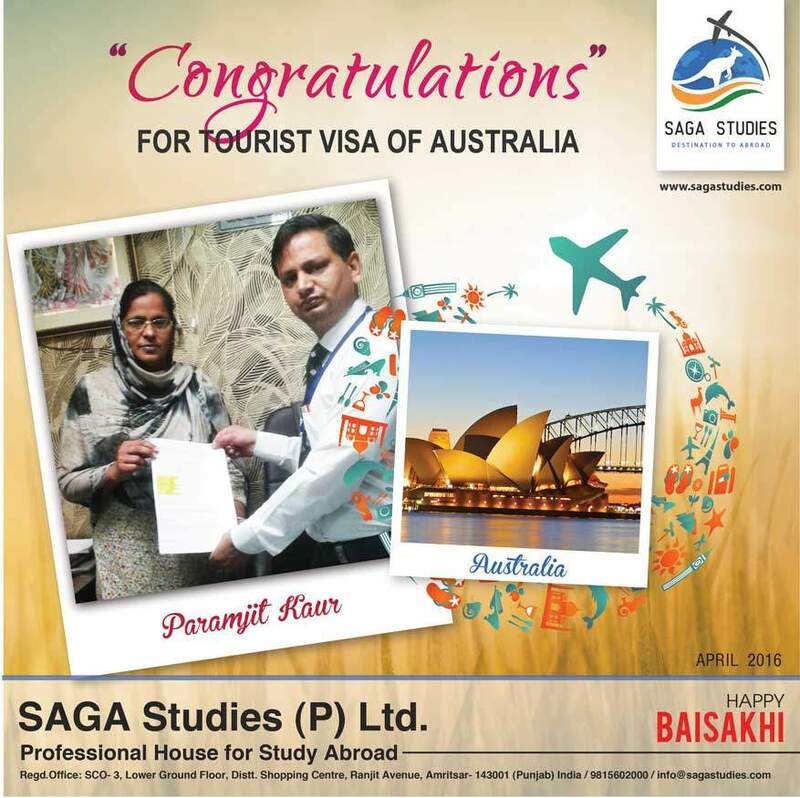 She got tourist visa of Australia. SAGA Studies wishes you success and Prosperous life ahead. Congratulations Harjeet Kaur. She got tourist visa of Australia. SAGA Studies wishes you success and Prosperous life ahead. Congratulations Jagjeet Singh, Kulwinder Kaur & Sartaj Singh. 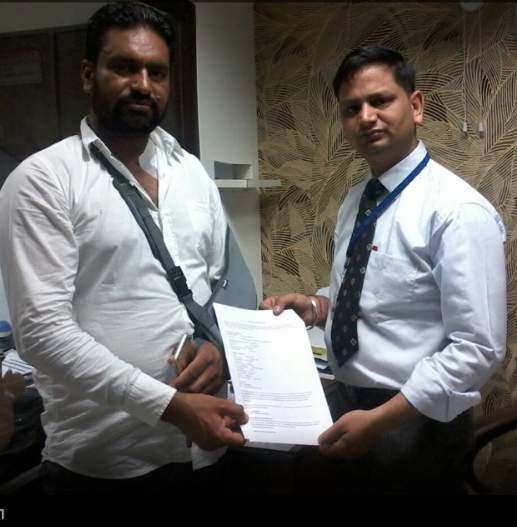 They got tourist visa of Australia. SAGA Studies wishing you success and Prosperous life ahead. 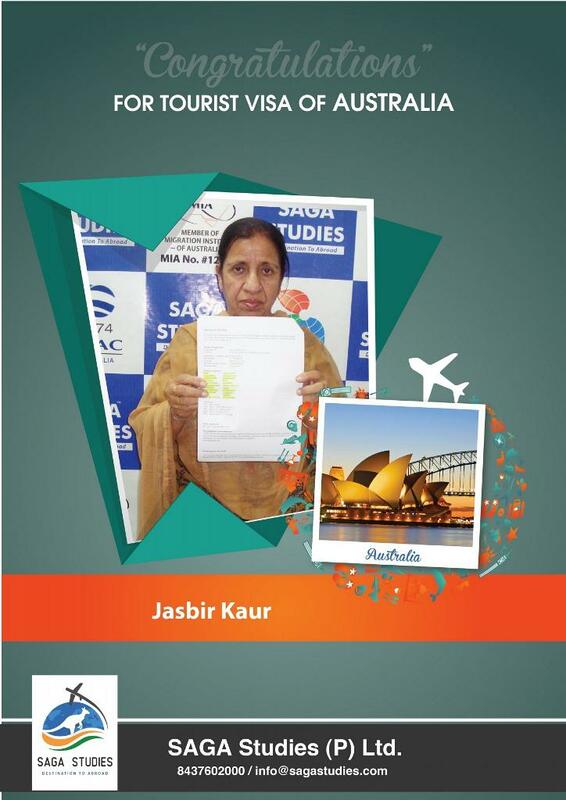 Congratulations Jasbir Kaur. She got tourist visa of Canada. SAGA Studies wishes you success and Prosperous life ahead. Manjit Kaur & Beant Kaur. Congratulations Manjit Kaur & Beant Kaur. They got tourist visa of Canada. SAGA Studies wishes you success and Prosperous life ahead. Congratulations Kulwant Kaur. She got tourist visa of Australia. SAGA Studies wishes you success and Prosperous life ahead. Congratulations Lakhwinder Kaur. She got tourist visa of Australia. SAGA Studies wishes you success and Prosperous life ahead. Congratulations Sukhbir Singh, Navdeep Kaur & Harpreet Singh. They got tourist visa of Australia. SAGA Studies wishes you success and Prosperous life ahead. 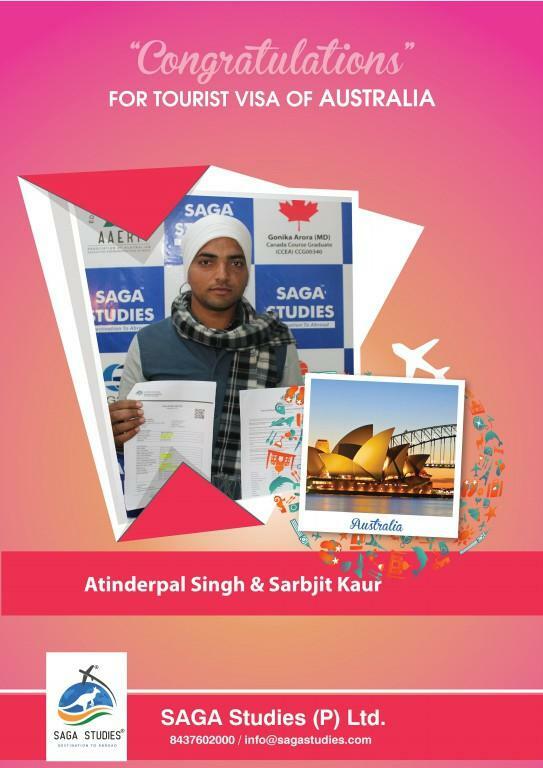 Congratulations Atinderpal Singh & Sarbjit Kaur. They got tourist visa of Australia. 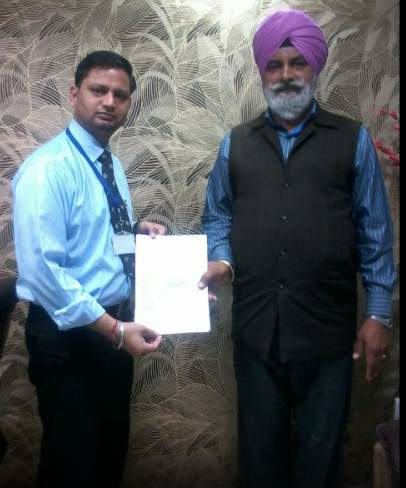 Congratulations Avtar Singh Khullar. 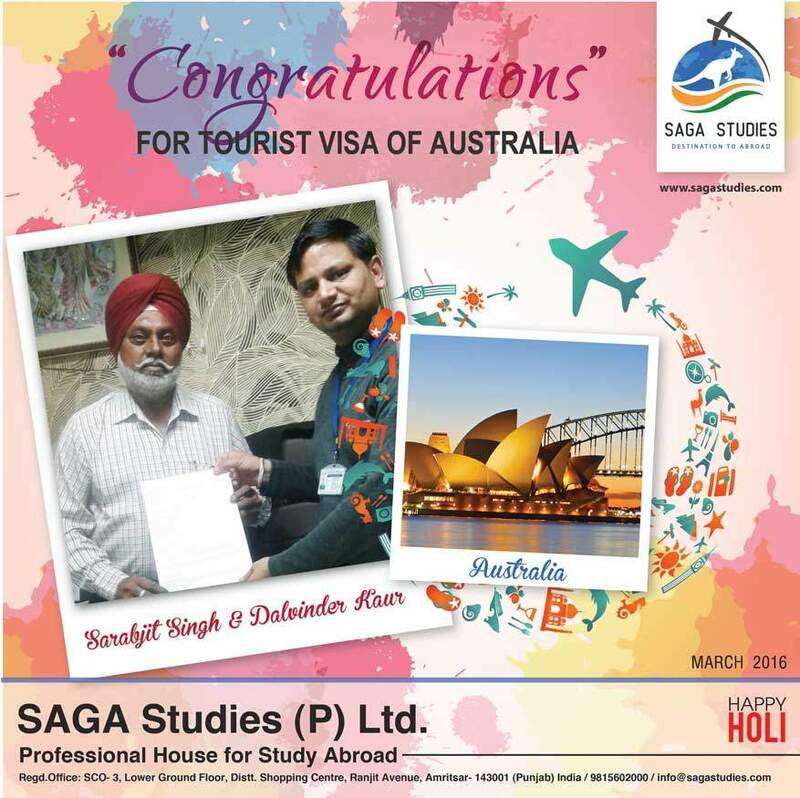 He got tourist visa of Australia. 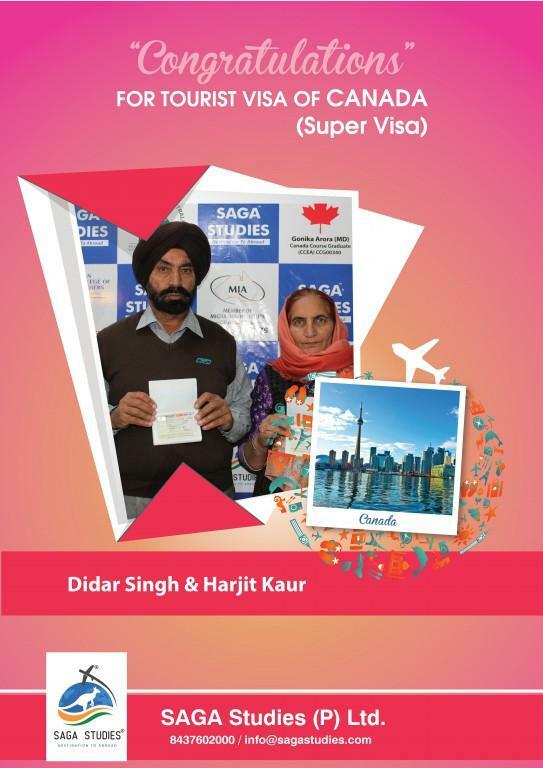 Congratulations Didar Singh & Harjit Kaur. They got tourist Super visa of Canada. Congratulations Baljit Kaur. 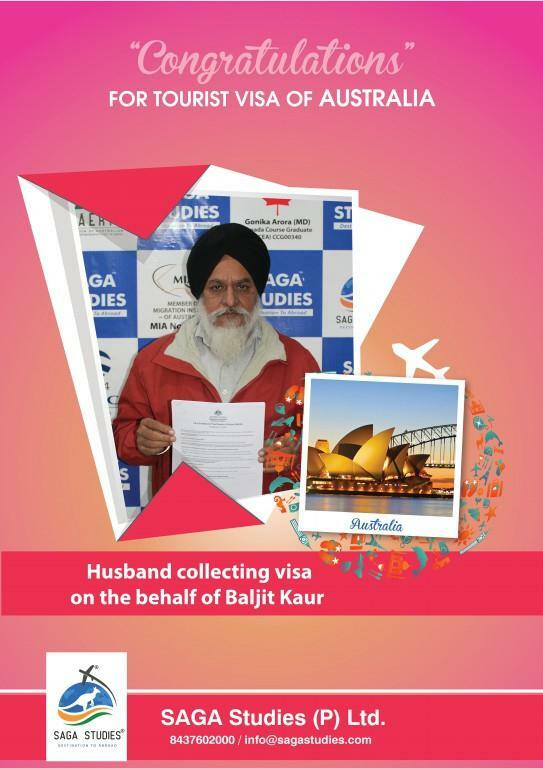 Her husband collecting tourist visa of Australia on the behalf of Baljit Kaur. 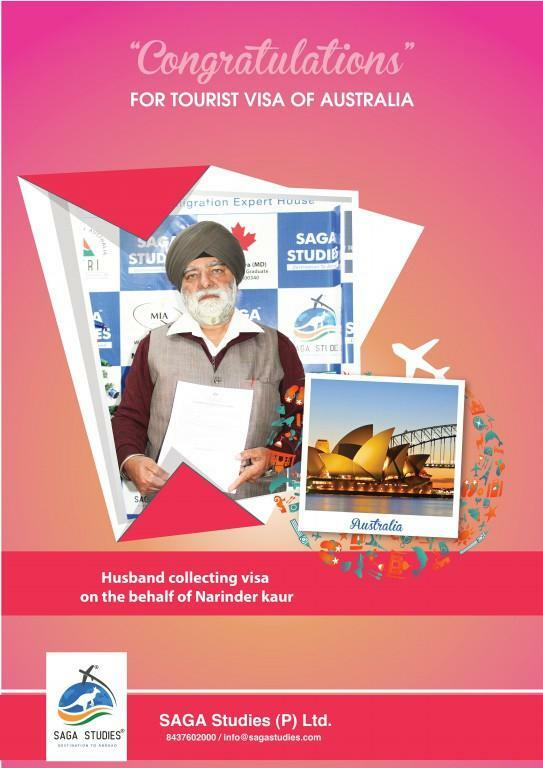 Congratulations Bhupinder Singh & Narinder Kaur. They got tourist visa of Austalia. Congratulations Charanjit Kaur & Prince Pal. 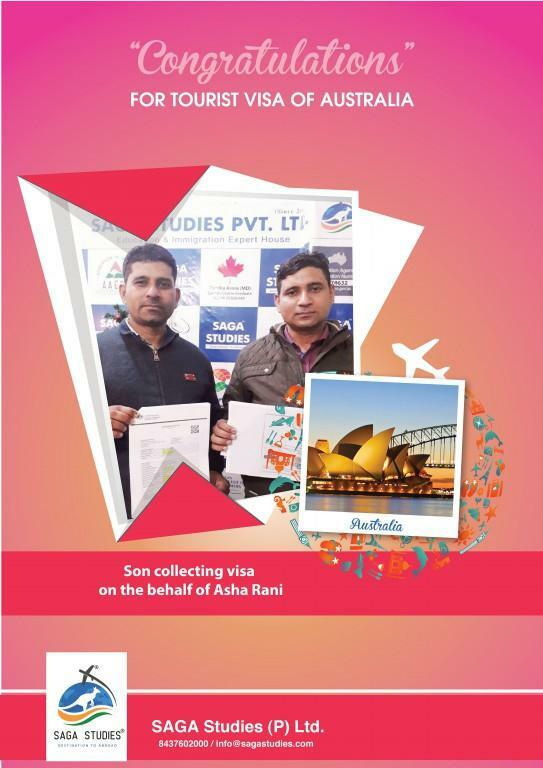 They got tourist visa of Austalia. 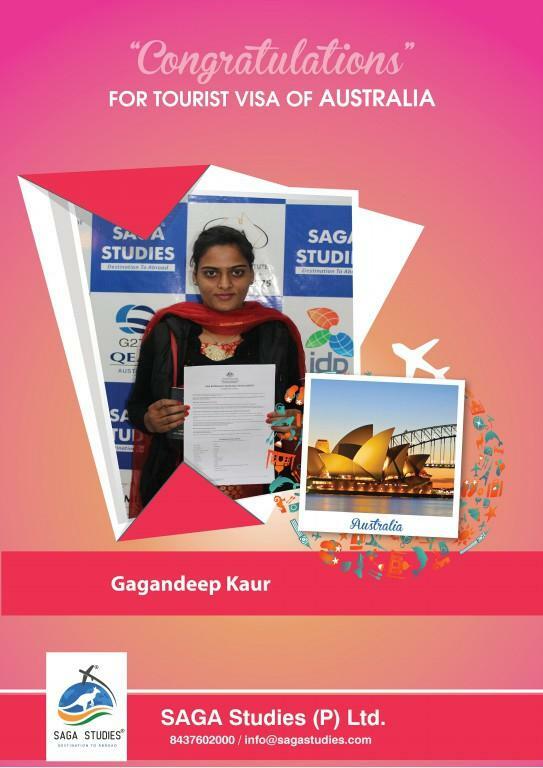 Congratulations Gagandeep Kaur. She got tourist visa of Australia. Congratulations Harbhajan Singh & Ginderpal Kaur. They got tourist visa of Australia. 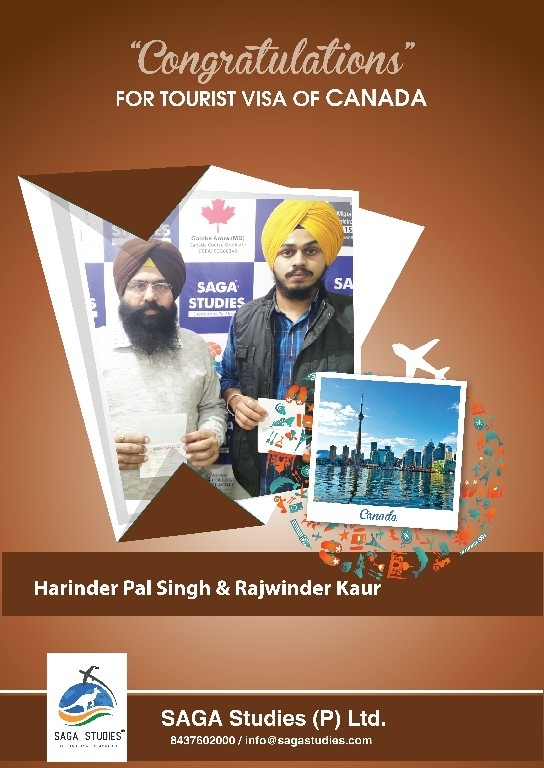 Congratulations Harinder Singh & Ravinder Kaur. They got tourist visa of Australia. 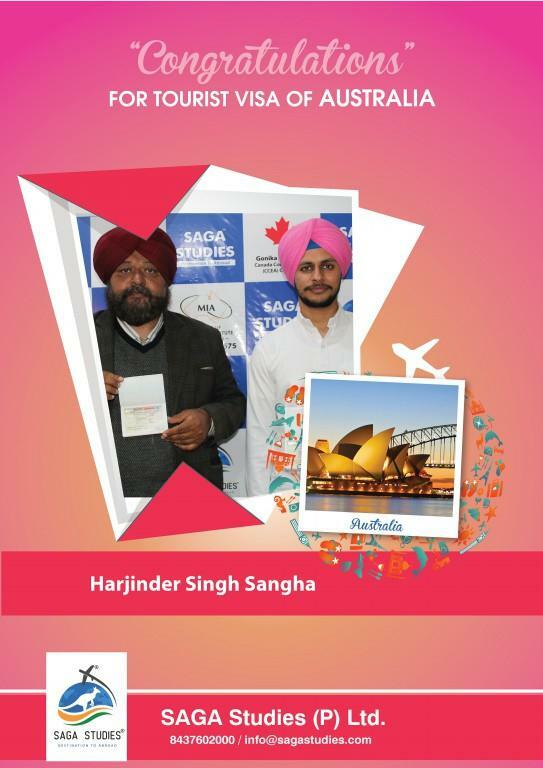 Congratulations Harjinder Singh Sangha. He got tourist visa of Canada. 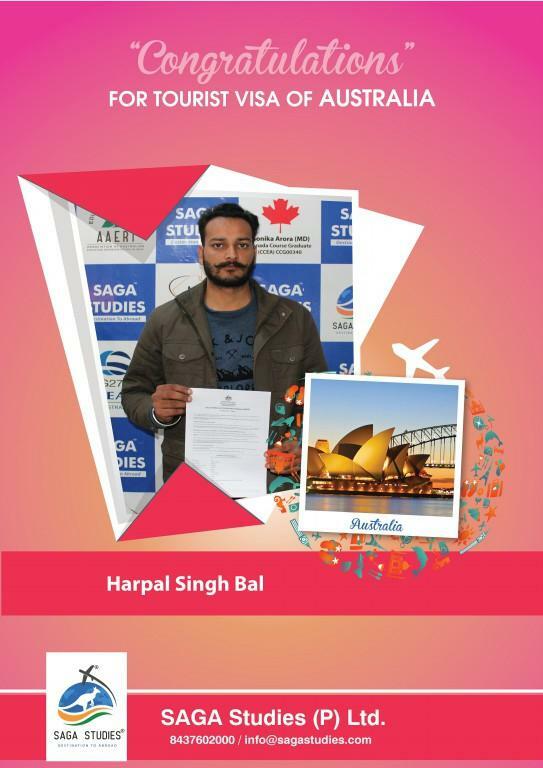 Congratulations Harpal Singh Bal. 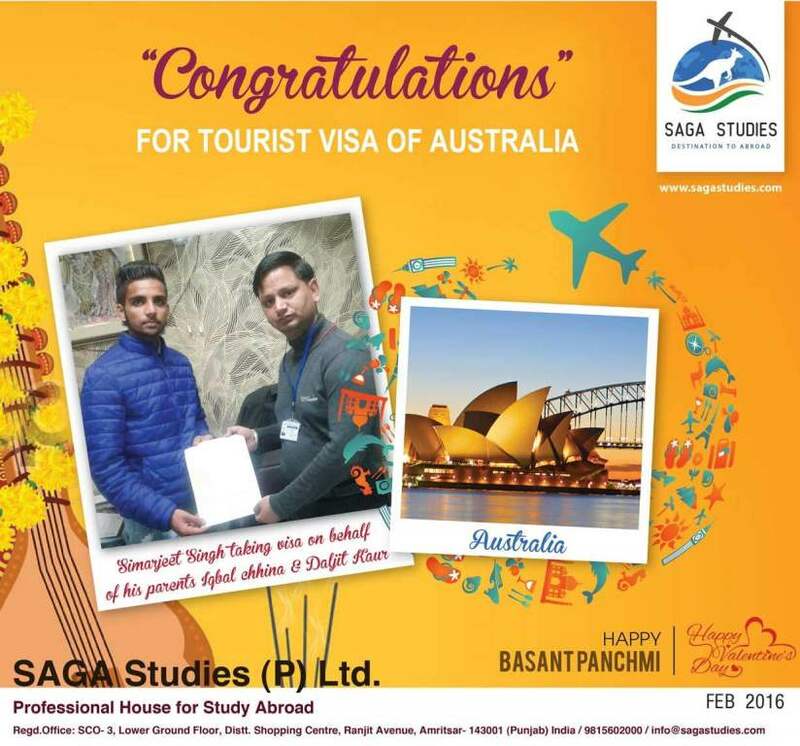 He got tourist visa of Australia. 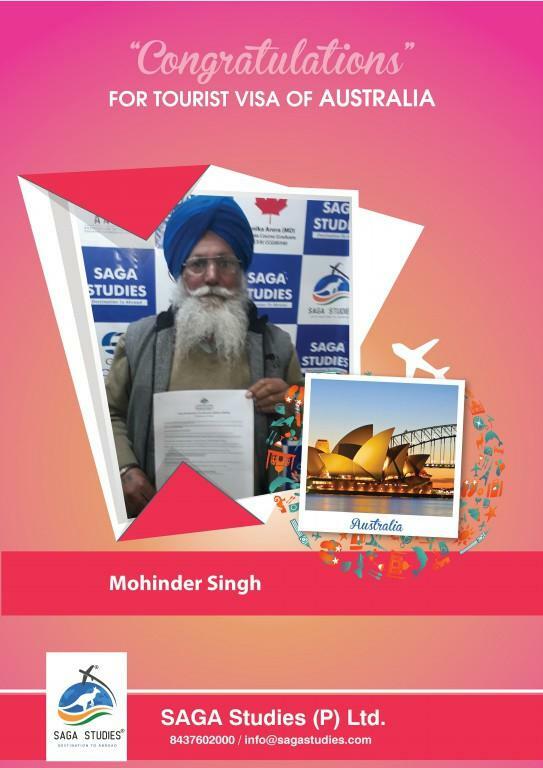 Congratulations Mohinder Singh. 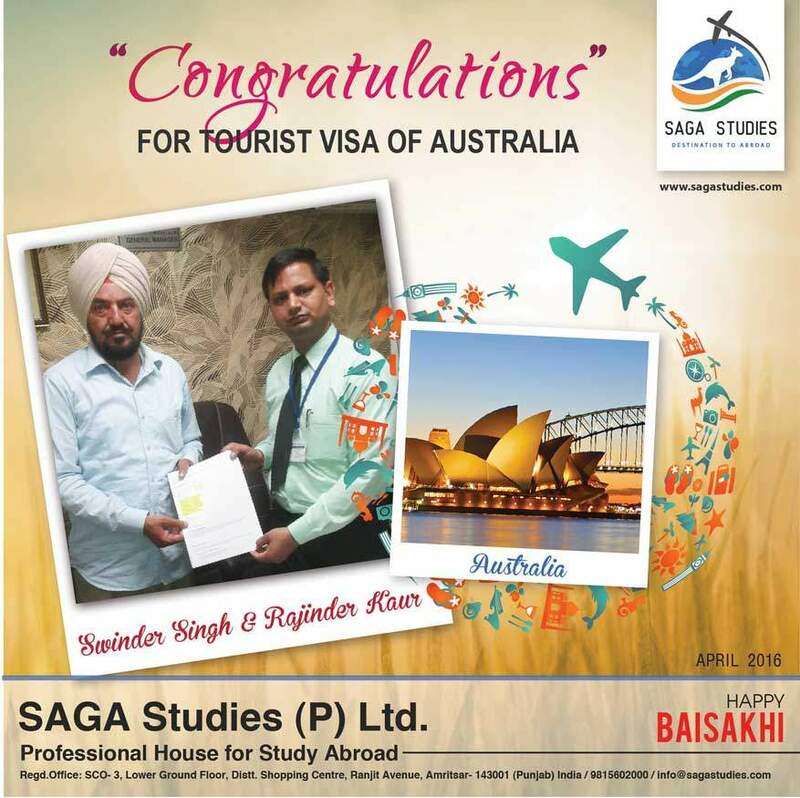 He got tourist visa of Australia. Congratulations Ramandeep Kaur. 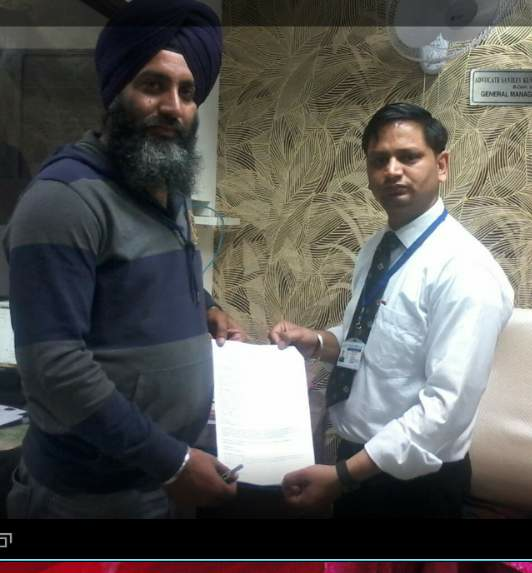 Her brother collecting tourist visa of Australia on the behalf of Ramandeep Kaur. Congratulations Simrat Pal Singh. 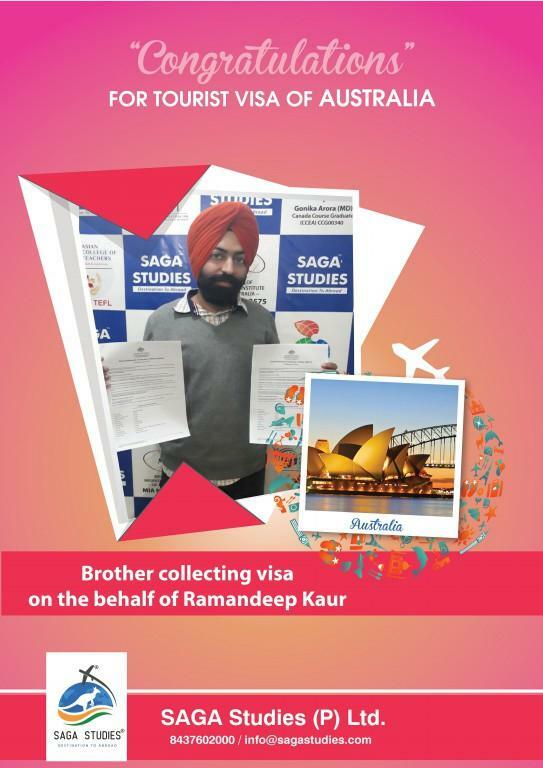 He got tourist visa of Australia. 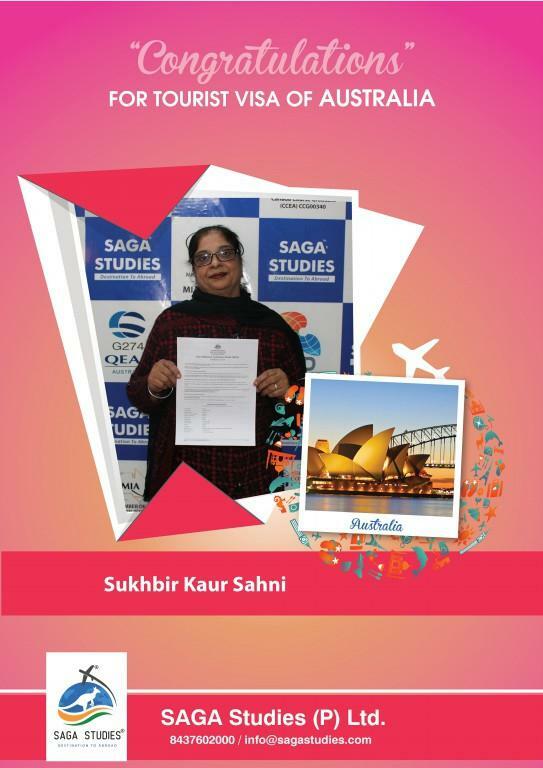 Congratulations Sukhbir Kaur Sahni. 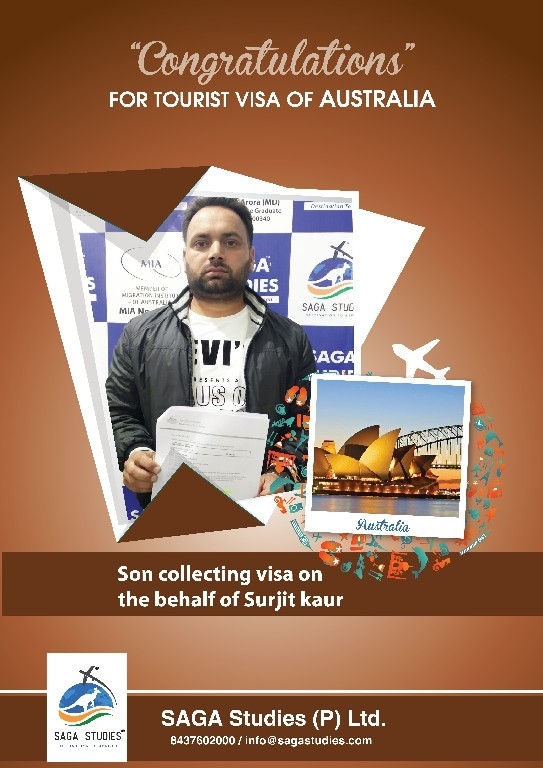 He got tourist visa of Australia. Congratulations to Gurjant Singh. 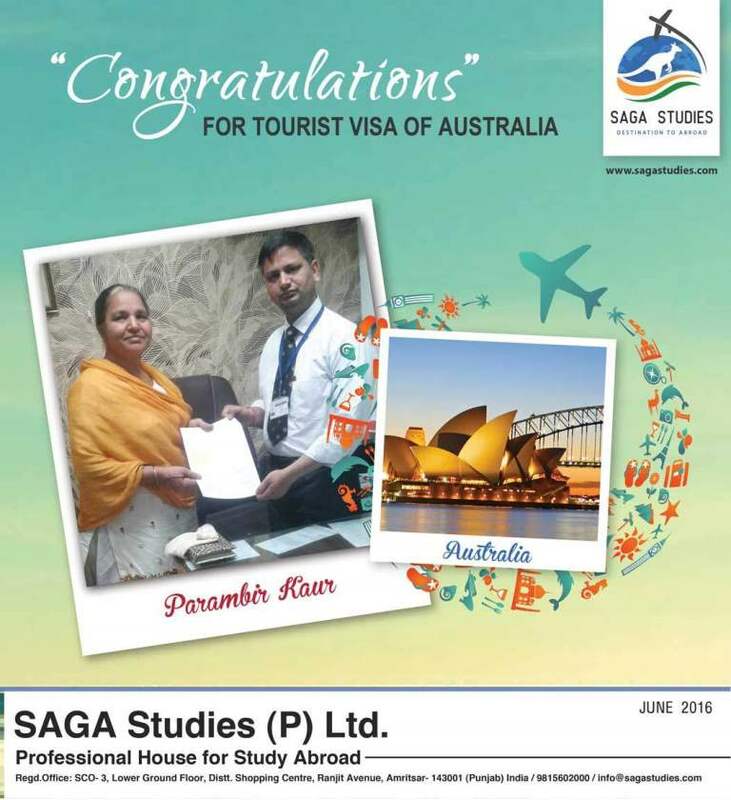 Got Tourist Visa For Australia. 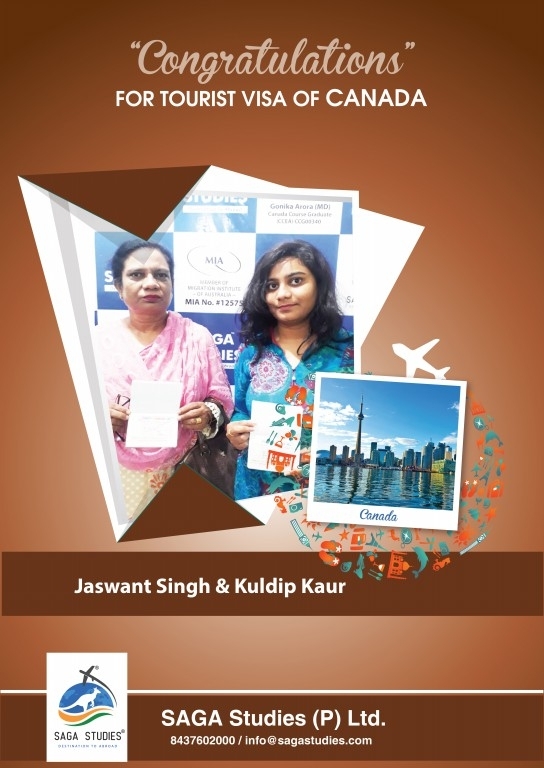 Congratulations to Jaswant singh & Kuldip Kaur. They Got Visa for Canada. 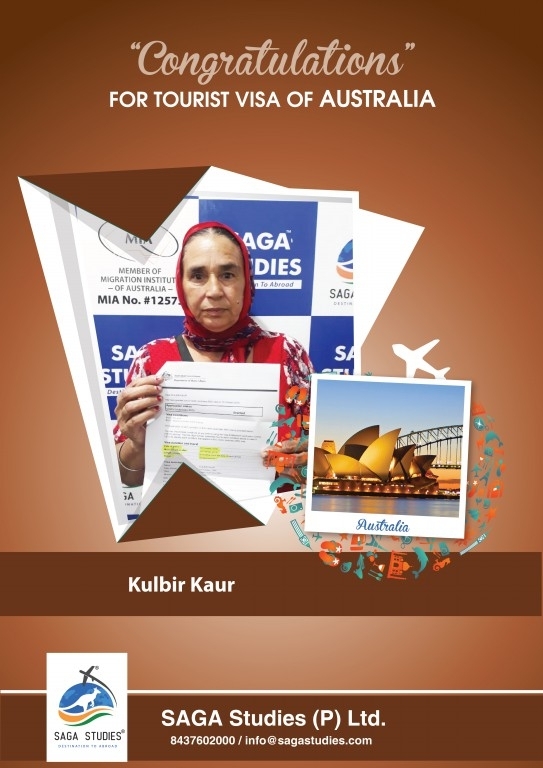 Congratulations to Kulbir Kaur. 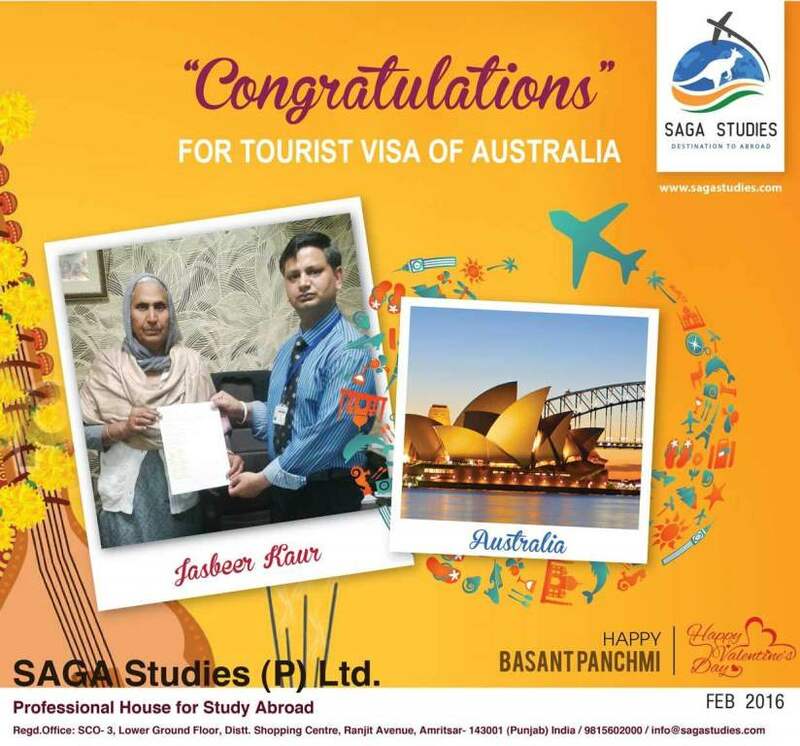 She Got Visa for Australia. 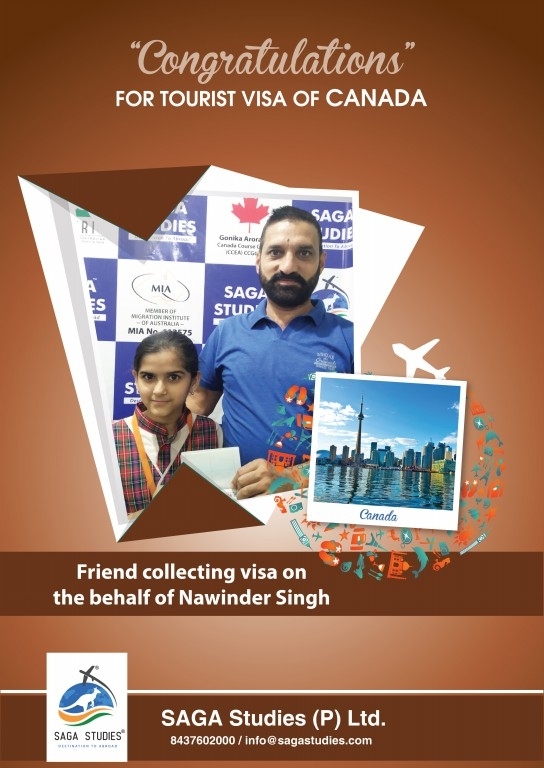 Congratulations to Nawinder Singh. They Got Visa for Canada. 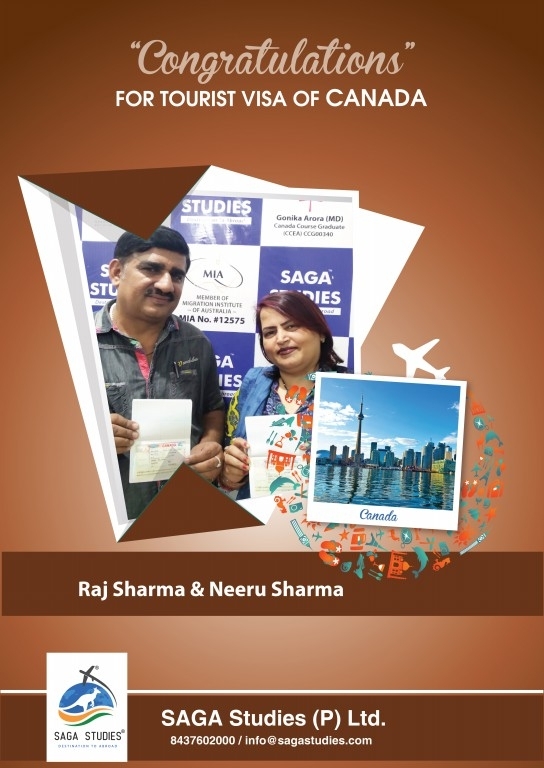 Congratulations to Raj Sharma & Neeru Sharma. They Got Visa for Canada. 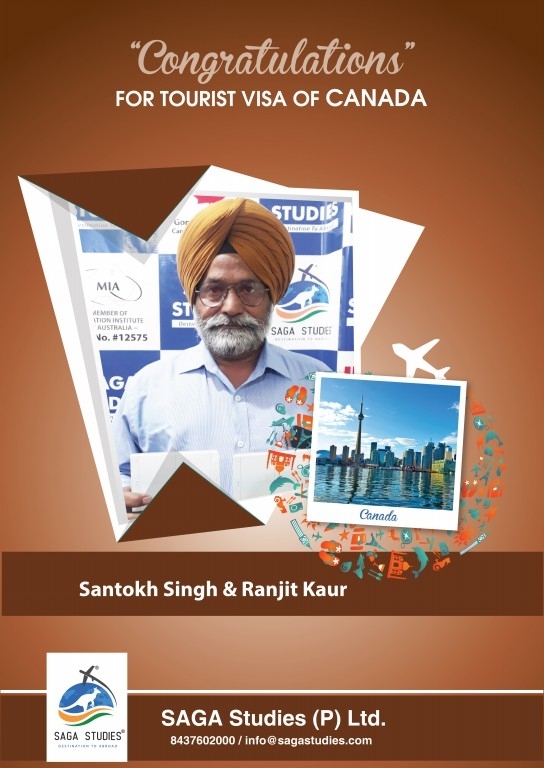 Congratulations to Santokh Singh & Ranjit Kaur. They Got Visa for Canada. 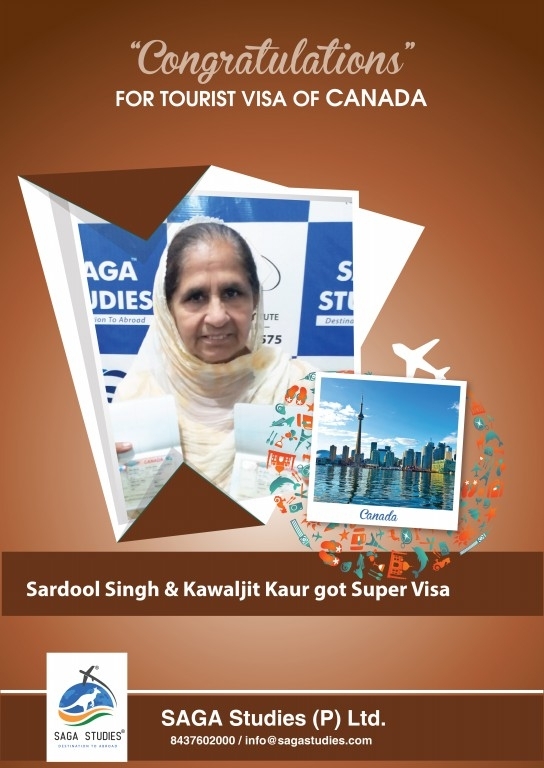 Congratulations to Sardool Singh & Kawaljit Kaur. They Got Visa for Canada. Congratulations Avtar Singh. 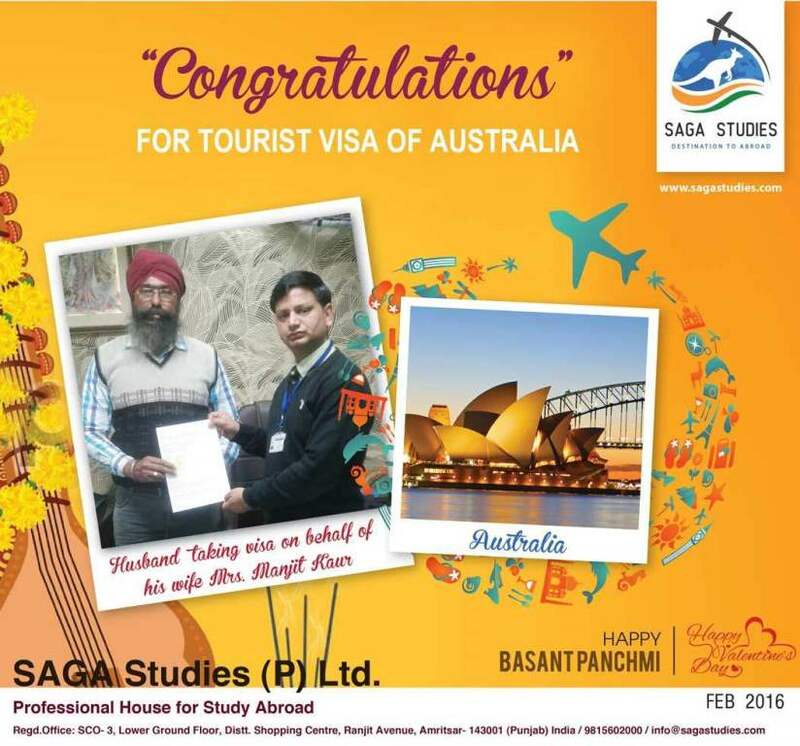 He got tourist visa of Australia. SAGA Studies wishing you success and Prosperous life ahead. 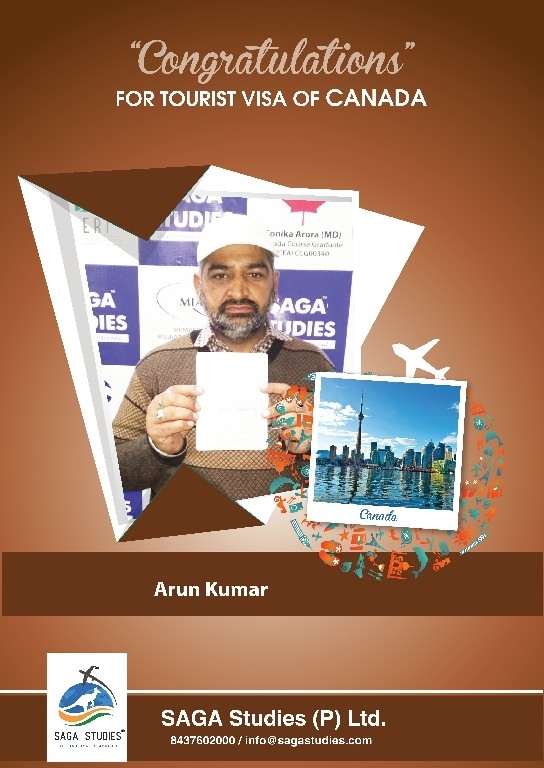 Congratulations Arun Kumar. He got tourist visa of Canada. SAGA Studies wishing you success and Prosperous life ahead. Congratulations Gurpal Singh. 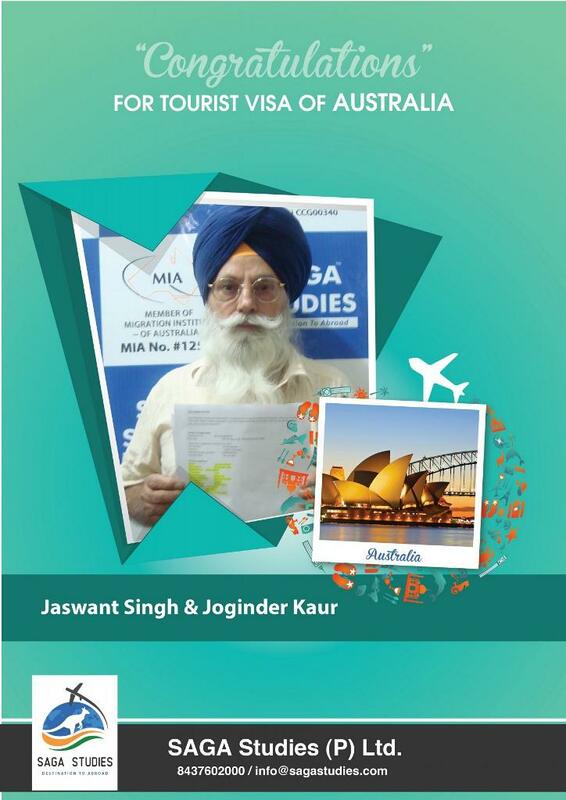 He got tourist visa of Australia. SAGA Studies wishing you success and Prosperous life ahead. 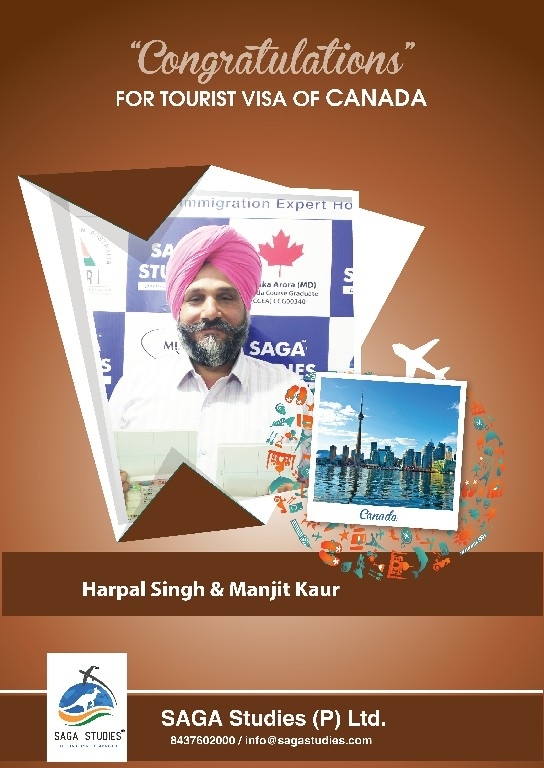 Congratulations Harpal Singh & Manjit Kaur. They got tourist visa of canada. SAGA Studies wishing you success and Prosperous life ahead. Congratulations Kulbir Singh, Kulbir Kaur, Sajanpreet Singh.They got tourist visa of Australia. SAGA Studies wishing you success and Prosperous life ahead. — at SAGA Studies (P) Ltd.
Congratulations Kuldeep Singh Chhina & Sukhdeep Kaur Chhina. They got tourist visa of Canada. SAGA Studies wishing you success and Prosperous life ahead. — at SAGA Studies (P) Ltd.
Congratulations Kuldeep Singh & Sukhjinder Kaur. They got tourist visa of Canada. SAGA Studies wishing you success and Prosperous life ahead. 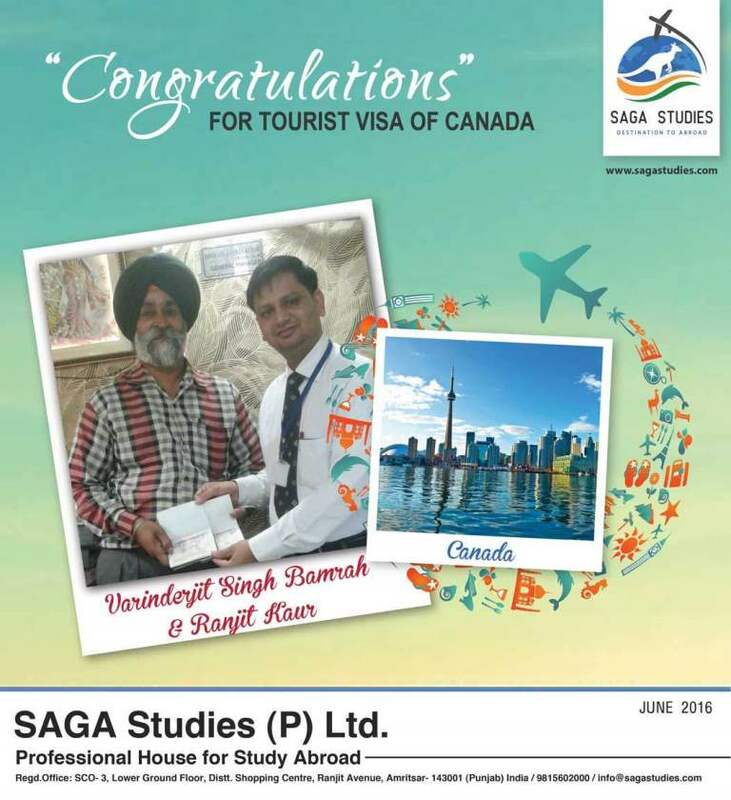 — at SAGA Studies (P) Ltd.
Congratulations Lakhwinder Singh, Ajit Singh & Simran Singh. They got tourist visa of Canada. SAGA Studies wishing you success and Prosperous life ahead. 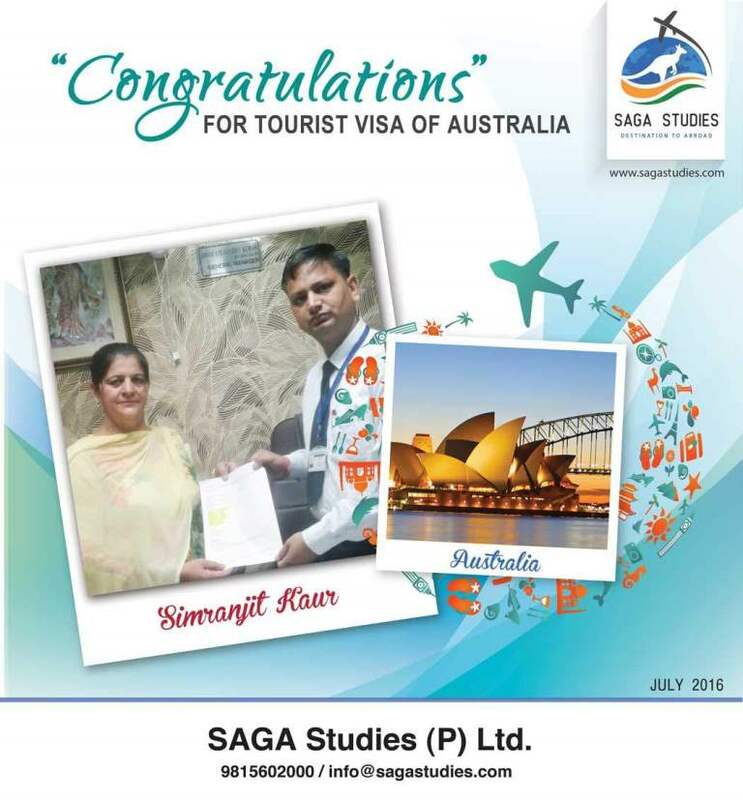 — at SAGA Studies (P) Ltd.
Congratulations Ranjit Kaur. She got tourist visa of Canada. SAGA Studies wishing you success and Prosperous life ahead. 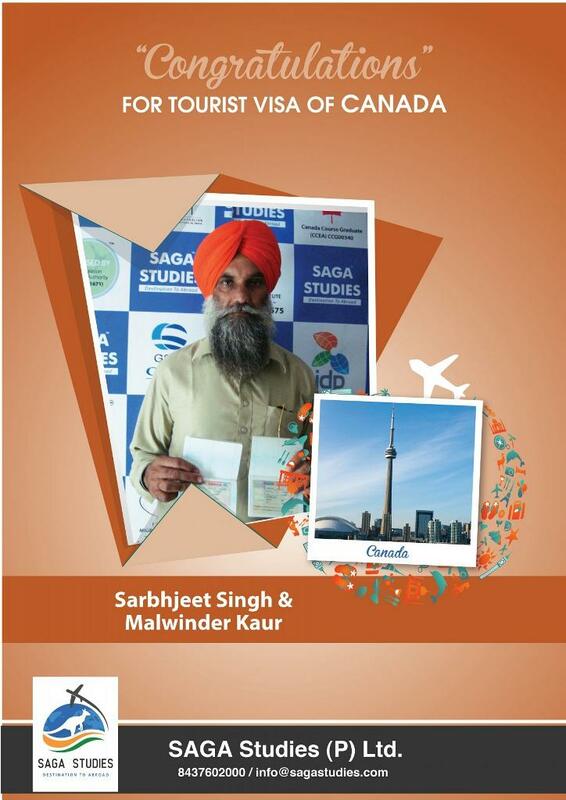 — at SAGA Studies (P) Ltd.
Congratulations Ravinderpal Singh & Sarbjit Kaur. They got tourist visa of Australia. SAGA Studies wishing you success and Prosperous life ahead. Congratulations Satwant Kaur. She got tourist visa of Australia. SAGA Studies wishing you success and Prosperous life ahead. 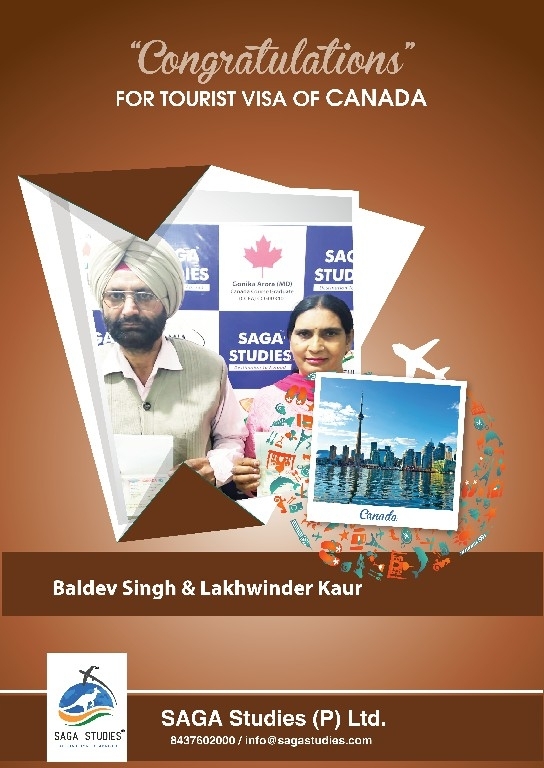 Congratulations Baldev Singh & Lakhwinder Kaur. 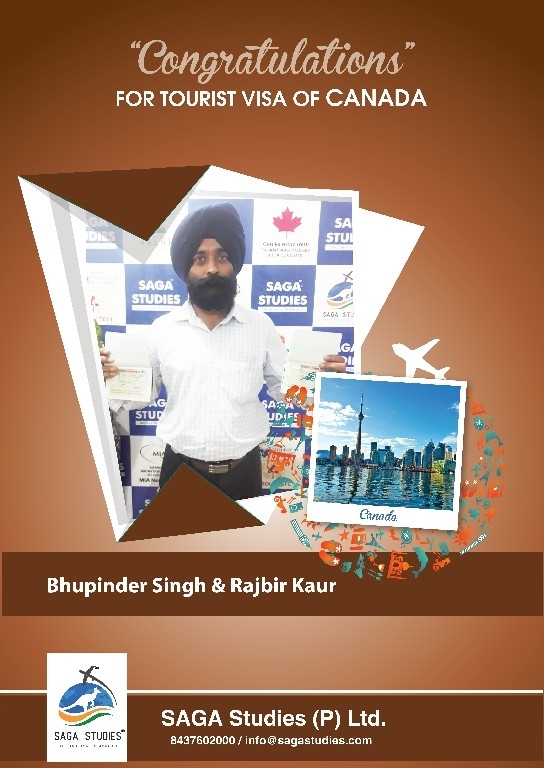 They got tourist visa of Canada. SAGA Studies wishing you success and Prosperous life ahead. 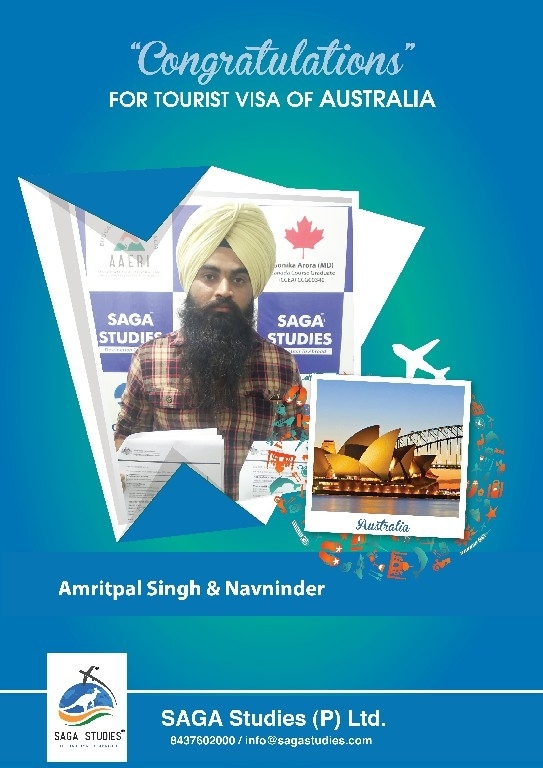 Amarjit Singh. He got tourist visa of Australia. SAGA Studies wishing you success and Prosperous life ahead. Congratulations Baljinder Kaur. She got tourist visa of Canada. SAGA Studies wishing you success and Prosperous life ahead. 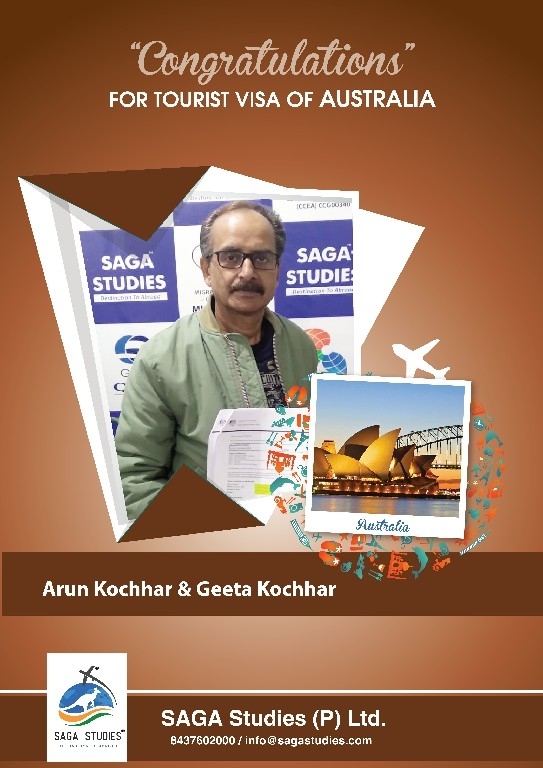 — at SAGA Studies (P) Ltd.
Congratulations Arun Kochhar and Geeta Kochhar. They got tourist visa of Australia. SAGA Studies wishing you success and Prosperous life ahead. — at SAGA Studies (P) Ltd.
Congratulations Bishan Kumar. 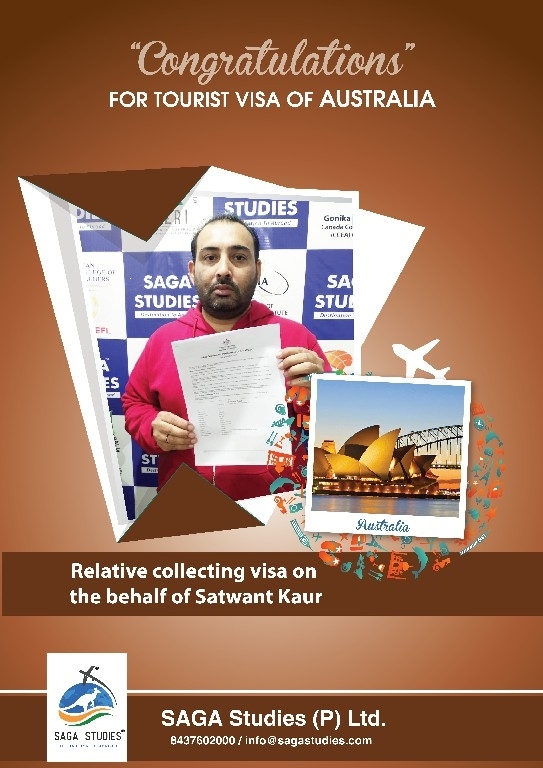 He got tourist visa of Australia. SAGA Studies wishing you success and Prosperous life ahead. 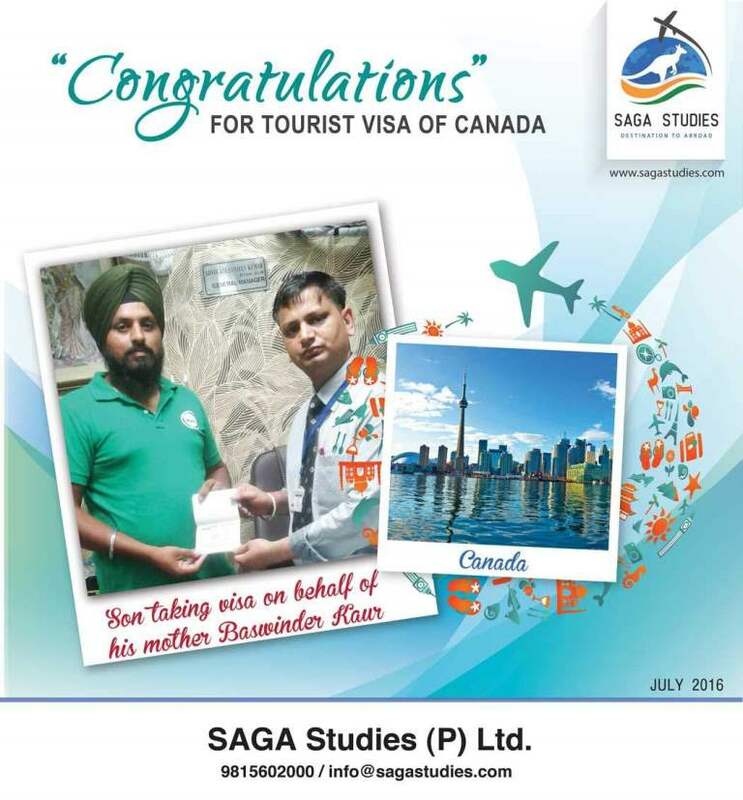 — at SAGA Studies (P) Ltd.
Congratulations Charan Singh. 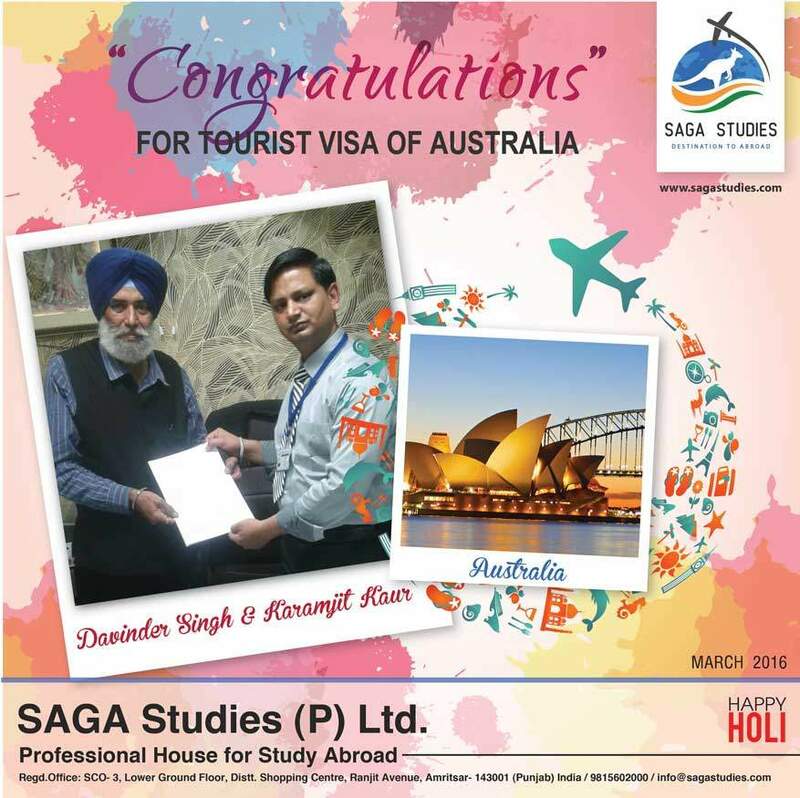 He got tourist visa of Australia. SAGA Studies wishing you success and Prosperous life ahead. 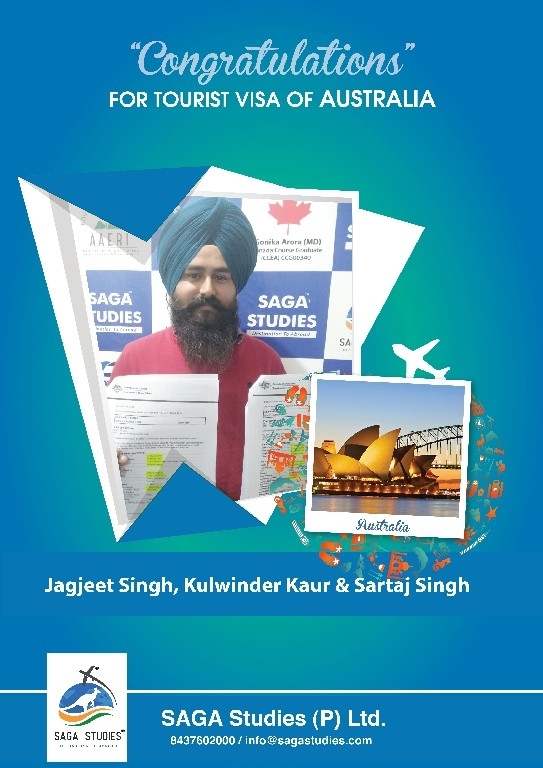 — at SAGA Studies (P) Ltd.
Gurdip Singh, Manjit Kaur and Mandeep Kaur. 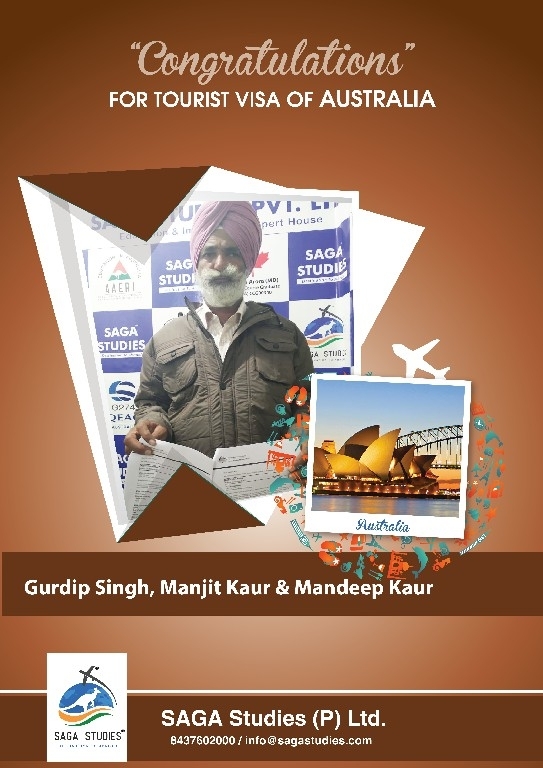 Congratulations Gurdip Singh, Manjit Kaur and Mandeep Kaur. They got tourist visa of Australia. SAGA Studies wishing you success and Prosperous life ahead. 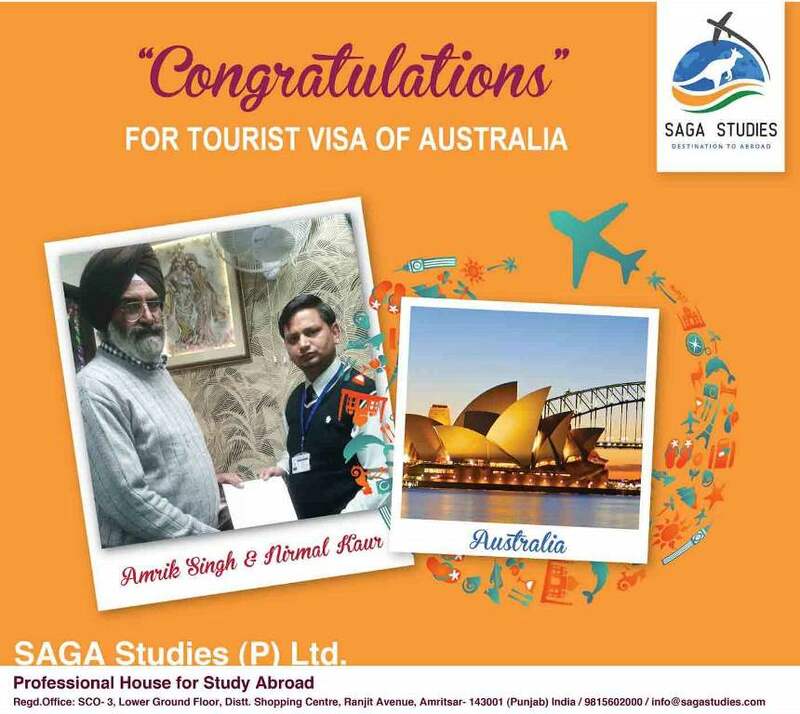 — at SAGA Studies (P) Ltd.
Congratulations Harbans Singh Gill. 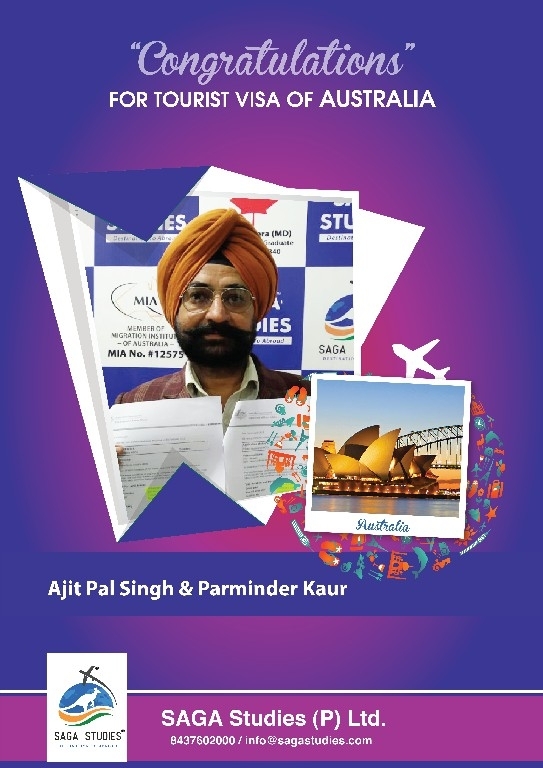 He got tourist visa of Australia. SAGA Studies wishing you success and Prosperous life ahead. 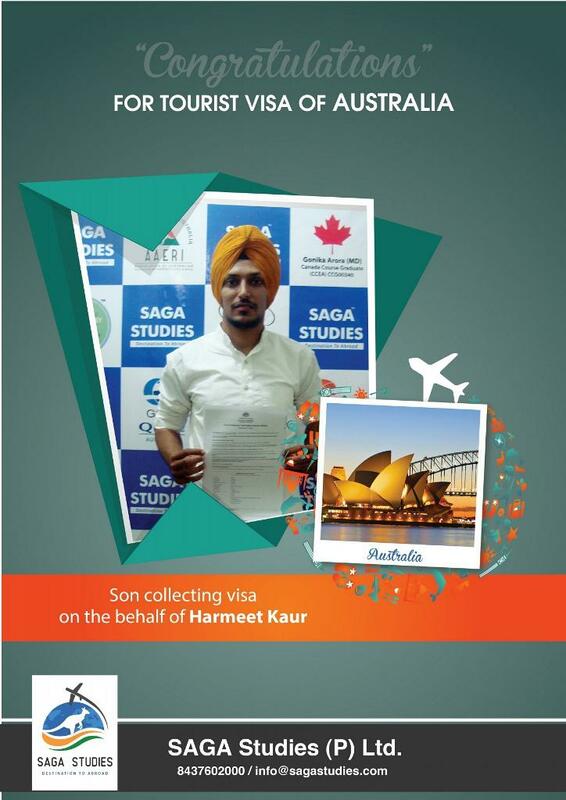 — at SAGA Studies (P) Ltd.
Congratulations Harmanjot Kaur. She got tourist visa of Australia. SAGA Studies wishing you success and Prosperous life ahead. 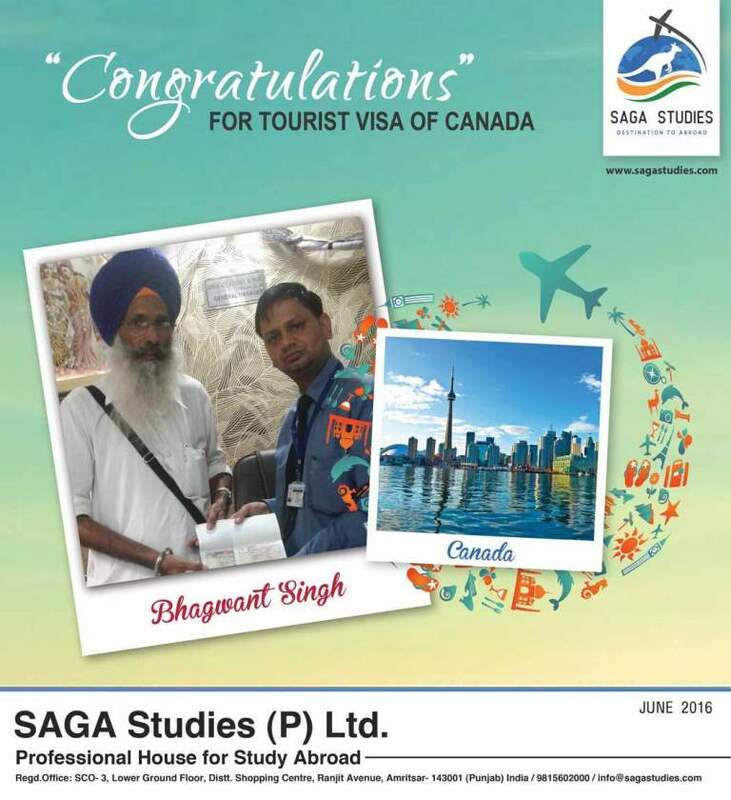 — at SAGA Studies (P) Ltd.
Congratulations Harmeet Singh & Navjeet Kaur. They got tourist visa of Australia. SAGA Studies wishing you success and Prosperous life ahead. 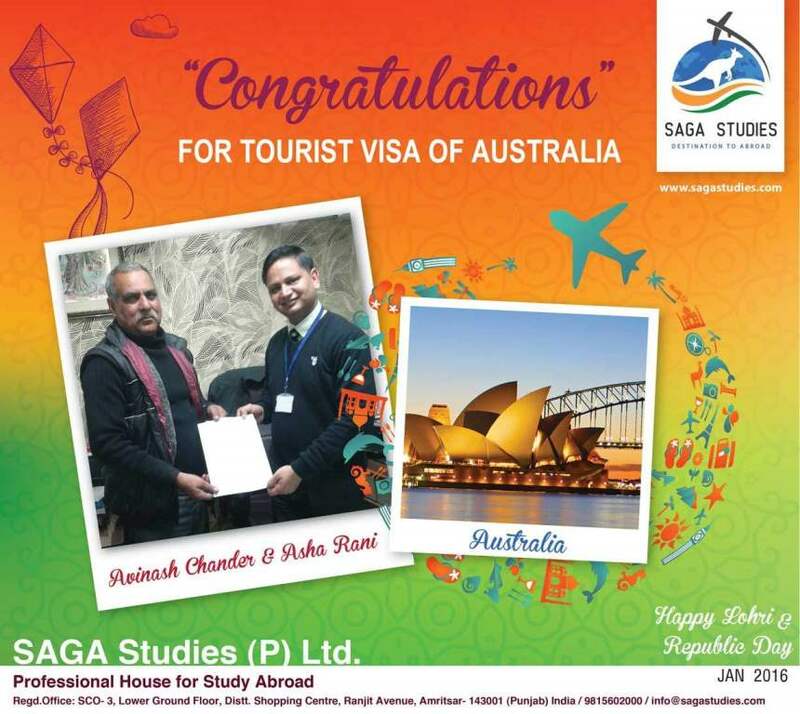 — at SAGA Studies (P) Ltd.
Congratulations Rajeshwar. She got tourist visa of Australia. SAGA Studies wishing you success and Prosperous life ahead. 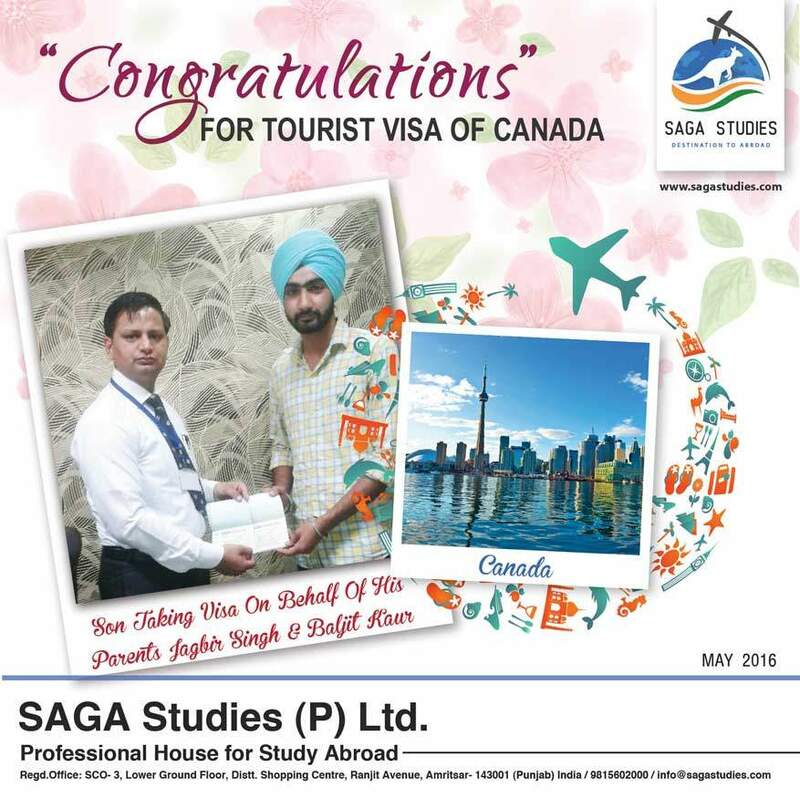 — at SAGA Studies (P) Ltd.
Congratulations Navdeep Singh Cheema. He got tourist visa of Canada. SAGA Studies wishing you success and Prosperous life ahead. 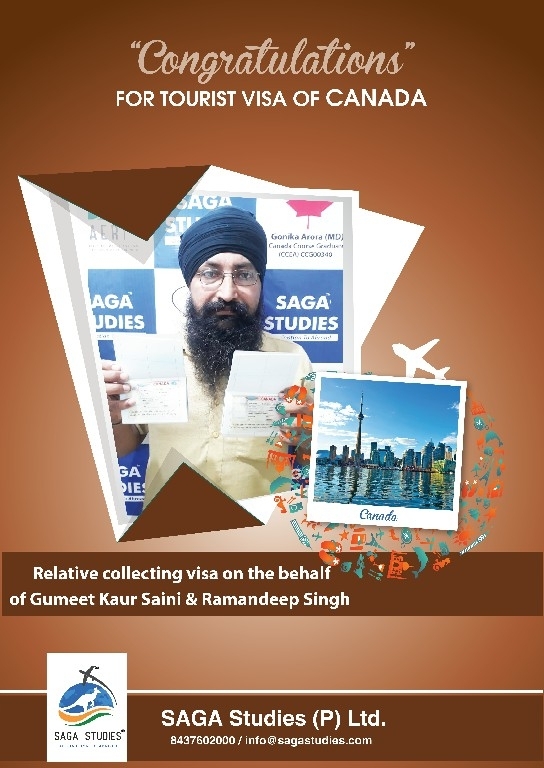 — at SAGA Studies (P) Ltd.
Raminder Singh and Palwinder Kaur. Congratulations Raminder Singh and Palwinder Kaur. They got tourist visa of Australia. SAGA Studies wishing you success and Prosperous life ahead. 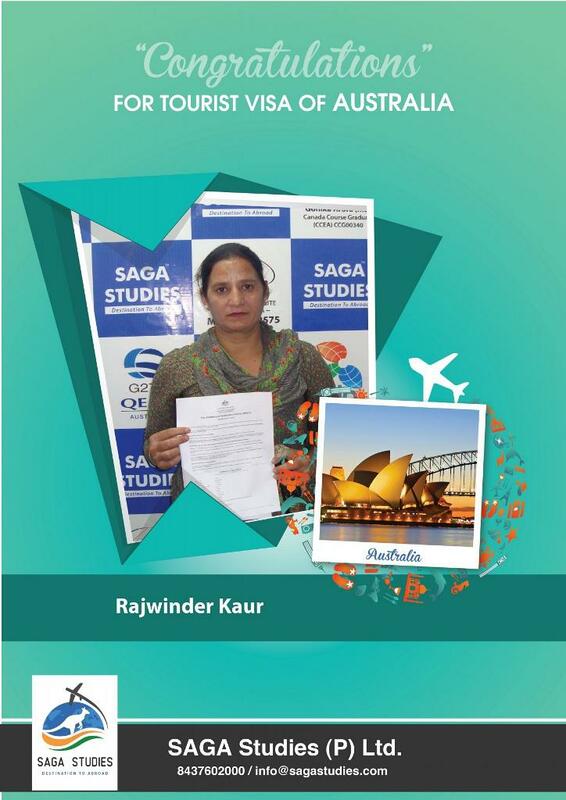 — at SAGA Studies (P) Ltd.
Congratulations Rajinder Kaur. She got tourist visa of Australia. 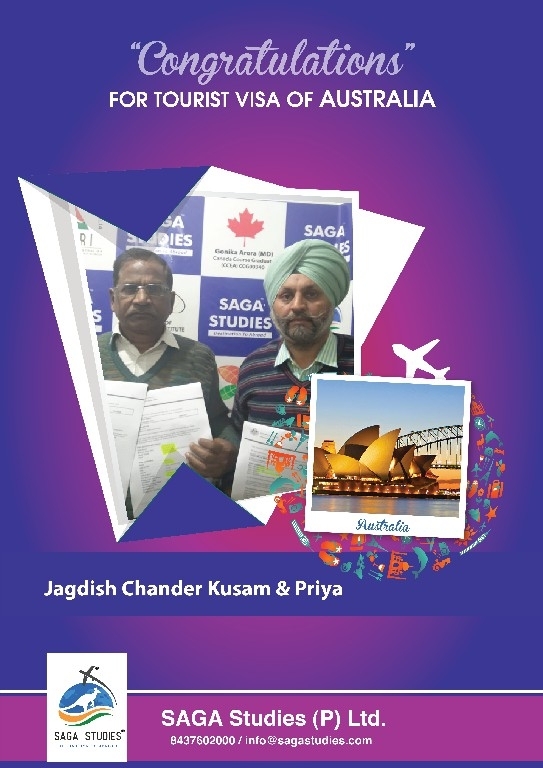 SAGA Studies wishing you success and Prosperous life ahead. 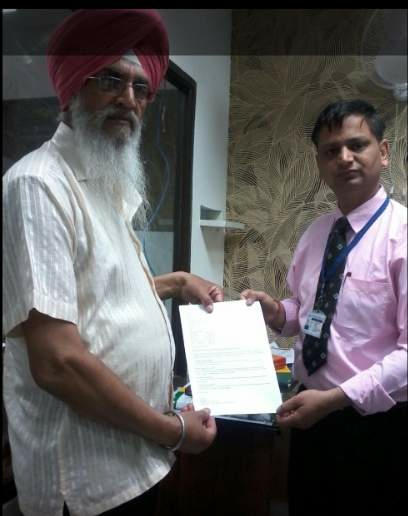 — at SAGA Studies (P) Ltd.
Sakattar Singh & Palwinderjit Kaur. 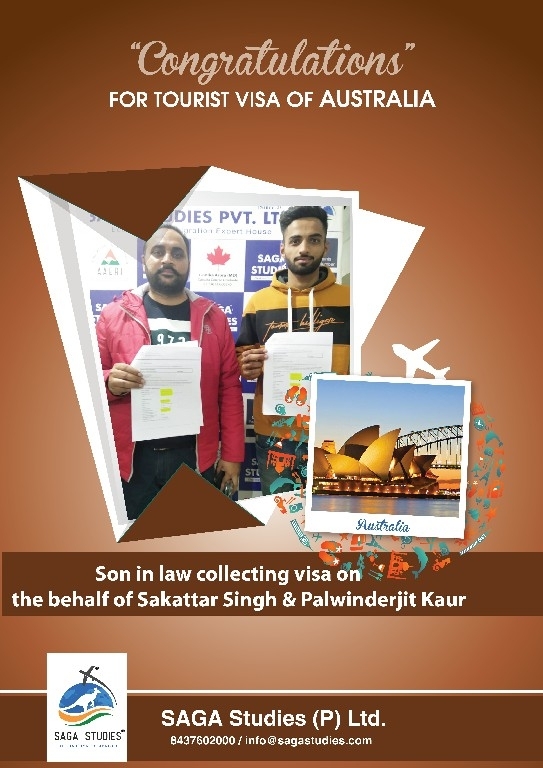 Congratulations Sakattar Singh & Palwinderjit Kaur. They got tourist visa of Australia. SAGA Studies wishing you success and Prosperous life ahead. 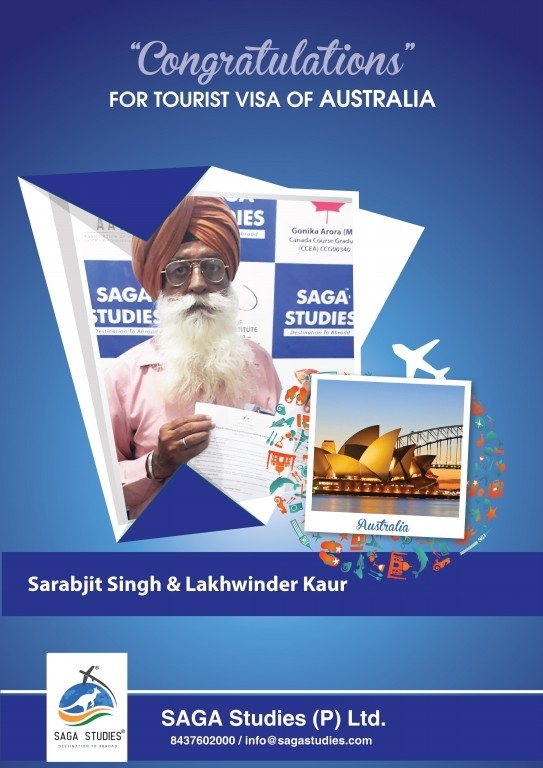 — at SAGA Studies (P) Ltd.
Sarbrinder Singh & Paramjit Kaur. 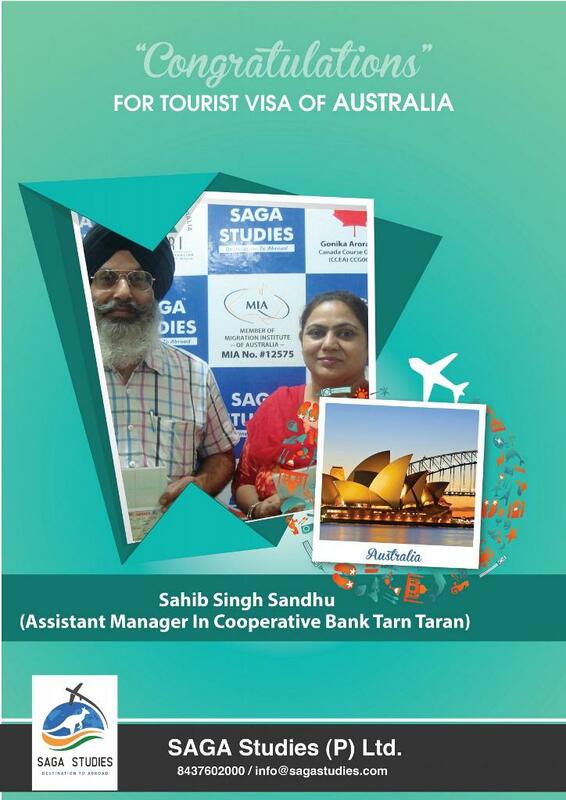 Congratulations Sarbrinder Singh & Paramjit Kaur. They got tourist visa of Australia. SAGA Studies wishing you success and Prosperous life ahead. 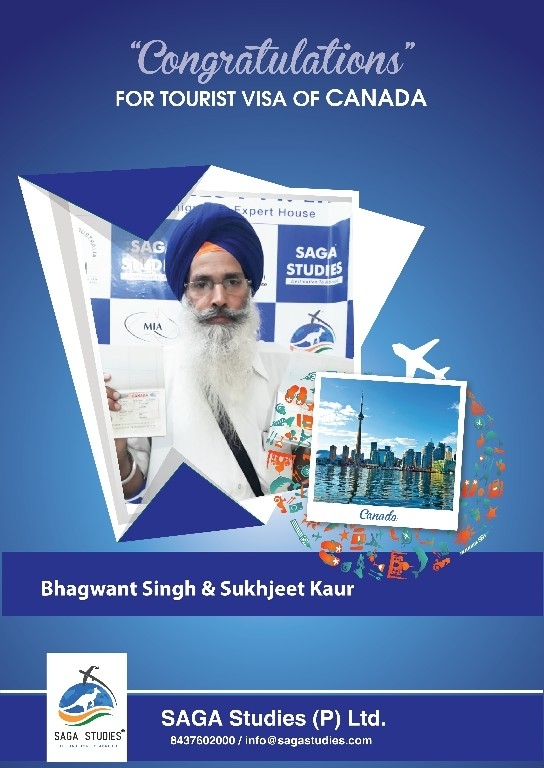 — at SAGA Studies (P) Ltd.
Congratulations Sukhwant Kaur. She got tourist visa of Australia. SAGA Studies wishing you success and Prosperous life ahead. 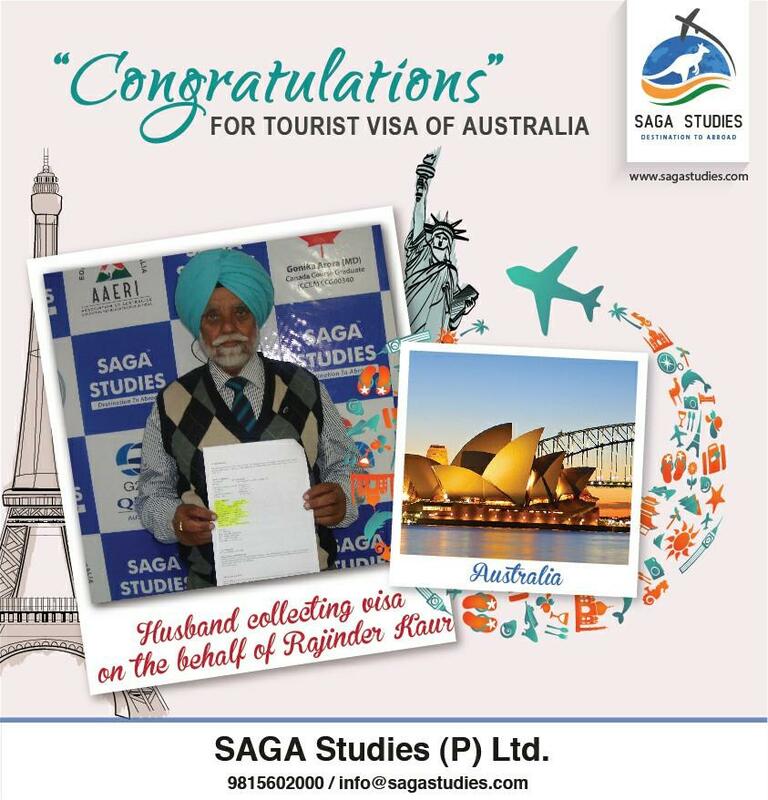 — at SAGA Studies (P) Ltd.
Congratulations Surjit kaur. She got tourist visa of Australia. 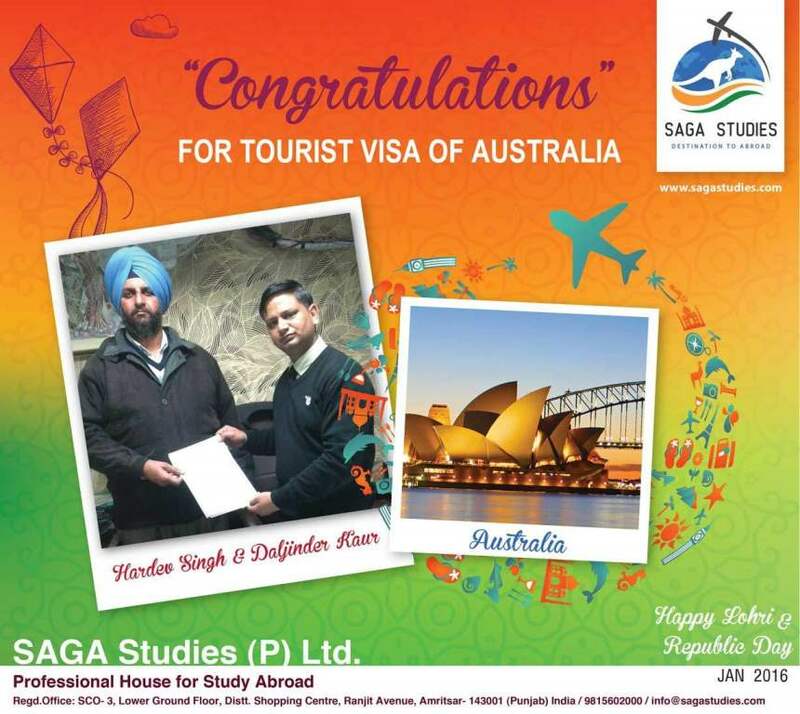 SAGA Studies wishing you success and Prosperous life ahead. 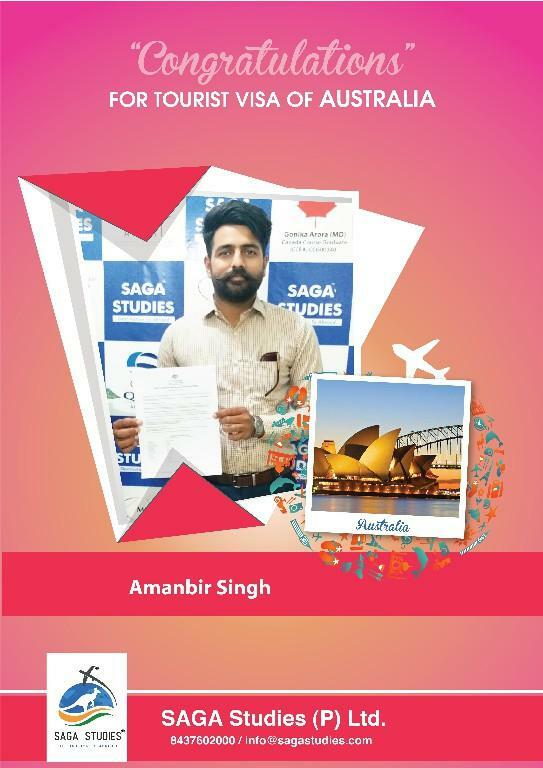 — at SAGA Studies (P) Ltd.
Congratulations Amanbir Singh. He got tourist visa of Australia. Congratulations Amarjeet Kaur. She got tourist visa of Australia. Congratulations Amir Singh & Savneet Kaur. They got tourist visa of Australia. 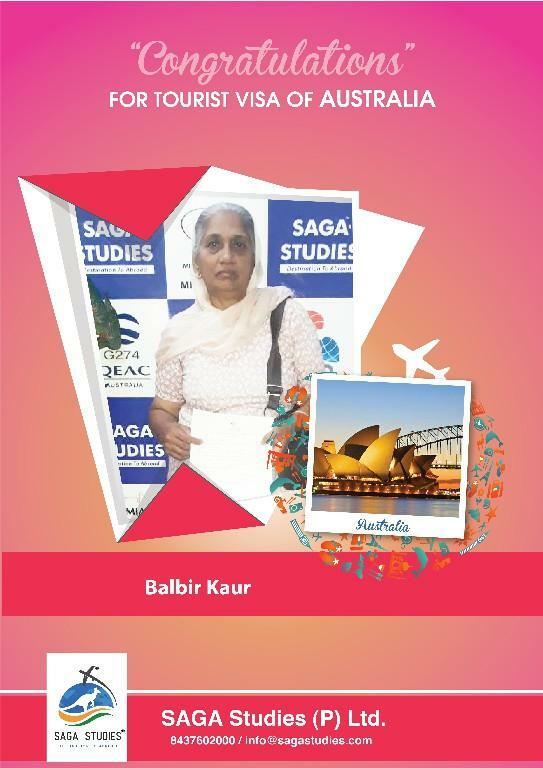 Congratulations Balbir Kaur. She got tourist visa of Australia. 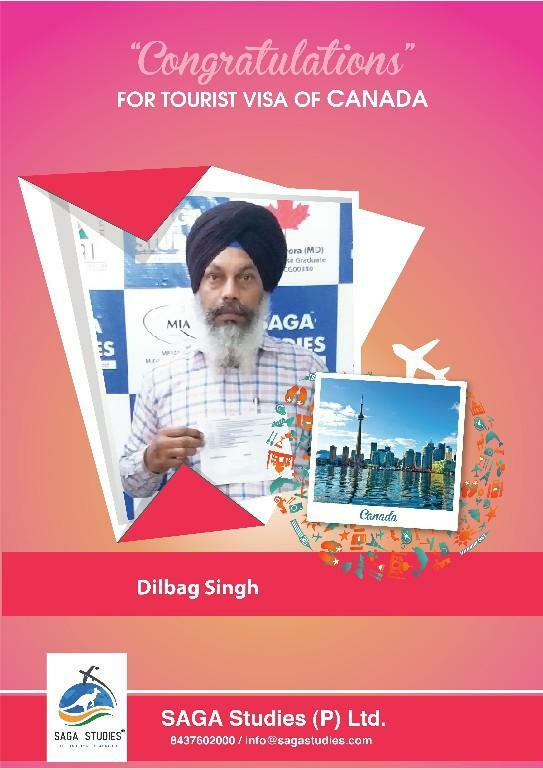 Congratulations Dilbagh Singh. He got tourist visa of Canada. Congratulations Geeta Bedi. She got tourist visa of Australia. Congratulations Harjinder Kaur. 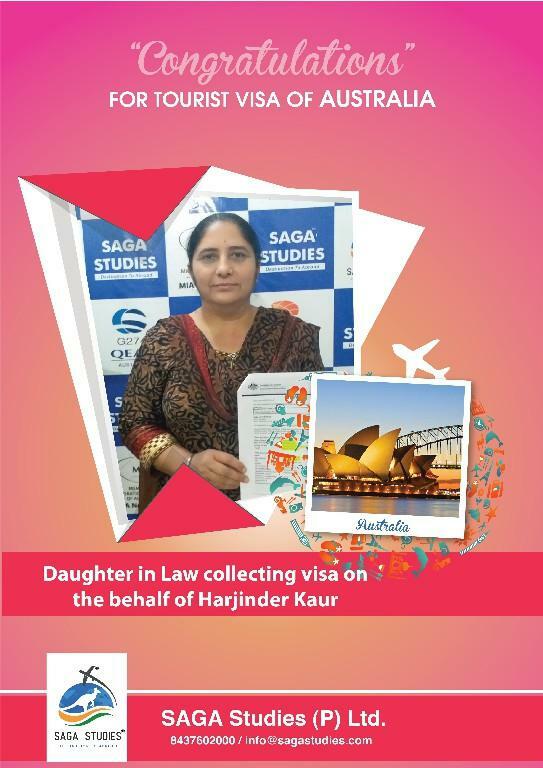 Her Daughter in law is collecting tourist visa of Australia on the behalf of Harjinder Kaur. 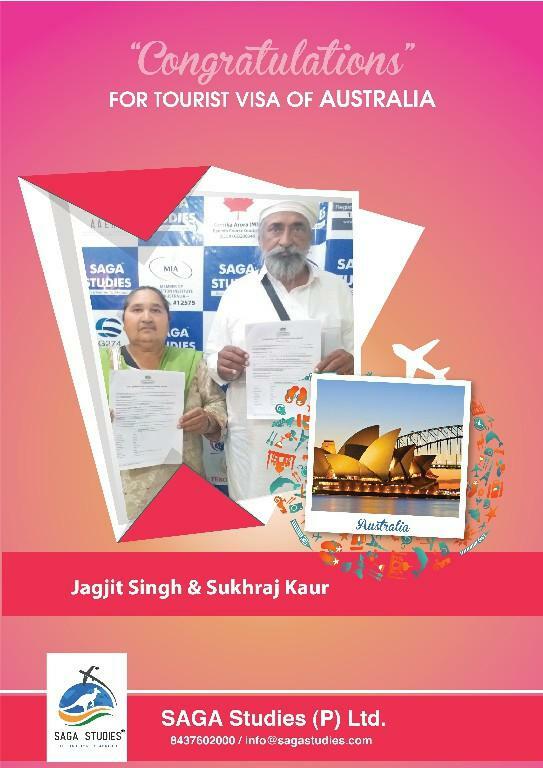 Congratulations Jagjit Singh & Sukhraj Kaur. They got tourist visa of Australia. 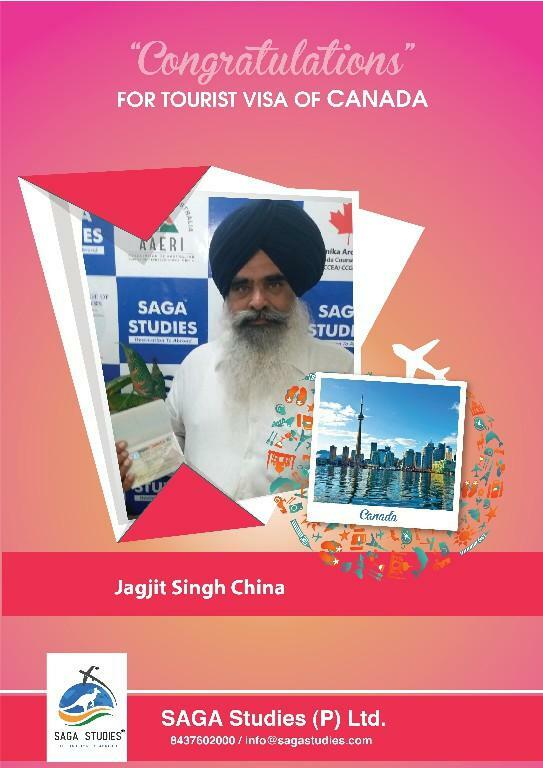 Congratulations Jagjit Singh China. He got tourist visa of Canada. 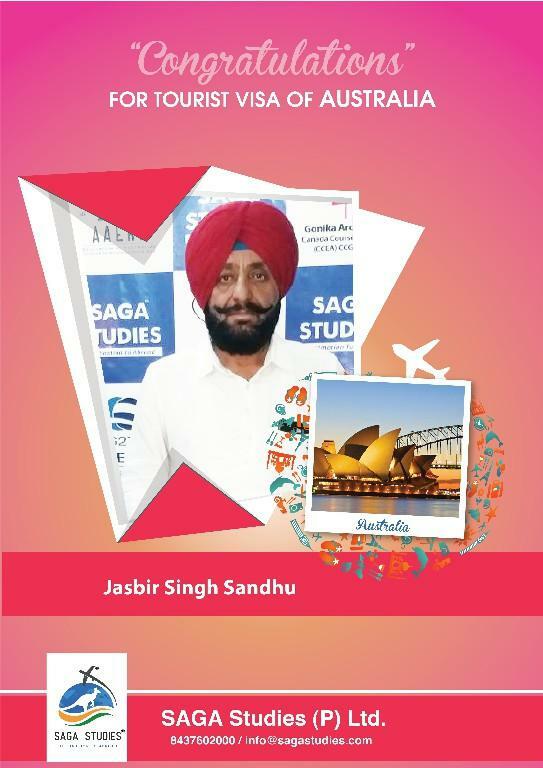 Congratulations Jasbir Singh Sandhu. 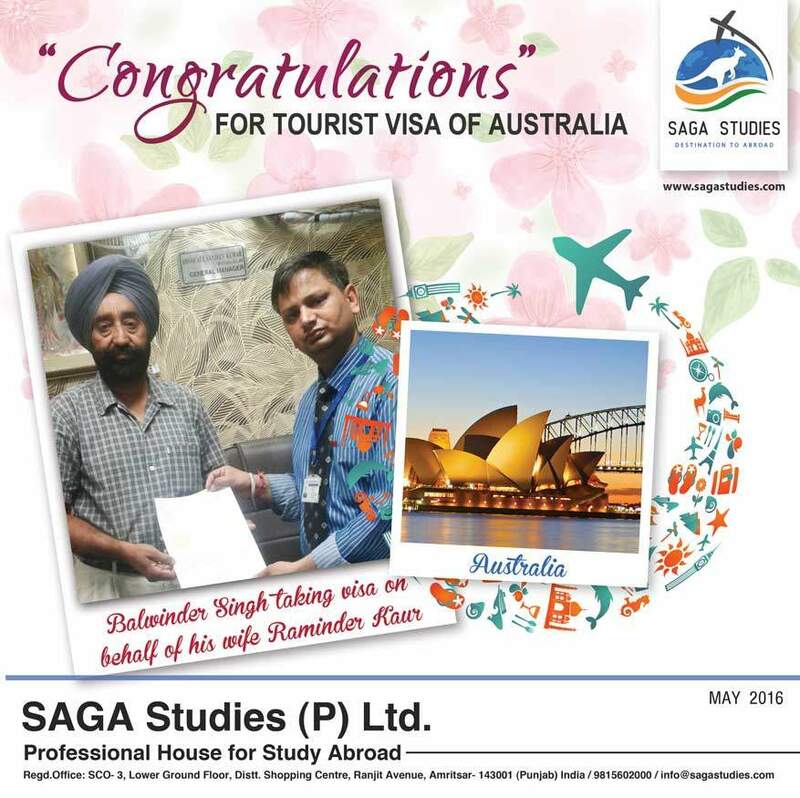 He got tourist visa of Australia. Congratulations Jatinderpal Singh, Manjinder Kaur, Anhad Singh, Shubkarman Singh. 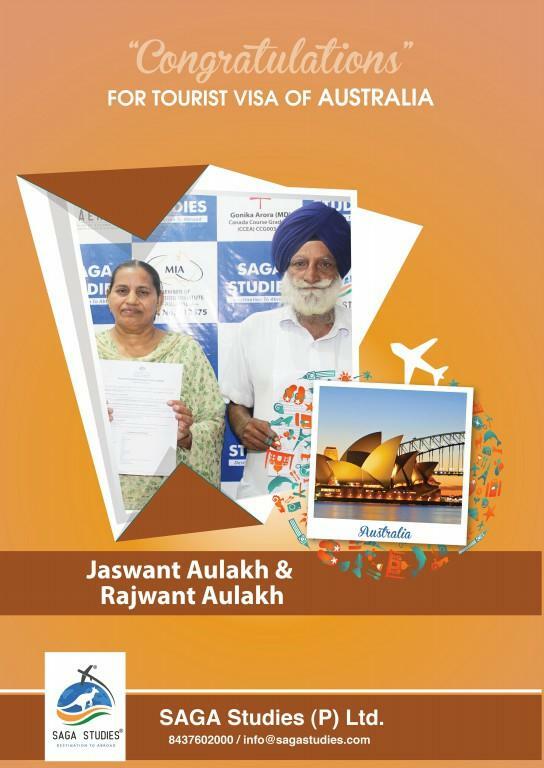 They got tourist visa of Australia. 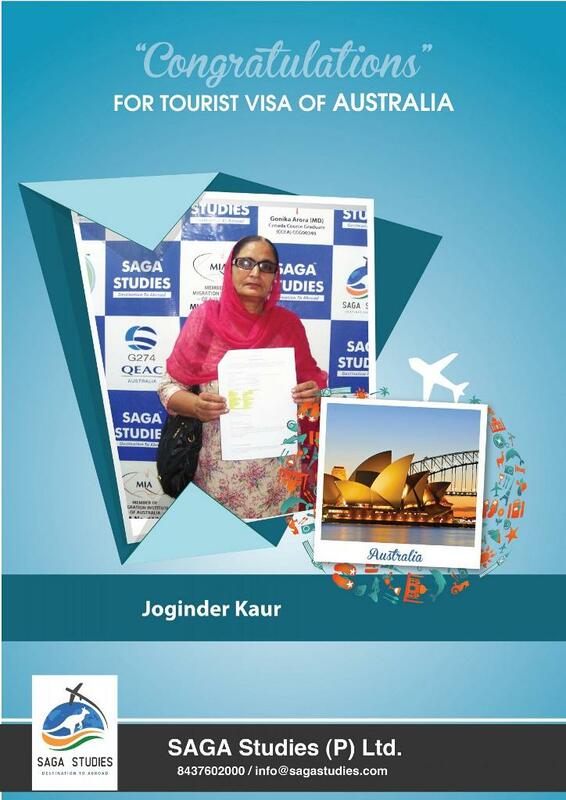 Congratulations Joginder Kaur. 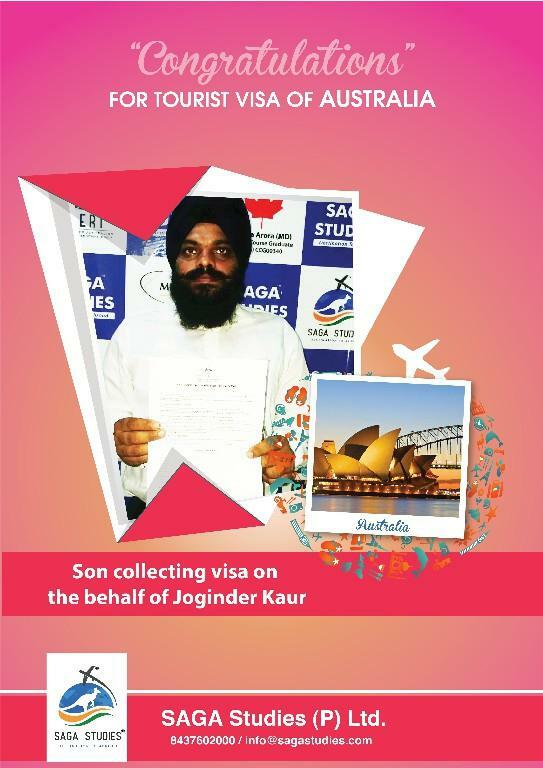 Her son is collecting tourist visa of Australia on the behalf of Joginder Kaur. 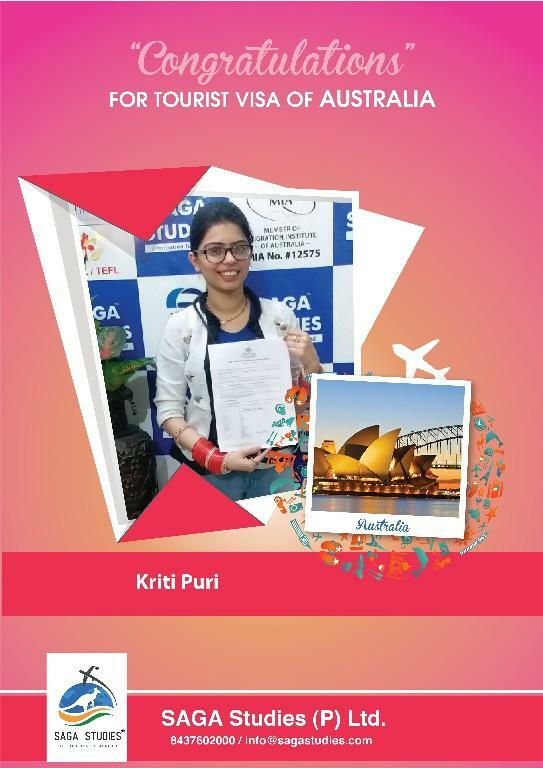 Congratulations Kriti Puri. She got tourist visa of Australia. Congratulations Mamta Devi. 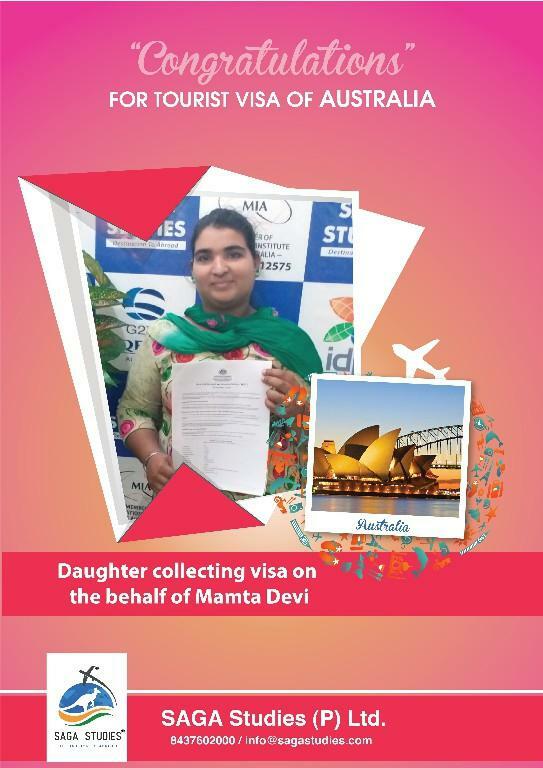 Her daughter collecting tourist visa of Australia on the behalf of Mamta Devi. 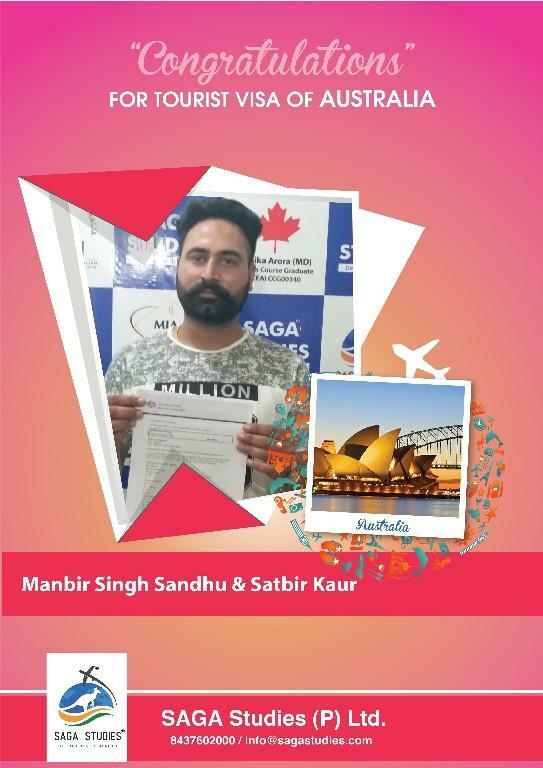 Congratulations Manbir Singh Sandhu & Satbir Kaur. They got tourist visa of Australia. 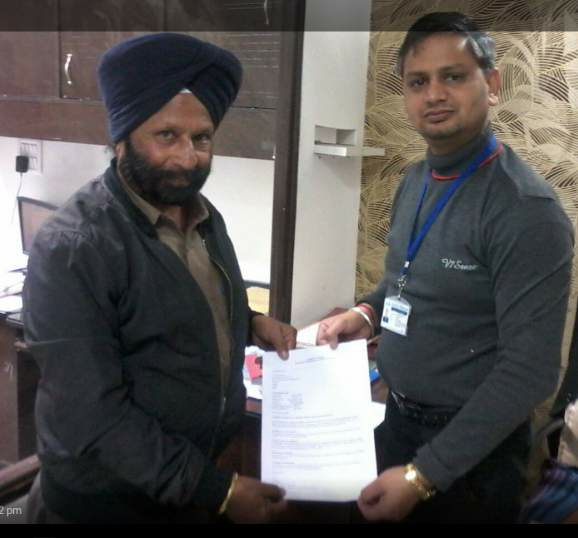 Congratulations Baldev Singh & Manjinderpal Singh. They got tourist visa of Canada. Congratulations Balwinder Singh & Kulwinder Kaur. They got tourist visa of Canada. 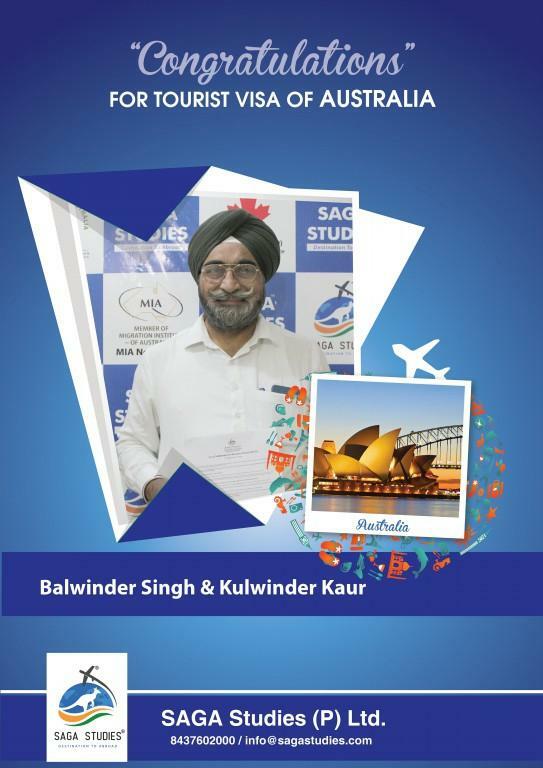 Congratulations Balwinder Singh & Kulwinder Kaur. 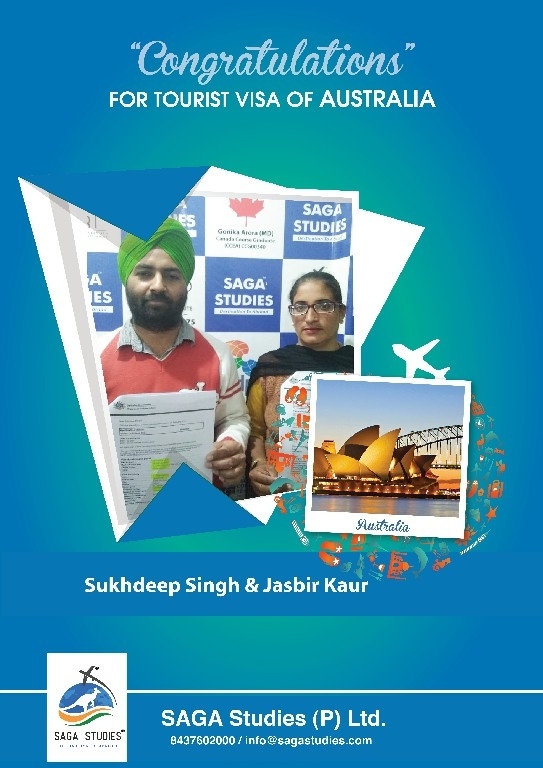 They got tourist visa of Australia. Congratulations Gurwinder Kaur. She got tourist visa of Australia. Congratulations Harpreet Singh. He got tourist visa of Australia. 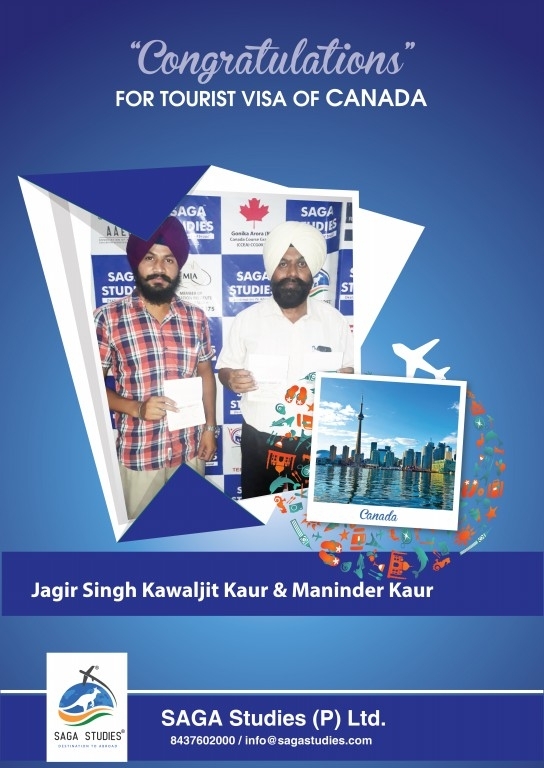 Congratulations Jagjit Dhaliwal & Karamjeet Dhaliwal. They got tourist visa of Australia. Congratulations Jasbir Kaur. 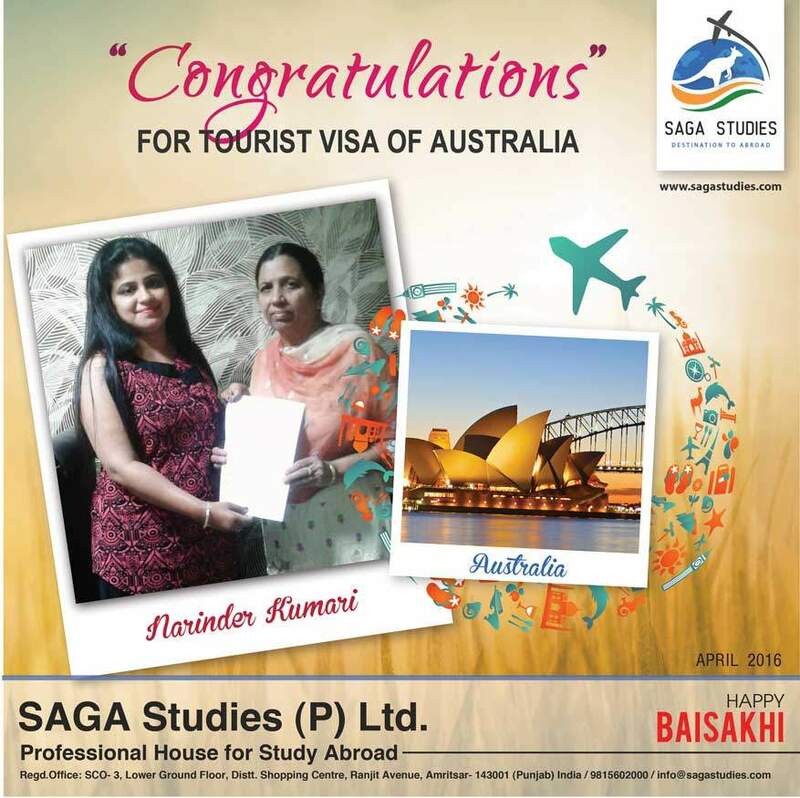 She got tourist visa of Australia. 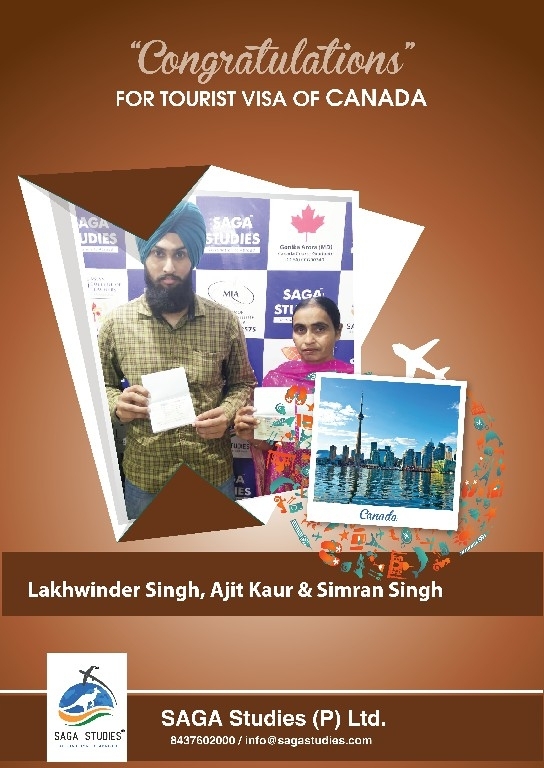 Congratulations Jaswant Singh & Lakhwinder Kaur. They got tourist visa of Australia. Congratulations Jaswinder Kaur. 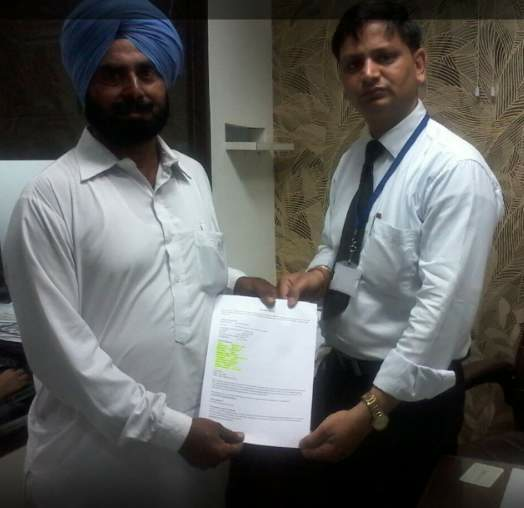 Her son collecting tourist visa of Australia on the behalf of Jaswinder Kaur. Congratulations Kamaljit Kaur. She got tourist visa of Australia. 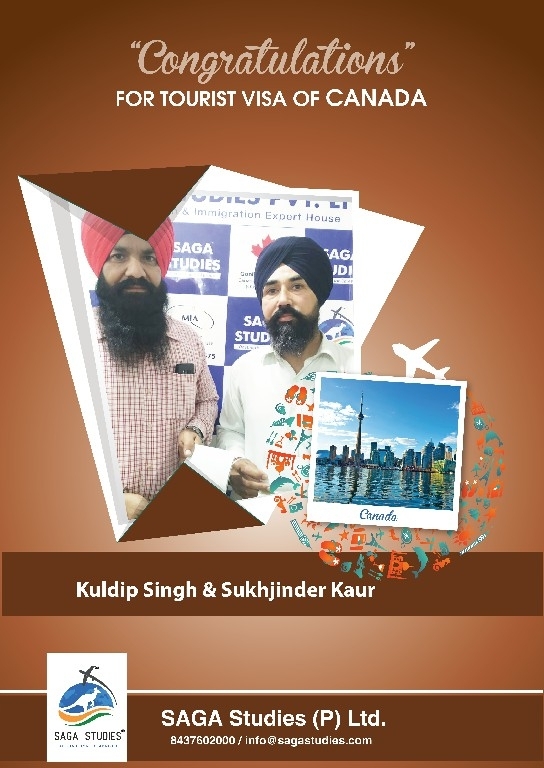 Congratulations Kuljit Singh & Kuldeep Kaur. They got tourist visa of Canada. 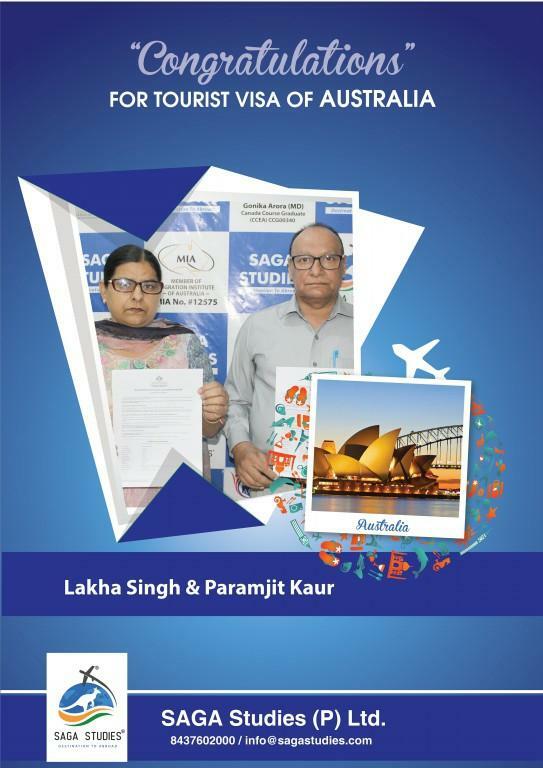 Congratulations Lakha Singh & Paramjit Kaur. They got tourist visa of Australia. Congratulations Lakhwinder Kaur. 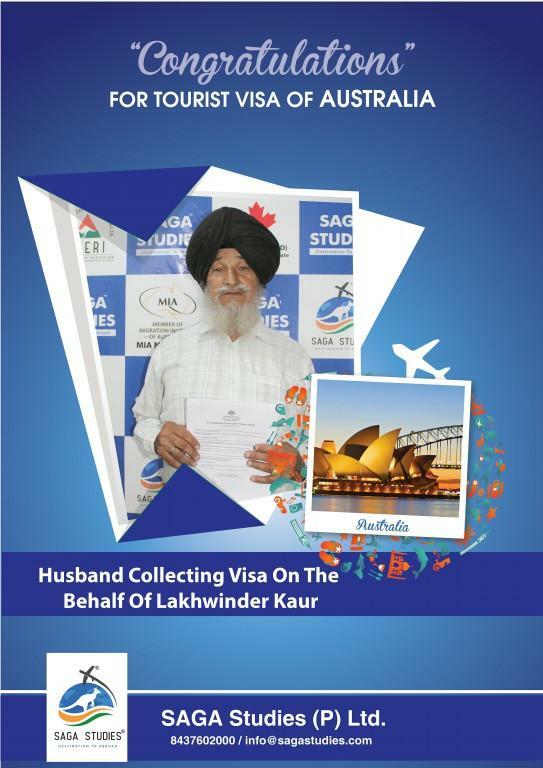 Her husband collecting tourist visa of Australia on the behalf of Lakhwinder Kaur. 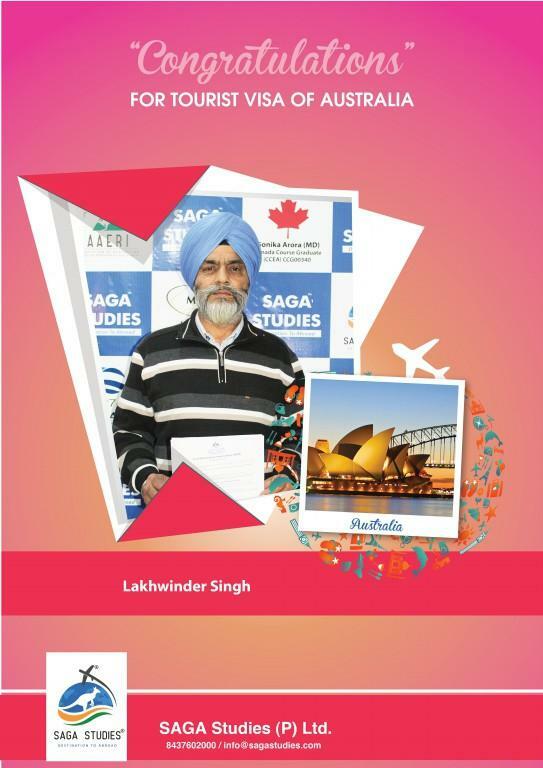 Congratulations Lovedeep Singh. He got his tourist visa of Australia. Congratulations Mangta Singh. He got his tourist visa of Canada. Congratulations Mangta Singh. He got his tourist visa of Australia. 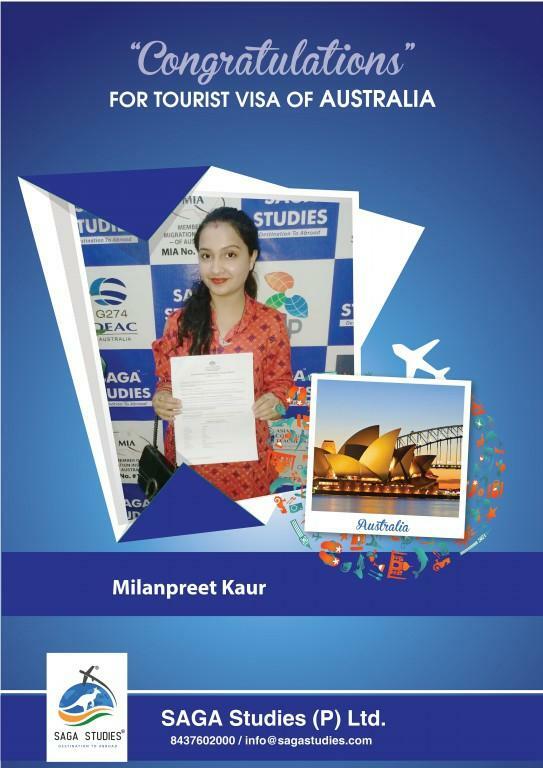 Congratulations Milanpreet Kaur. She got her tourist visa of Australia. Congratulations Narinder Kaur. She got her tourist visa of Canada. Congratulations Narinder Singh & Gurmit Kaur. They got tourist visa of Canada. 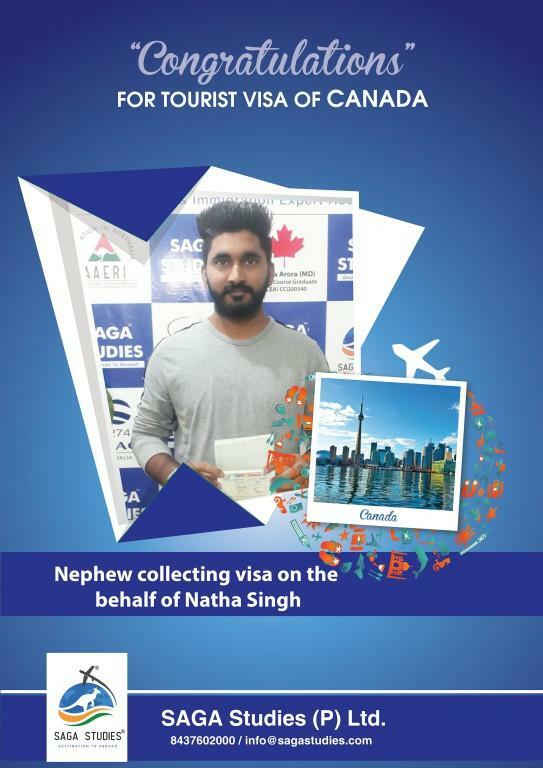 Congratulations Natha Singh. He got his tourist visa of Canada. Congratulations Paramjeet Kaur. She got her tourist visa of Canada. Congratulations Paramjit Kaur. 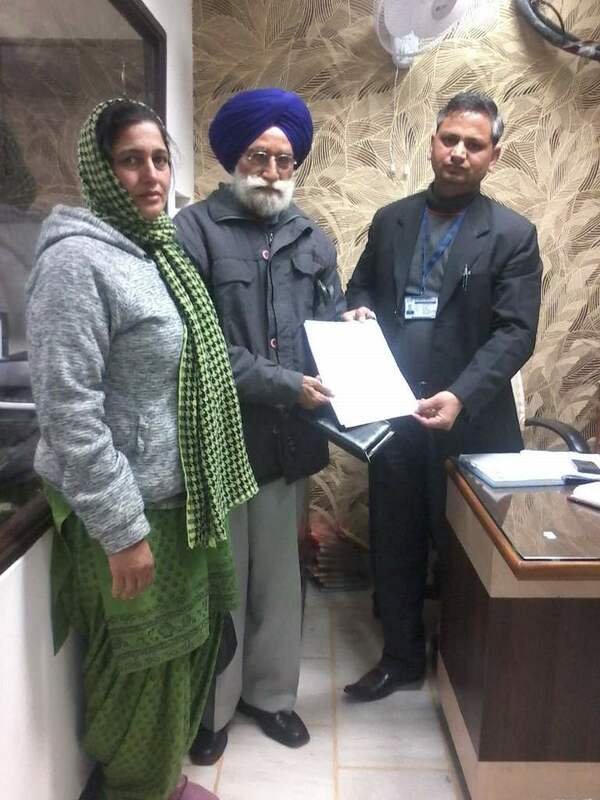 Her husband collecting tourist visa on the behalf of Paramjit Kaur. Congratulations Raj Kumar. He got his tourist visa of Australia. 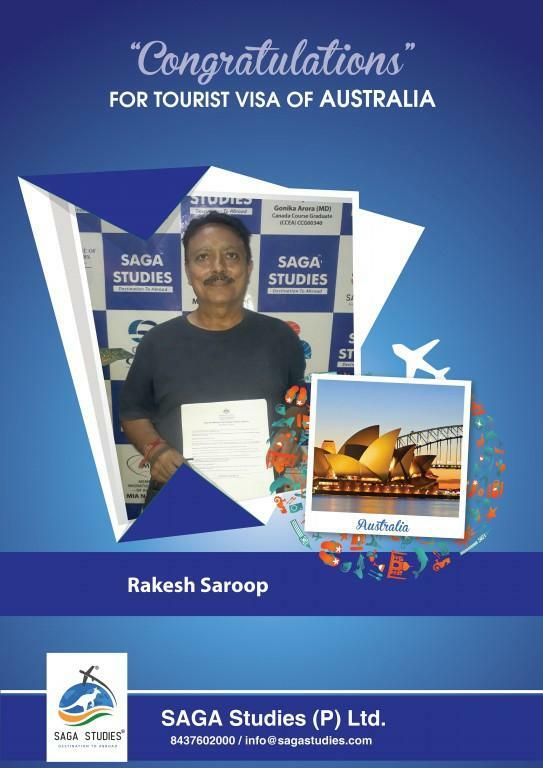 Congratulations Rakesh Saroop. He got his tourist visa of Australia. 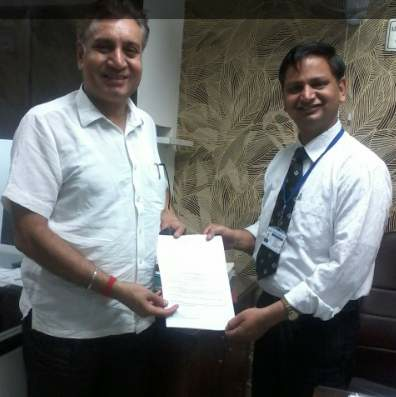 Congratulations Ramesh Jolly. He got tourist visa of Canada. Congratulations Ramesh Kumar & Sashi. They got tourist visa of Australia. 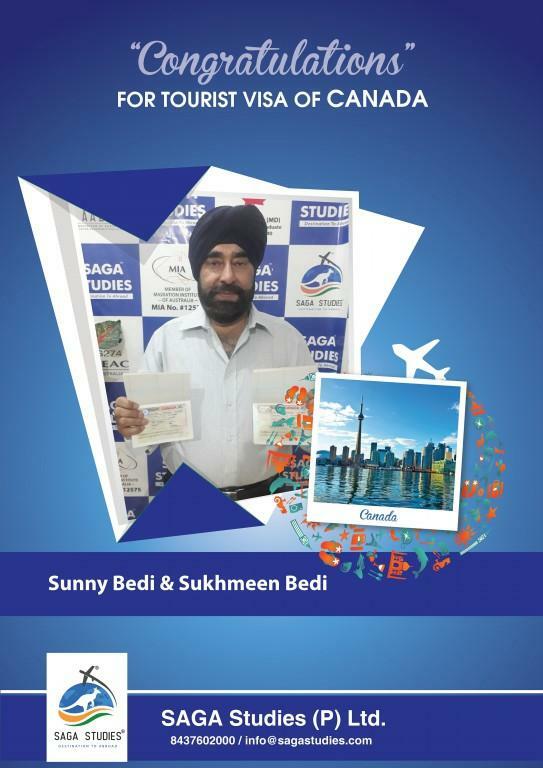 Congratulations Sunny Bedi & Sukhmeen Bedi. 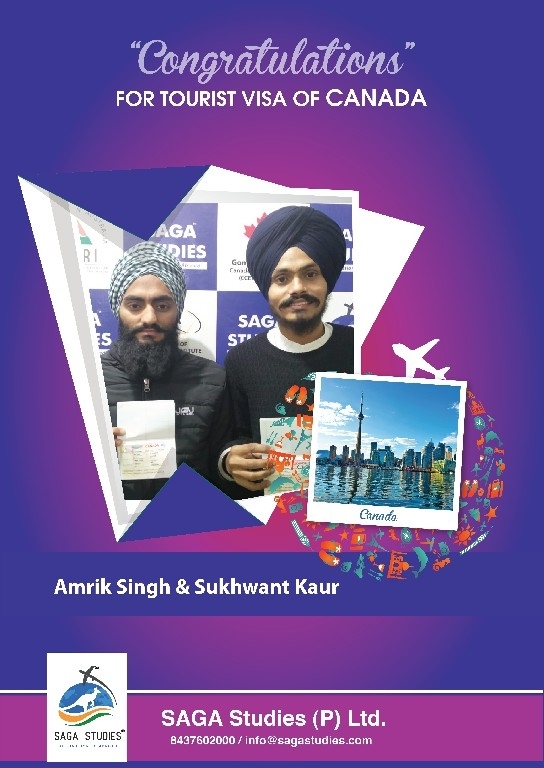 They got tourist visa of Canada. Congratulations Suridner Kumar, Parveen Kumari & Vijay kumar. They got tourist visa of Australia. Congratulations Swinder Kaur. 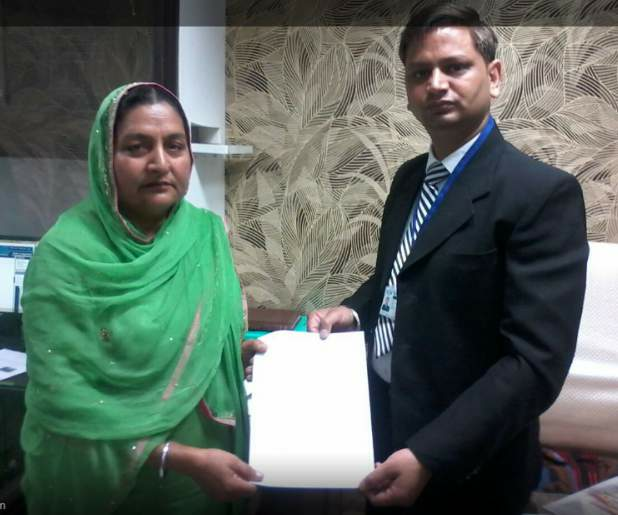 Her son collecting tourist visa on the behalf of Swinder Kaur. 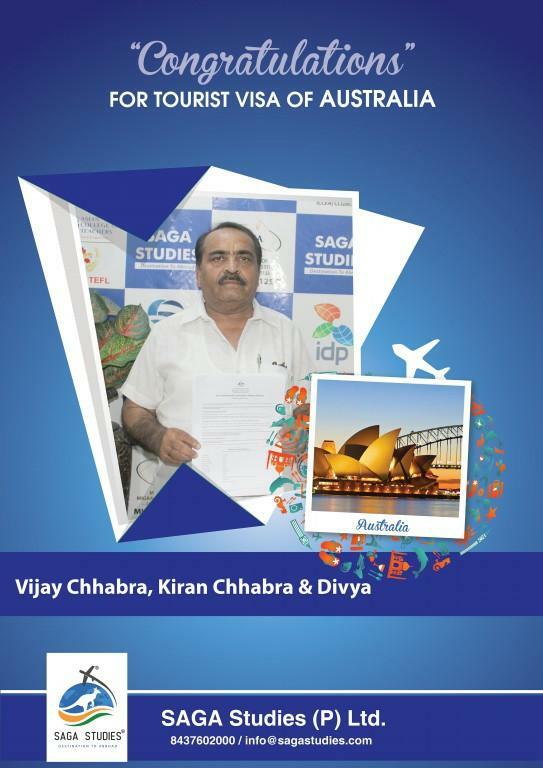 Congratulations Vijay Chhabra, Kiran Chhabra & Vijay. They got tourist visa of Australia. 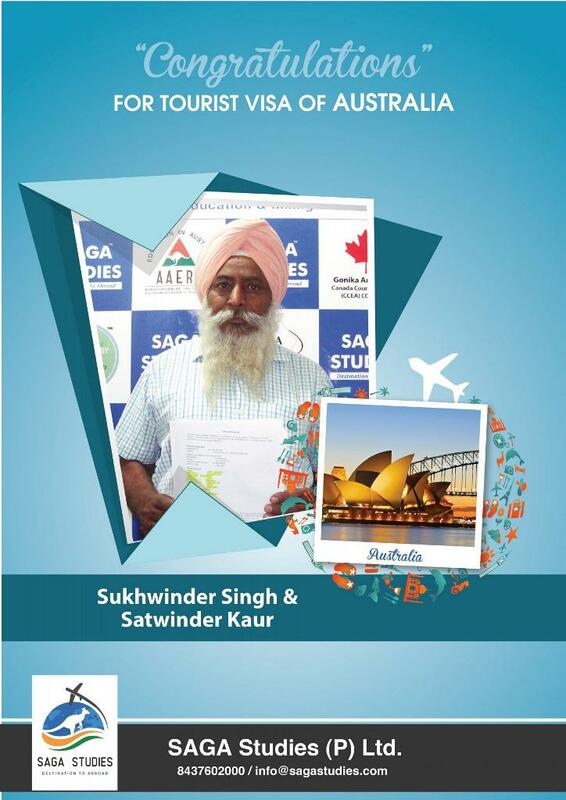 Congratulations Balwinder Singh & Sukhwinder Kaur. They got Tourist Visa of Canada. 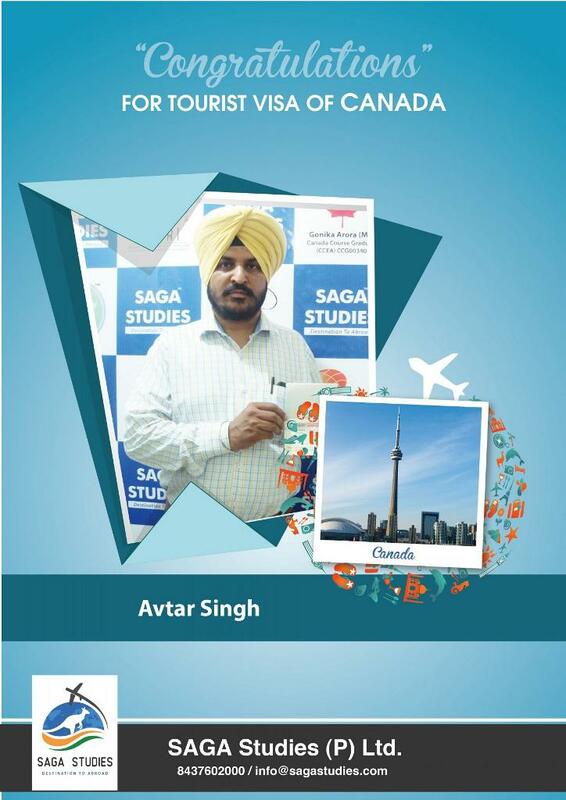 Congratulations Avtar Singh. 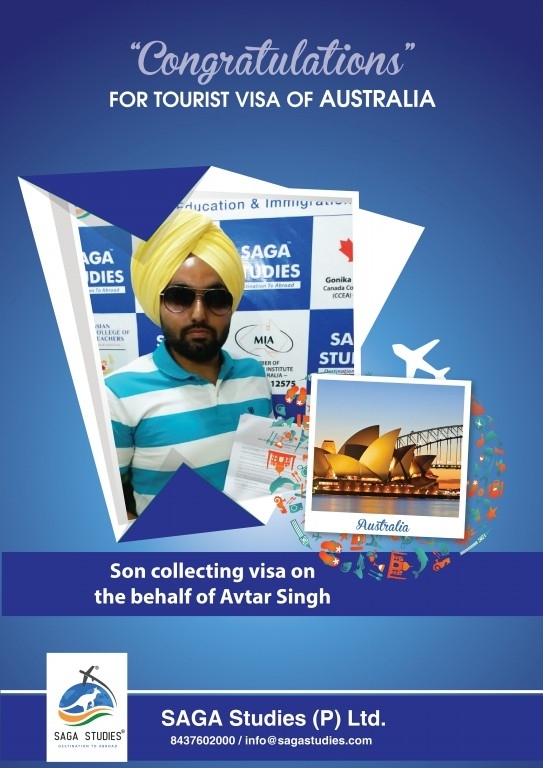 His son is collecting Tourist Visa of Australia on the behalf of Avtar Singh. Congratulations Aman Gujral. He got Tourist Visa of Australia. 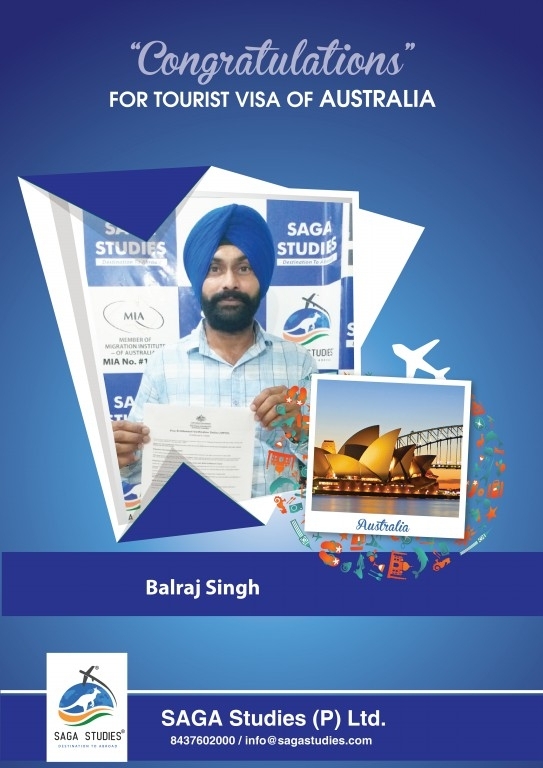 Congratulations Balraj Singh. 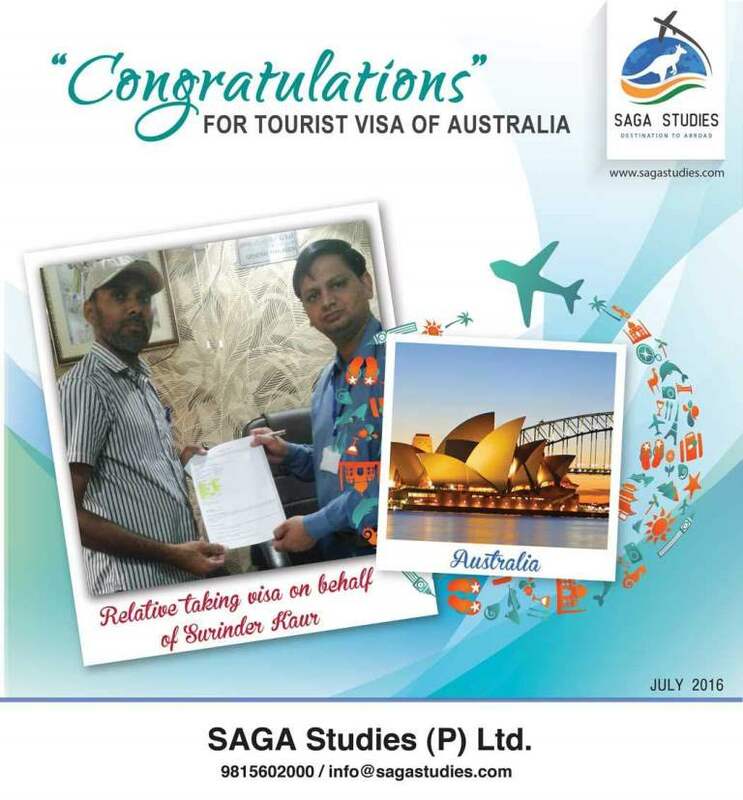 He got Tourist Visa of Australia. 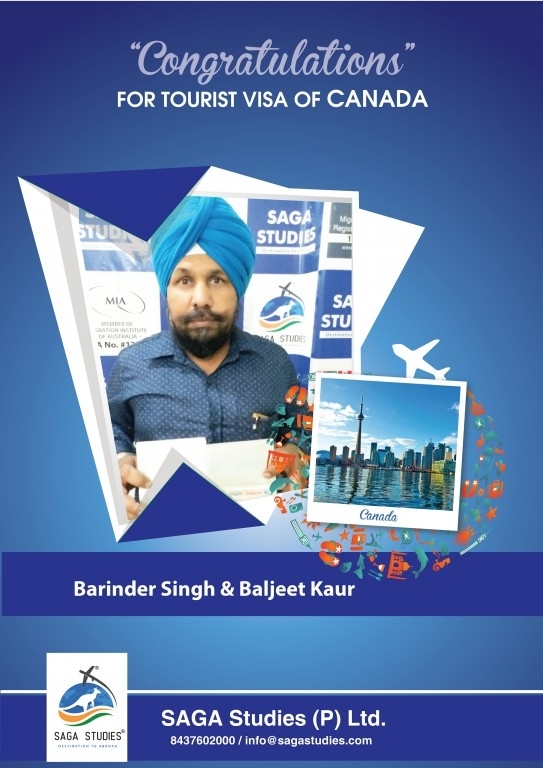 Congratulations Barinder Singh & Baljeet Kaur. 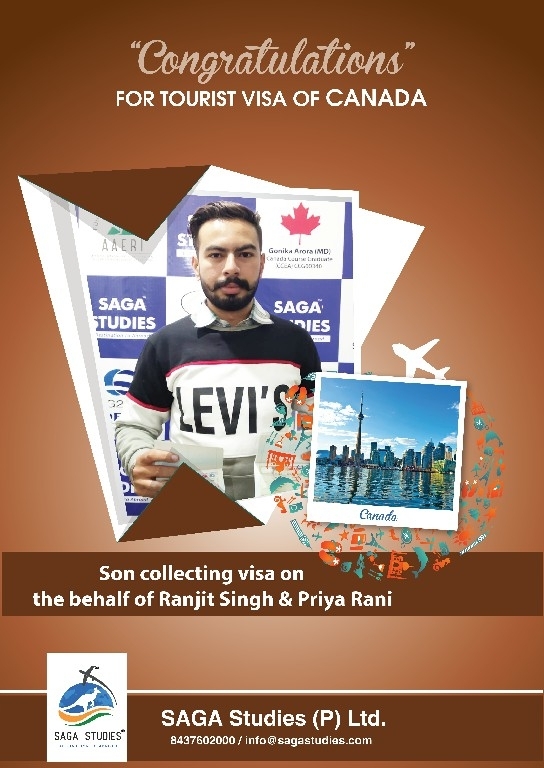 They got Tourist Visa of Canada. 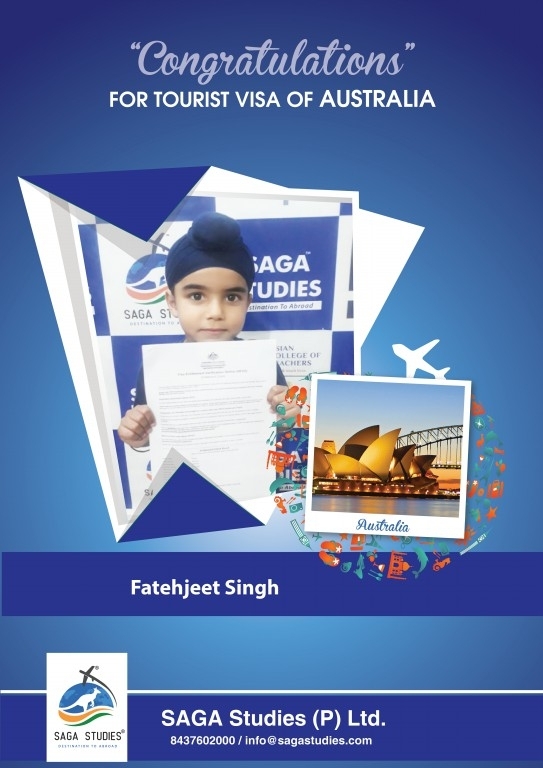 Congratulations Fatehjeet Singh. They got Tourist Visa of Australia. Congratulations Gurwinder Singh & Ranjit Kaur. They got Tourist Visa of Australia. Congratulations Jaiwant Singh. He got Tourist Visa of Canada. 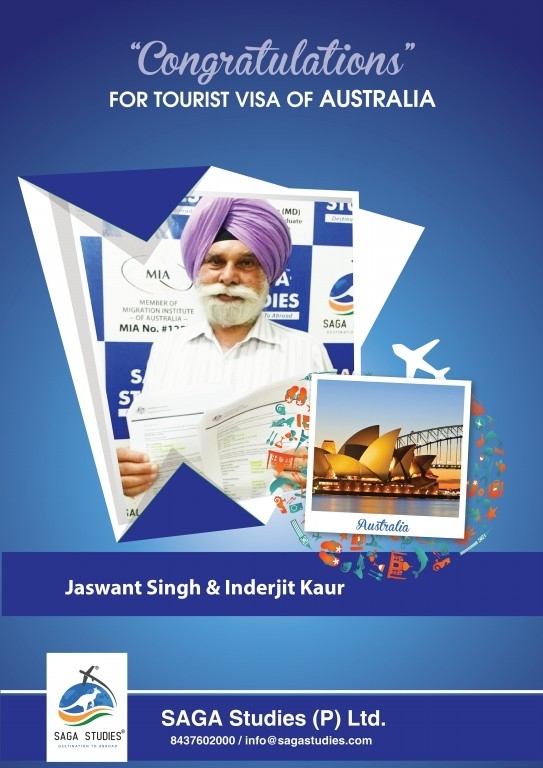 Congratulations Jaswant Singh & Inderjit Kaur. They got Tourist Visa of Australia. Congratulations Kirpal Singh & Davinder Kaur. 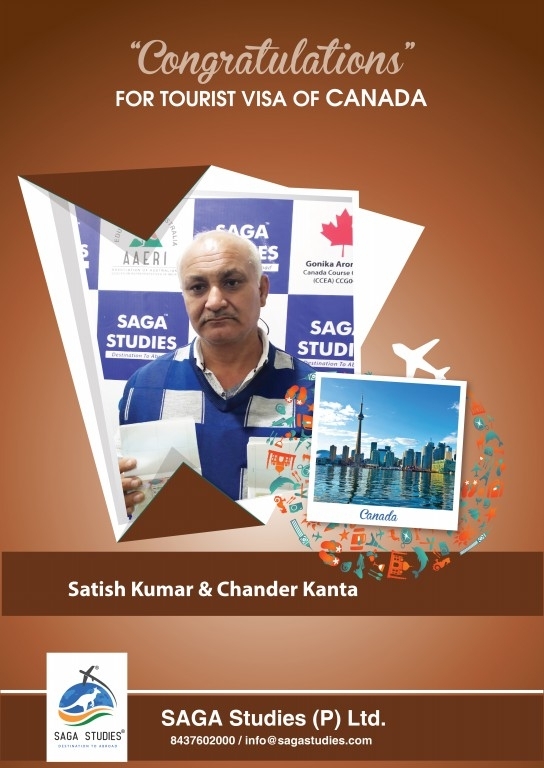 They got Tourist Visa of Canada. 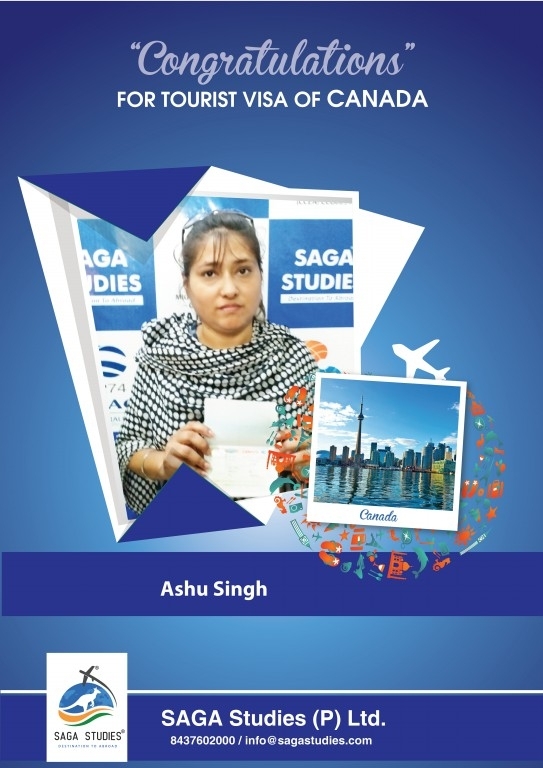 Congratulations Ashu Singh. She got Tourist Visa of Canada. Congratulations Naginder Singh & Jasbir Kaur. They got Tourist Visa of Canada. 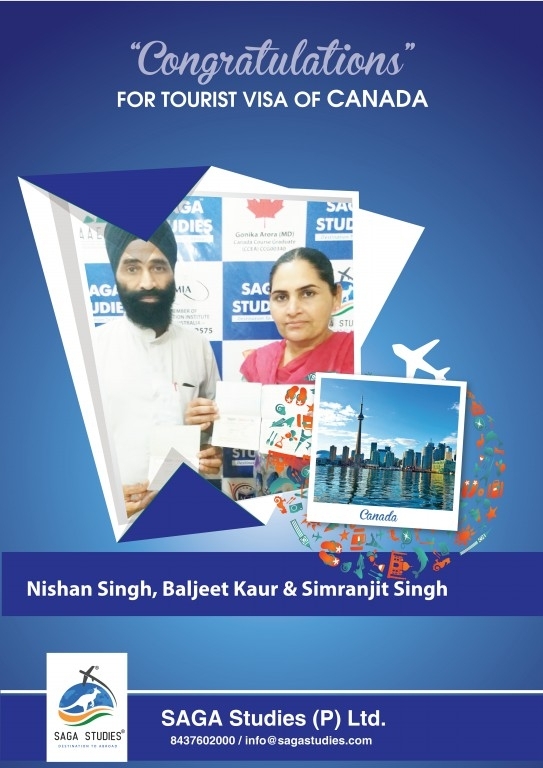 Congratulations Nishan Singh, Baljeet Kaur & Simranjit Singh. 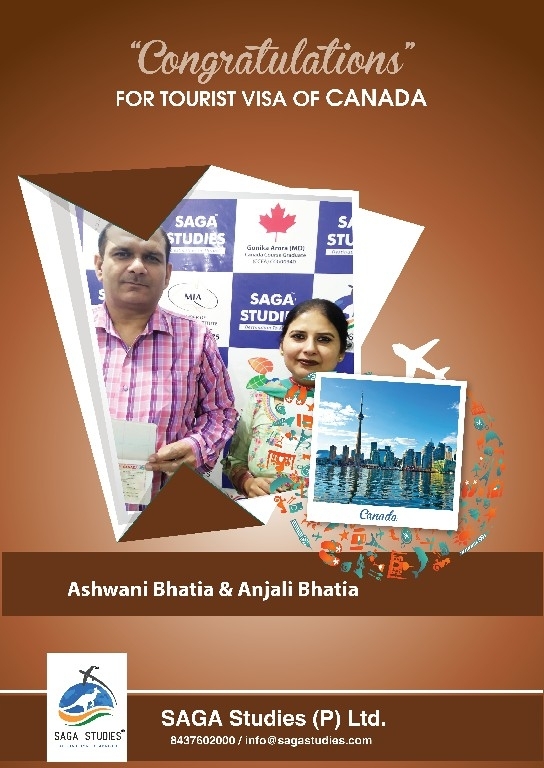 They got Tourist Visa of Canada. Congratulations Paramjit Kaur. 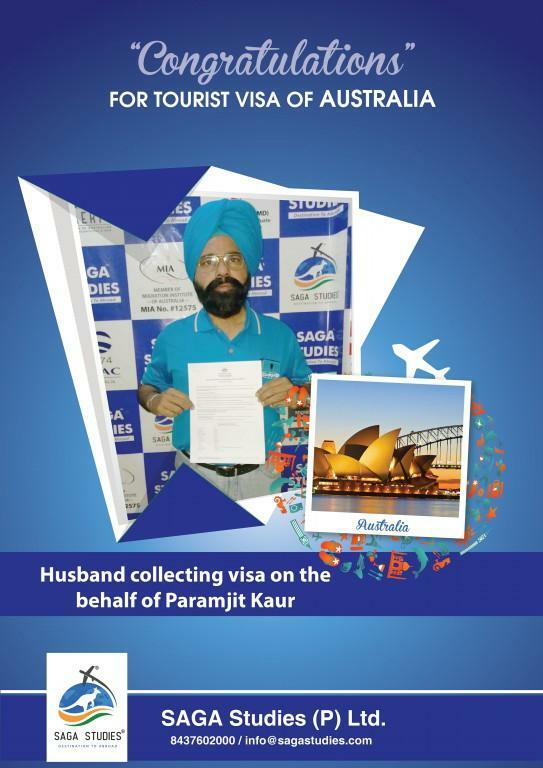 She got Tourist Visa of Australia on the behalf of Paramjit Kaur. Congratulations Pawan Singh & Sangita Sachdeva. They got Tourist Visa of Australia. 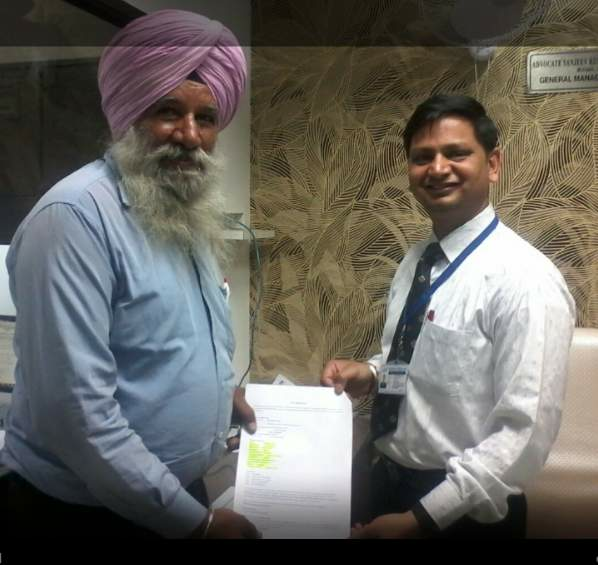 Congratulations Satyamjit Singh. 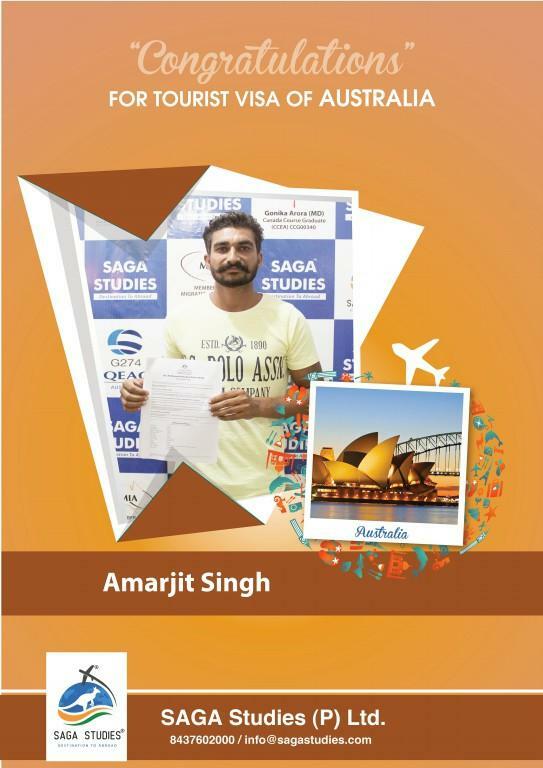 He got Student Visa of Australia. 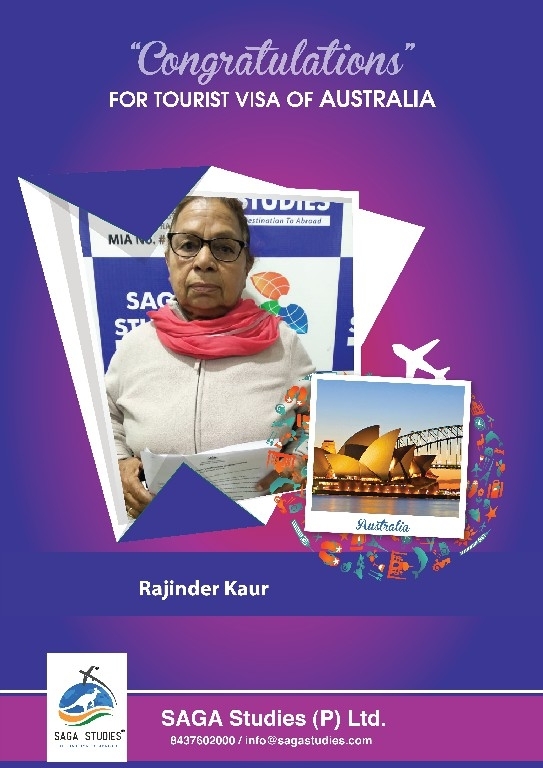 Congratulations Rajbir Kaur. 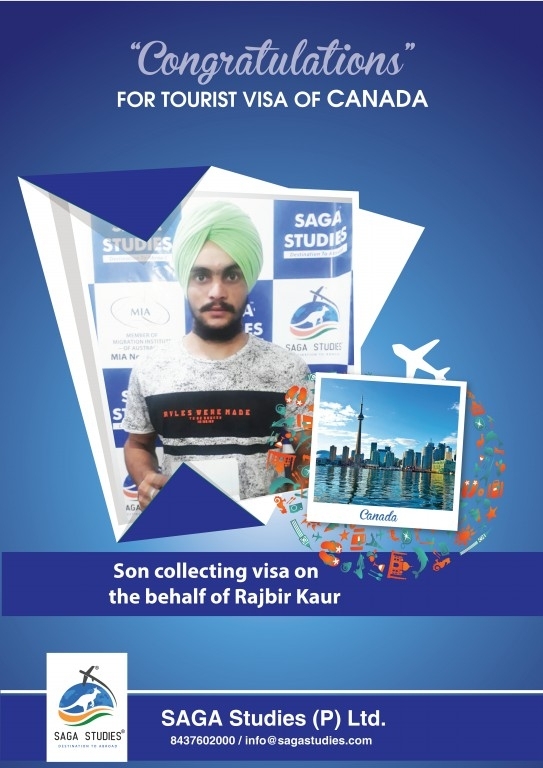 Her son is collecting Tourist visa of Canada on the behalf of Rajbir Kaur. 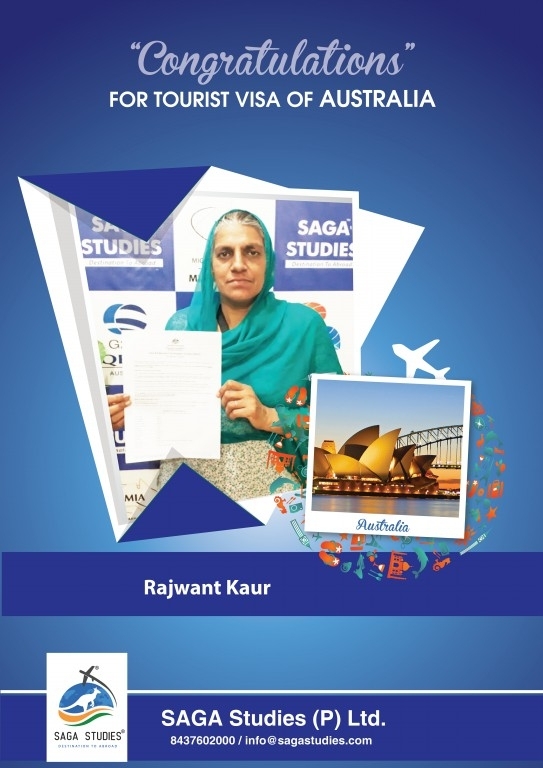 Congratulations Rajwant Kaur. She got Tourist Visa of Australia. Congratulations Rajwinder Kaur & Narinder Jit Kaur. They got Tourist Visa of Canada. 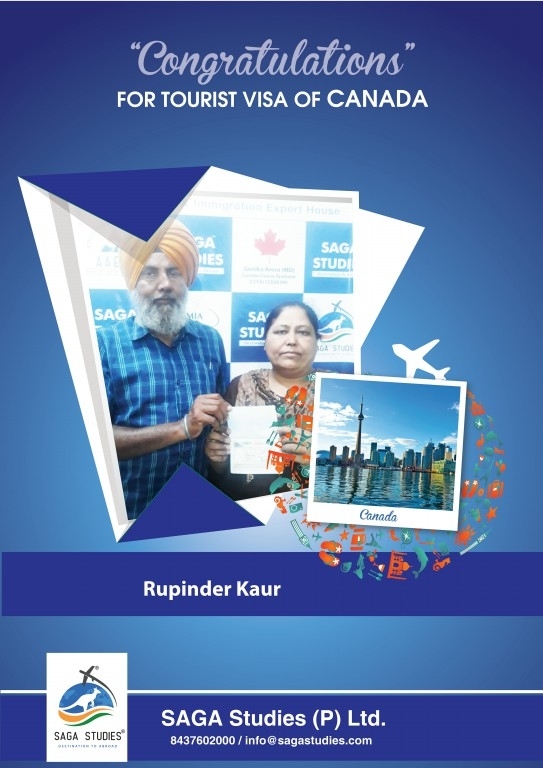 Congratulations Rupinder Bir Kaur. 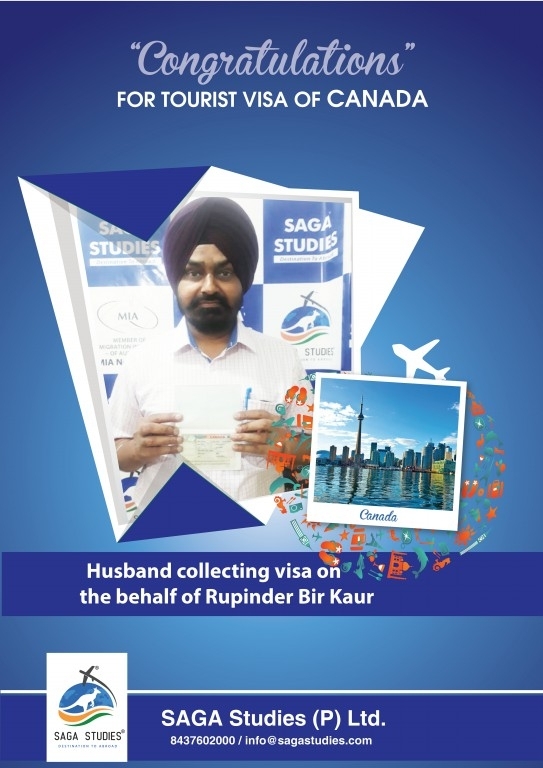 Her husband is collecting Tourist Visa of Australia on the behalf of Rupinder Bir Kaur. Congratulations Rupinder Kaur. 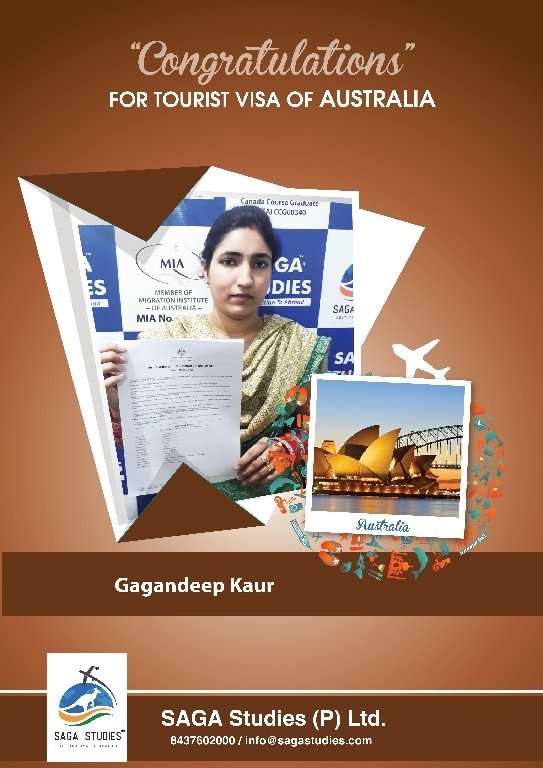 She got Tourist Visa of Australia. Congratulations Sarabjit Kaur. She got Tourist Visa of Canada. 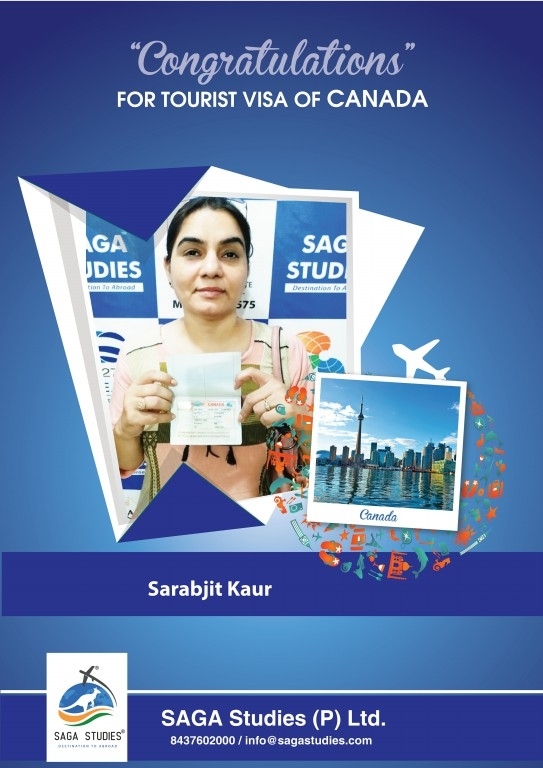 Congratulations Sarabjit Kaur. 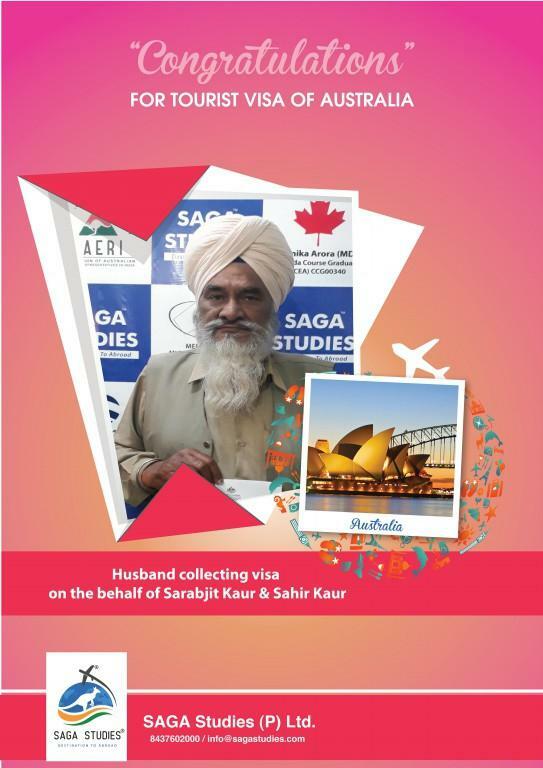 Her husband is collecting Tourist Visa of Canada on the behalf of Sarabjit Kaur. Congratulations Satish Kumar & Poonam. They got Tourist visa of Canada. 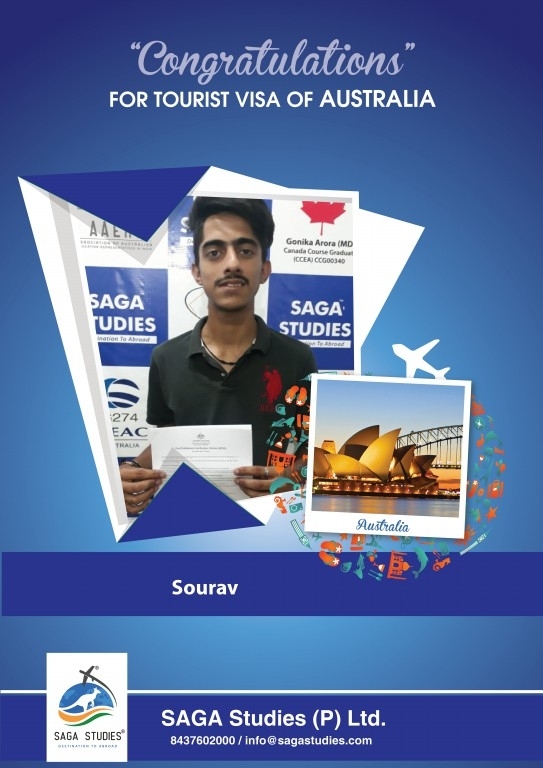 Congratulations Sourav. 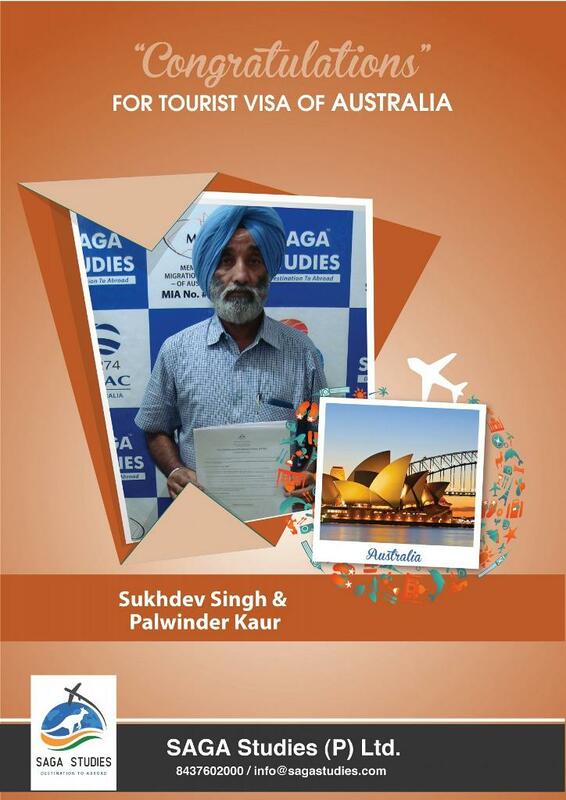 He got Tourist visa of Australia. Congratulations Sukhpreet. She got Tourist visa of Australia. Congratulations Sushma Rampa. 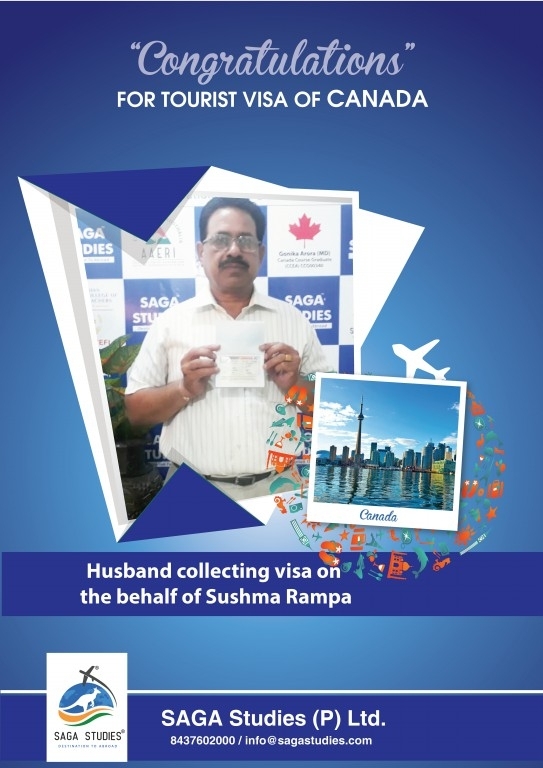 Her husband collecting her Tourist visa of Canada ont he behalf of Sushma Rampa. Congratulations Jagbir Singh & Gurpinder Kaur. They got tourist visa of Australia. 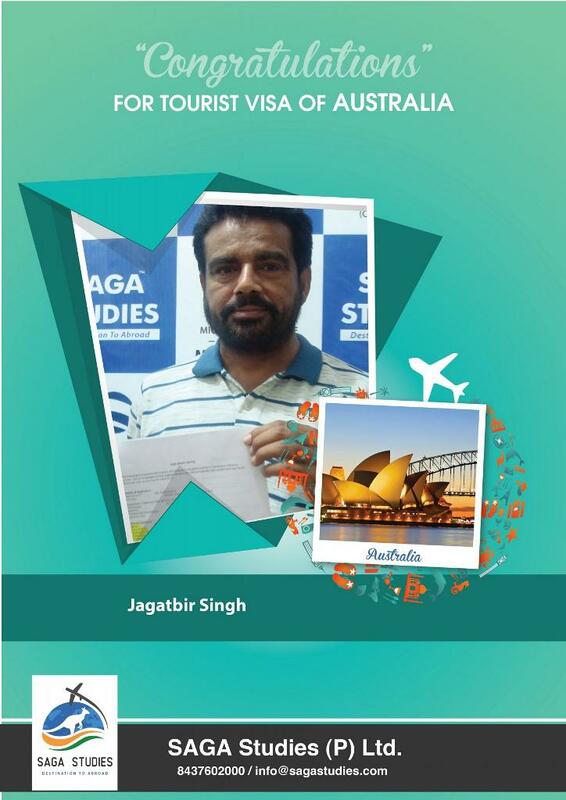 Congratulations Jagbir Singh. He got tourist visa of Australia. 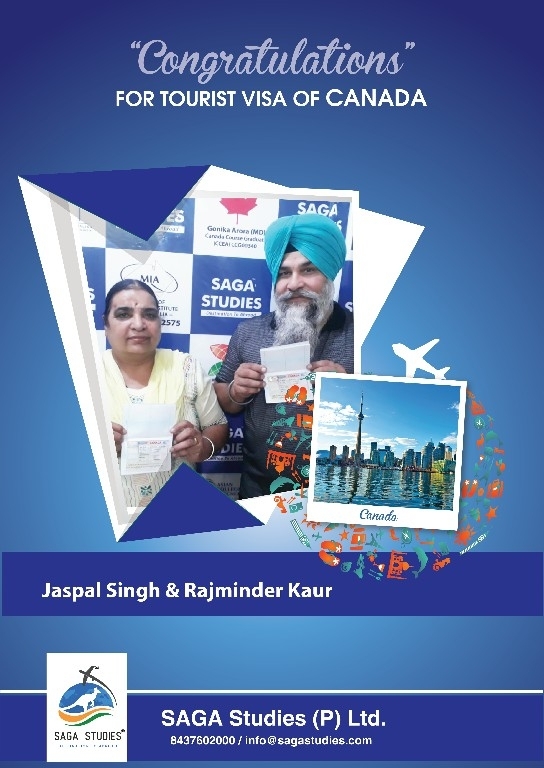 Congratulations Jaspal Singh & Rajminder Kaur. They got tourist visa of Canada. 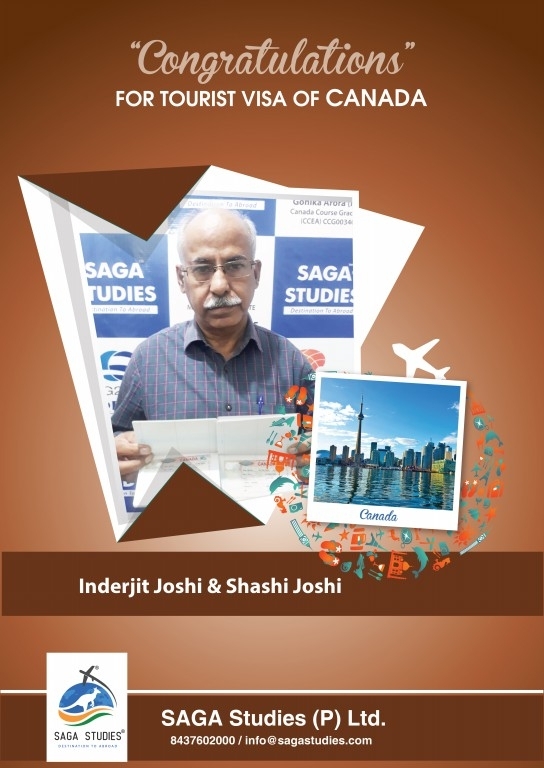 Congratulations Jaswant Singh. He got tourist visa of Australia. 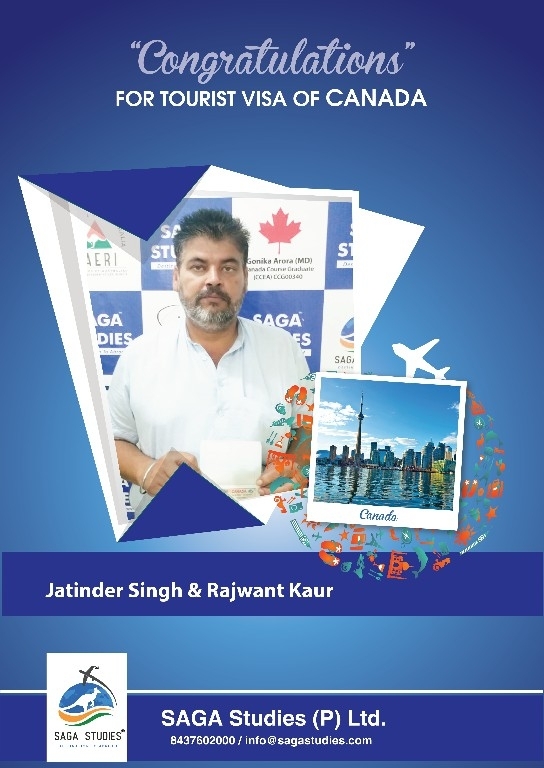 Congratulations Jatinder Singh & Rajwant Kaur. They got tourist visa of Canada. 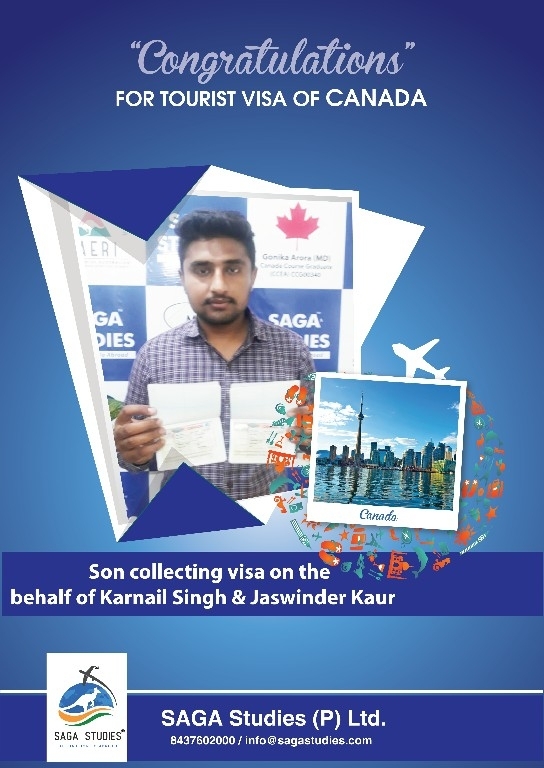 Congratulations Karnail Singh & Jaswinder Kaur. She got tourist visa of Canada. 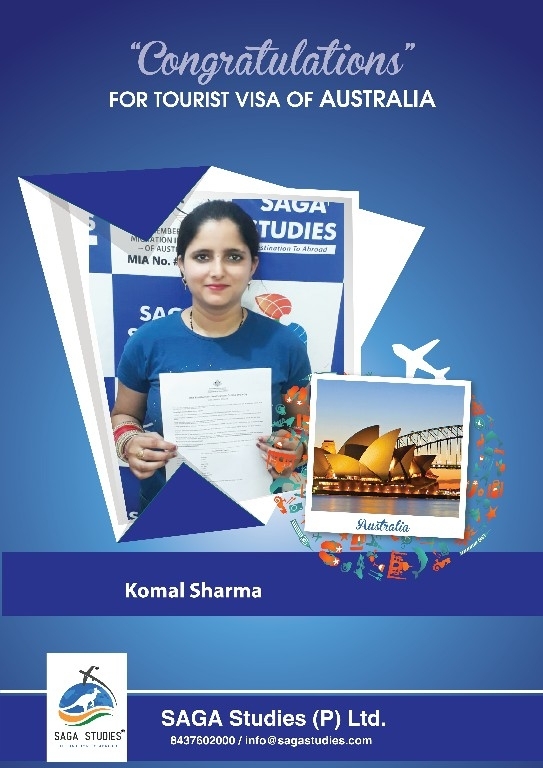 Congratulations Komal Sharma. She got tourist visa of Australia. 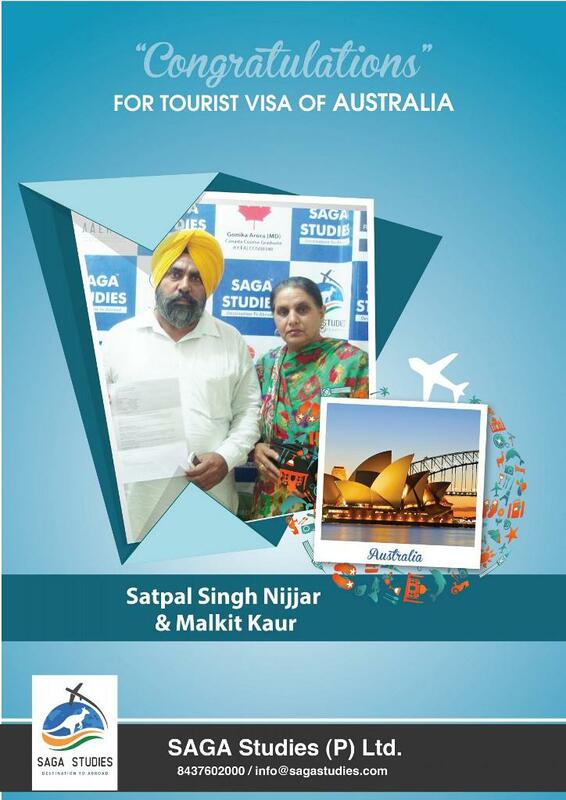 Congratulations Makhan Singh & Manjit Kaur. They got tourist visa of Australia. Congratulations Paramjit Singh & Paramjit Kaur. They got tourist visa of Australia. 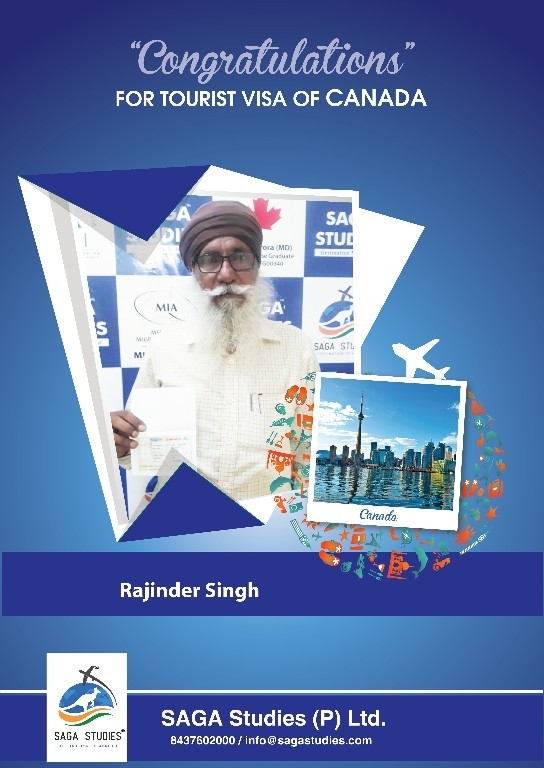 Congratulations Rajinder Singh. 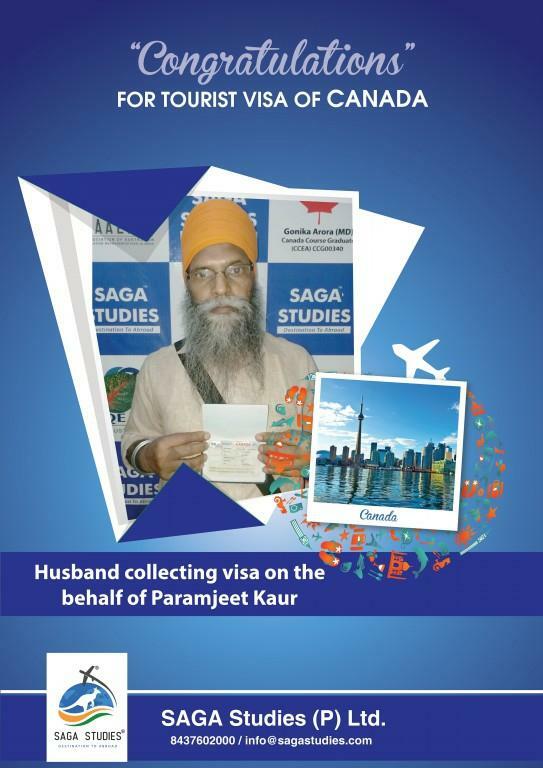 He got tourist visa of Canada. 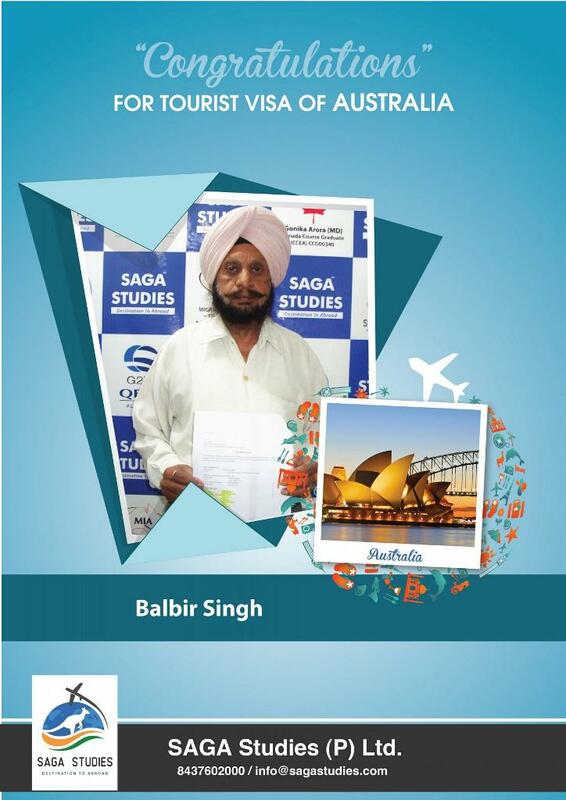 Congratulations Balbir Singh. 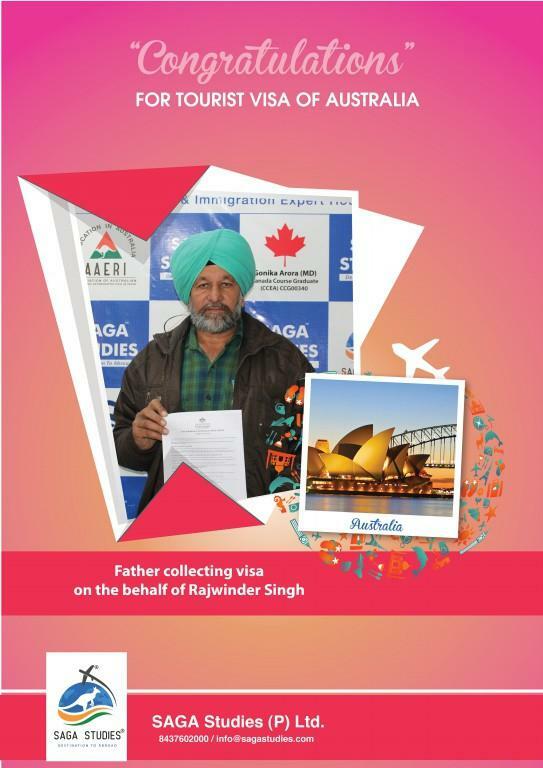 His son collecting Tourist Visa of Australia on the behalf of Balbir Singh. Congratulations Avtarjeet Singh & Gurinder Kaur. 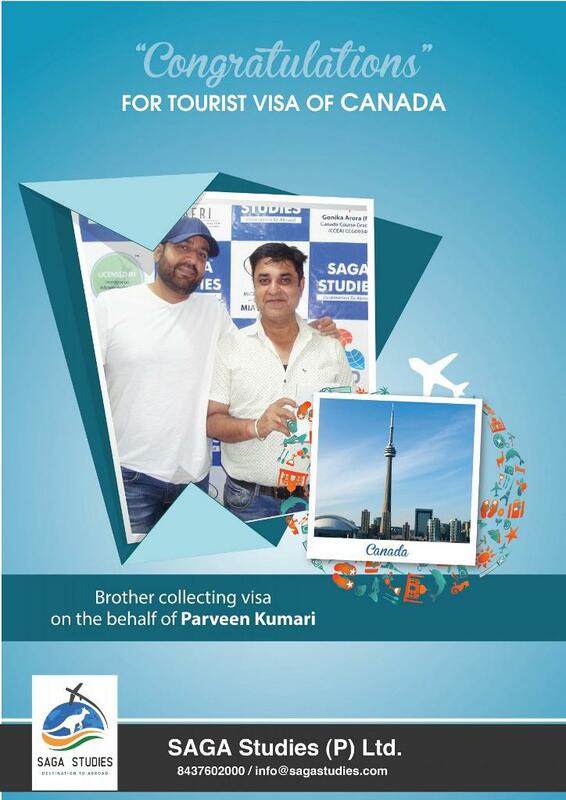 They got Tourist visa of Canada. Congratulations Dilbag Singh & Narinder Kaur. They got Tourist visa of Australia. 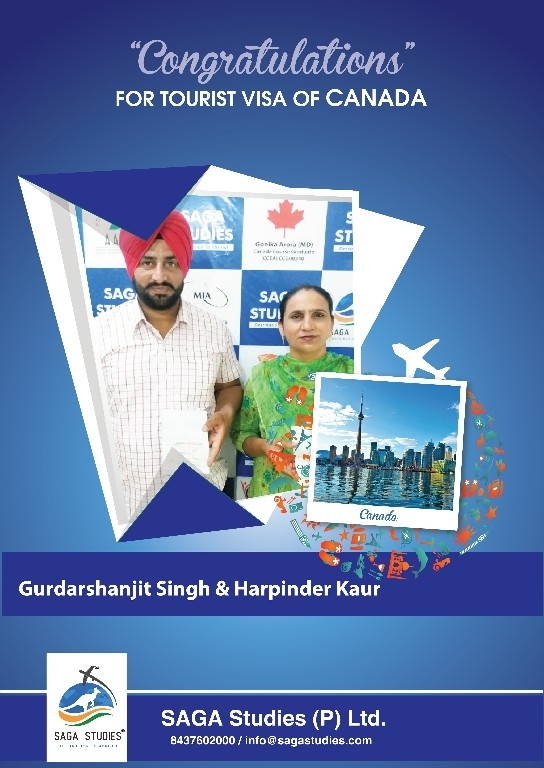 Congratulations Gurdarshanjit Singh & Harpinder Kaur. They got Tourist Visa of Canada. Congratulations Gurmeet Kaur. She got Tourist Visa of Canada. 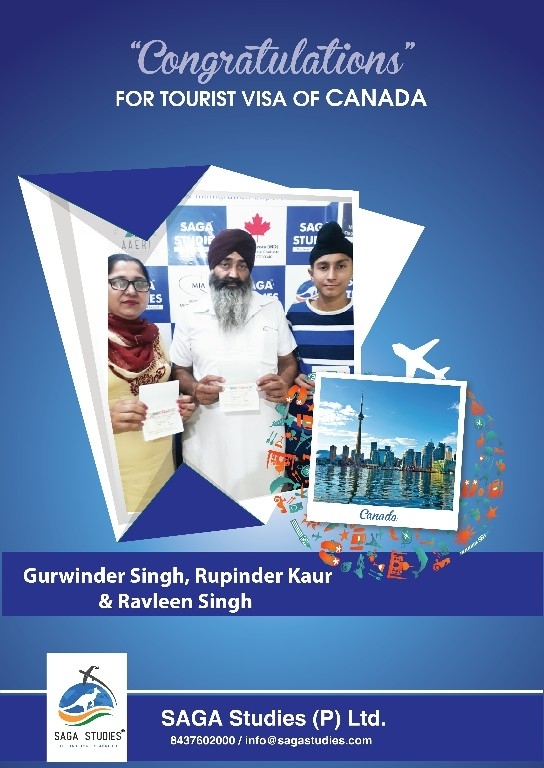 Congratulations Gurwinder Singh, Rupinder Kaur & Ravleen Singh. They got Tourist Visa of Canada. Congratulations Hardip Singh & Kashmir Kaur. They got Tourist Visa of Australia. Congratulations Harjit Kaur. 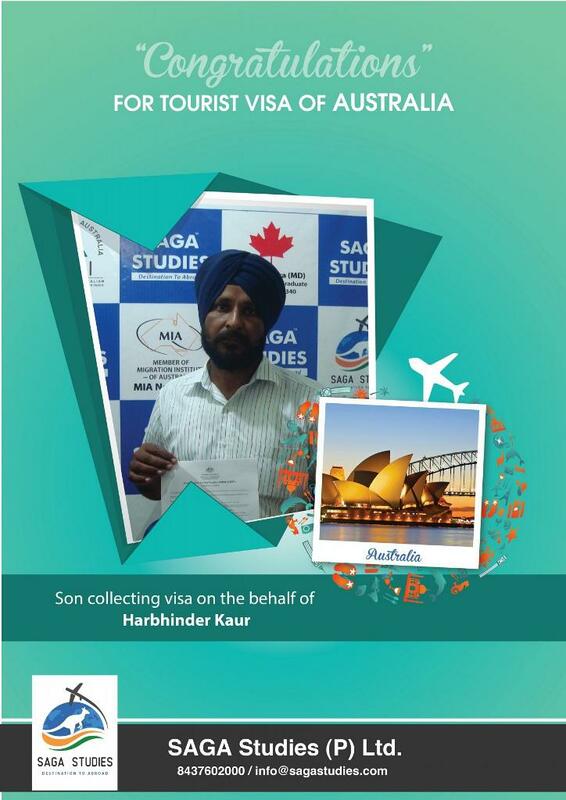 Her son is collecting tourist Visa on the behalf of Harjit Kaur. Congratulations Jagir Kaur. 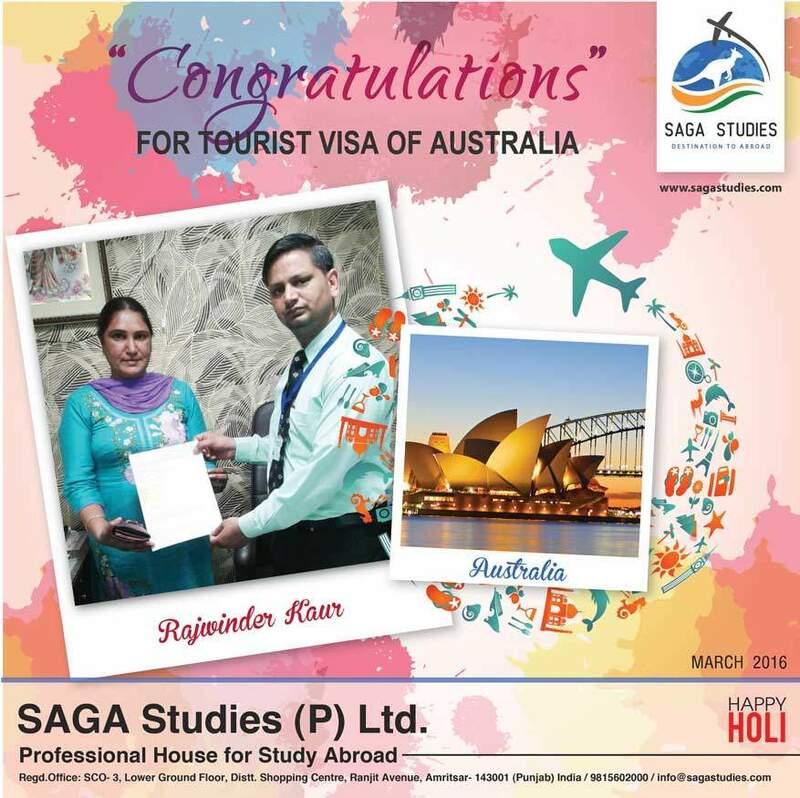 She got Tourist Visa of Australia. 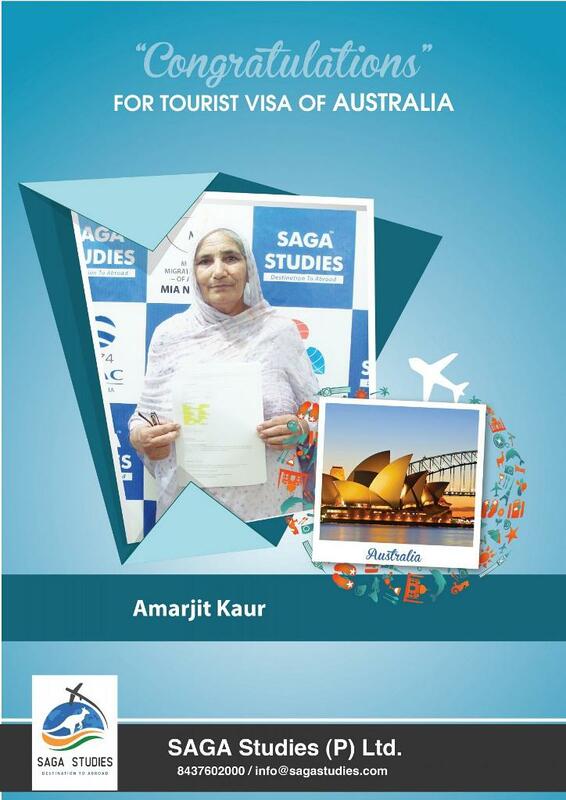 Congratulations Amarjit Kaur. 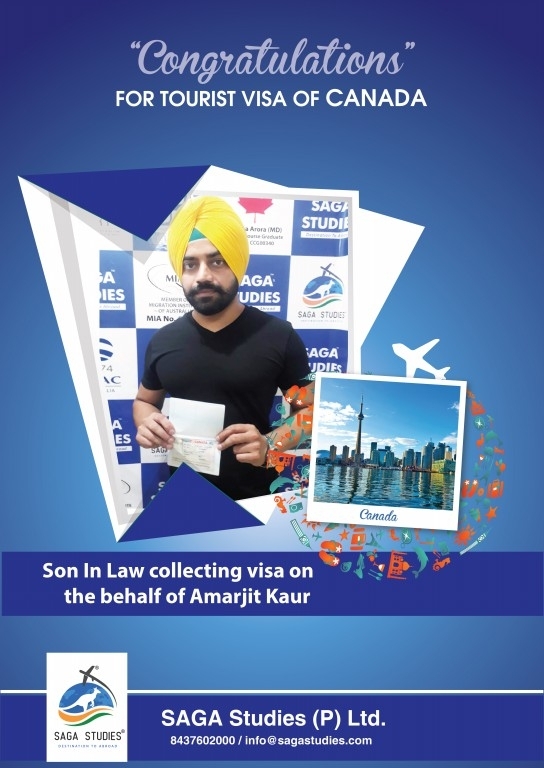 Her Son In Law is collecting visa on the behalf of Amarjit Kaur. 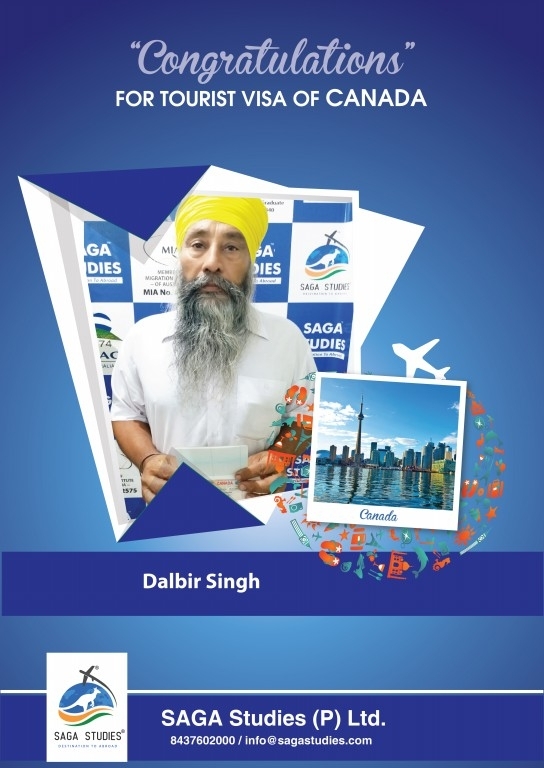 Congratulations Dalbir Singh. He got his Tourist Visa of Canada. 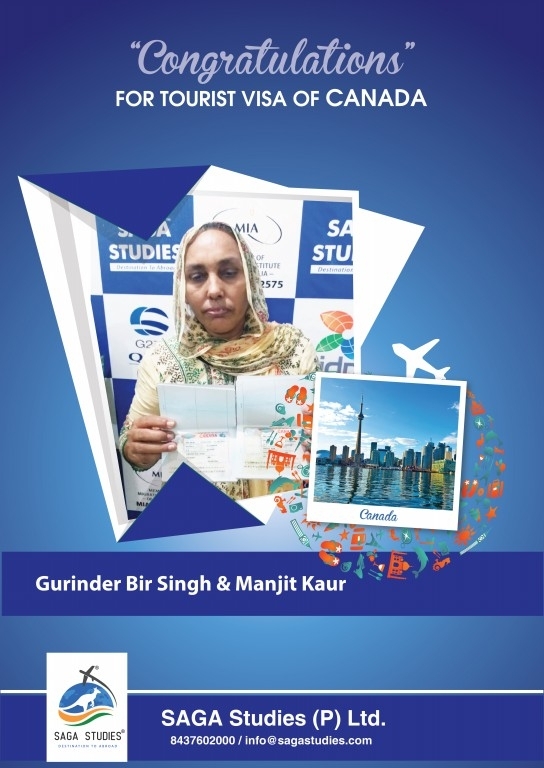 Congratulations Gurinder Bir Singh & Manjit Kaur. They got their Tourist Visa of Canada. Congratulations Jagir Singh, Kawaljit Kaur & Maninder Kaur. They got their Tourist Visa of Canada. 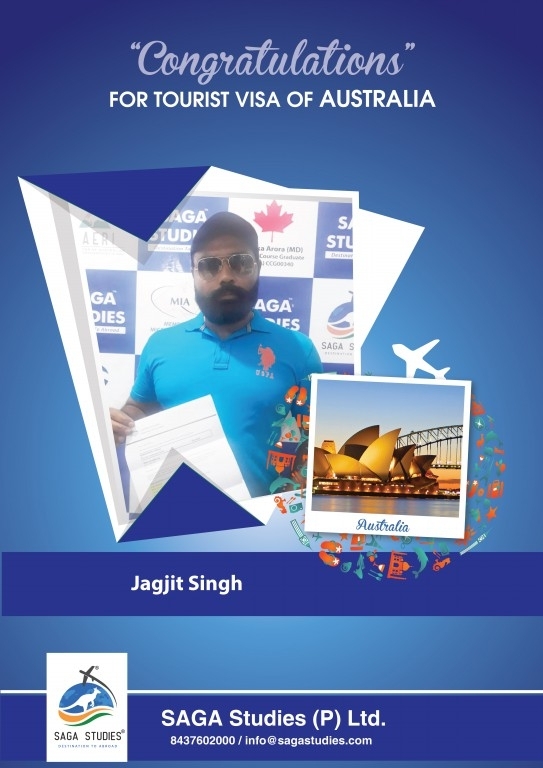 Congratulations Jagjit Singh. 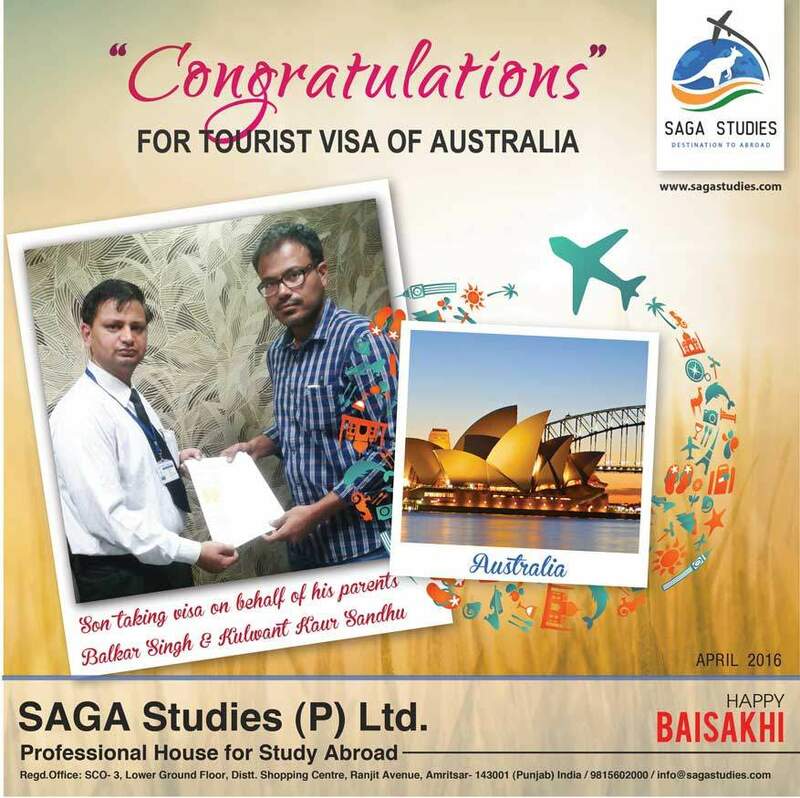 He got Tourist Visa of Australia. 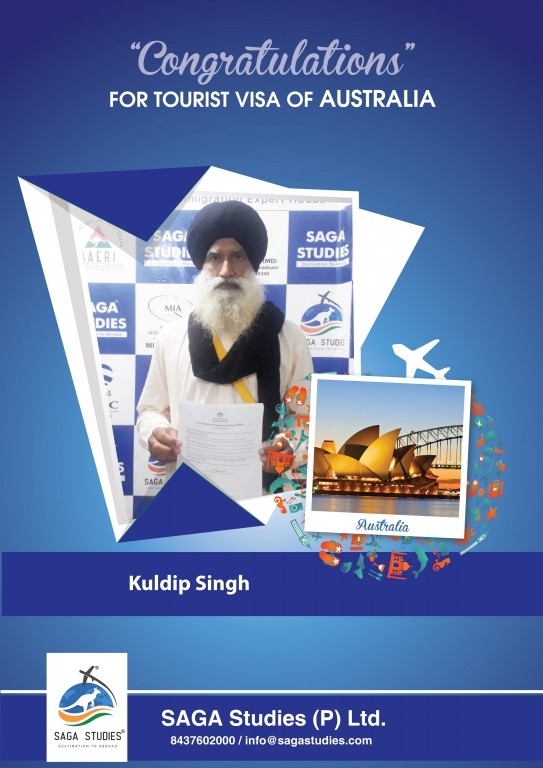 Congratulations Kuldip Singh. 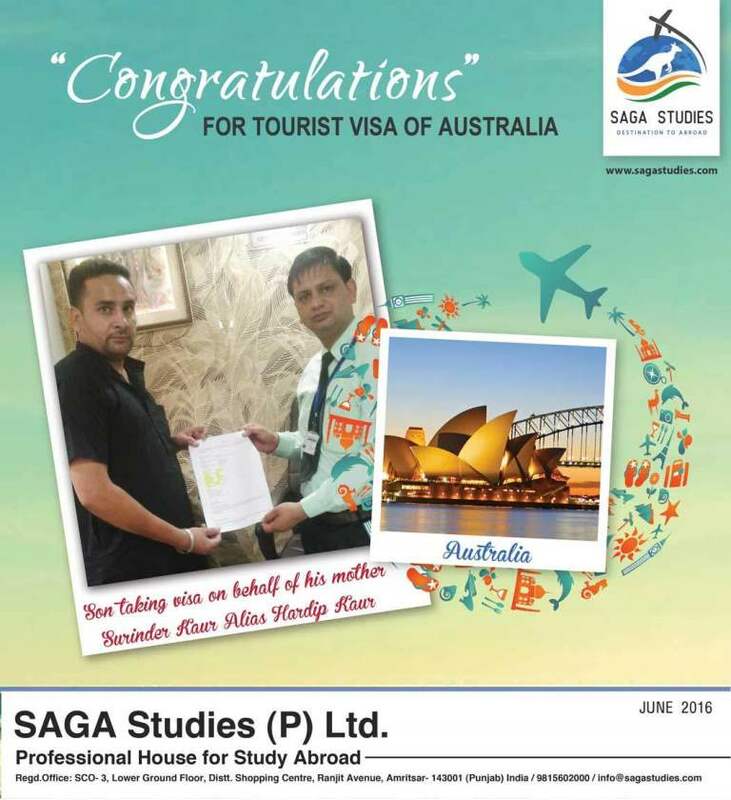 He got Tourist Visa of Australia. Congratulations Lakhbir Singh Gill & Rajwinder Kaur. They got Tourist Visa of Canada. 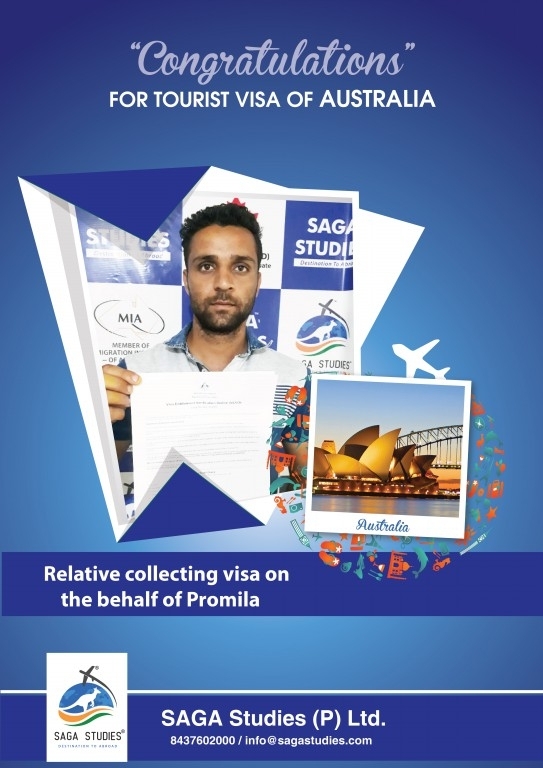 Congratulations Promila. She got Tourist Visa of Australia. Congratulations Resham Singh. He got Tourist Visa of Australia. 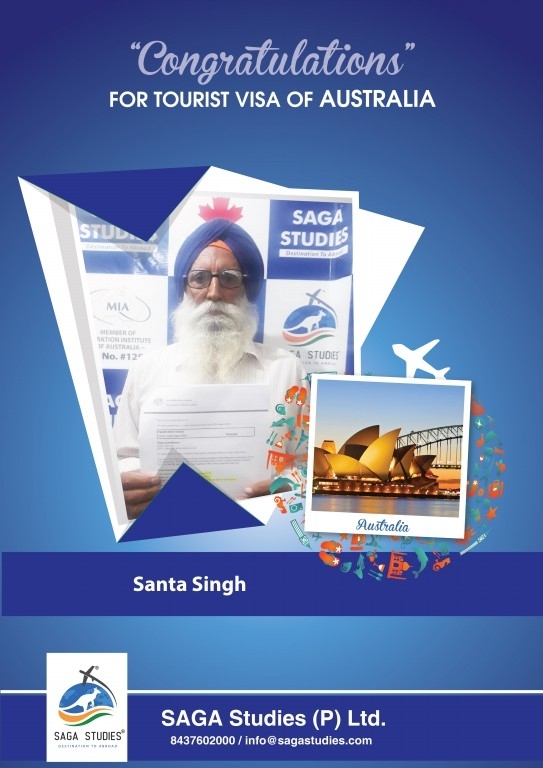 Congratulations Santa Singh. 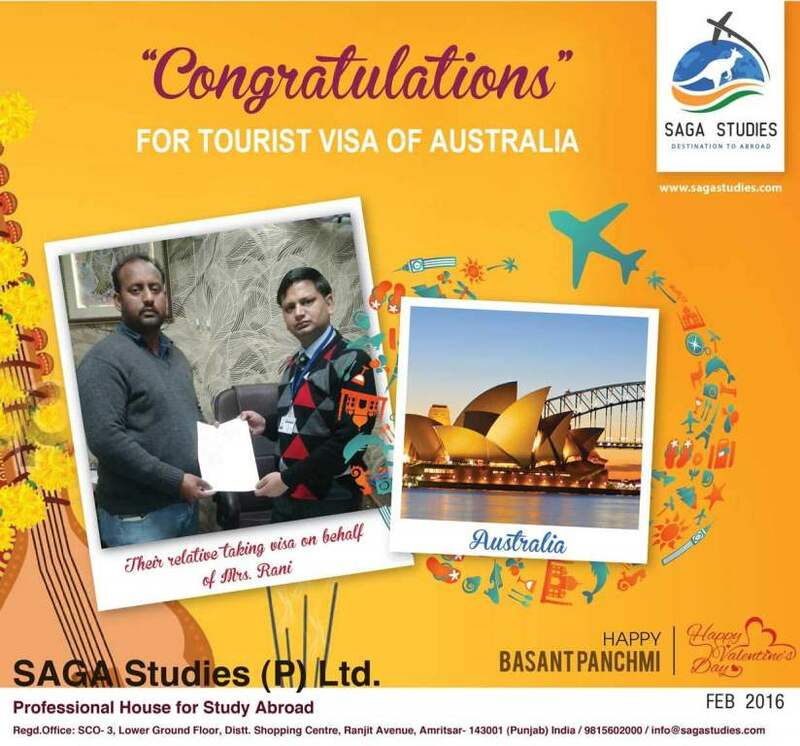 He got Tourist Visa of Australia. 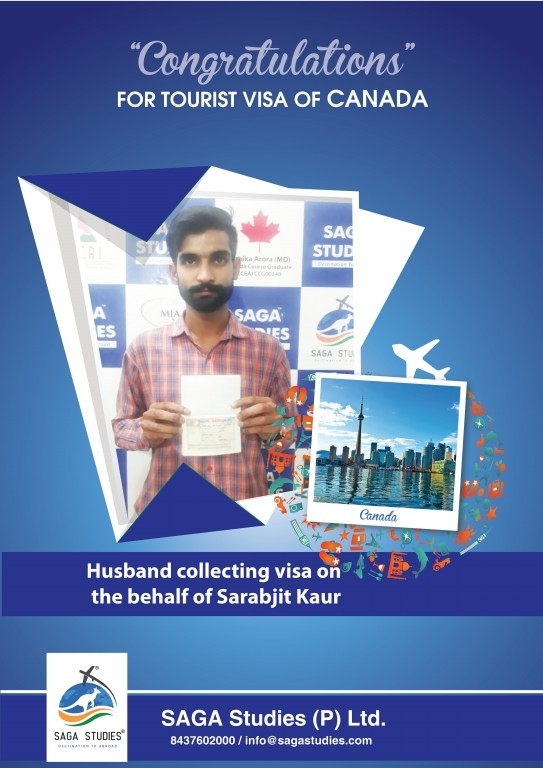 Congratulations Sarabjit Singh & Lakhwinder Kaur. They got Tourist Visa of Australia. 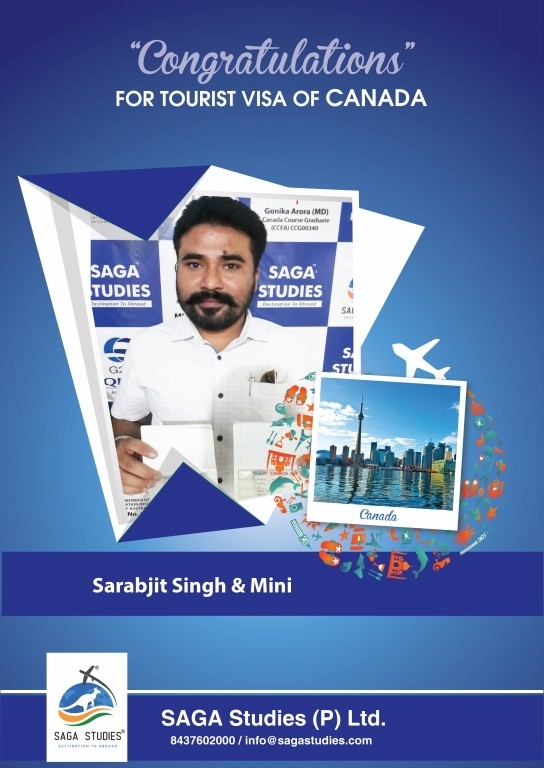 Congratulations Sarabjit Singh & Mini. They got Tourist Visa of Canada. 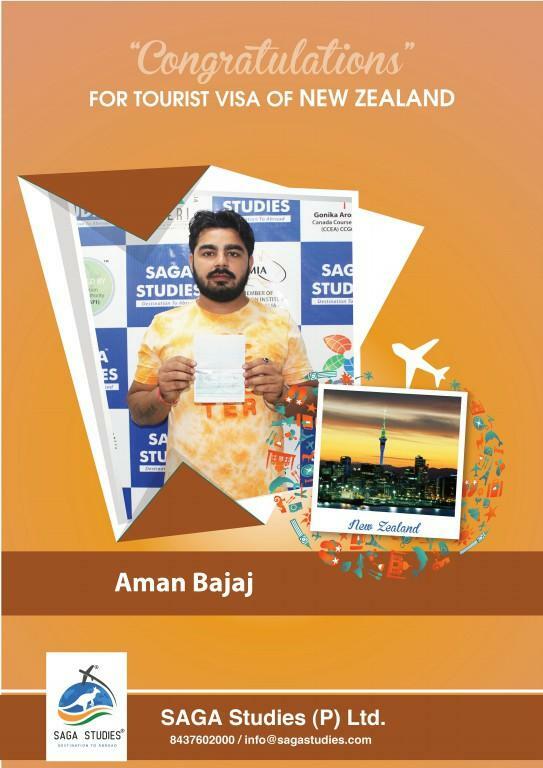 Congratulations Aman Bajaj. 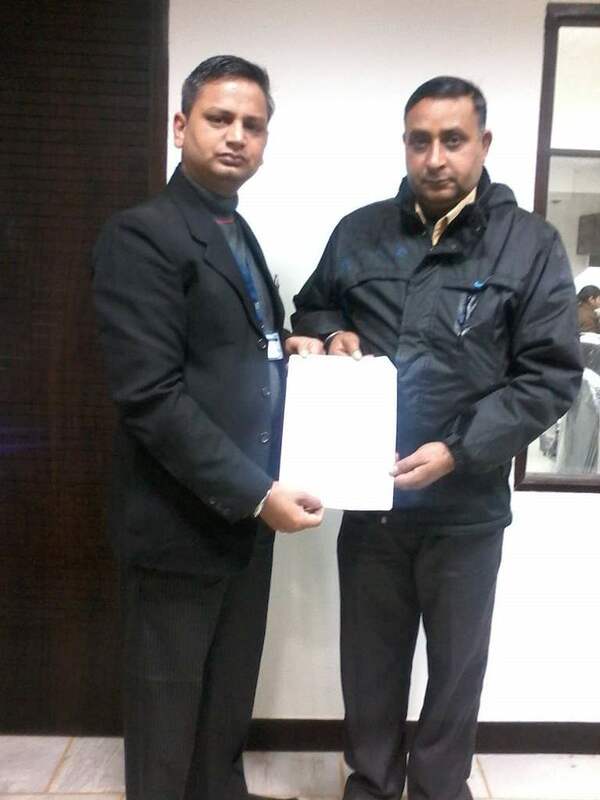 He got tourist visa of New Zealand. 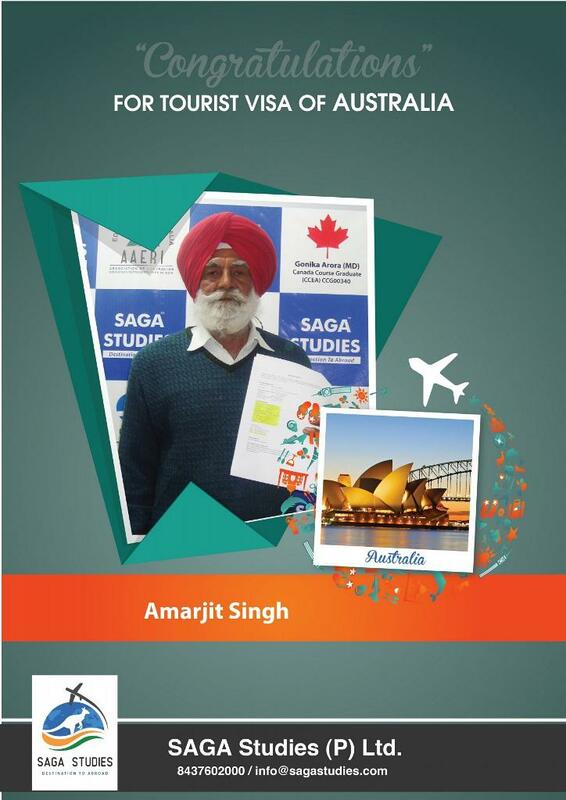 Congratulations Amarjit Singh. 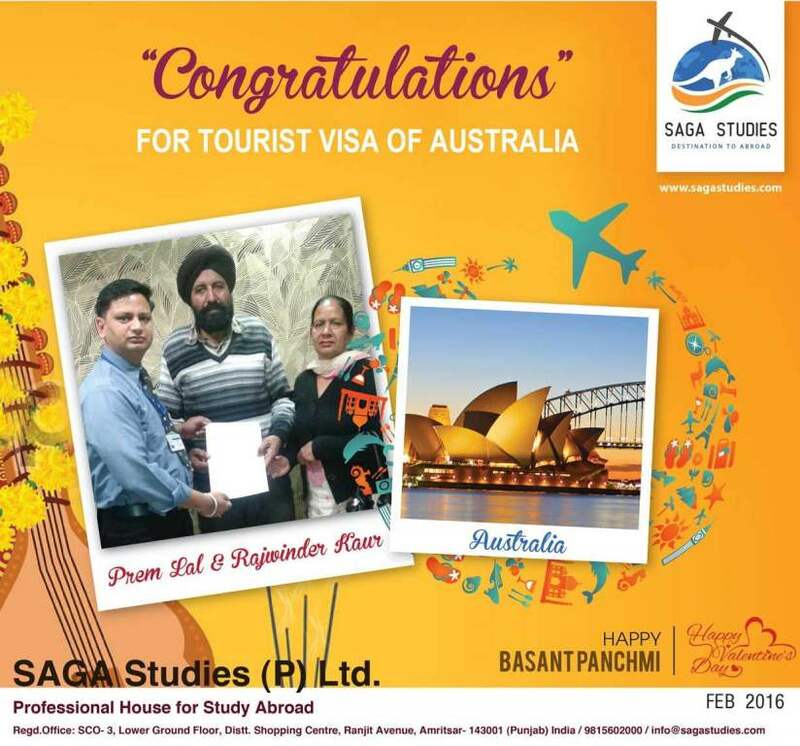 He got tourist visa of Australia. 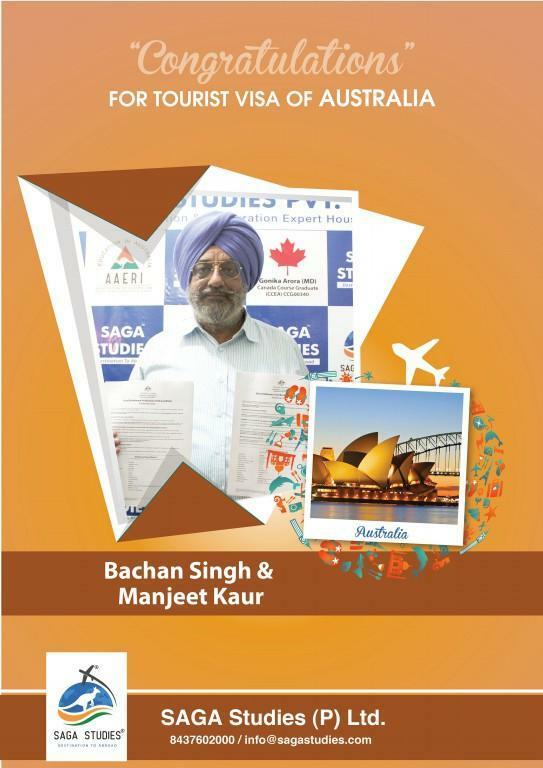 Congratulations Bachan Singh and Manjeet Kaur. They got tourist visa of Australia. 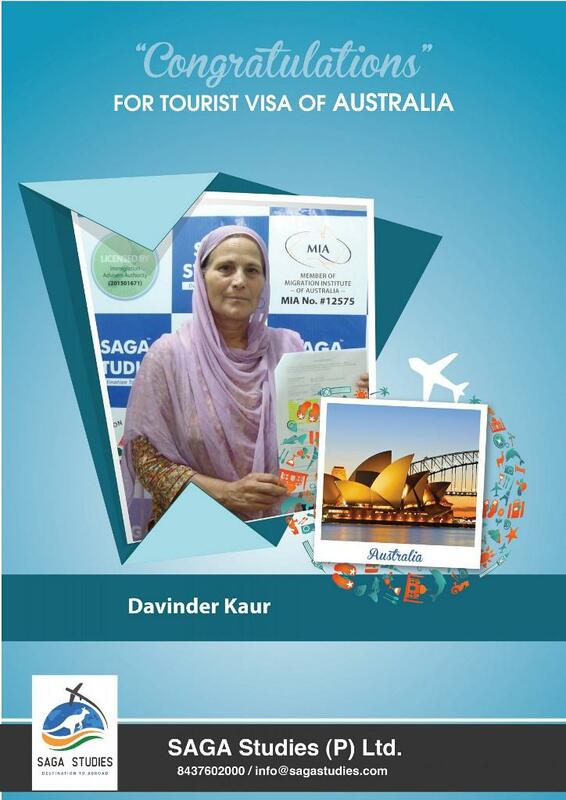 Congratulations Dalbir Kaur. 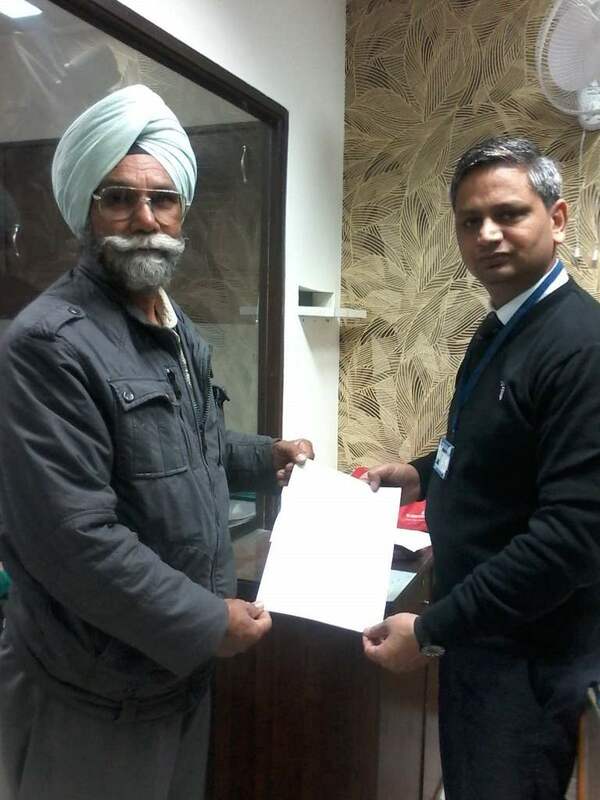 Her husband collecting tourist visa of Australia on the behalf of Dalbir Kaur. 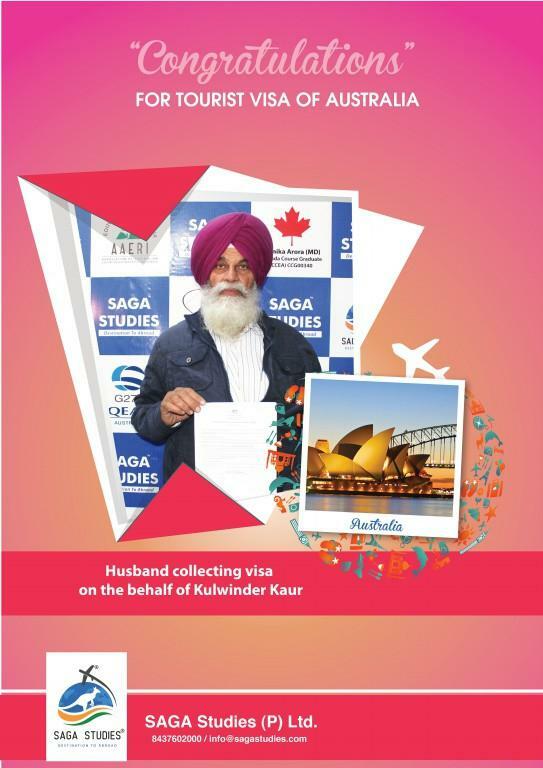 Congratulations Gurdev Singh and Kulwant Kaur. They got tourist visa of Australia. 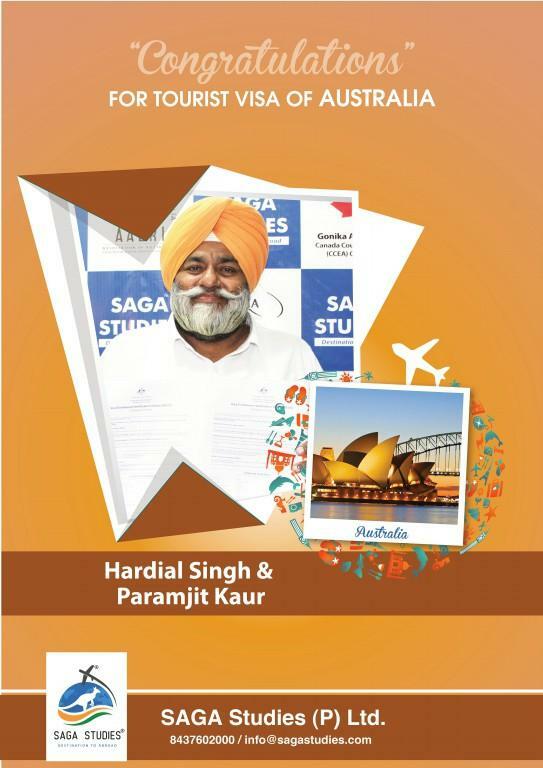 Congratulations Hardial Singh and Paramjit Kaur. They got tourist visa of Australia. 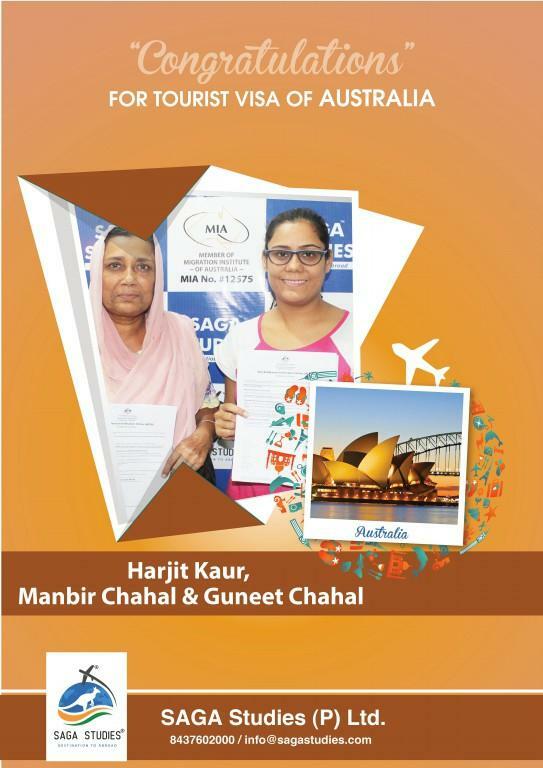 Congratulations Harjit Kaur, Manbir Chahal and Gurneet Chahal. They got tourist visa of Australia. 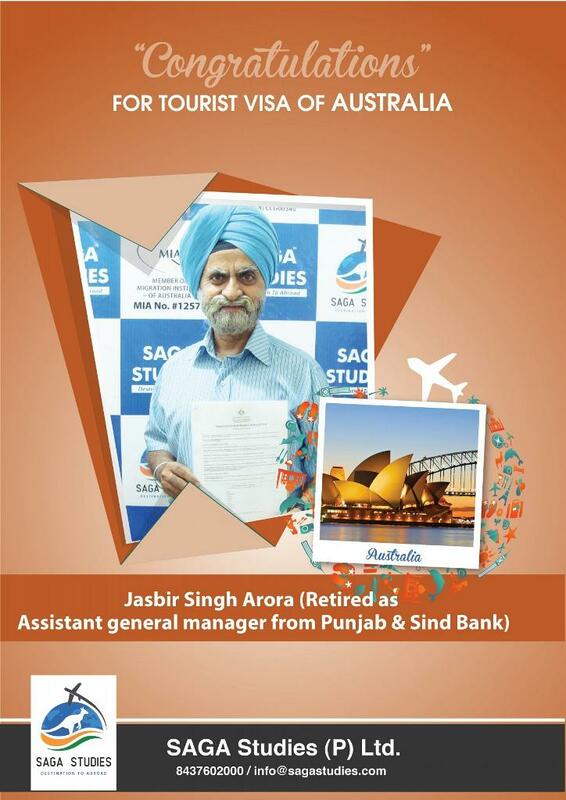 Congratulations Jasbir Singh. He got tourist visa of Australia. 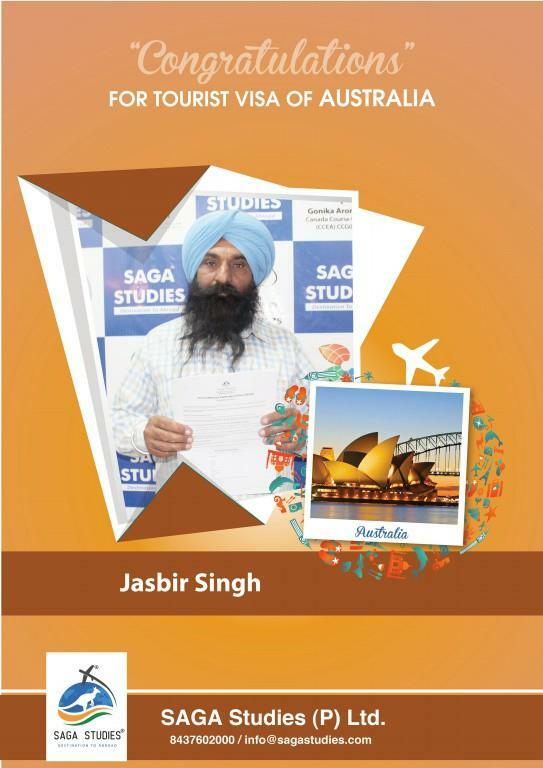 Congratulations Jasbir Singh. His wife collecting tourist visa of Canada on the behalf of Jasbir Singh. 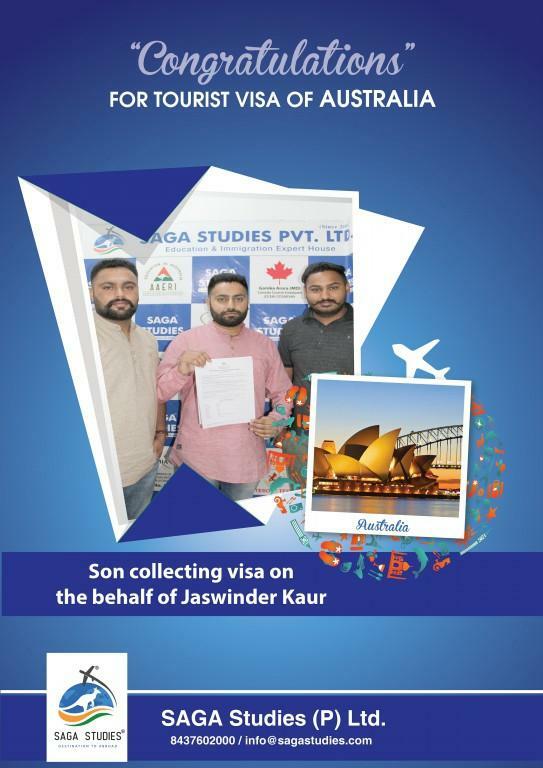 Congratulations Jaswnat Aulakh and Rajwant Aulakh. They got tourist visa of Australia. 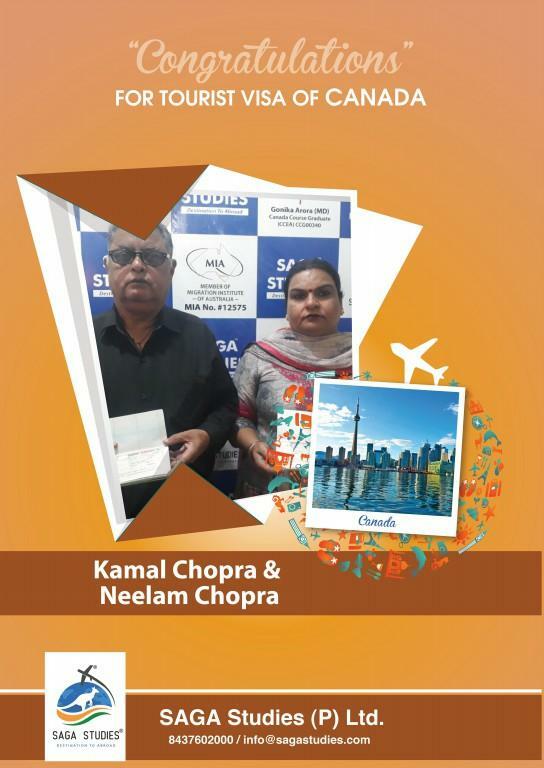 Congratulations Kamal Chopra and Neelam Chopra. They got tourist visa of Canada. Congratulations Kulwant Singh and Poonam. They got tourist visa of Canada. 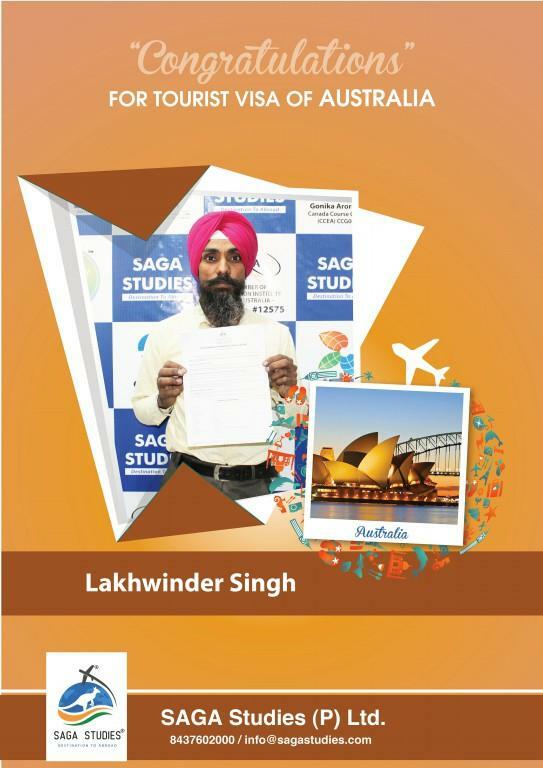 Congratulations Lakhwinder Singh. He got tourist visa of Australia. 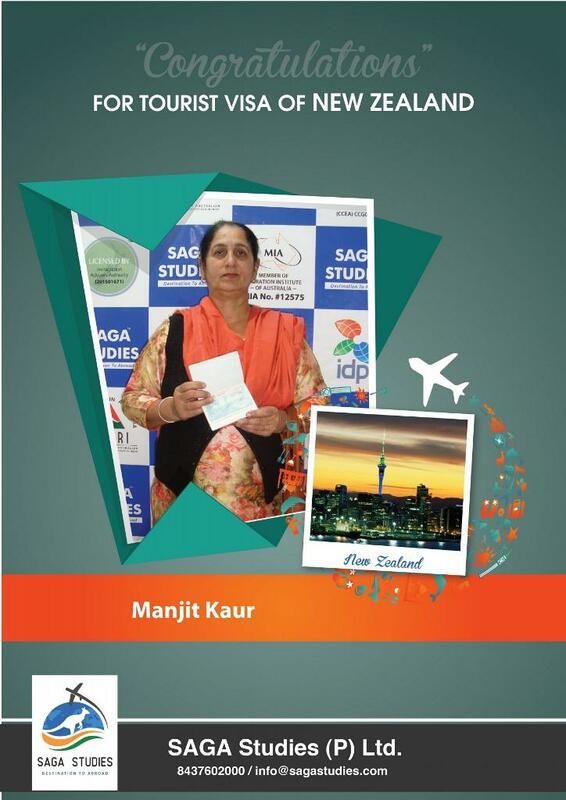 Congratulations Manjit Kaur. 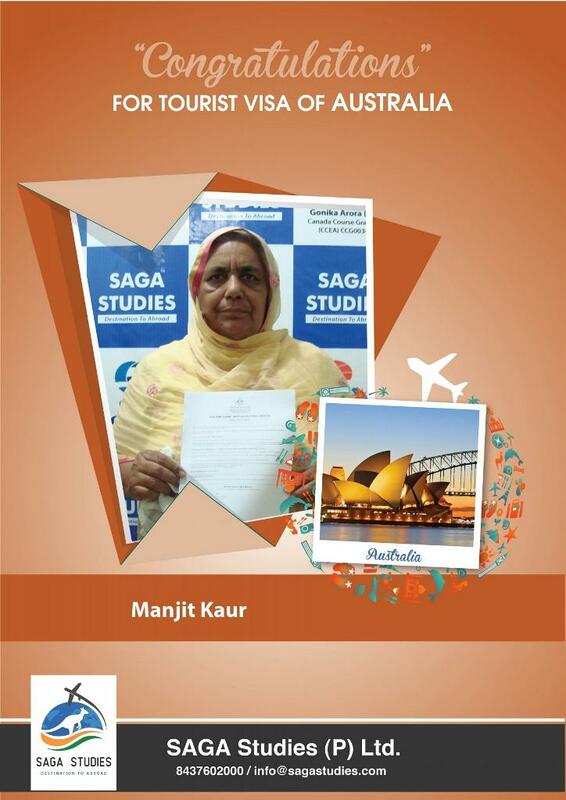 Her Relative collecting tourist visa of Australia on the behalf of Manjit Kaur. 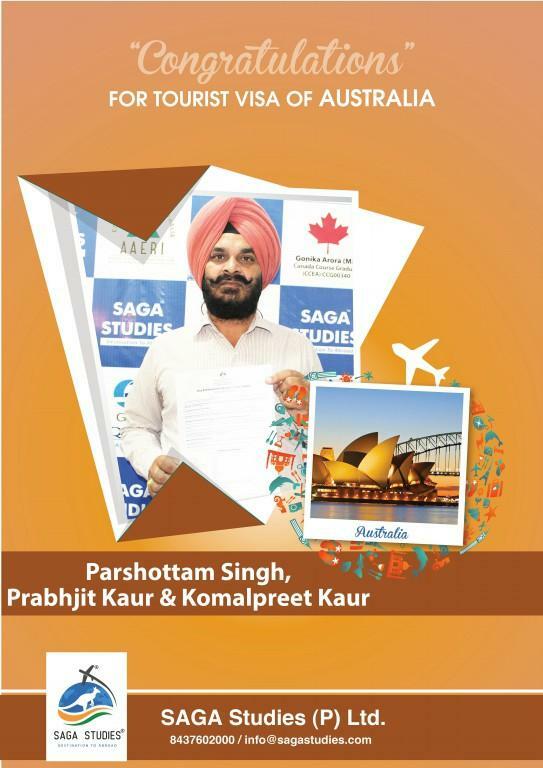 Congratulations Parshottam Singh, Prabhjit Kaur and Komalpreet Kaur. They got tourist visa of Australia. 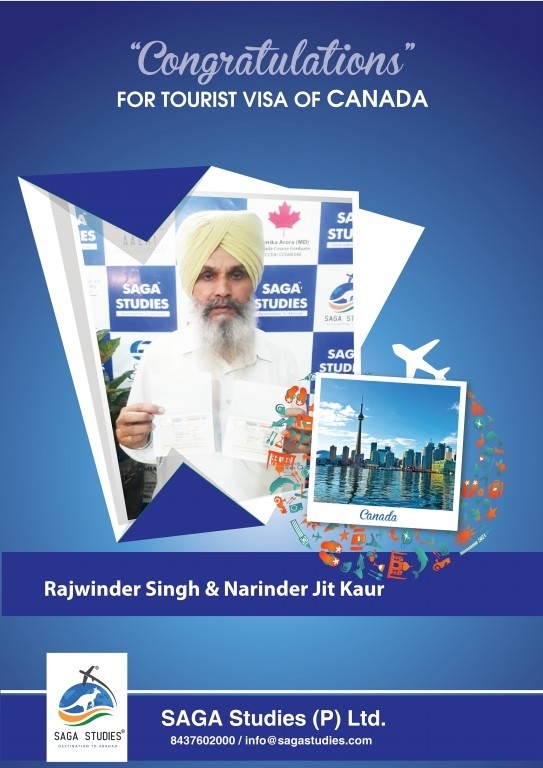 Congratulations Rajinder Singh and Rajwinder kaur. They got tourist visa of Australia. 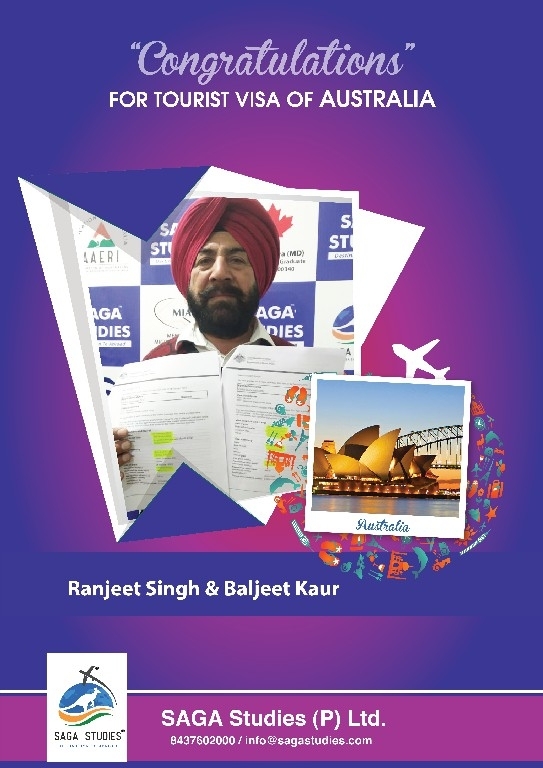 Congratulations Ram singh and Harjinder Kaur. They got tourist visa of Australia. 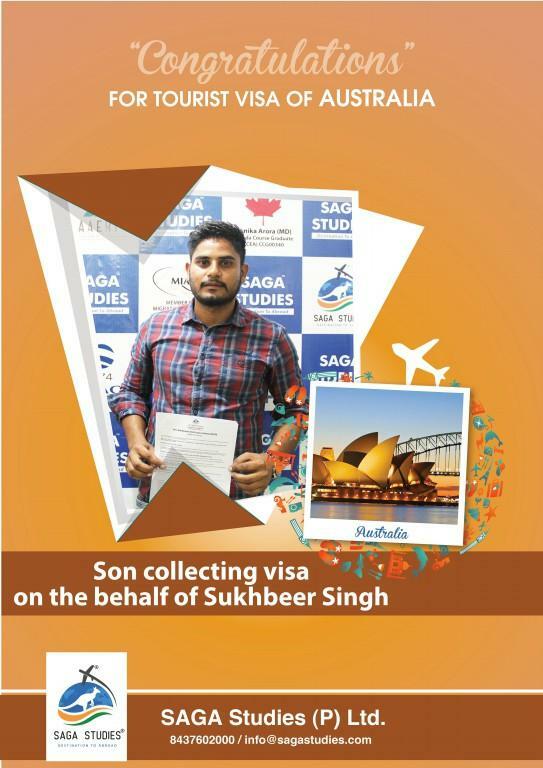 Congratulations Sukhbeer Singh. 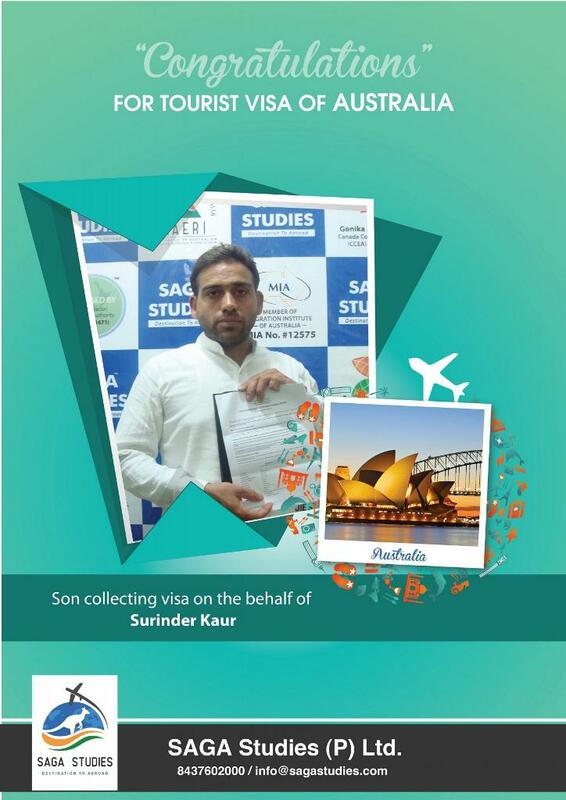 His son collecting tourist visa of Australia on the behalf of Sukhbeer Singh. Congratulations Sukhdev Kaur and Gurchet Singh. They got tourist visa of Australia. Congratulations Sunita. 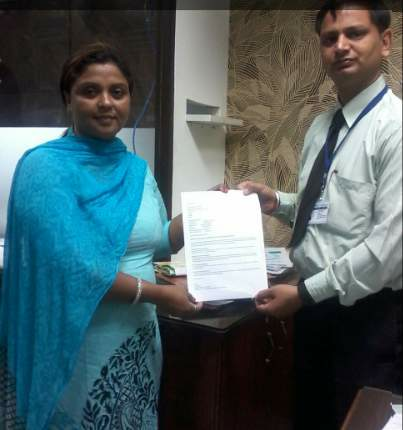 Her relative collecting tourist visa of Australia on the behalf of Sunita. 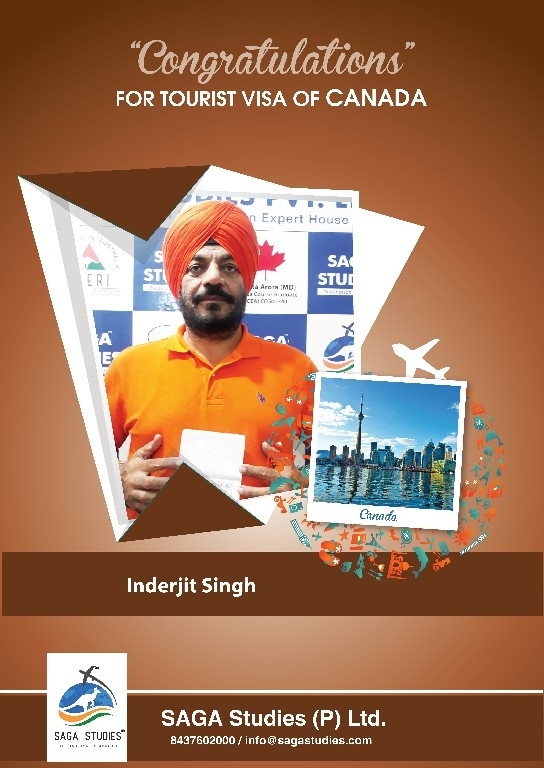 Congratulations Surinderjit Singh. He got tourist visa of Australia. 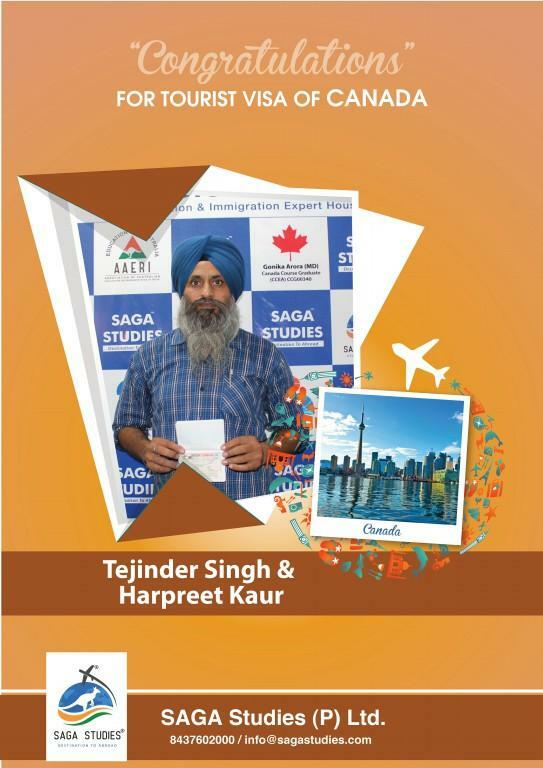 Congratulations Tejinder Singh and Harpreet Kaur. They got tourist visa of Canada. 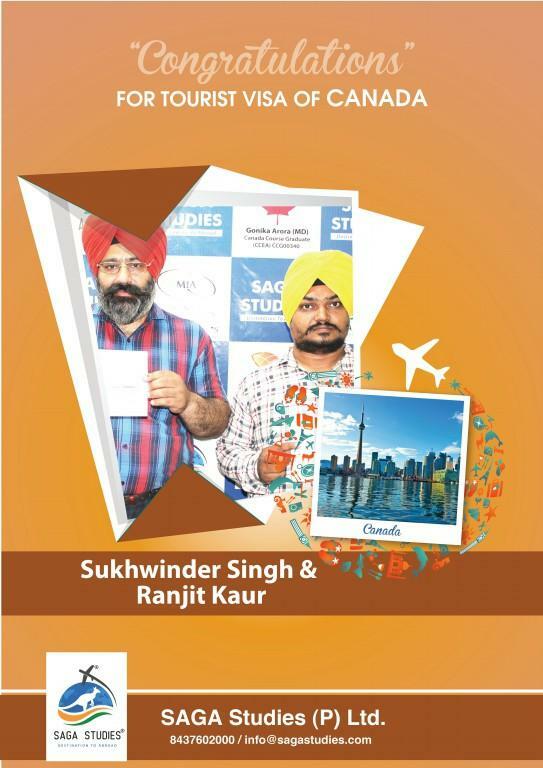 Congratulations Sukhwinder Singh and Ranjit Kaur. They got tourist visa of Canada. Congratulations Prabhjot Kaur. 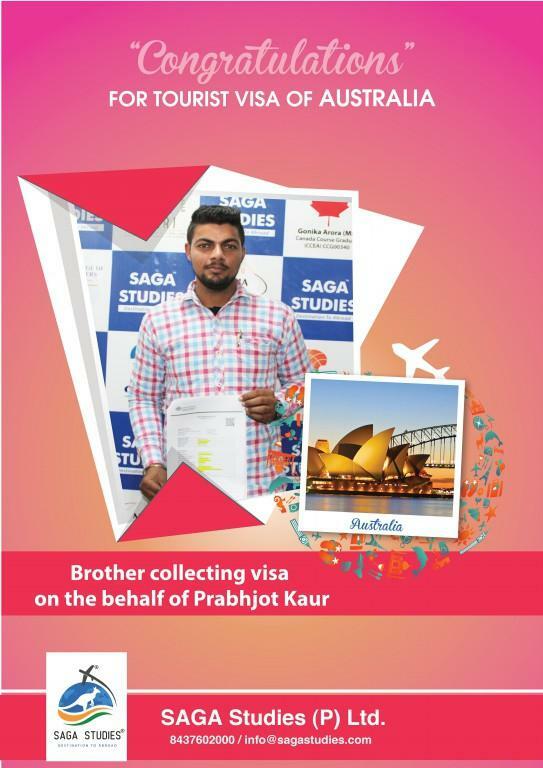 Her Brother collecting tourist visa of Australia on the behalf of Prabhjot Kaur. 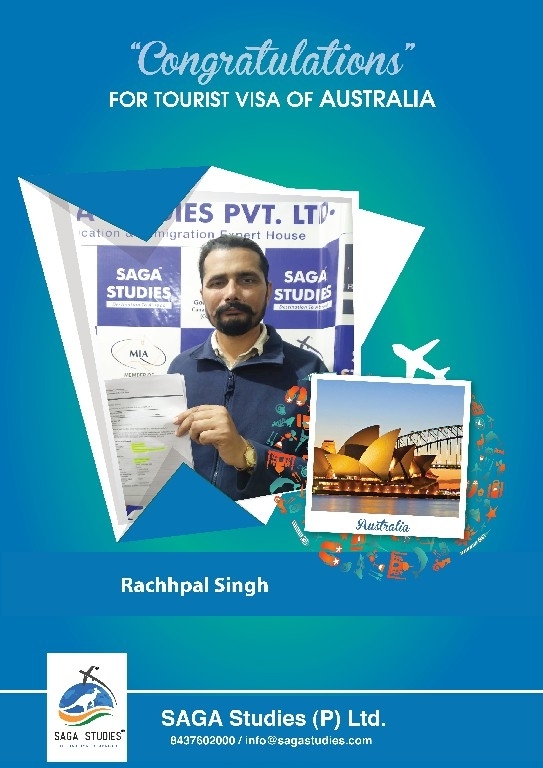 Congratulations Rachhpal Singh. 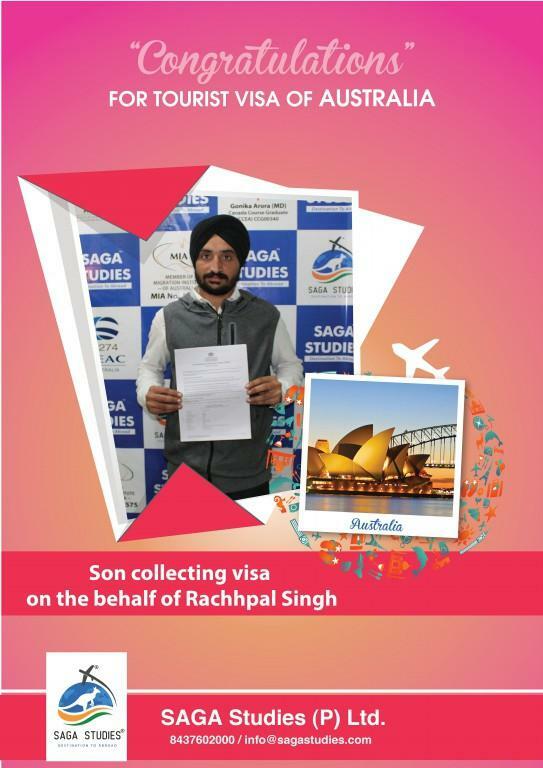 His Son collecting tourist visa of Australia on the behalf of Rachhpal Singh. 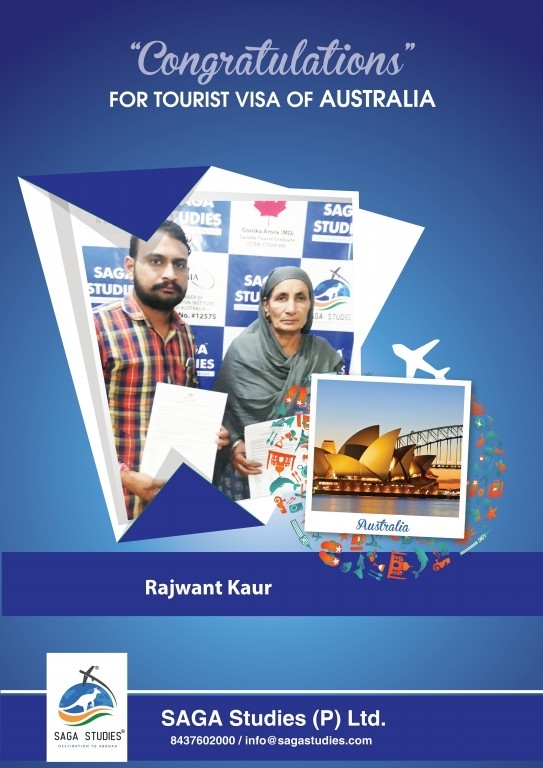 Congratulations Rajwant Kaur. 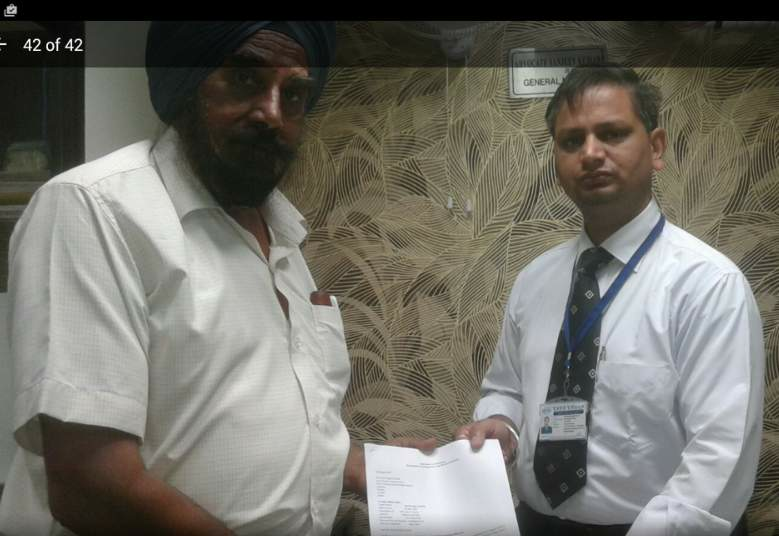 Her husband collecting tourist visa of Australia on the behalf of Rajwant Kaur. Congratulations Sarbinder Kaur. She got tourist visa of Australia. 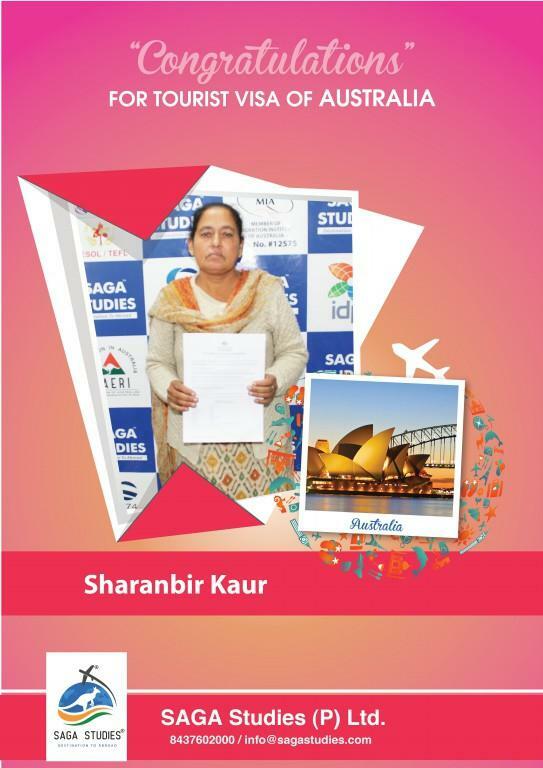 Congratulations Sharanbir Kaur. She got tourist visa of Australia. Congratulations Shubham and Neena Kumari. They got tourist visa of Australia. 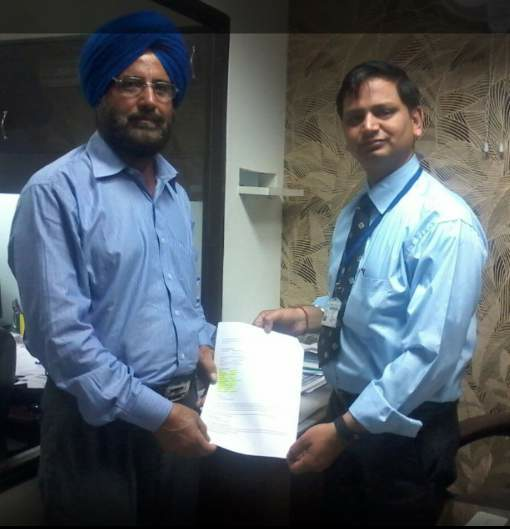 Congratulations Simarjit Kaur. 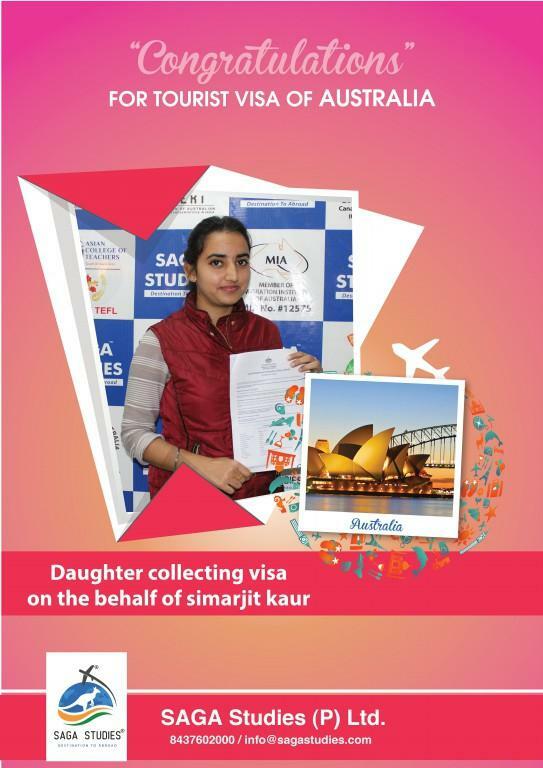 Her daughter collecting tourist visa of Australia on the behalf of Simarjit Kaur. 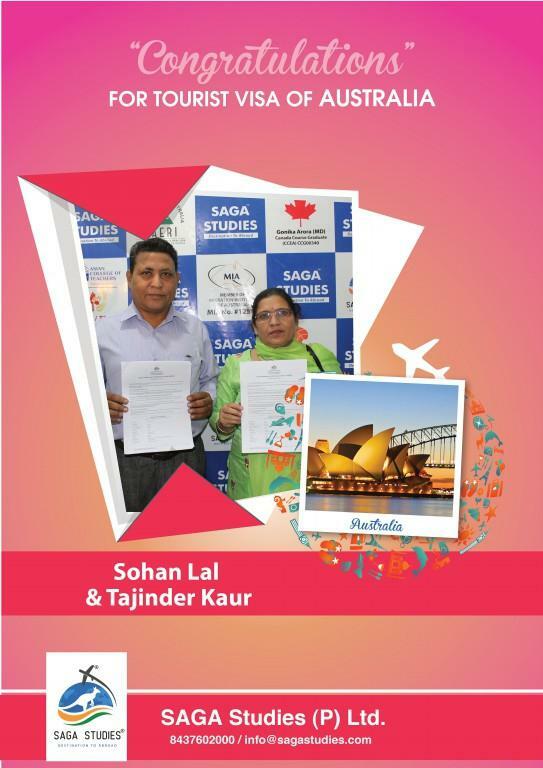 Congratulations Sohan Lal and Tajinder kaur. They got tourist visa of Australia. 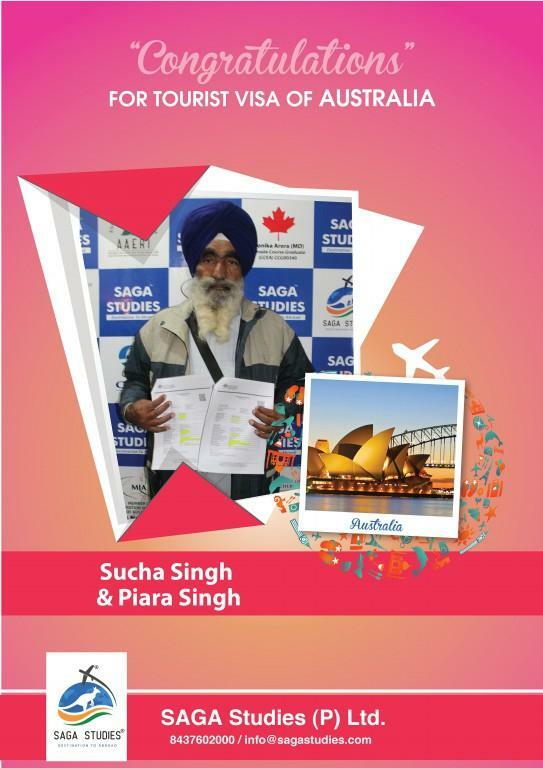 Congratulations Sucha Singh and Piara Singh. They got tourist visa of Australia. Congratulations Sukhbal Singh and Harjans kaur. 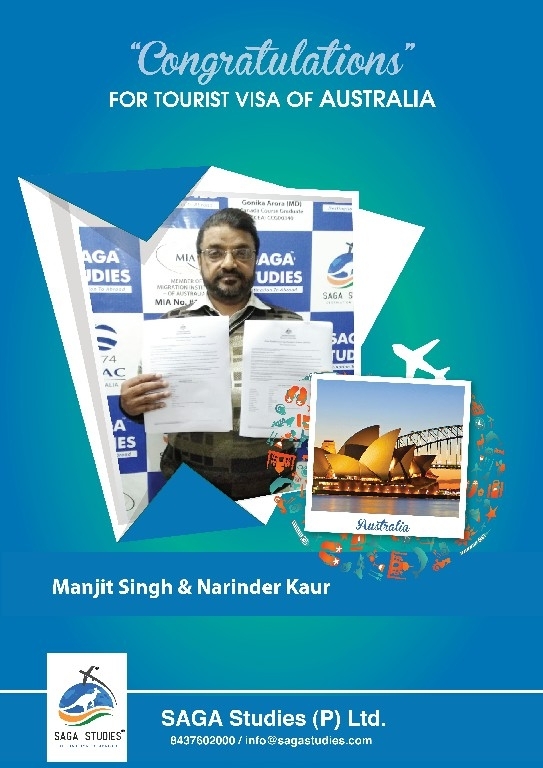 They got tourist visa of Australia. 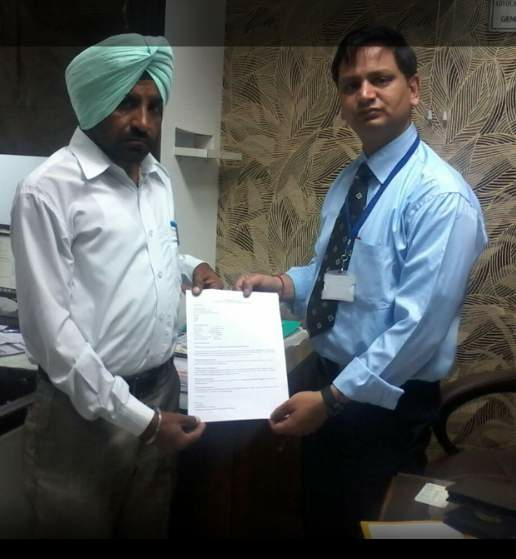 Congratulations Sukhchain Singh and Guriqbal Singh. They got tourist visa of Australia. 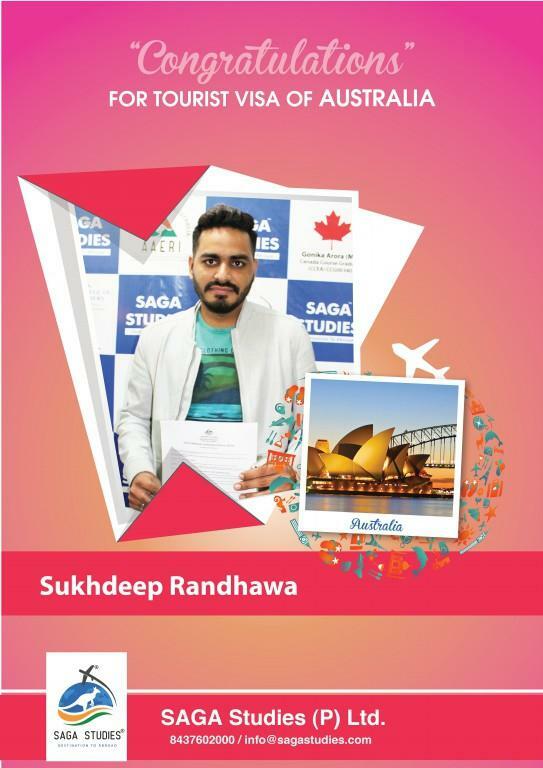 Congratulations Sukhdeep Randhawa. He got tourist visa of Australia. 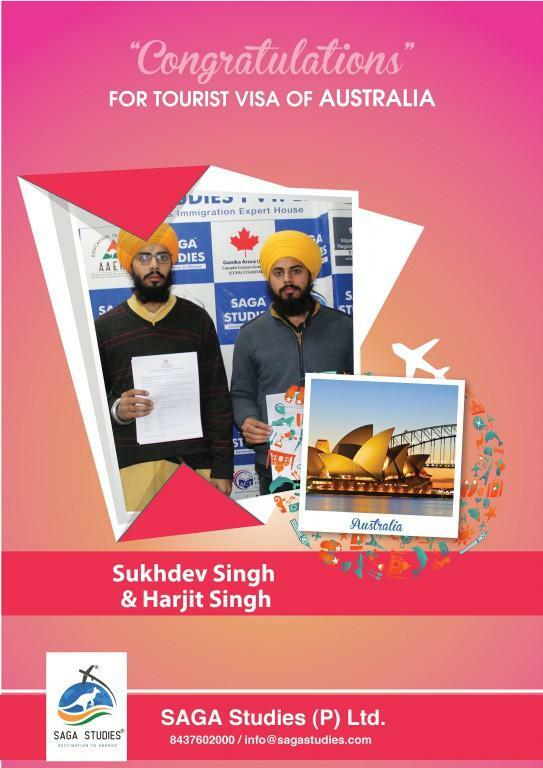 Congratulations Sukhdev Singh and Harjit Singh. 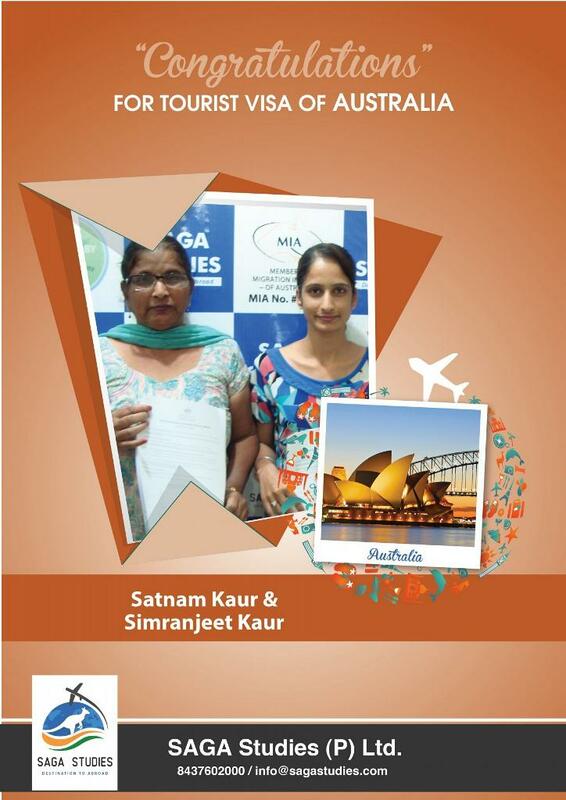 They got tourist visa of Australia. 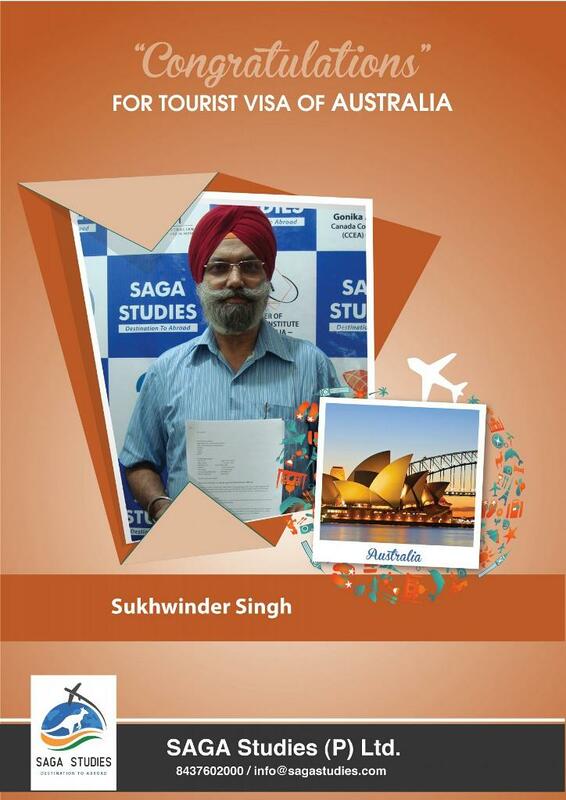 Congratulations Sukhdev Singh. He got tourist visa of Canada. 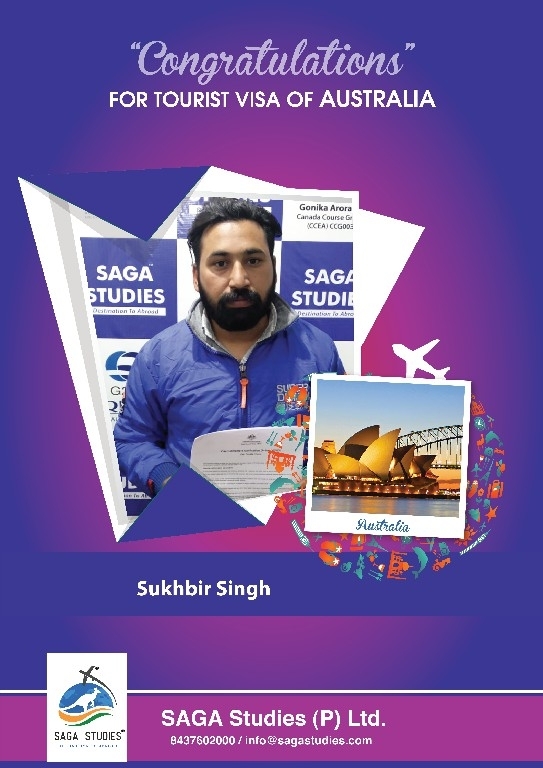 Congratulations Sukhdev Singh. 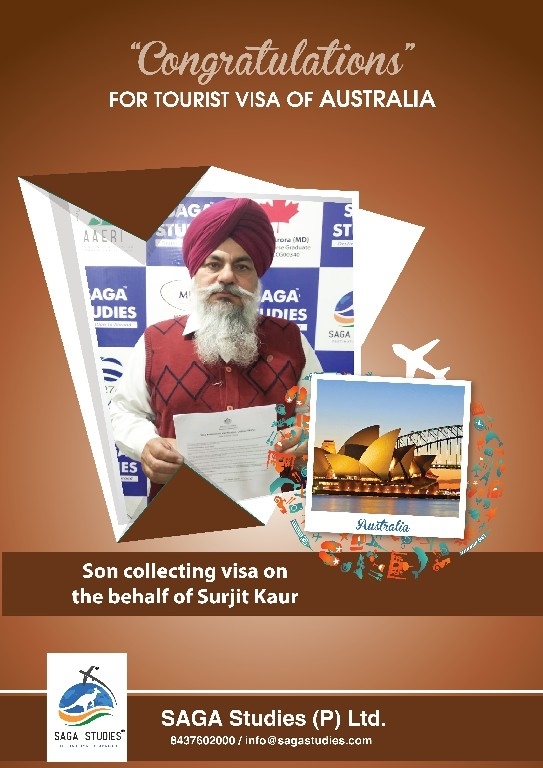 His son collecting tourist visa of Australia on the behalf of Sukhdev Singh. 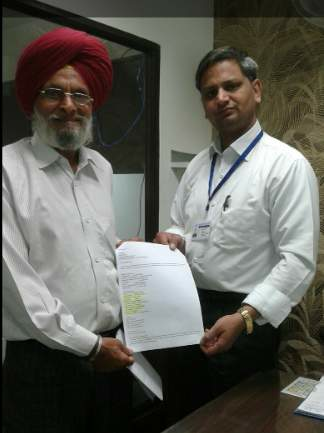 Congratulations Surat Singh. 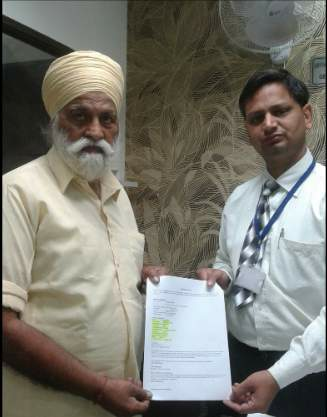 His son collecting tourist visa of Australia on the behalf of Surat Singh. 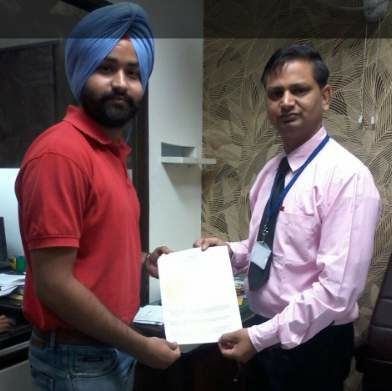 Congratulations Swaran Singh. 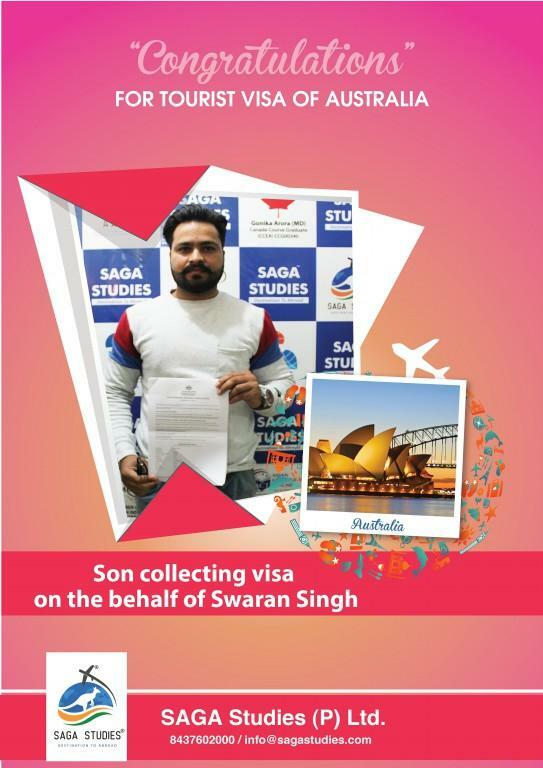 His son collecting tourist visa of Australia on the behalf of Swaran Singh. 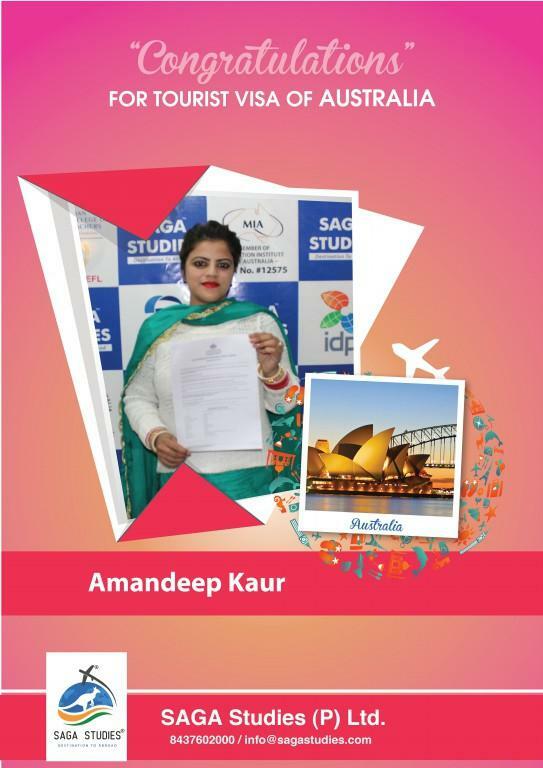 Congratulations Amandeep Kaur. She got tourist visa of Australia. 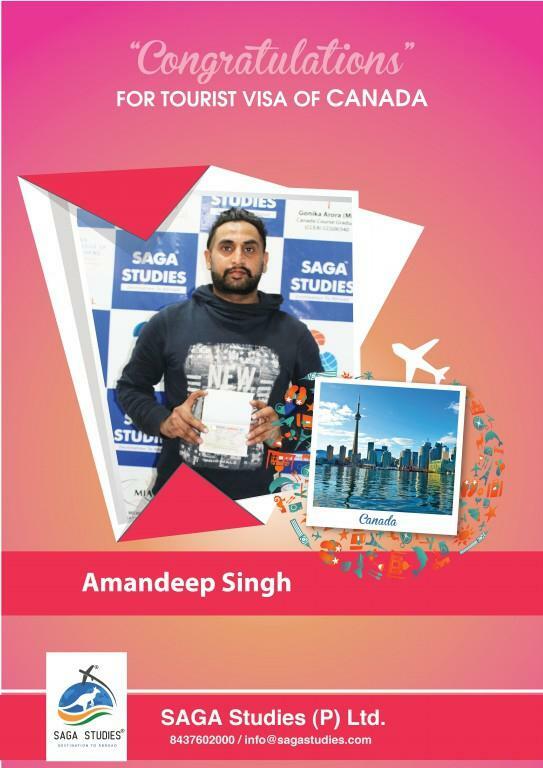 Congratulations Amandeep Singh. He got tourist visa of Canada. 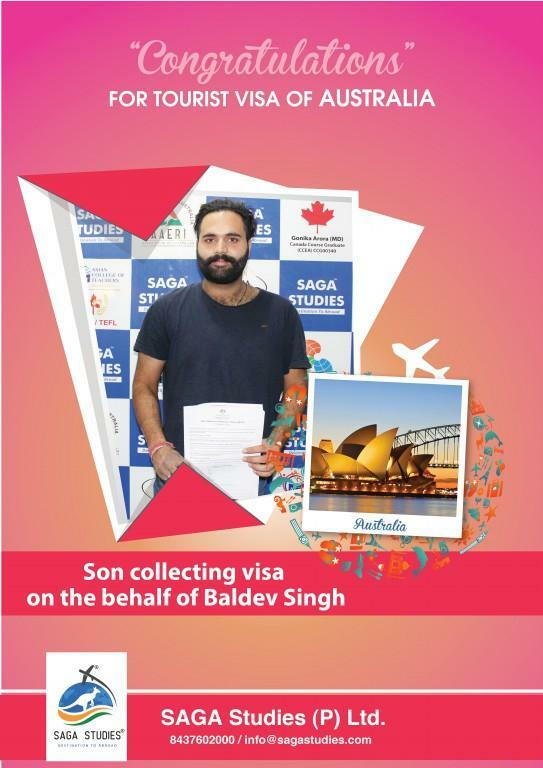 Congratulations Baldev Singh. 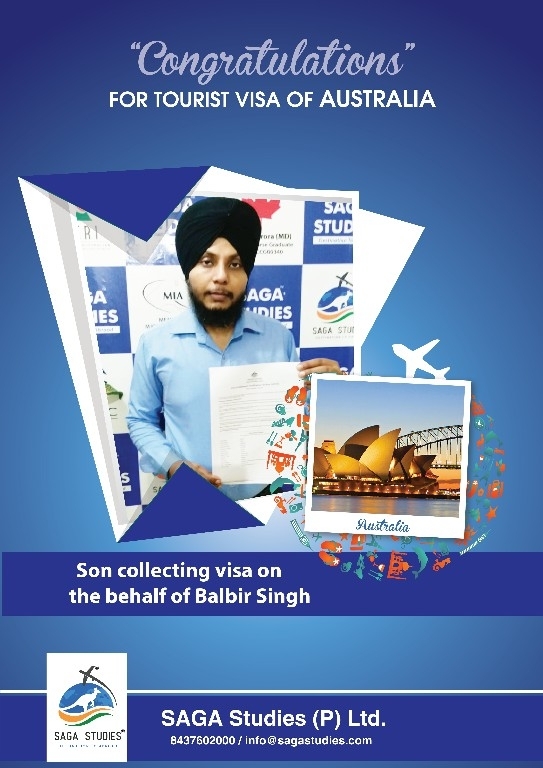 His son collecting tourist visa of Australia on the behalf of Baldev Singh. 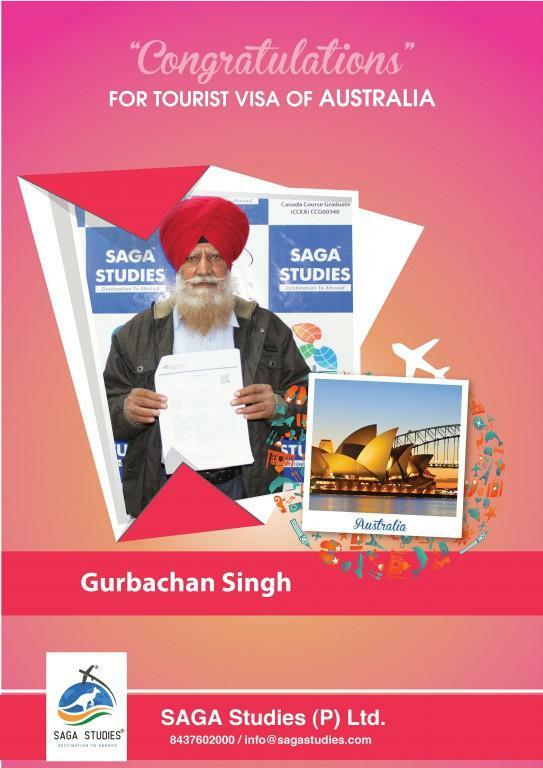 Congratulations Gurbachan Singh. 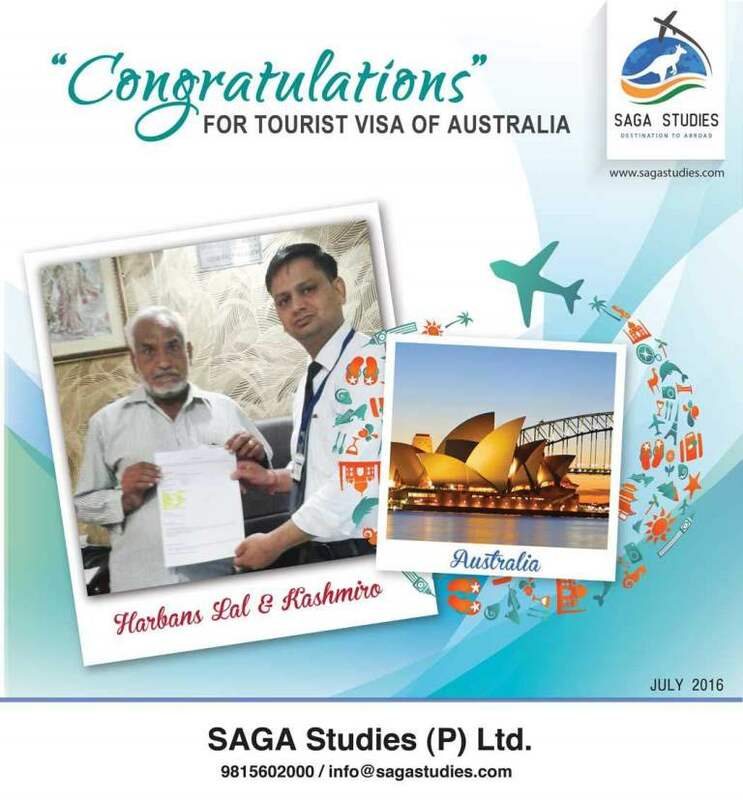 He got tourist visa of Australia. 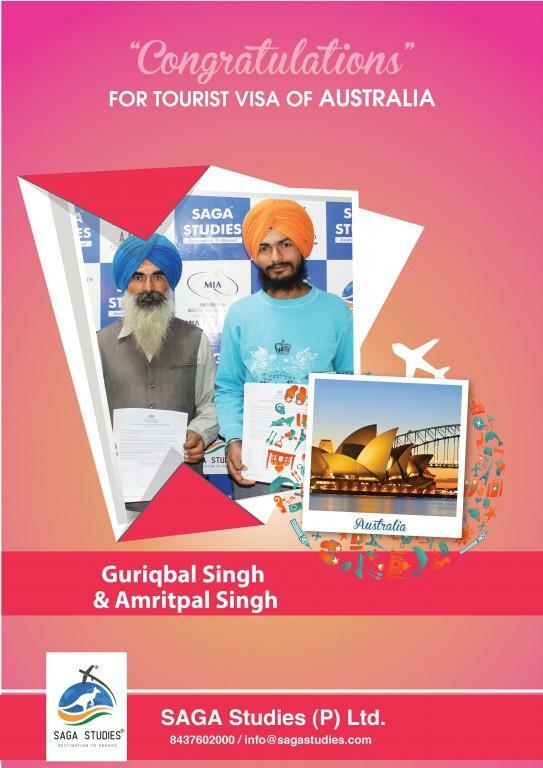 Congratulations Guriqbal Singh and Amritpal Singh. They got tourist visa of Australia. 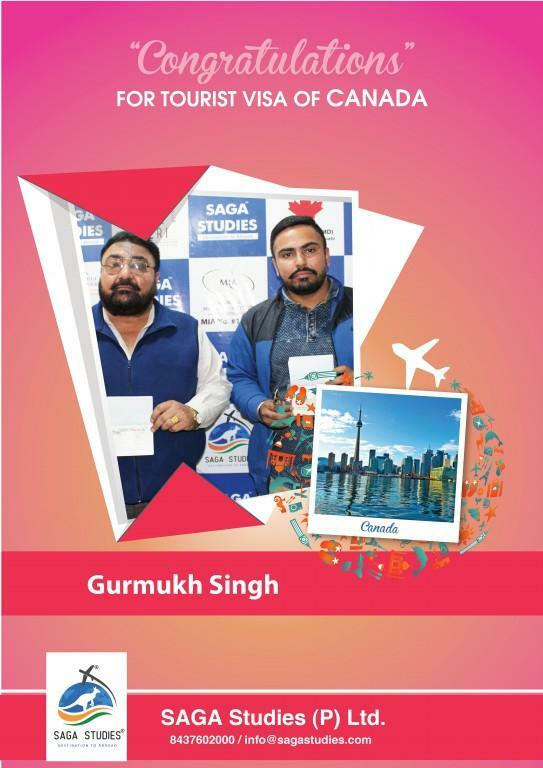 Congratulations Gurmukh Singh. He got tourist visa of Canada. 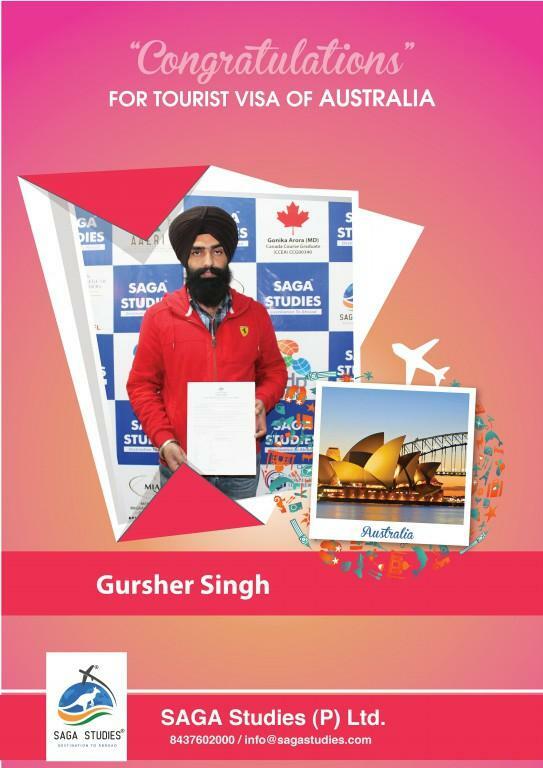 Congratulations Gursher Singh. 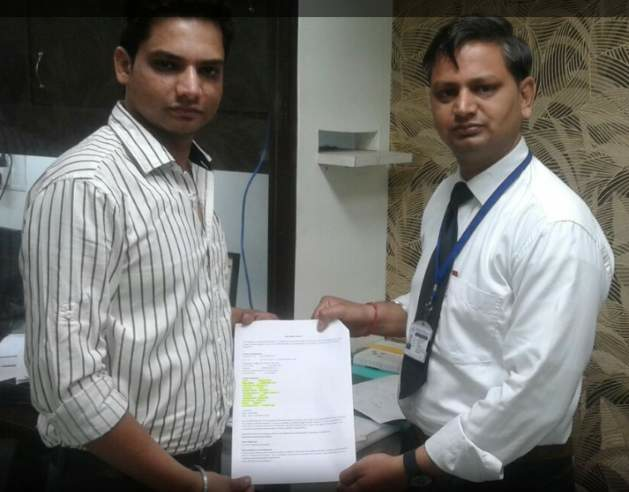 He got tourist visa of Australia. Congratulations Gurvinder Kaur. She got tourist visa of Australia. 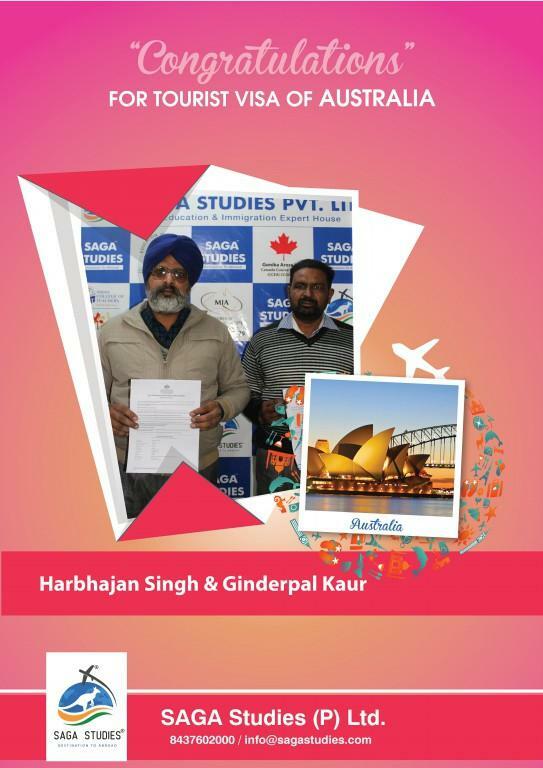 Congratulations Harcharan Singh and Gurjit Kaur. They got tourist visa of Australia. 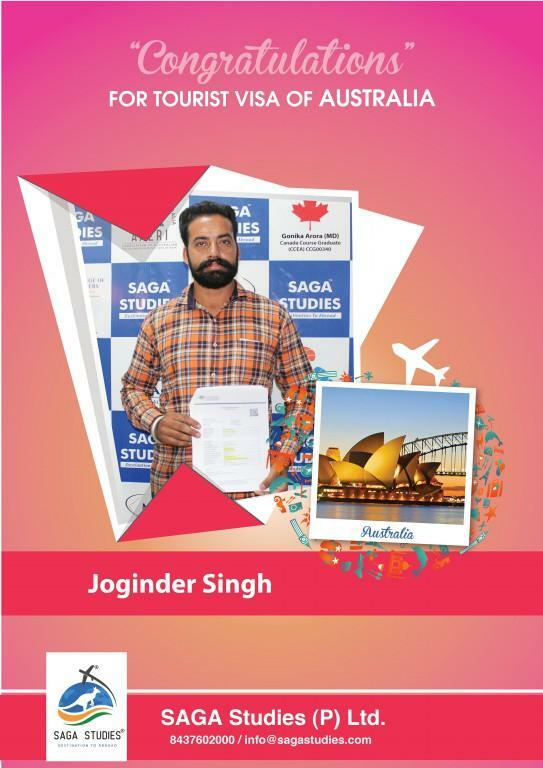 Congratulations Joginder Singh. 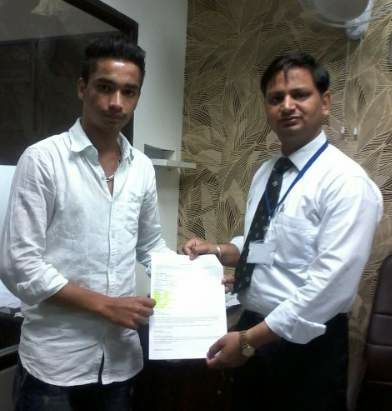 He got tourist visa of Australia. 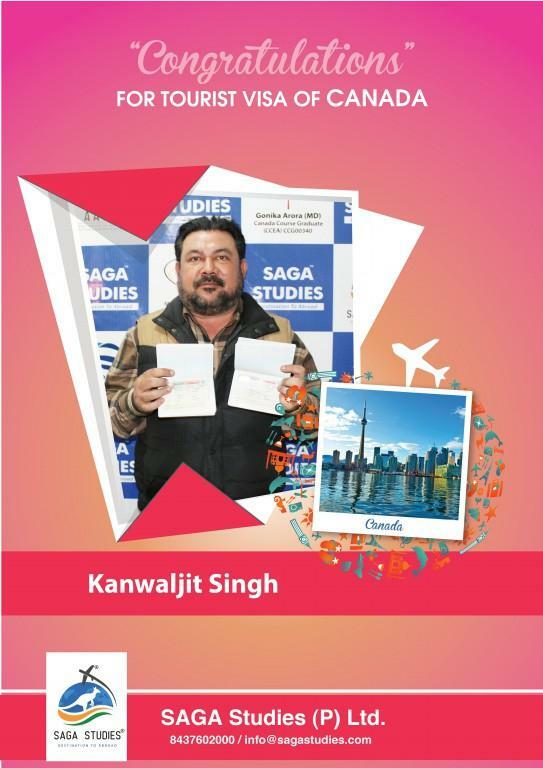 Congratulations Kanwaljit Singh. He got tourist visa of Canada. Congratulations Kuldeep Kaur. She got tourist visa of Australia. Congratulations Kulwinder Kaur and Sumeet Dhillon. 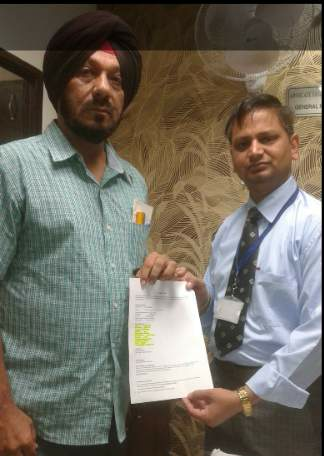 Their husband/father collecting tourist visa of Australia on the behalf of Kulwinder Kaur and Sumeet Dhillon. Congratulations Manjeet Singh. He got tourist visa of Australia. 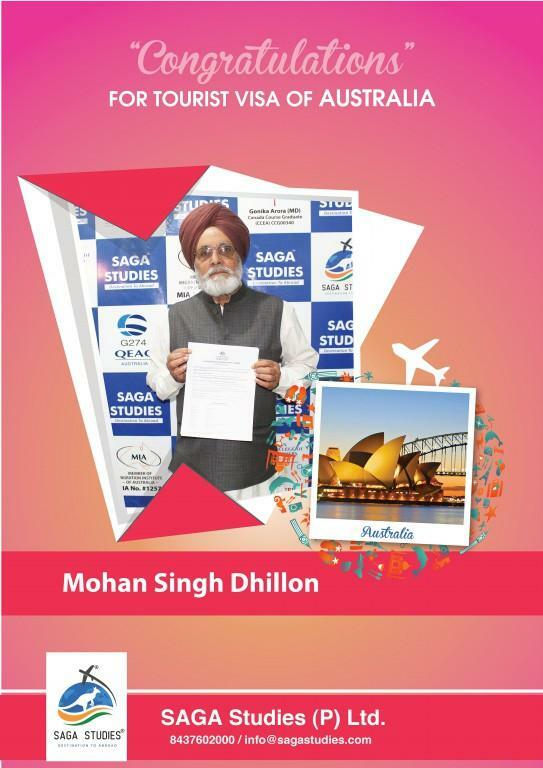 Congratulations Mohan Singh Dhillon. He got tourist visa of Australia. Congratulations Pargat Singh Maan and Satnam Kaur. 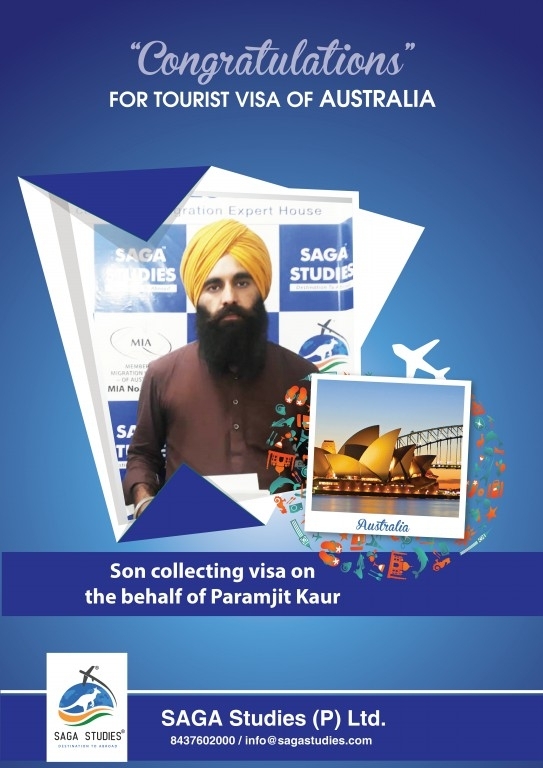 Their Son collecting tourist visa of Australia on the behalf of Pargat Singh Maan and Satnam Kaur. 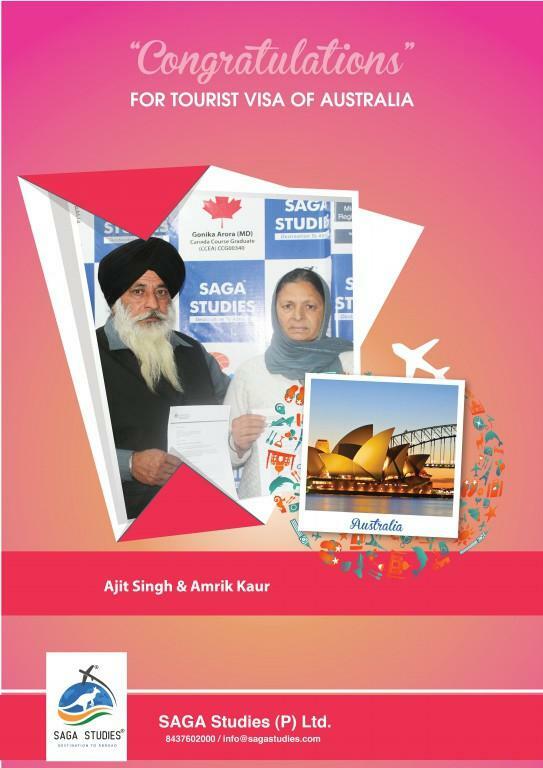 Congratulations to Ajit Singh and Amrik Kaur for getting Tourist Visa of Australia. 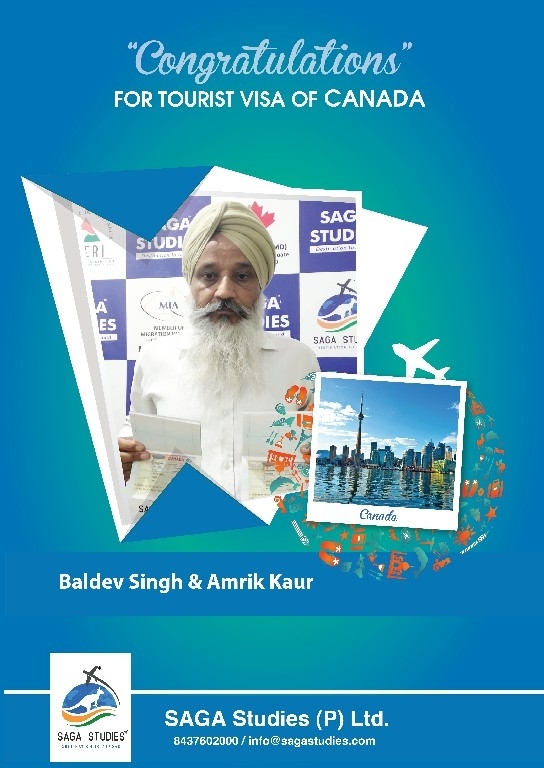 Congratulations to Bakhshish Singh and Amarjit Kaur for getting Tourist Visa of Canada. 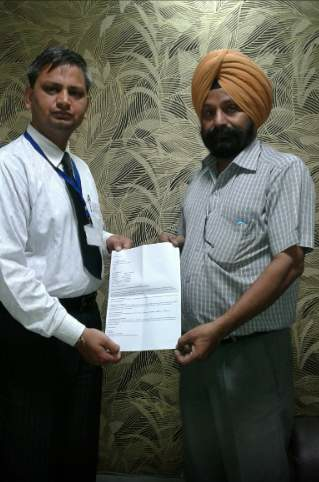 Congratulations to Balwinder Singh for getting Study Visa of United Kingdom(UK). 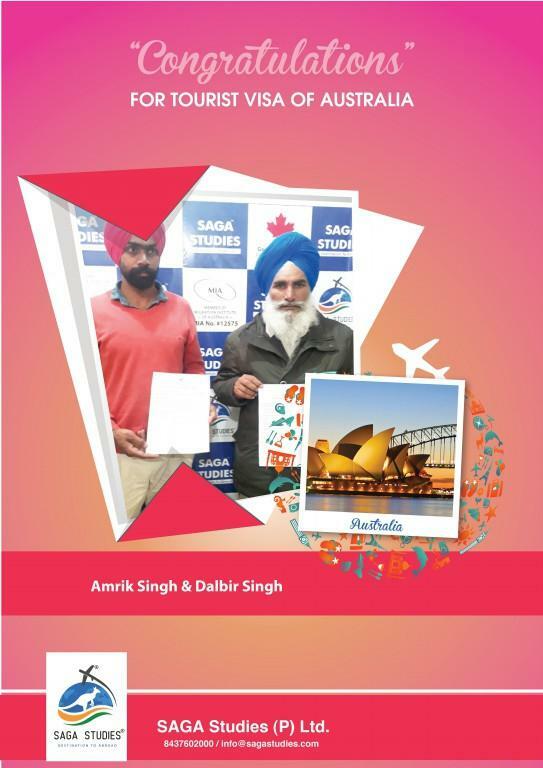 Congratulations to Amrik Singh and Dalbir Singh for getting Tourist Visa of Australia . Congratulations to Asha Rani for getting Tourist Visa of Australia . Congratulations Bachan Singh. 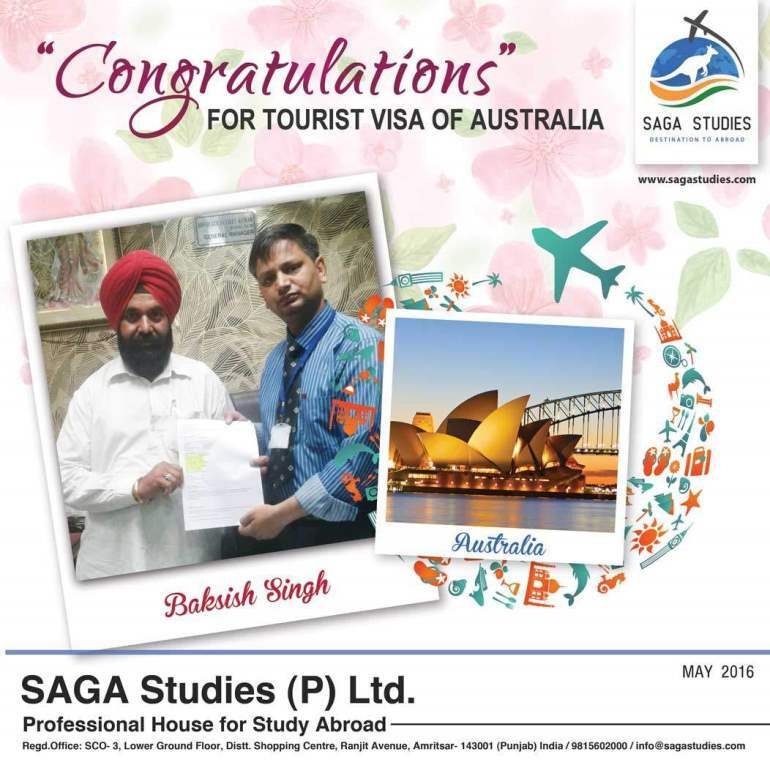 He got tourist visa of Australia. 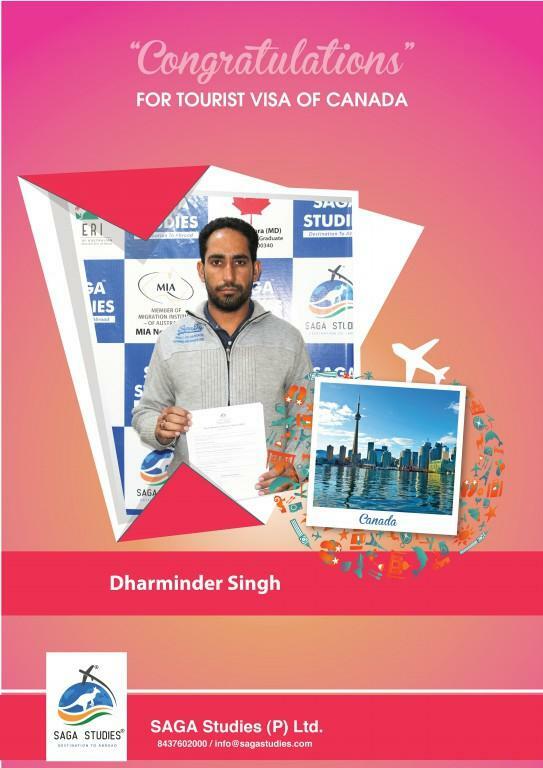 Congratulations Dharminder Singh. He got tourist visa of Canada. 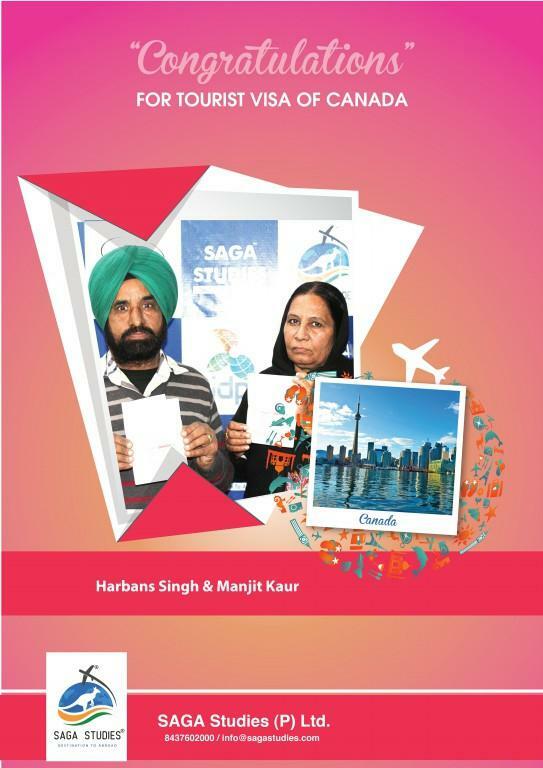 Congratulations Harbans Singh and Manjit Kaur. 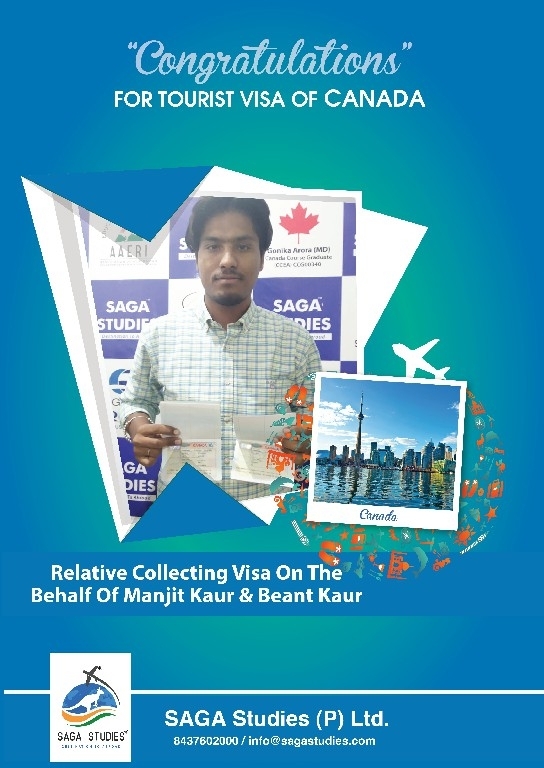 He got tourist visa of Canada. 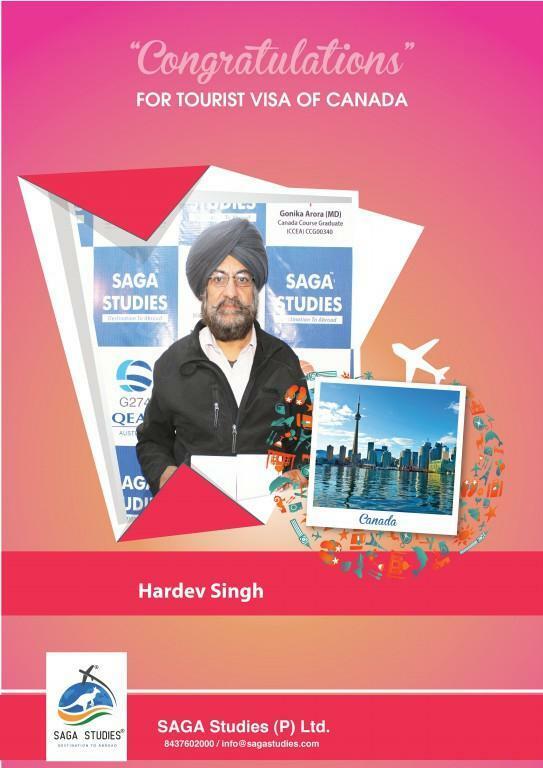 Congratulations Hardev Singh. 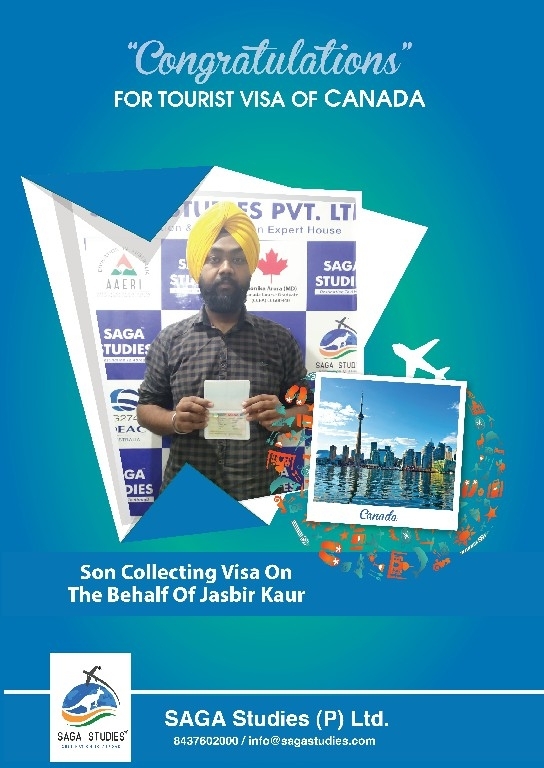 He got tourist visa of Canada. Congratulations Harjinder Kaur. 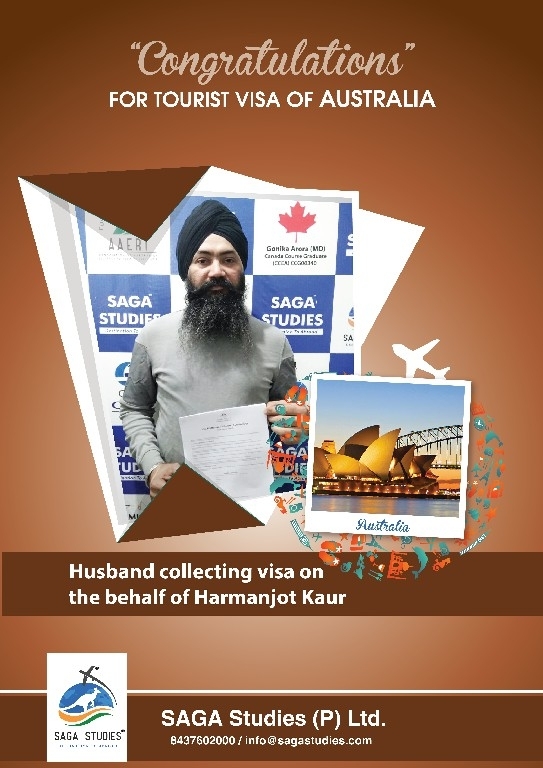 Her husband collecting tourist visa of Australia on the behalf of Harjinder Kaur. 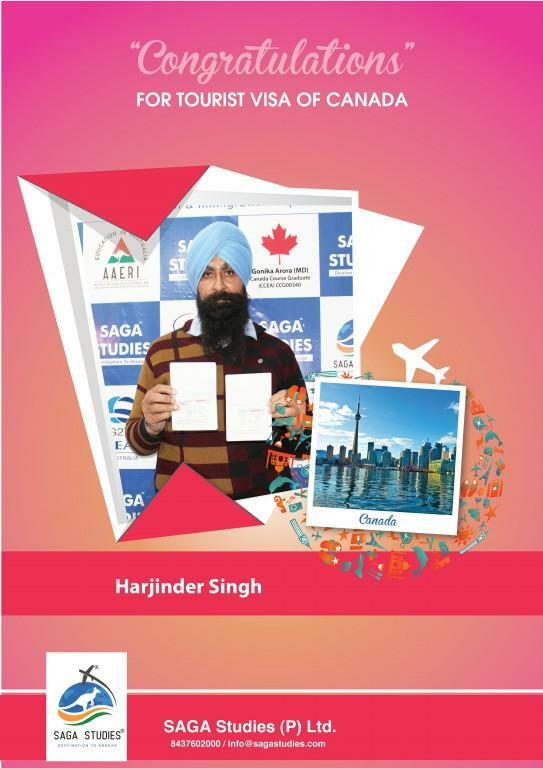 Congratulations Harjinder Singh. He got tourist visa of Canada. Congratulations Jamit Singh and Balwinder Kaur. He got tourist visa of Australia. Congratulations Kulwinder Kaur. 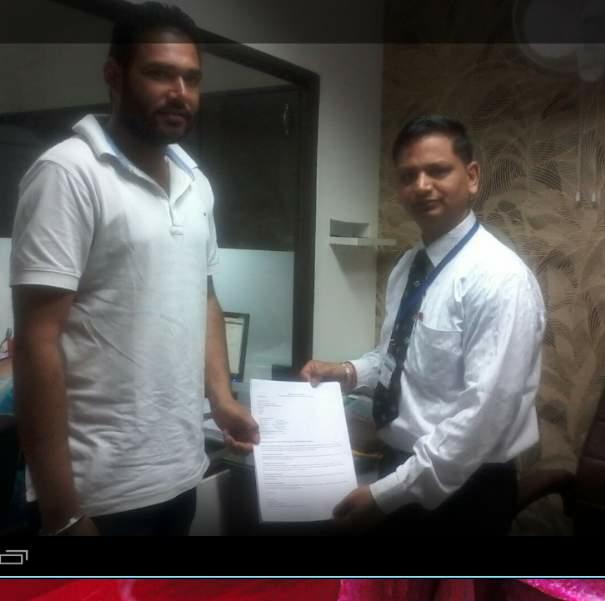 He got tourist visa of Australia. Congratulations Narinder Kaur. 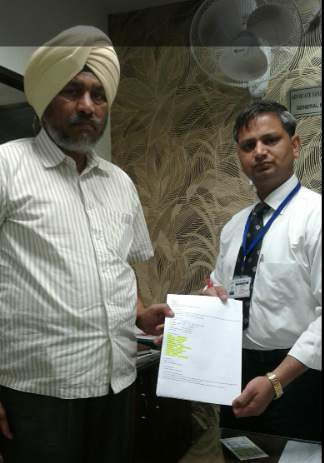 Her husband collecting tourist visa of Australia on the behalf of Narinder Kaur. 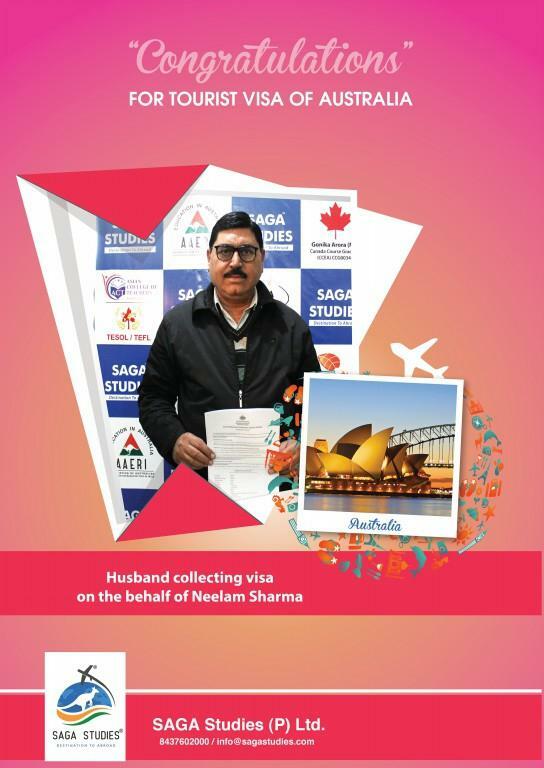 Congratulations Neelam Sharma. 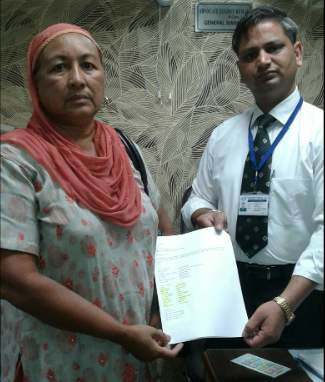 Her husband collecting tourist visa of Australia on the behalf of Neelam Sharma. Congratulations Nitish Kumar. He got tourist visa of Australia. 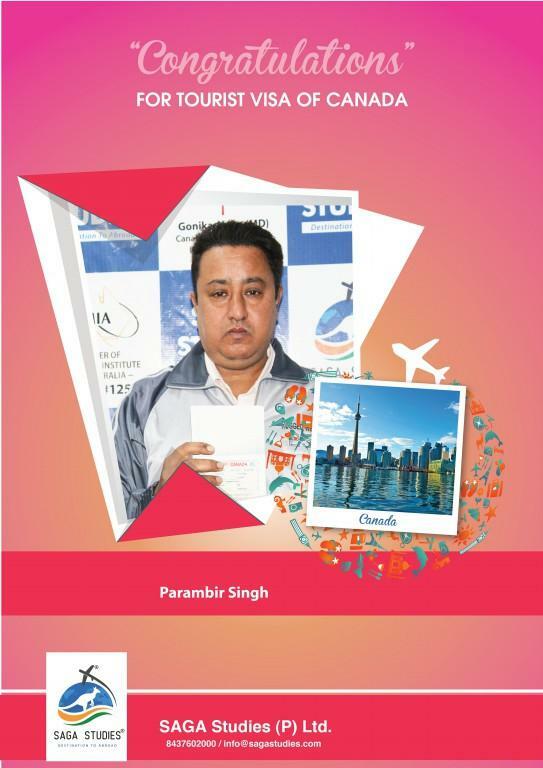 Congratulations Parambir Singh. He got tourist visa of Canada. 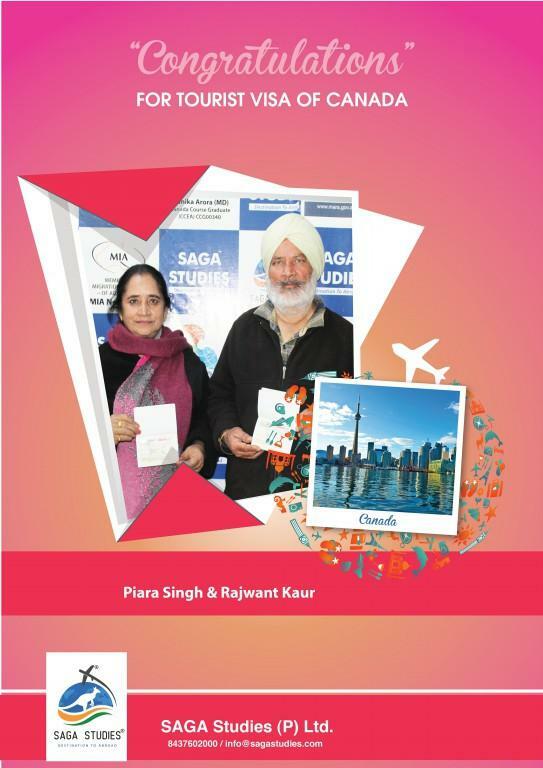 Congratulations Piara Singh and Rajwant Kaur. They got tourist visa of Canada. Congratulations Rajvinder Kaur. She got tourist visa of Australia. 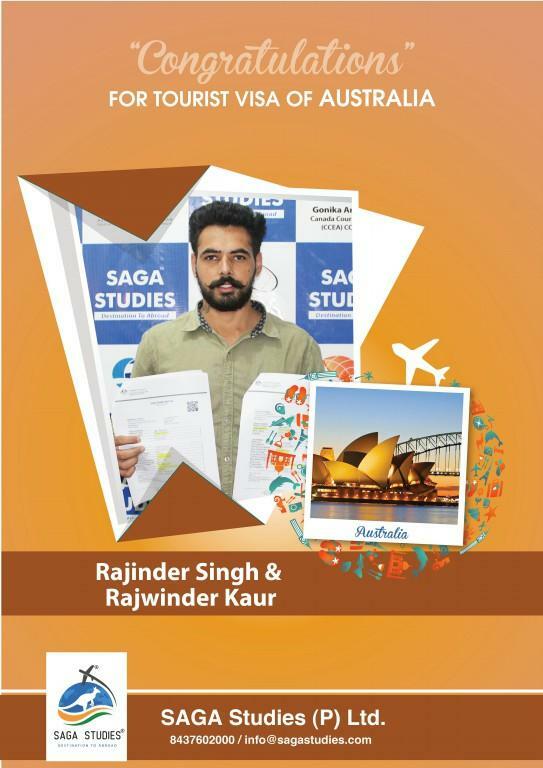 Congratulations Rajwinder Singh. 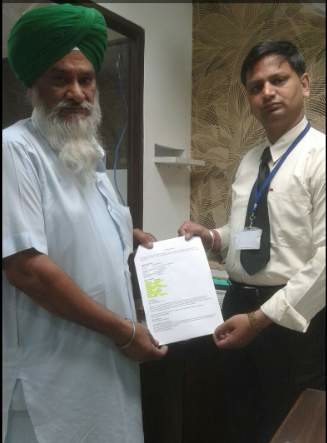 His father collecting tourist visa of Australia on the behalf of Rajwinder Singh. Congratulations Sanjay Kapoor and Geeta Kapoor. 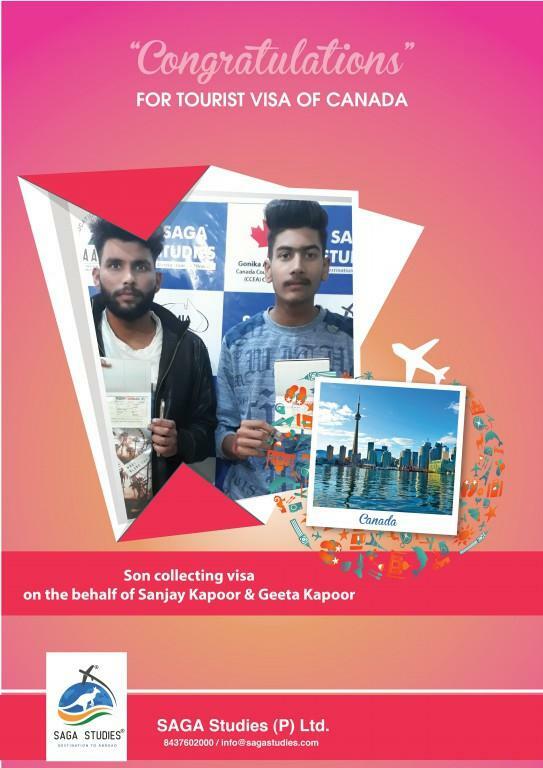 Their Son collecting tourist visa of Canada on the behalf of Sanjay Kapoor and Geeta Kapoor. 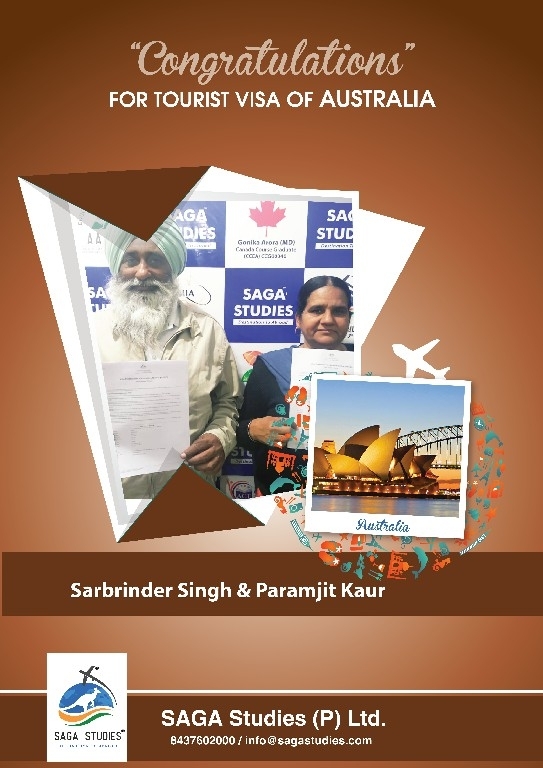 Congratulations Sarabjit Kaur and Sahir Kaur. 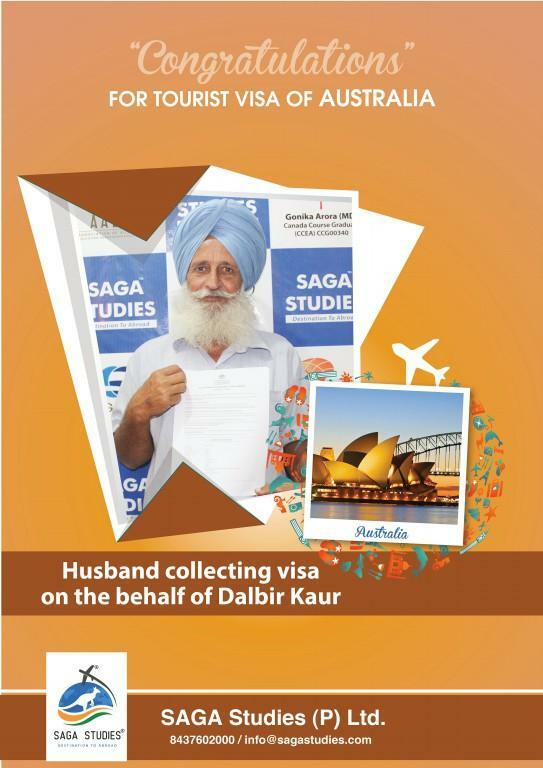 Her husband collecting tourist visa of Australia on the behalf of Sarabjit Kaur and Sahir Kaur. Congratulations Sukhwinder Kaur Randhawa. 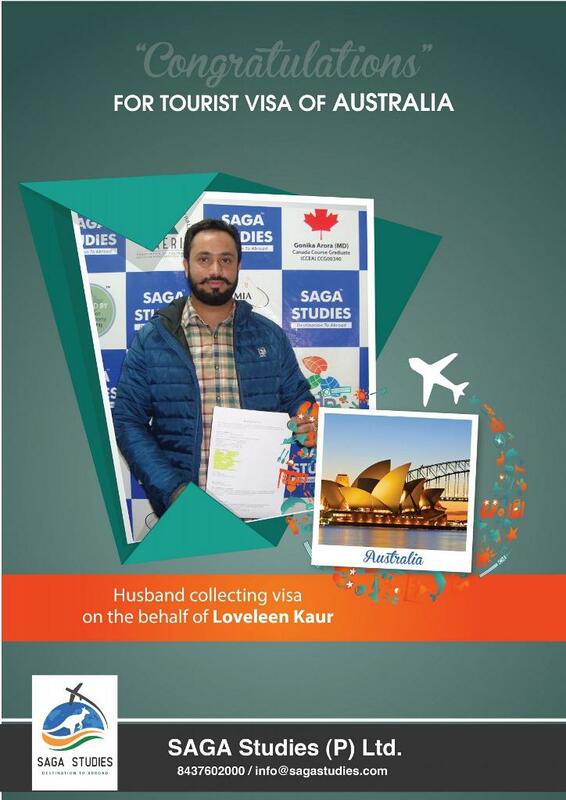 Her husband collecting tourist visa of Australia on the behalf of Sukhwinder Kaur Randhawa. Congratulations Nirmal Kaur. She got tourist visa of Australia. 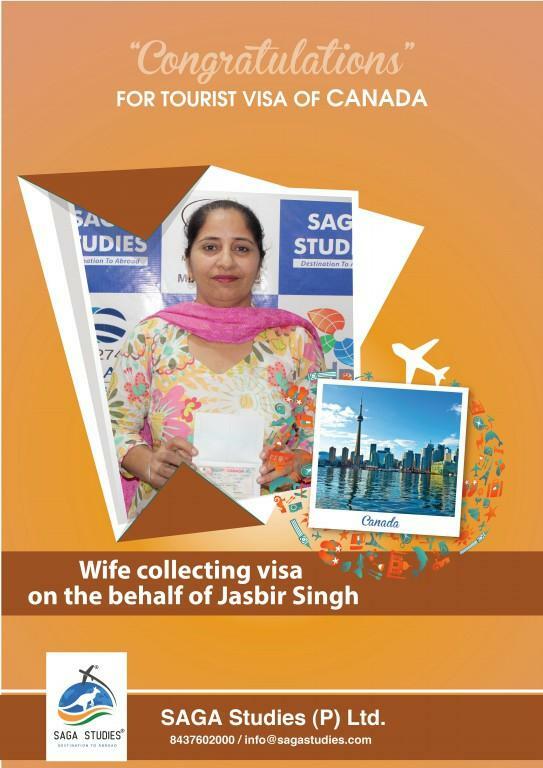 Congratulations Jasbir Kaur. Her son collecting tourist visa of Australia on the behalf of Jasbir Kaur. Congratulations Parvesh Rani. 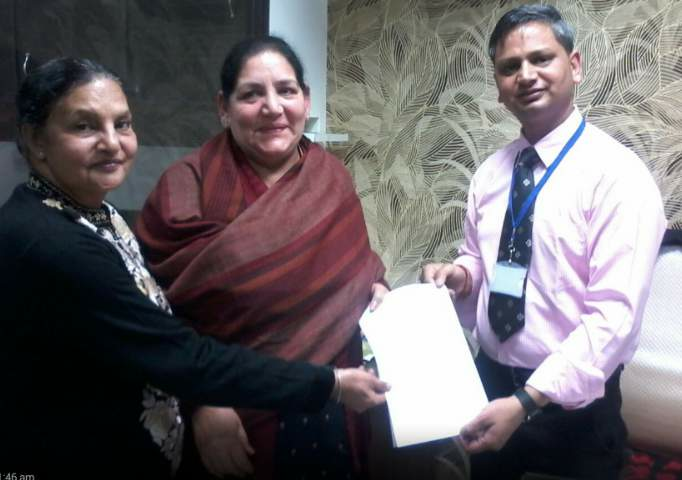 Her husband collecting tourist visa of Australia on the behalf of Parvesh Rani. 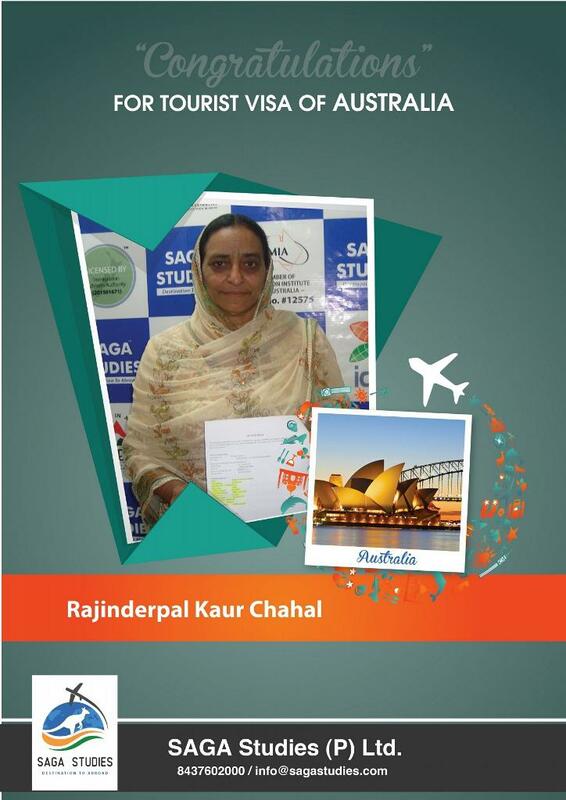 Congratulations Rajinder Kaur. She got tourist visa of Australia. Congratulations Sofia. She got tourist visa of Australia. Congratulations Sukhwinder Singh & Baljit Kaur. 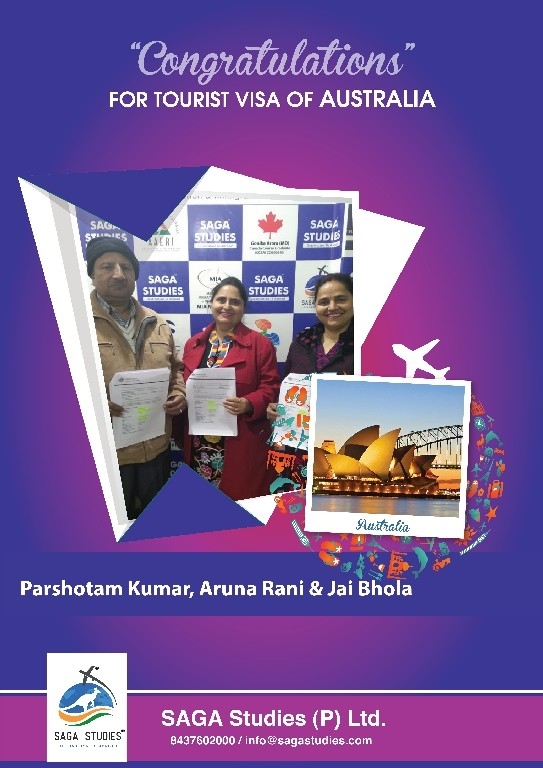 They got tourist visa of Australia. 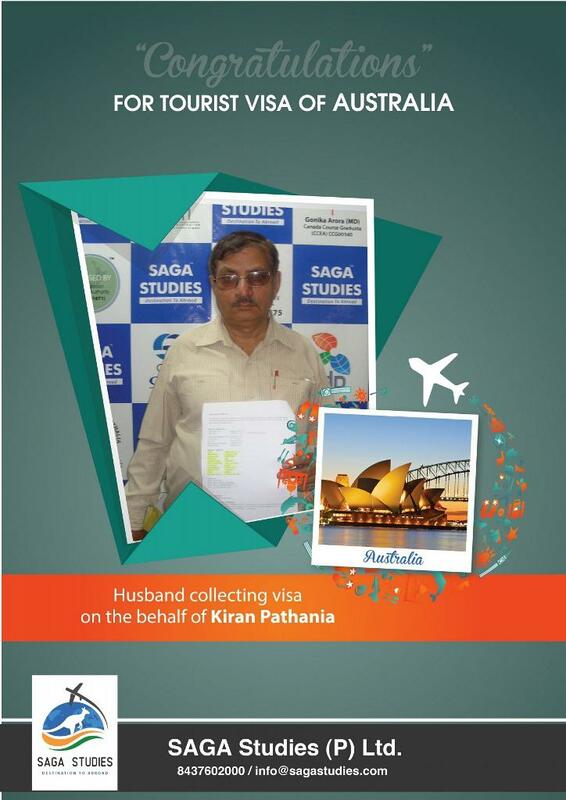 Congratulations Kiran Pathania. 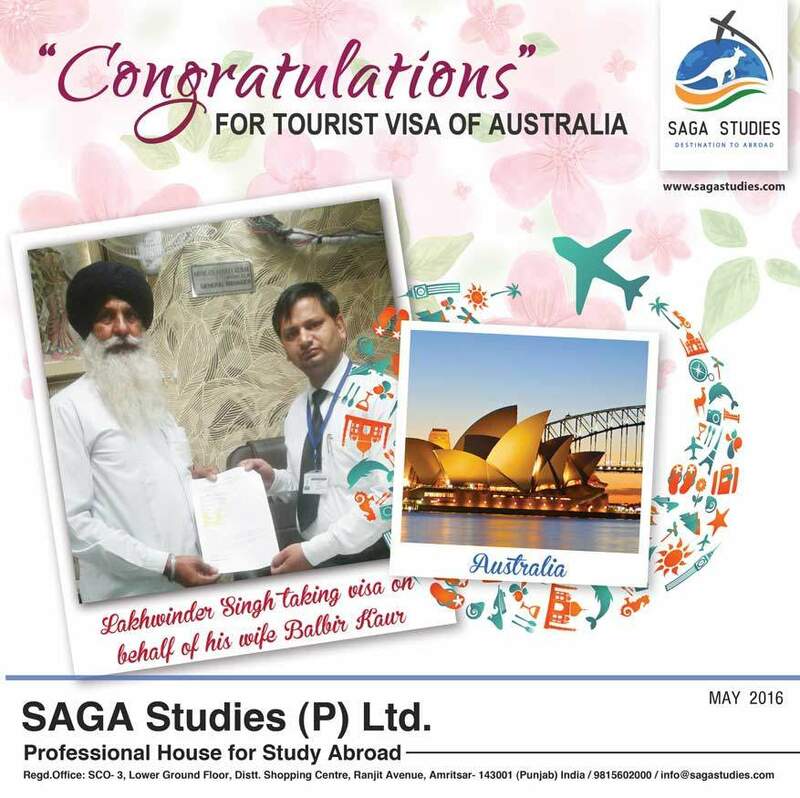 He got tourist visa of Australia. Congratulations Loveleen Kaur. 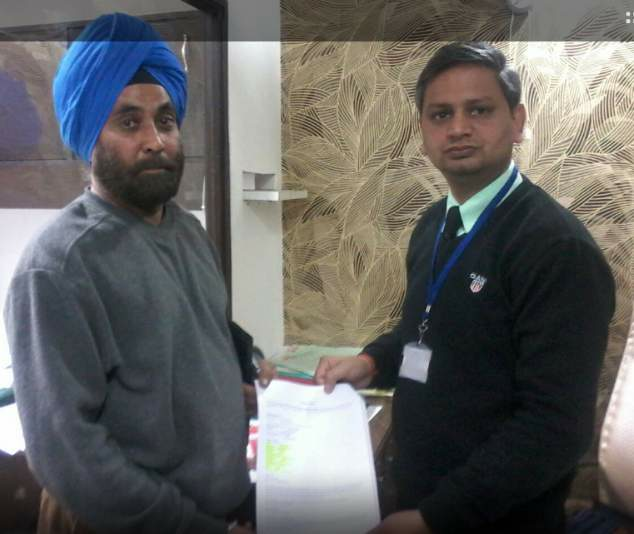 Her husband collecting tourist visa of Australia on the behalf of Loveleen Kaur. 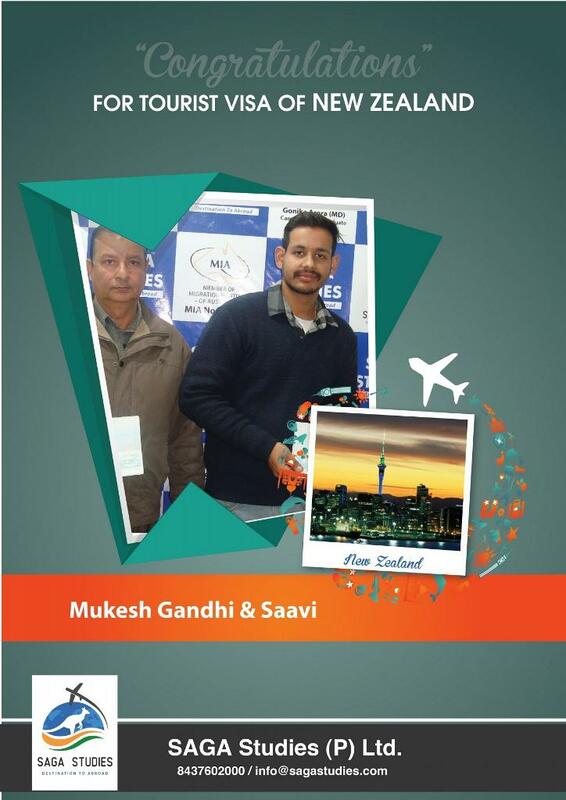 Congratulations Mukesh Gandhi & Saavi. 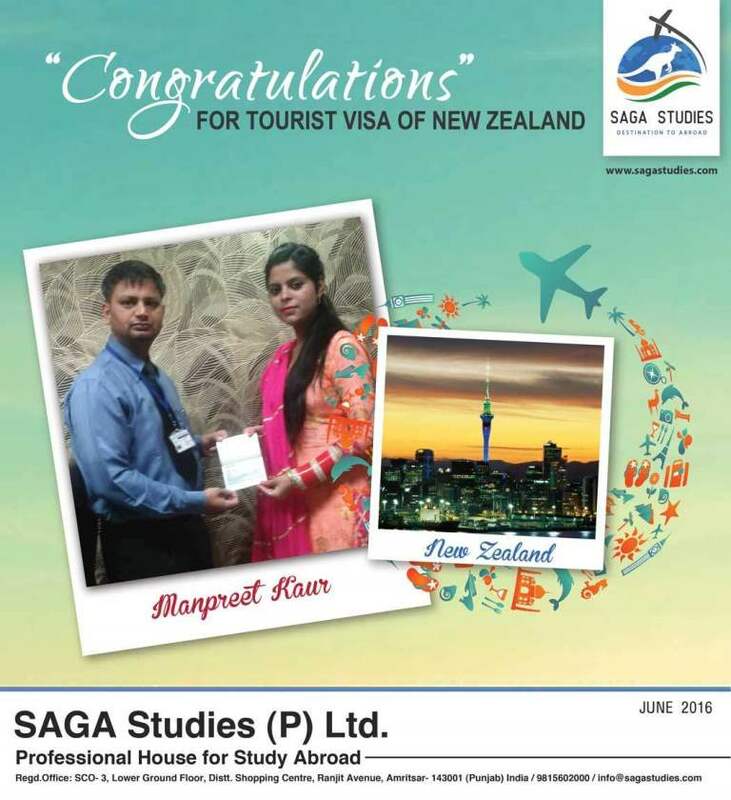 They got tourist visa of New Zealand. Congratulations Palwinder Kaur. 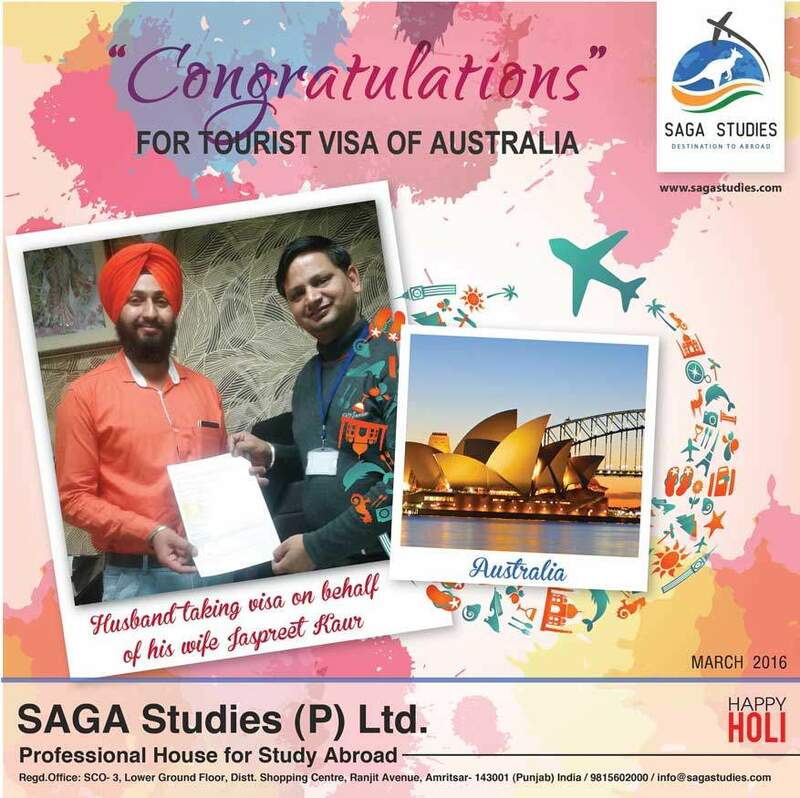 He got tourist visa of Australia. Congratulations Parmjit Kaur. 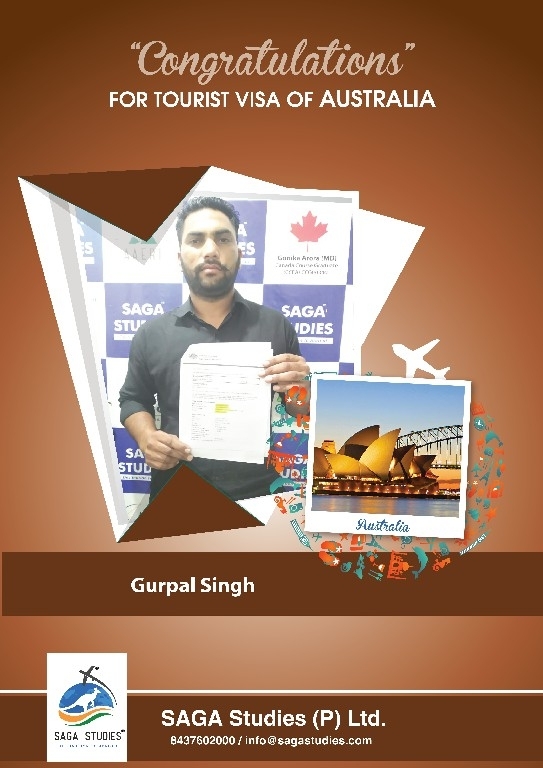 He got tourist visa of Australia. Congratulations Rajinderpal Kaur Chahal. She got tourist visa of Australia. Congratulations Rajwant Kaur Randhawa. 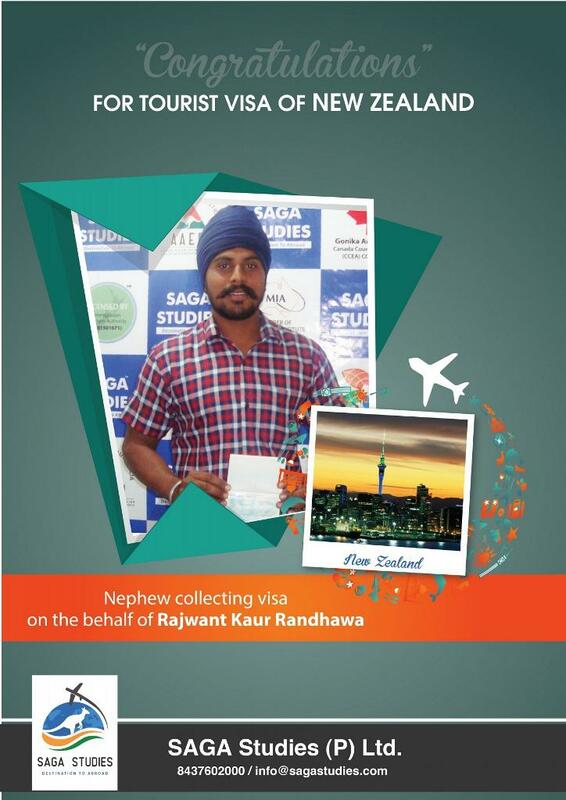 Her Nephew collecting tourist visa of New Zealand on the behalf of Rajwant Kaur Randhawa. Congratulations Rama. 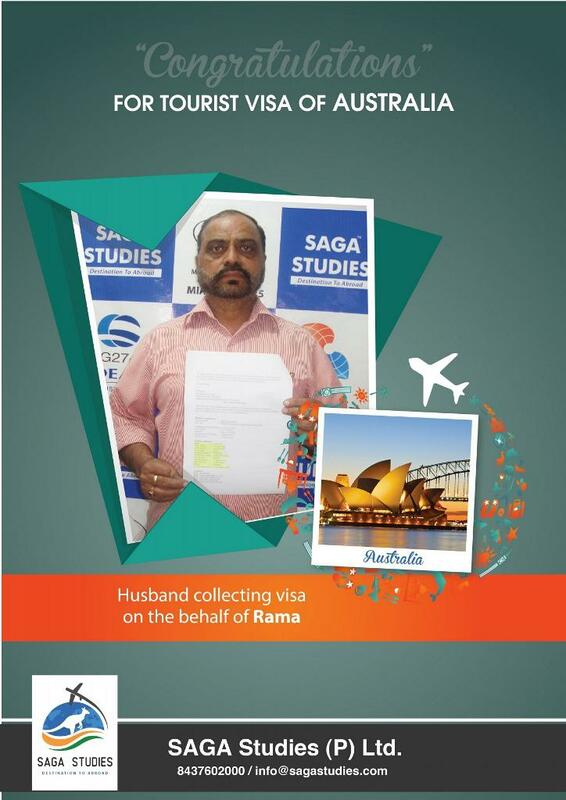 Her husband collecting tourist visa of Australia on the behalf of Rama. 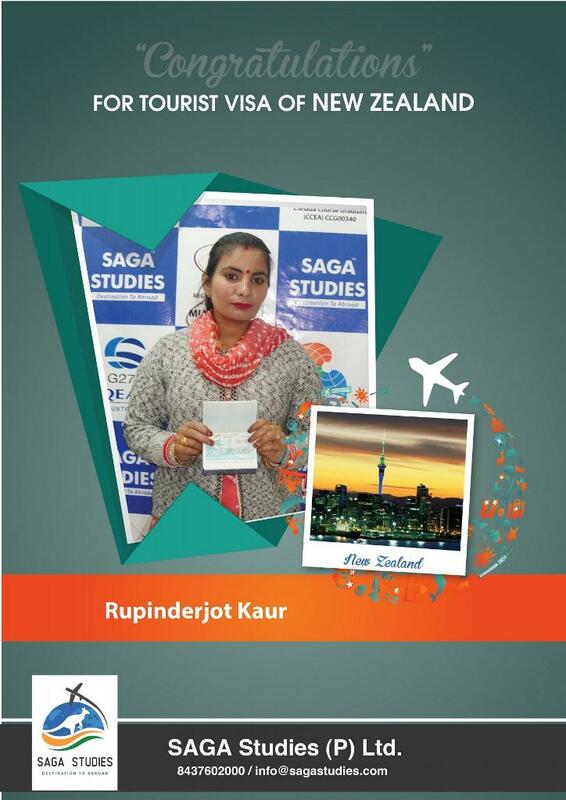 Congratulations Rupinderjot Kaur. 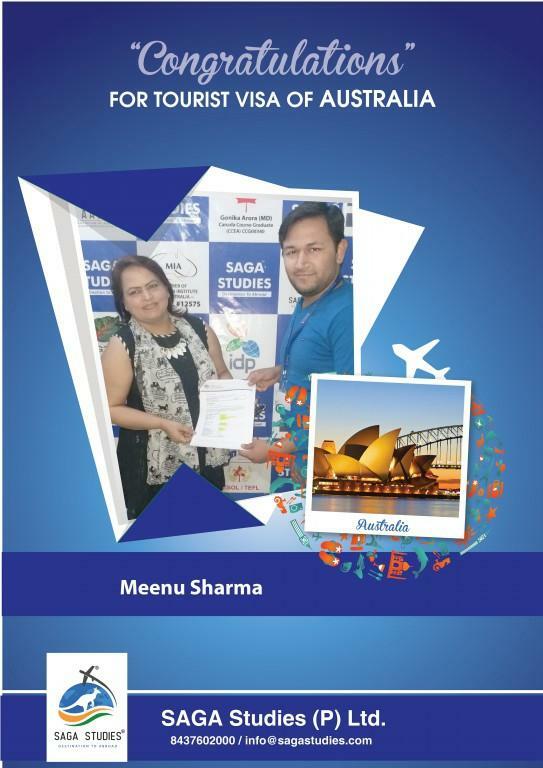 She got tourist visa of New Zealand. 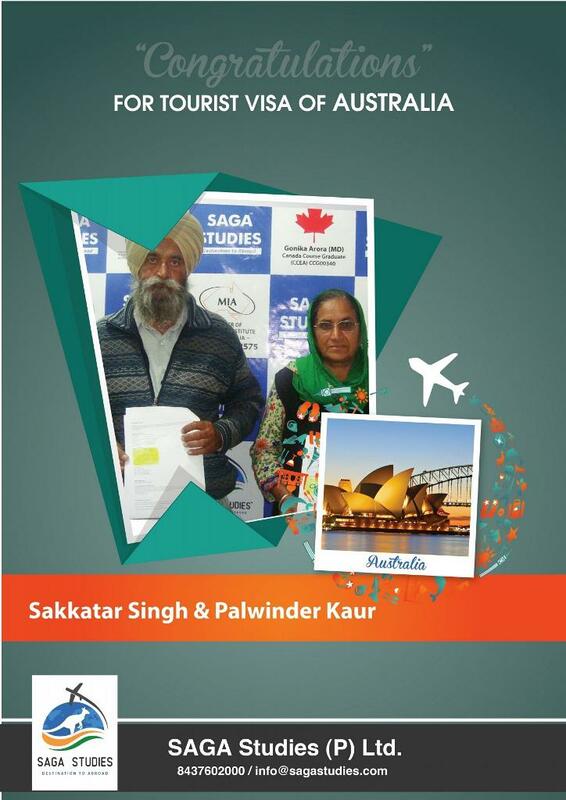 Congratulations Sakkatar Singh & Palwinder Kaur. 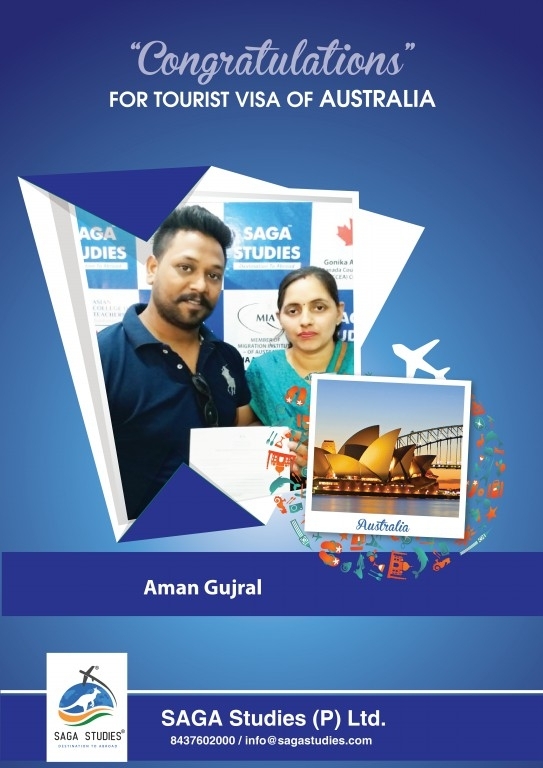 They got tourist visa of Australia. Congratulations Savinder Kaur. 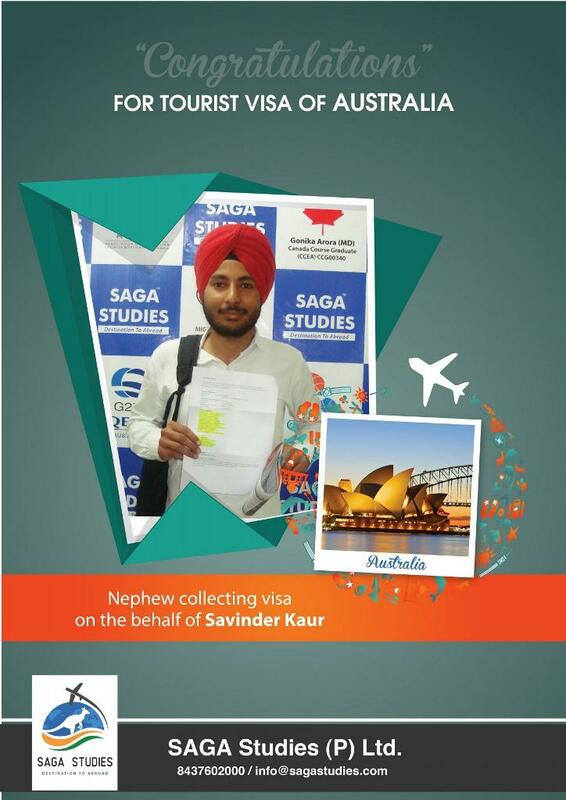 Her Nephew collecting tourist visa of Australia on the behalf of Savinder Kaur. 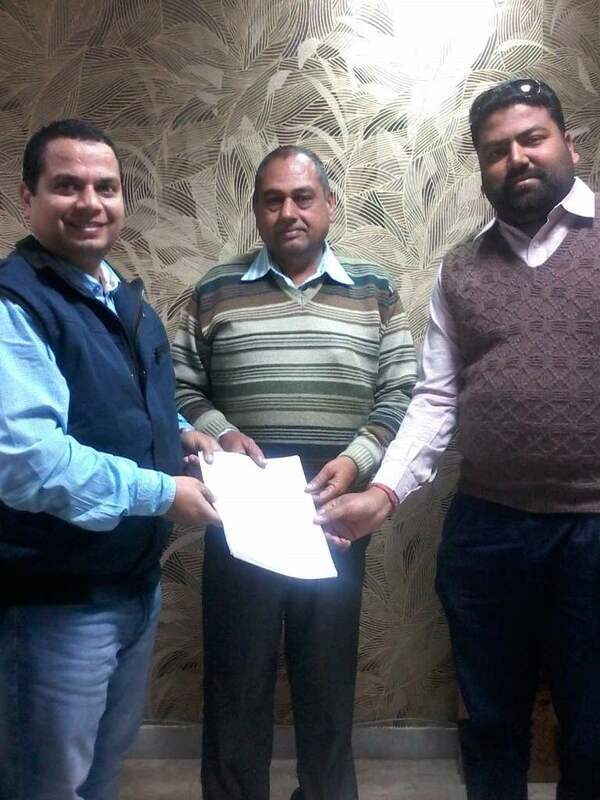 Congratulations Ajay Kumar. He got tourist visa of Canada. Congratulations Manjit Kaur. She got tourist visa of New Zealand. 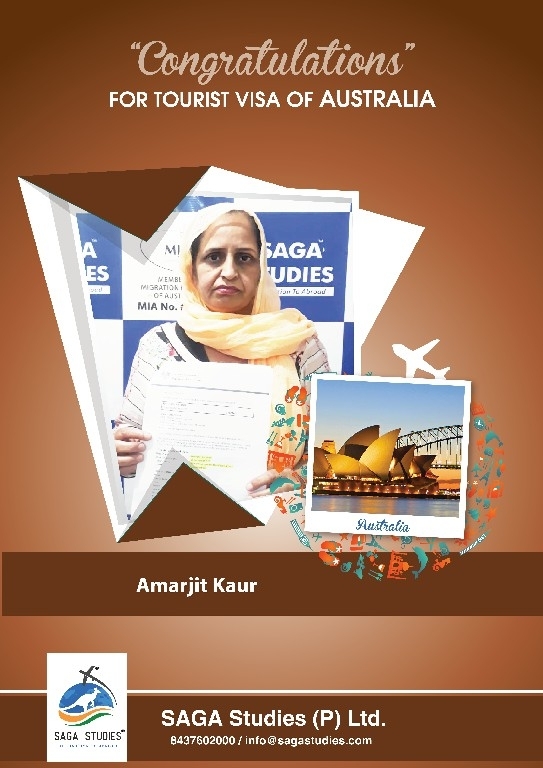 Congratulations Amarjit Kaur. 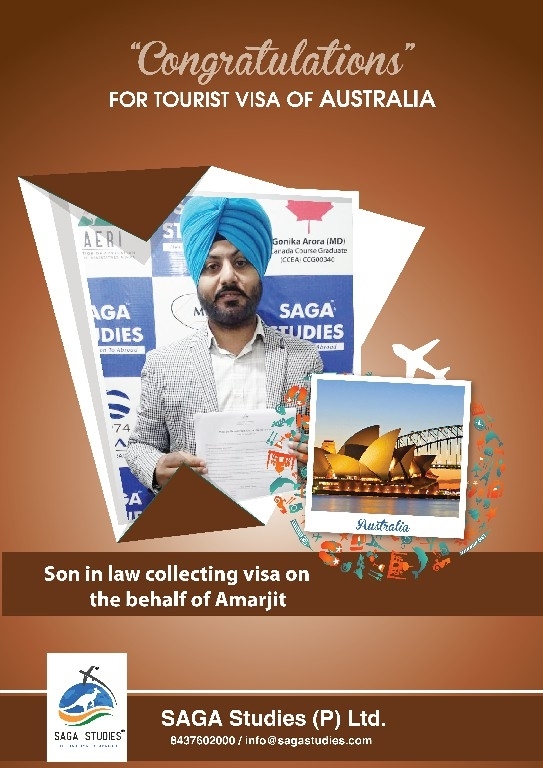 Her son collecting tourist visa of Australia on the behalf of Amarjit Kaur. 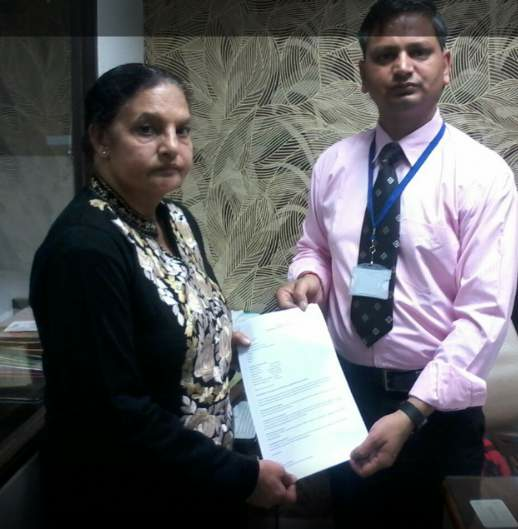 Congratulations Balbir Kaur. 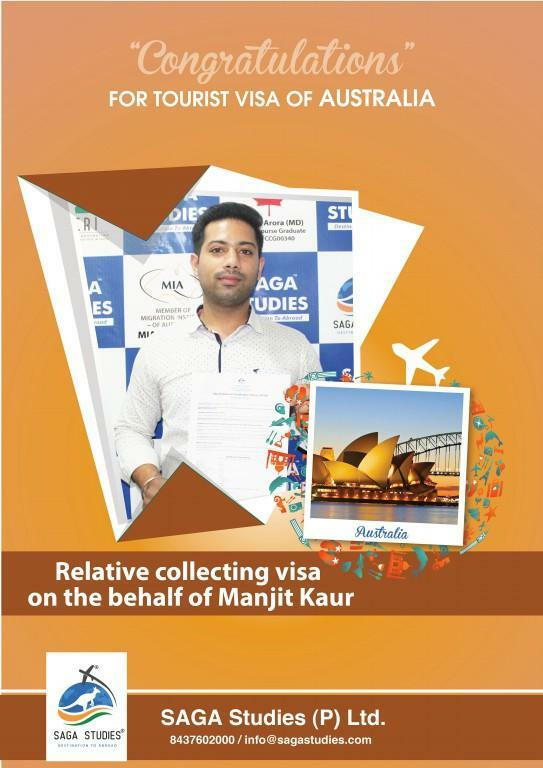 He got tourist visa of Australia. 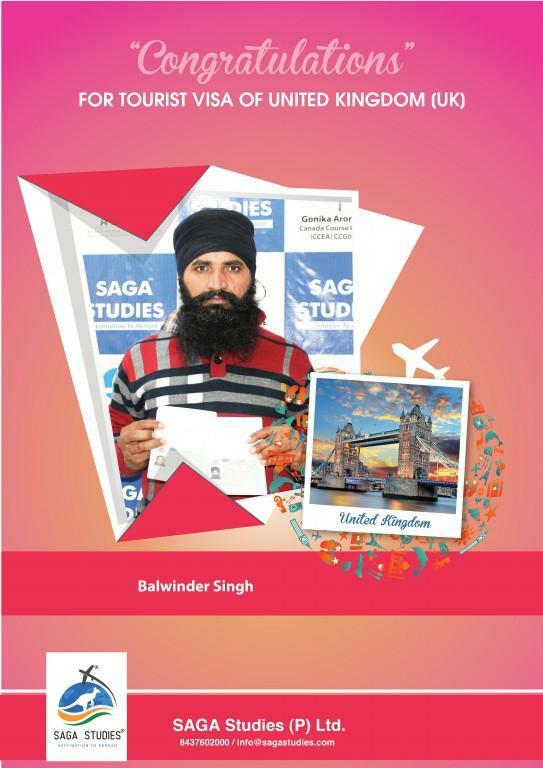 Congratulations Balwinder Singh. 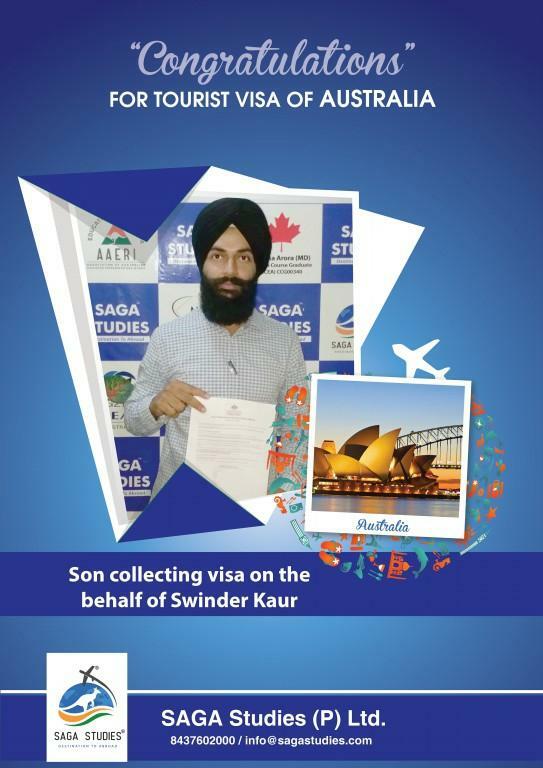 His son collecting tourist visa of Australia on the behalf of Balwinder Singh. 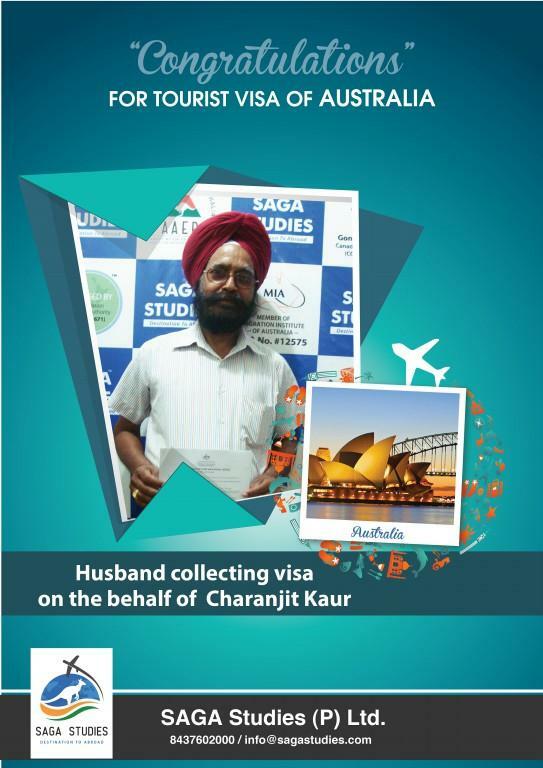 Congratulations Charanjit Kaur. 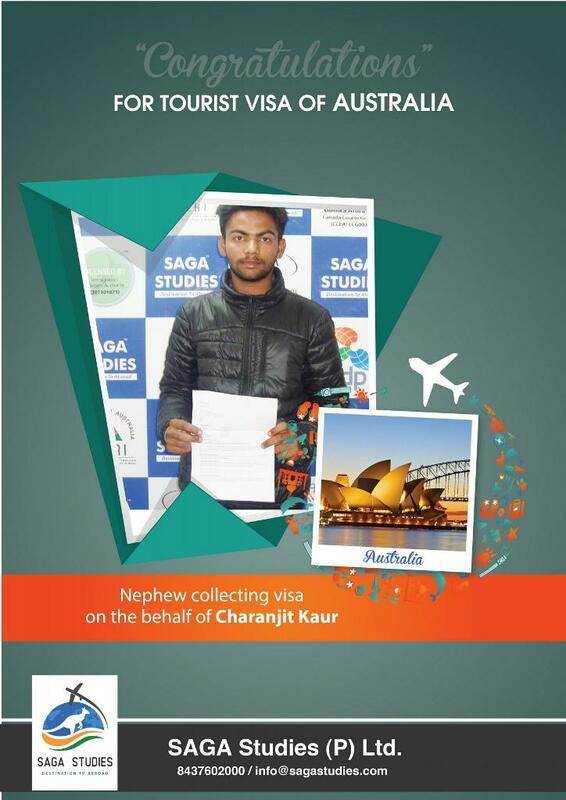 Her Nephew collecting tourist visa of Australia on the behalf of Charanjit Kaur. 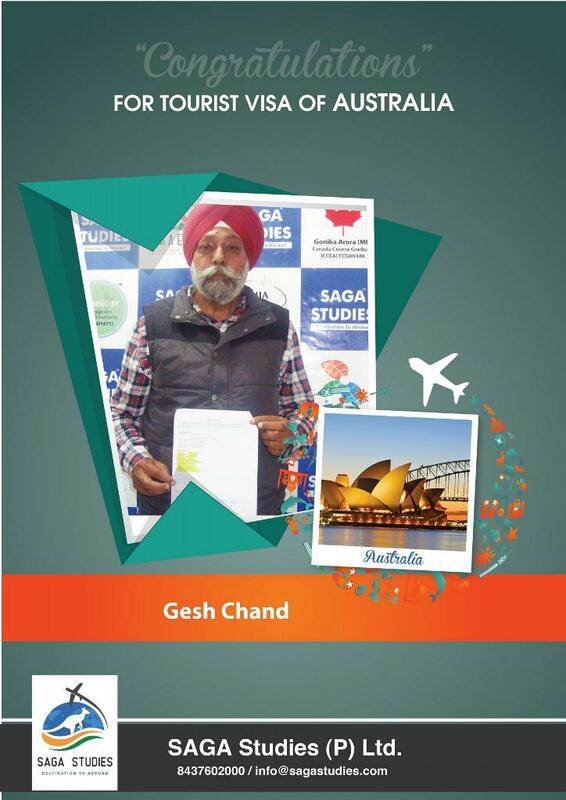 Congratulations Gesh Chand. 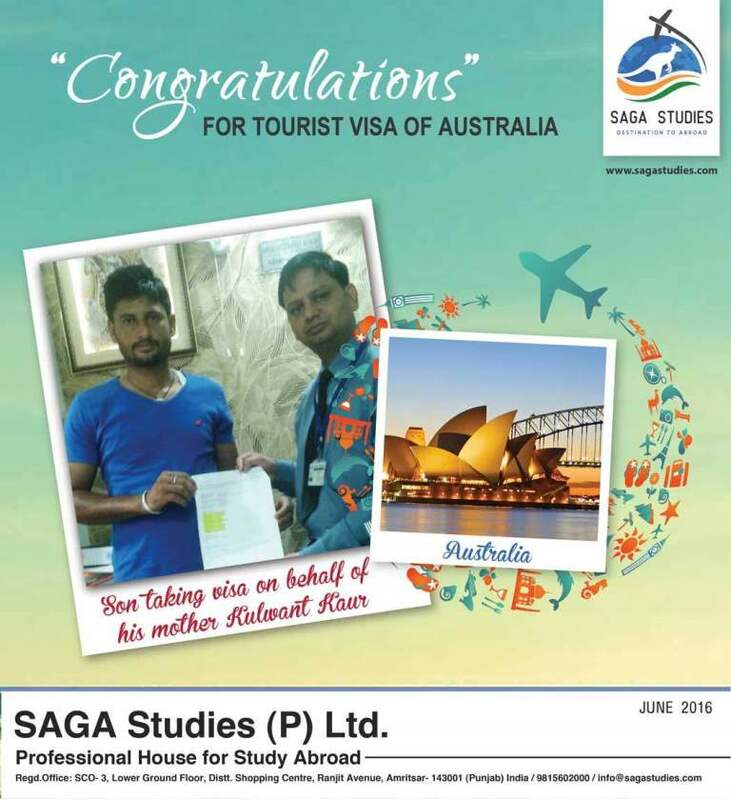 He got tourist visa of Australia. 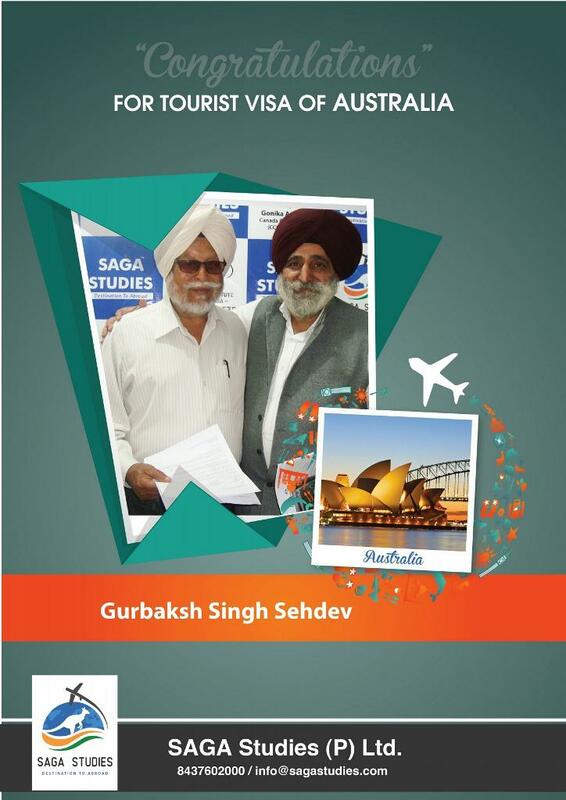 Congratulations Gurbaksh Singh Sehdev. 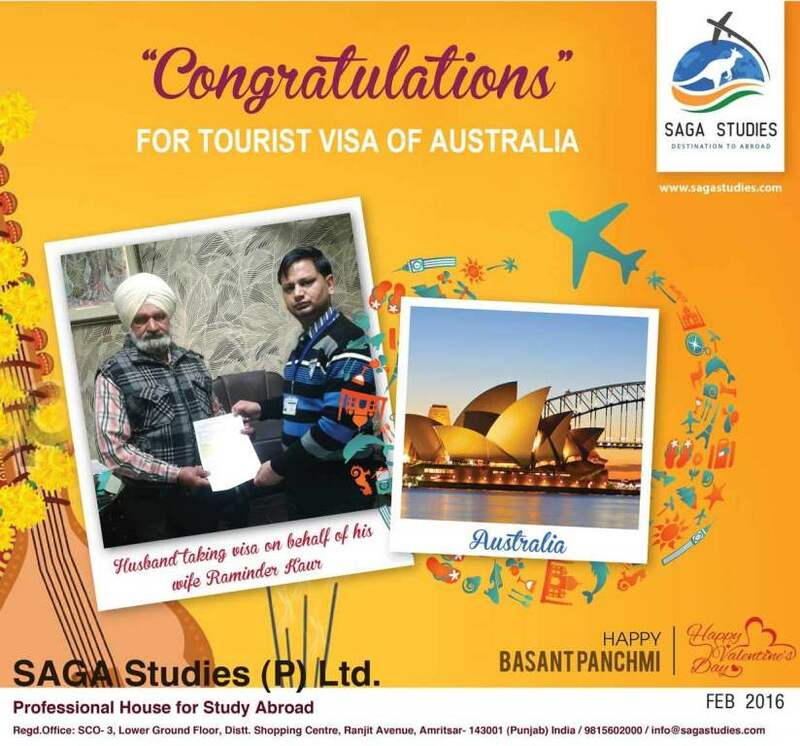 He got tourist visa of Australia. 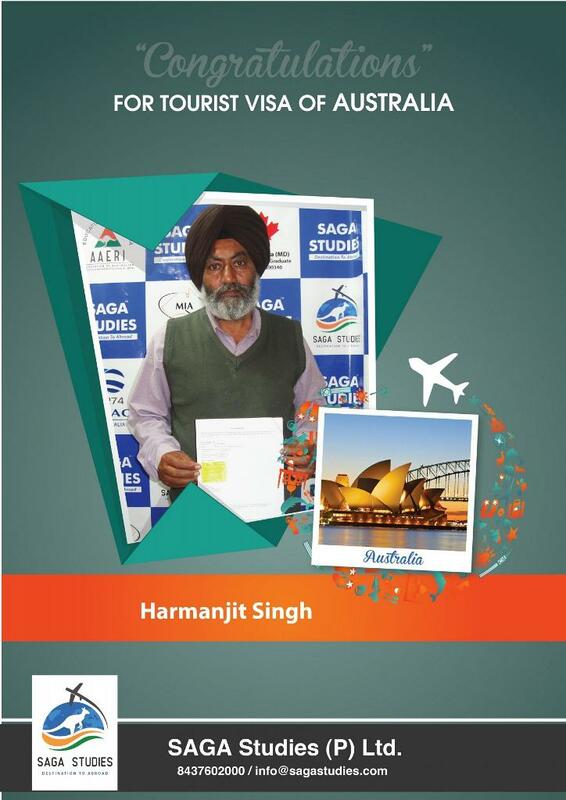 Congratulations Harmanjit Singh. 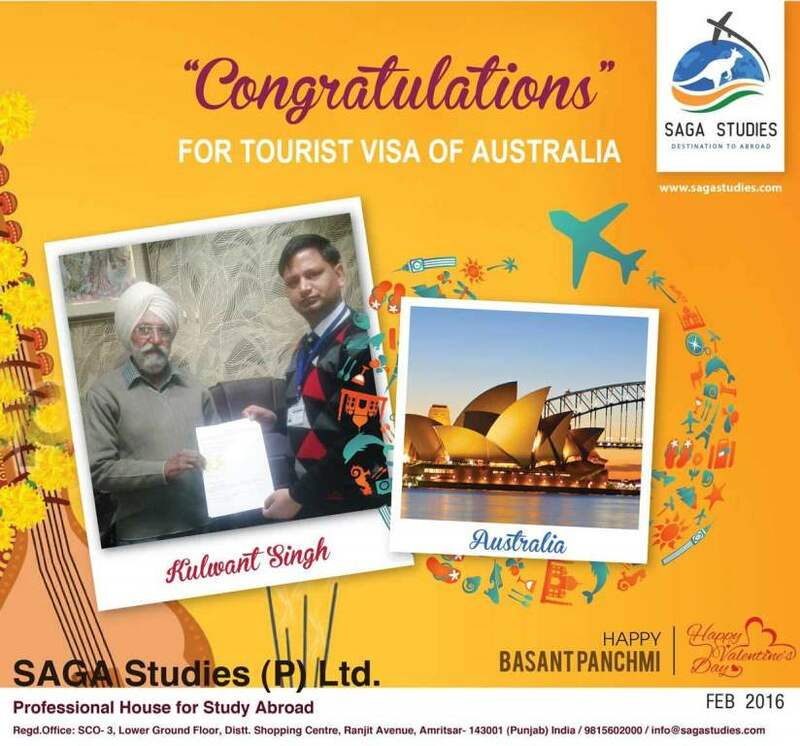 He got tourist visa of Australia. 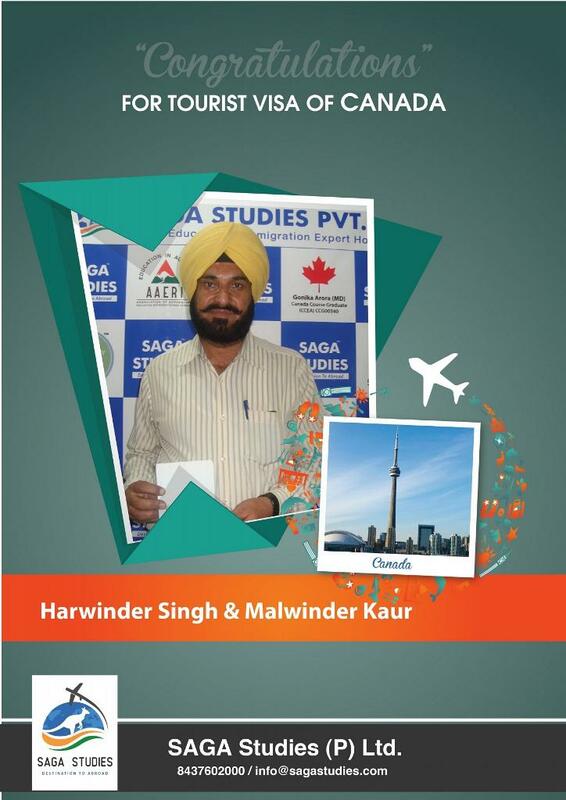 Congratulations Harwinder Singh & Malwinder Kaur. 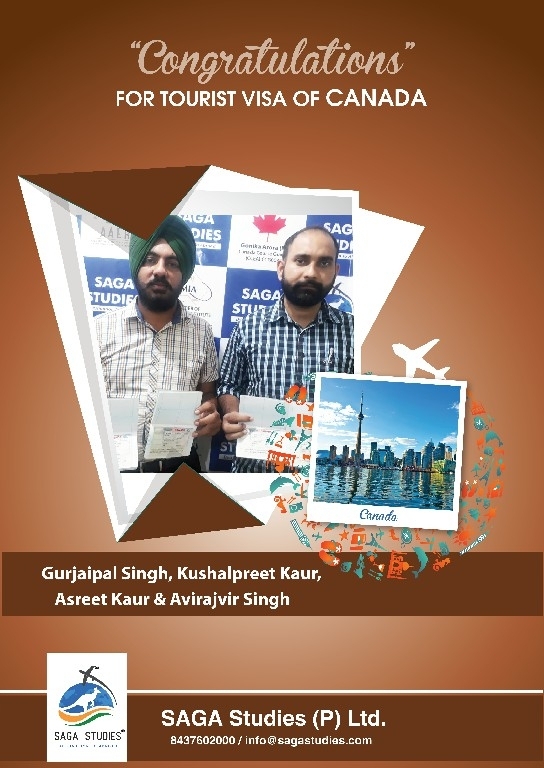 They got tourist visa of Canada. Congratulations Karamjit Kaur. 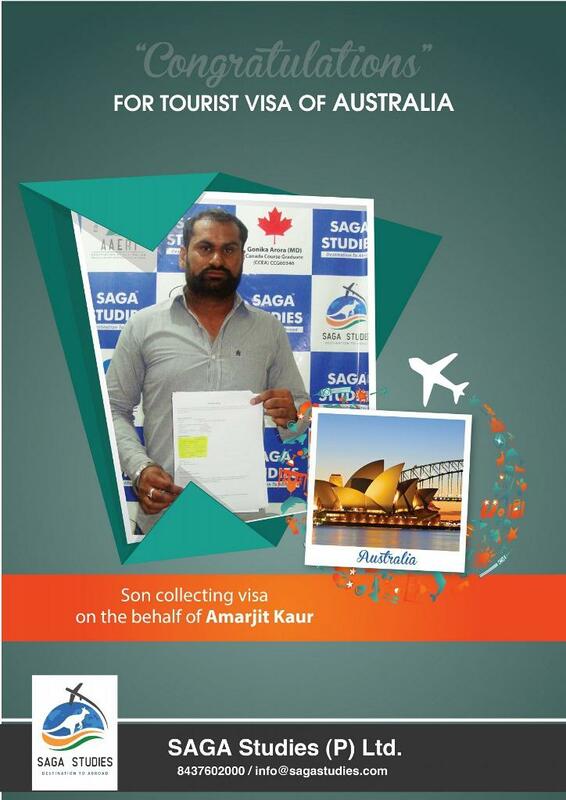 Her son collecting tourist visa of Australia on the behalf of Karamjit Kaur. Congratulations Amarjit Kaur. 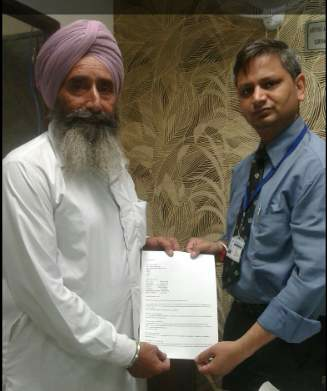 Her relative collecting tourist visa of Australia on the behalf of Amarjit Kaur. Congratulations Balwinder Kaur. 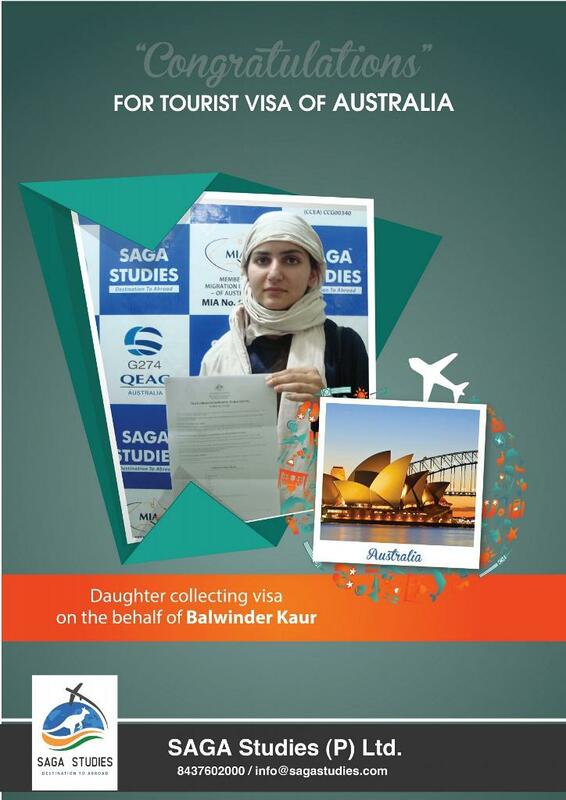 Her daughter collecting tourist visa of Australia on the behalf of Balwinder Kaur. 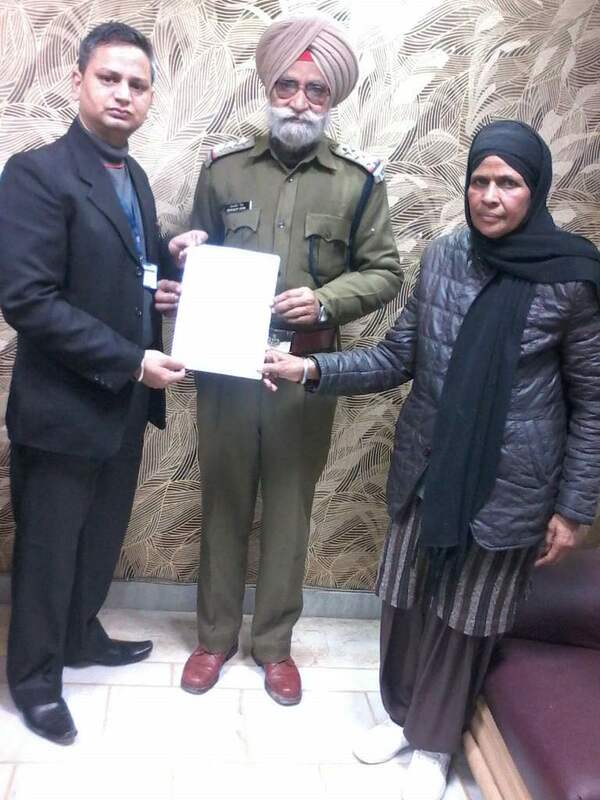 Congratulations Daljir Kaur. 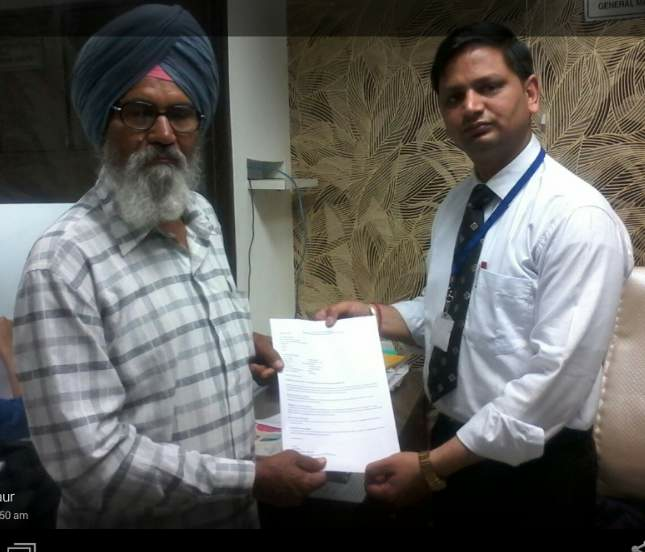 Her relative collecting tourist visa of Australia on the behalf of Daljir Kaur. Congratulations Harmeet Kaur. 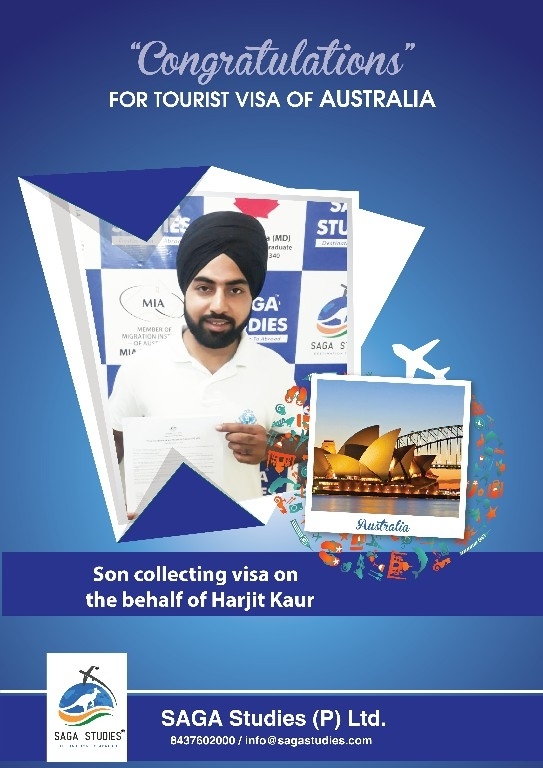 Her son collecting tourist visa of Australia on the behalf of Harmeet Kaur. 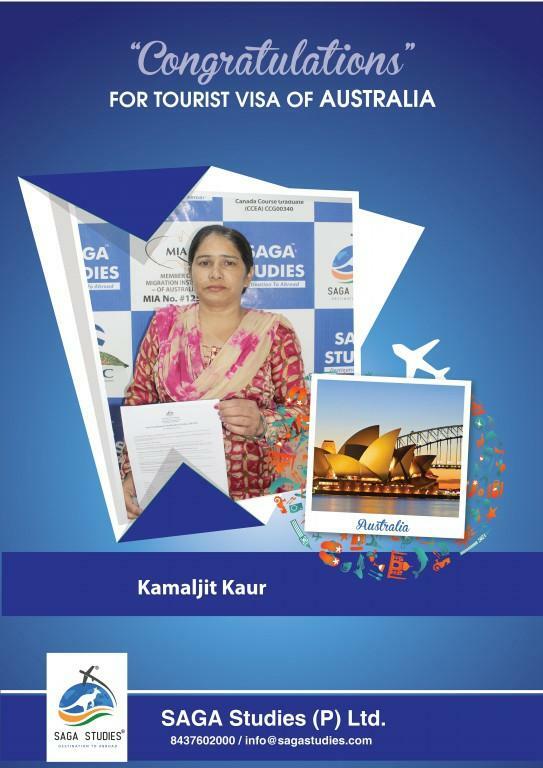 Congratulations Jasmail Kaur. 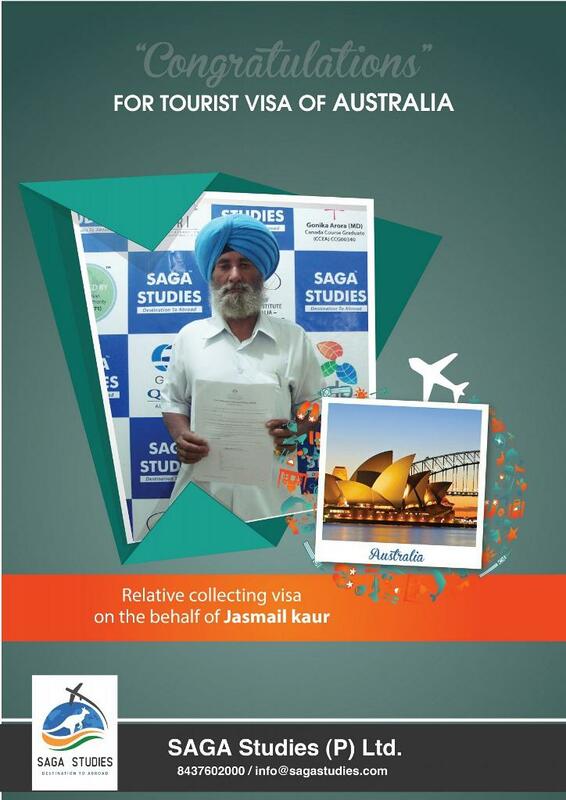 Her relative collecting tourist visa of Australia on the behalf of Jasmail Kaur. 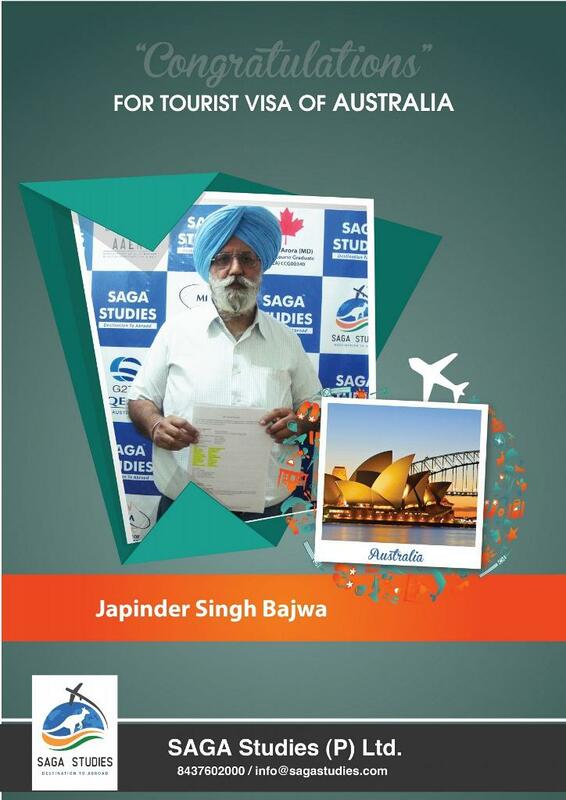 Congratulations Japinder Singh Bajwa. 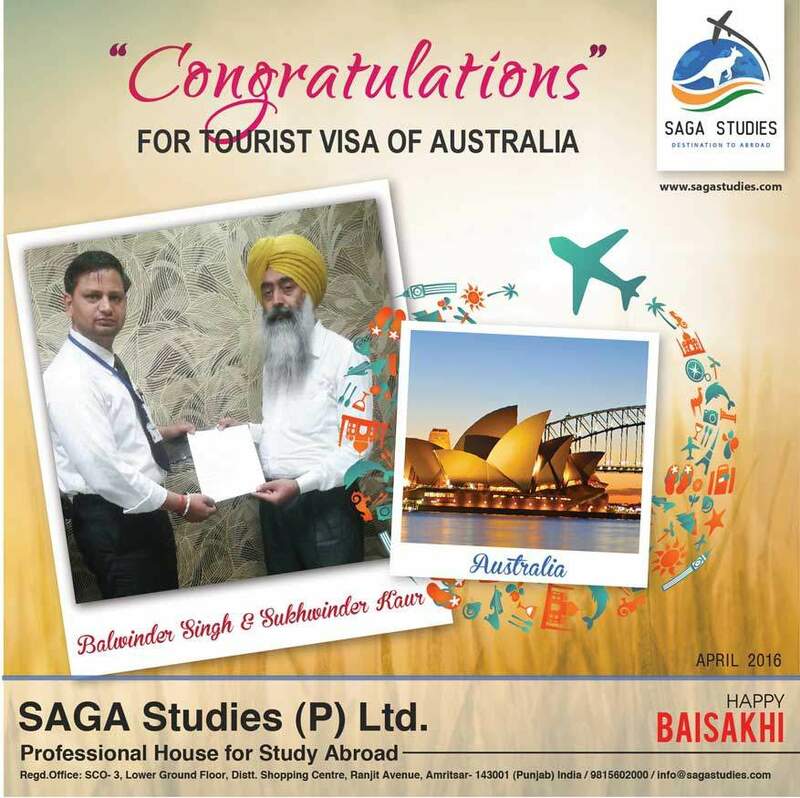 He got tourist visa of Australia. Congratulations Jaswant Singh. 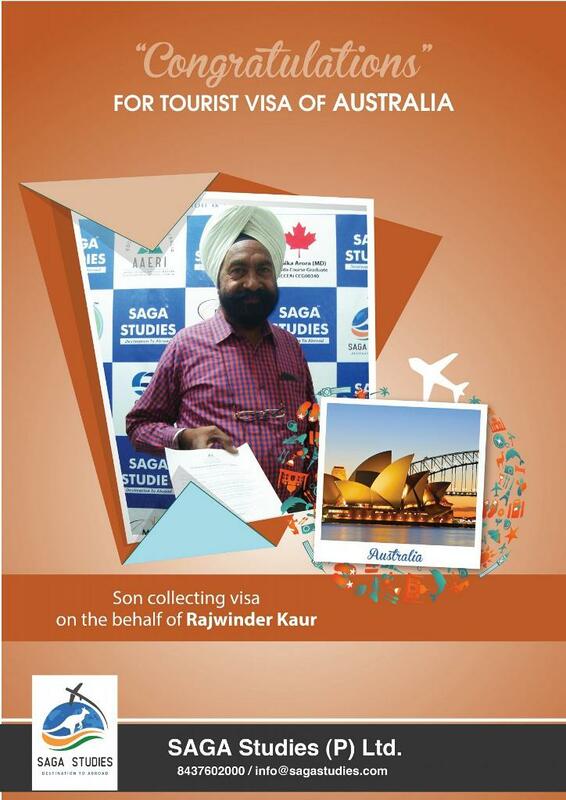 His Aunty collecting tourist visa of Australia on the behalf of Jaswant Singh. Congratulations Joginderpal Sachdeva. 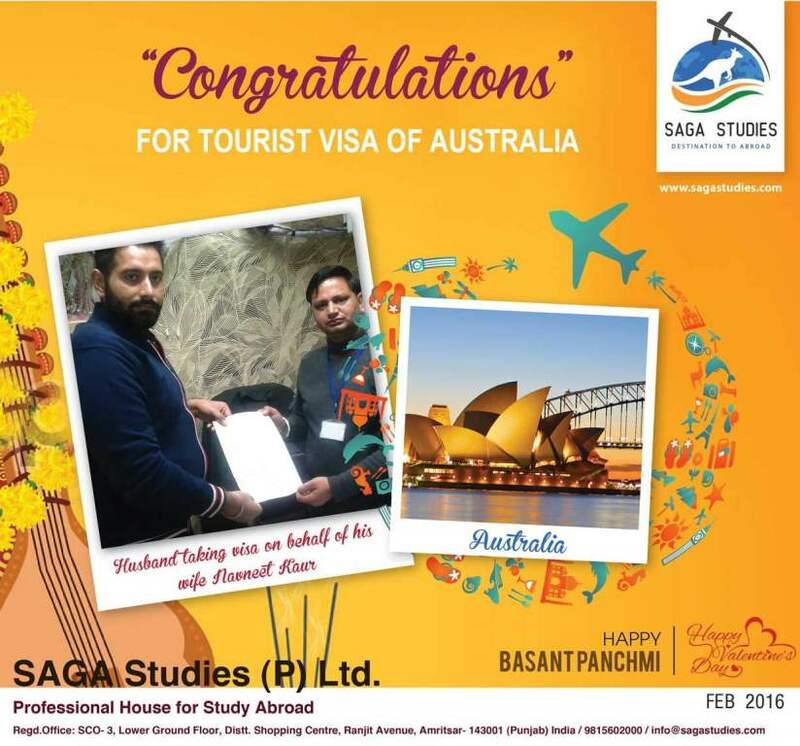 He got tourist visa of Australia. 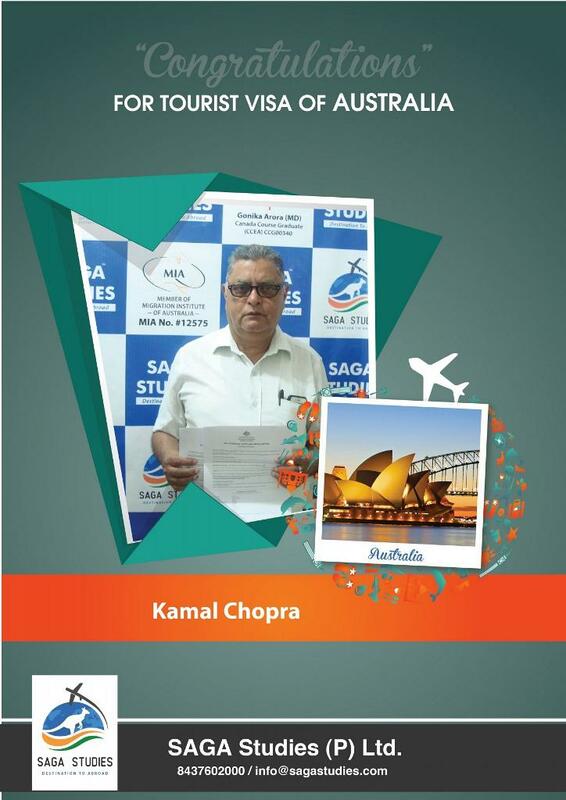 Congratulations Kamal Chopra. He got tourist visa of Australia. Congratulations Kashmir Kaur. 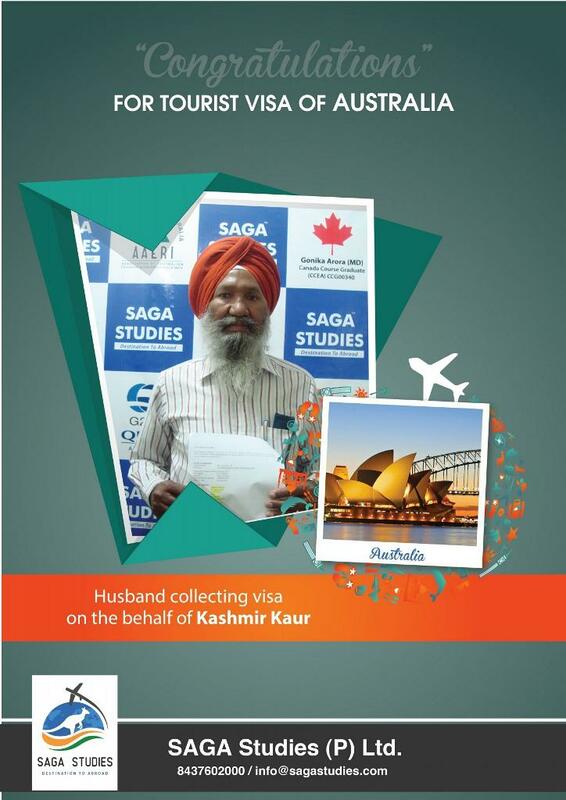 Her husband collecting tourist visa of Australia on the behalf of Kashmir Kaur. 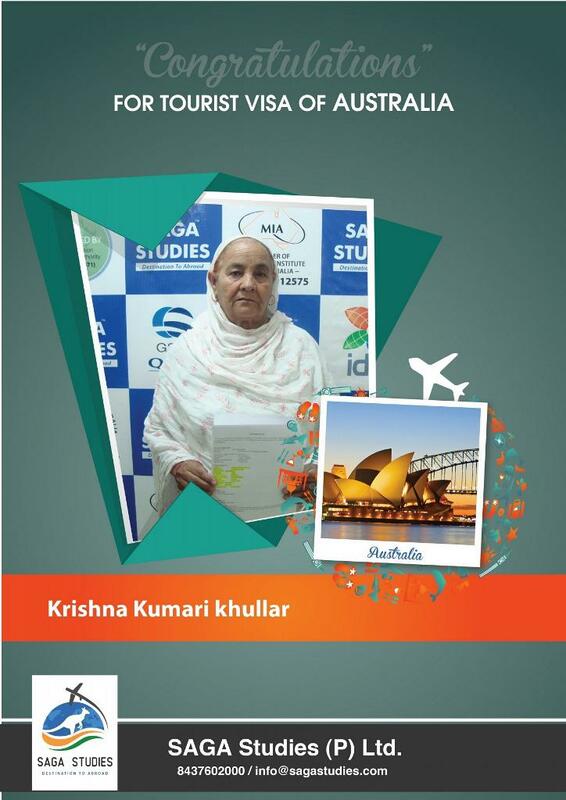 Congratulations Krishna Kumari Khullar. She got tourist visa of Australia. Congratulations Kulwant Kaur Sandhu. 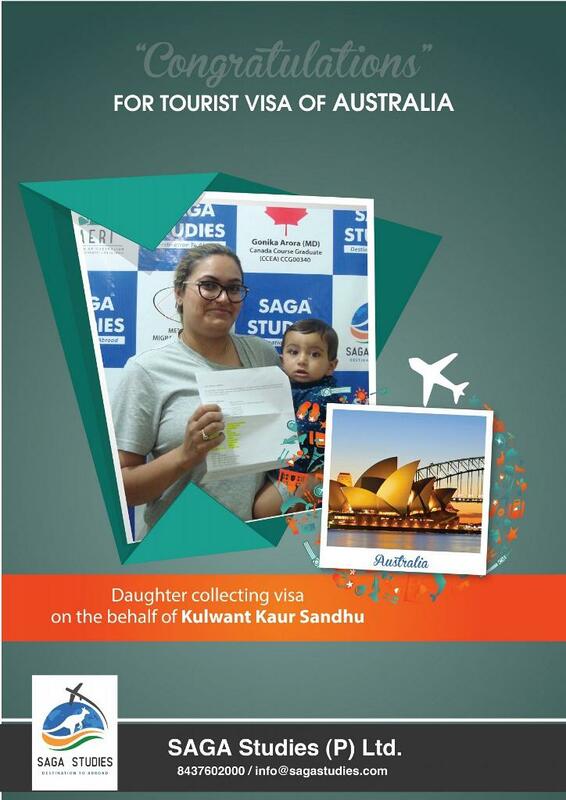 Her daughter collecting tourist visa of Australia on the behalf of Kulwant Kaur Sandhu. 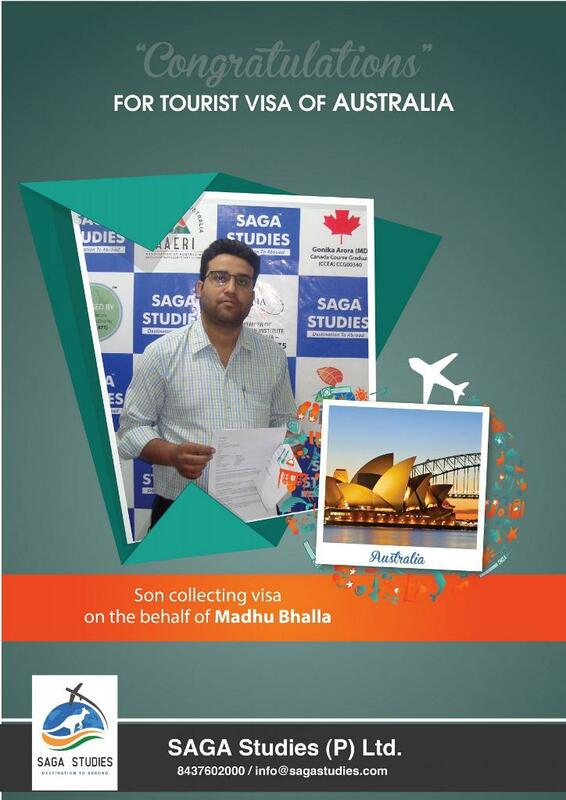 Congratulations Madhu Bhalla. 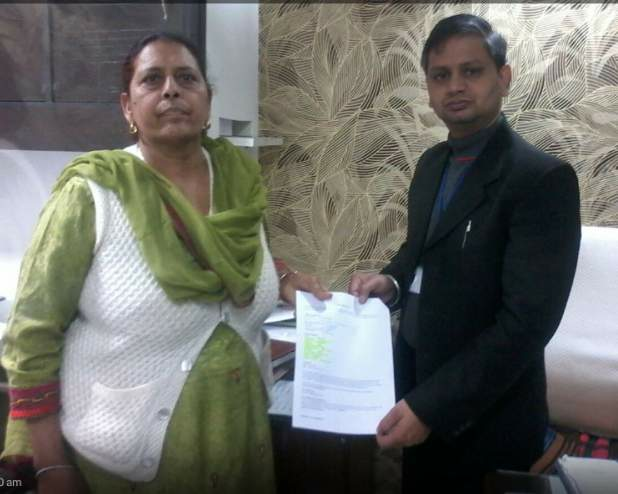 Her son collecting tourist visa of Australia on the behalf of Madhu Bhalla. Congratulations Resham Singh Bhullar. He got tourist visa of Canada. Congratulations Ranjit Kaur. 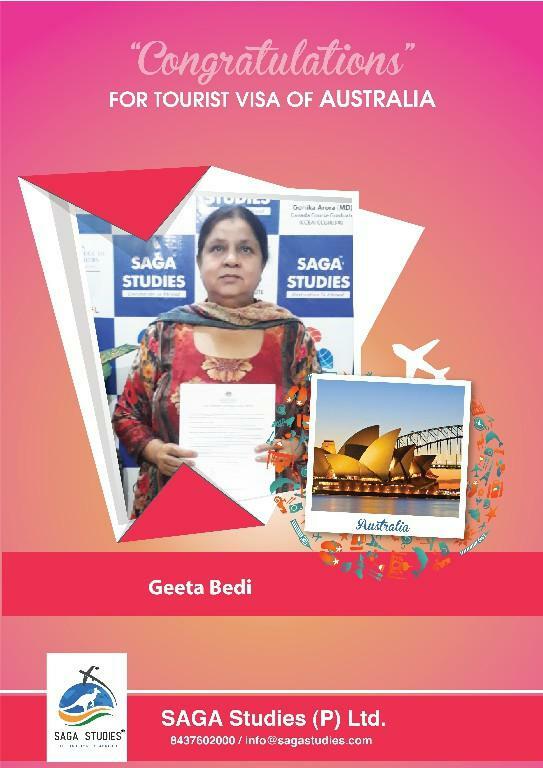 She got tourist visa of Australia. Congratulations Maninder Kaur. Her husband collecting tourist visa of Australia on the behalf of Maninder Kaur. 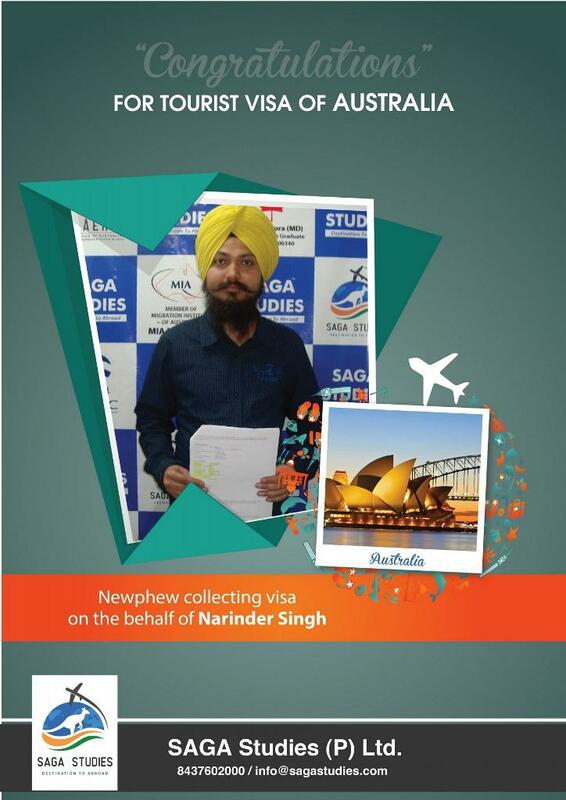 Congratulations Narinder Singh. 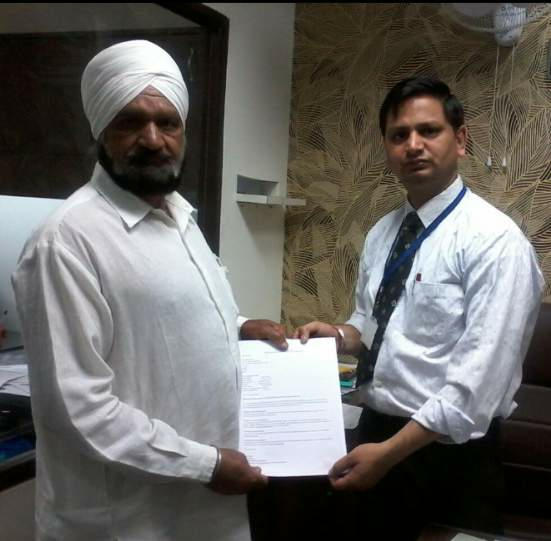 His Nephew collecting tourist visa of Australia on the behalf of Narinder Singh. 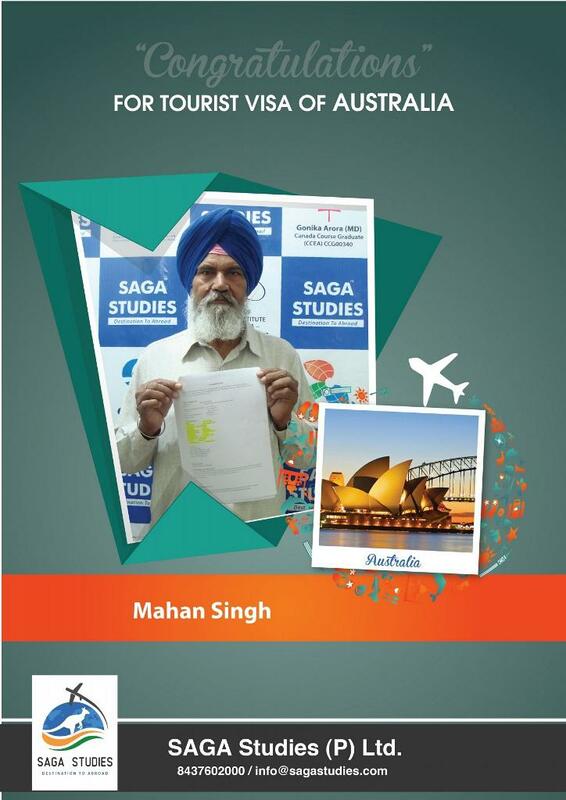 Congratulations Mahan Singh. 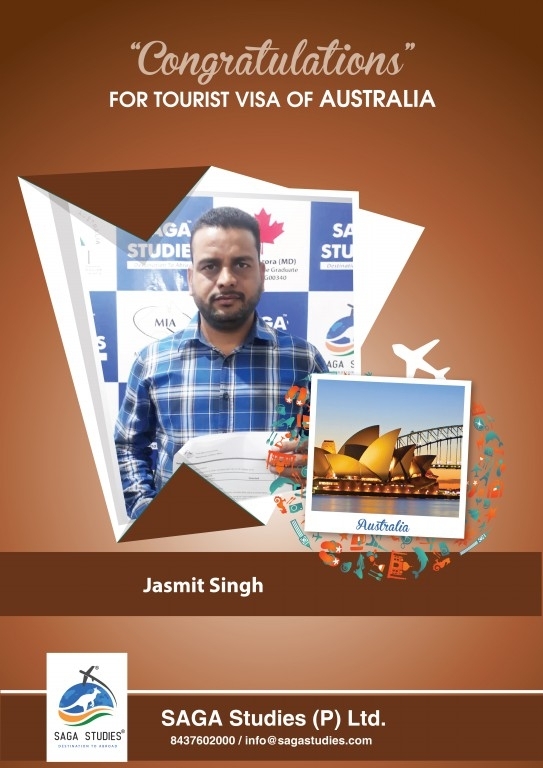 He got tourist visa of Australia. 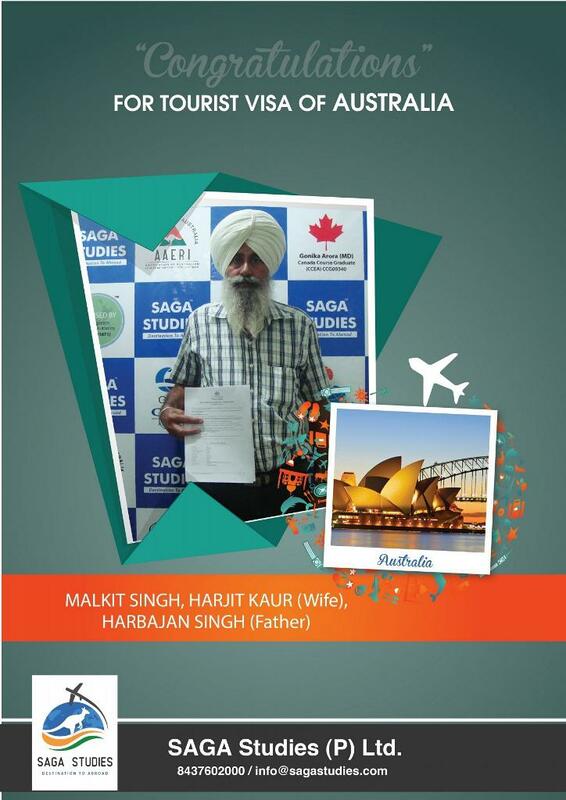 Congratulations Malkit Singh, Harjit Kaur & Harbajan Singh. They got tourist visa of Australia. 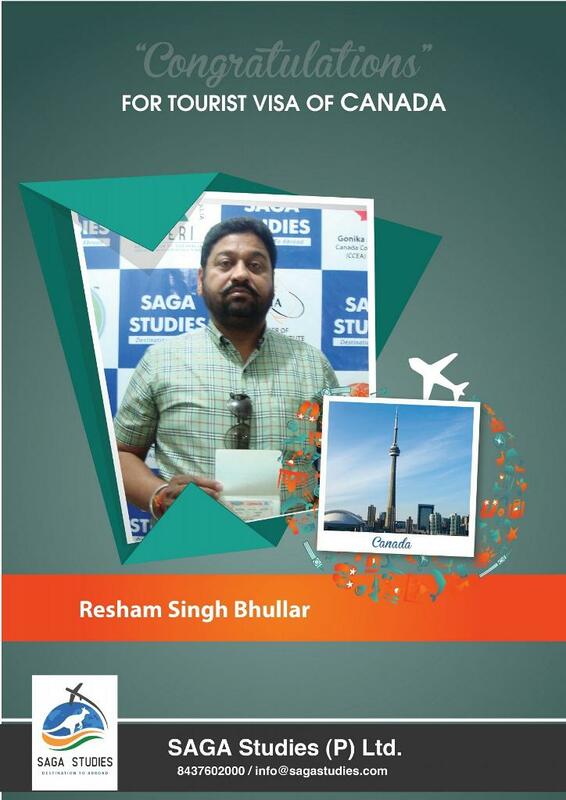 Congratulations Resham Singh Bhullar. He got tourist visa of Australia. 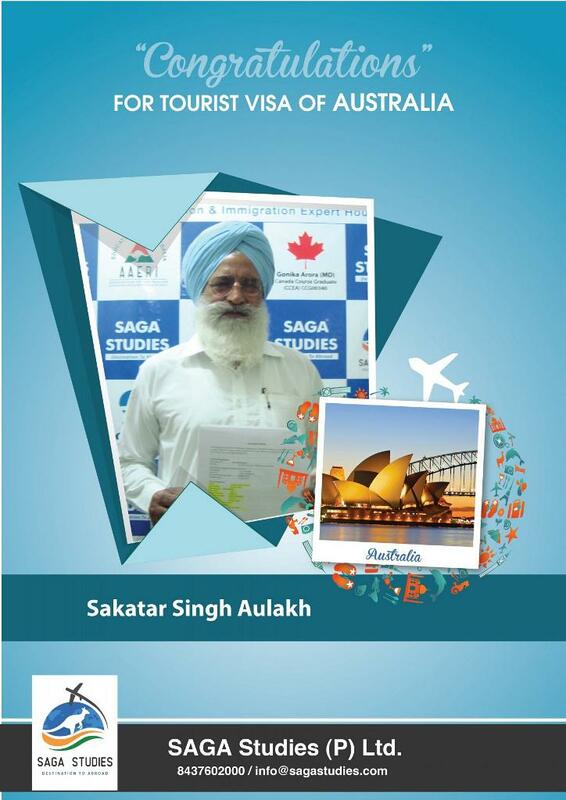 Congratulations Sakatar Singh Aulakh. 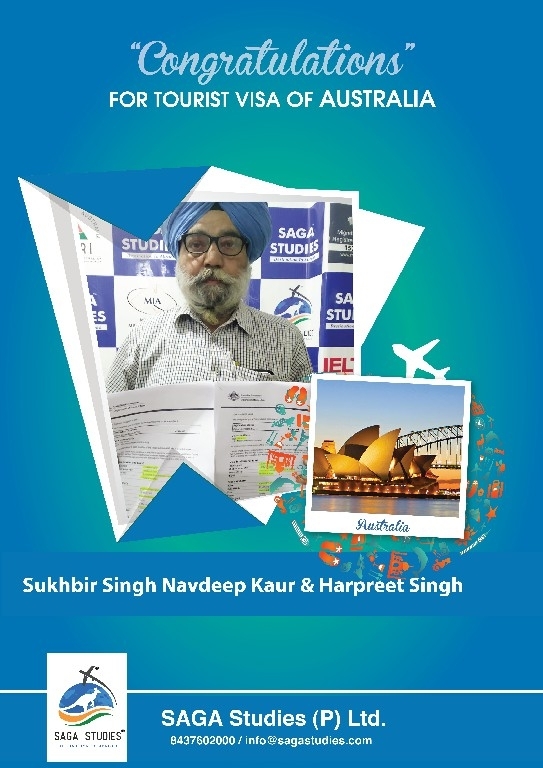 He got tourist visa of Australia. Congratulations Saroj Bala. 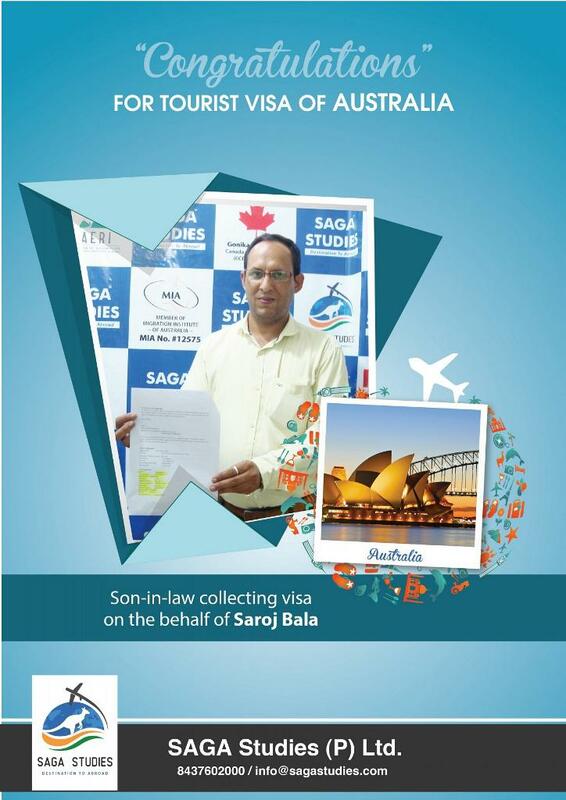 Her Son-in-law collecting tourist visa of Australia on the behalf of Saroj Bala. 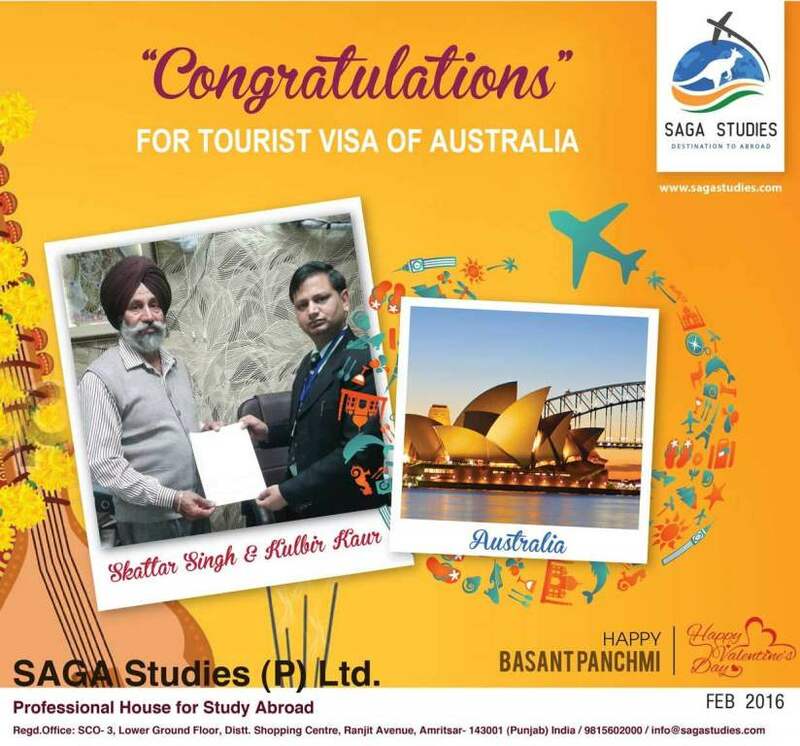 Congratulations Satpal Singh Nijjar & Malkit Kaur. They got tourist visa of Australia. 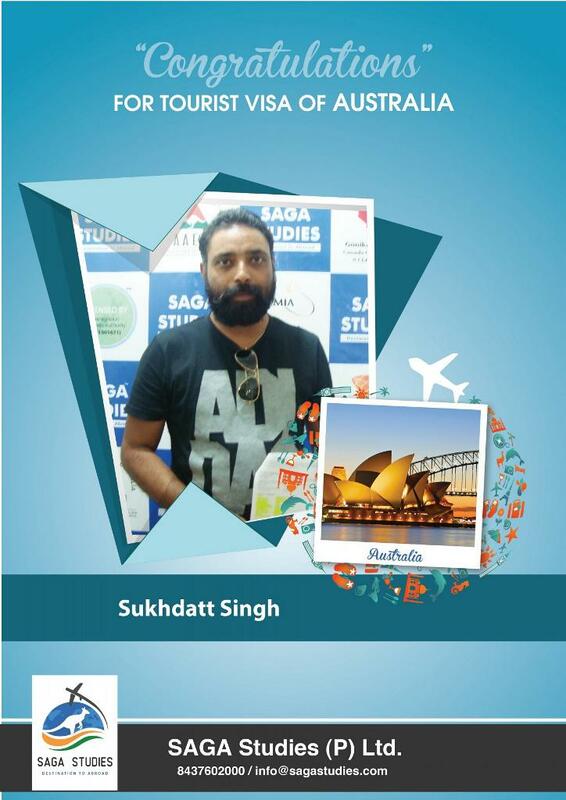 Congratulations Sukhdatt Singh. 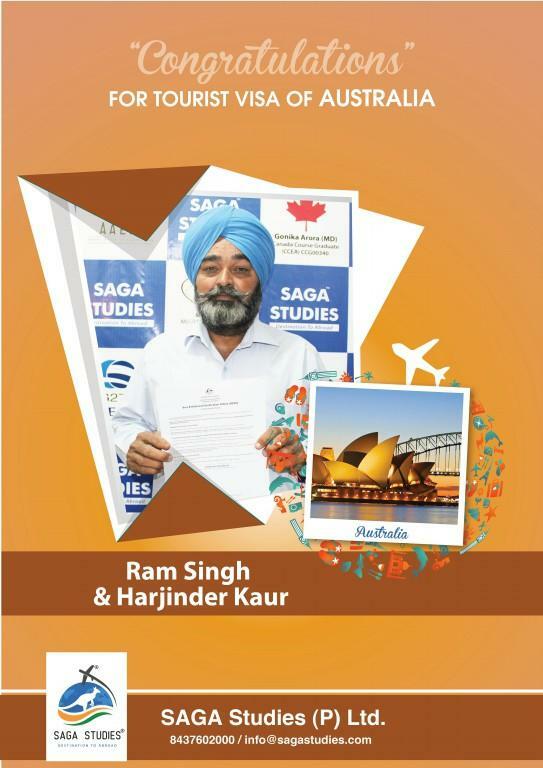 He got tourist visa of Australia. Congratulations Sukhwinder Singh & Satwinder Kaur. They got tourist visa of Australia. 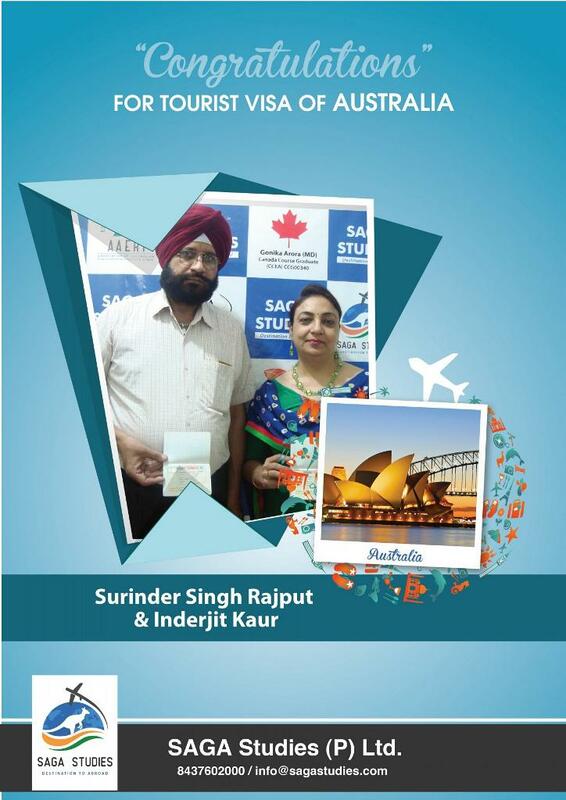 Congratulations Surinder Singh Rajput & Inderjit Kaur. They got tourist visa of Australia. Congratulations Surinder Kaur. 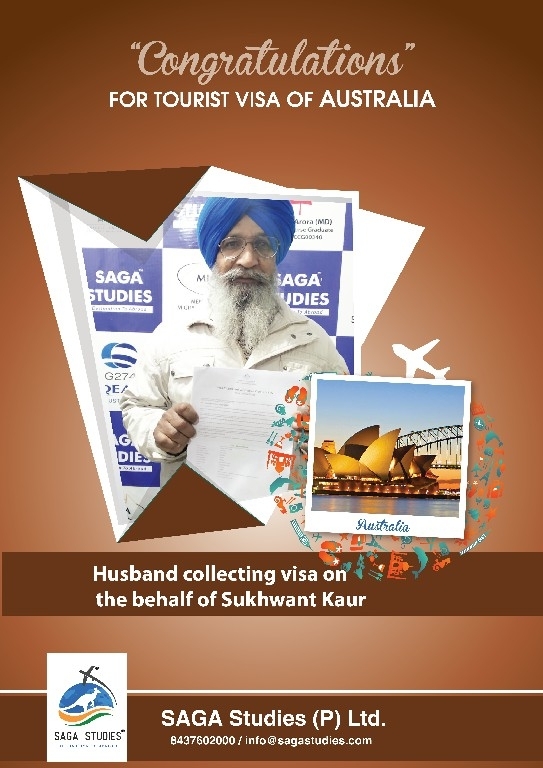 Her husband collecting tourist visa of Australia on the behalf of Surinder Kaur. Congratulations Surinder Singh Chinna. 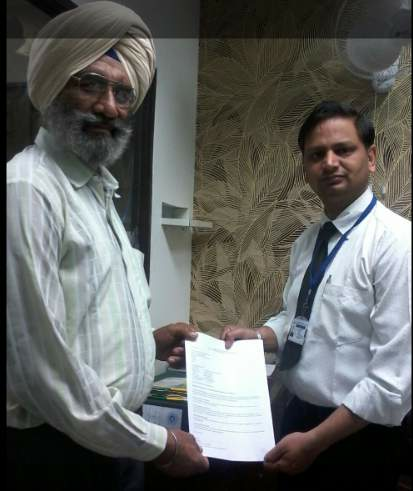 He got tourist visa of Australia. Congratulations Amarjit Kaur. She got tourist visa of Australia. 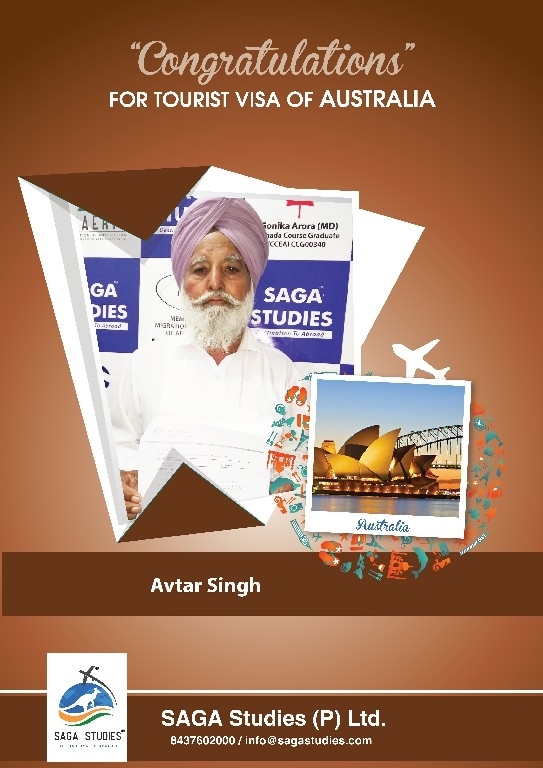 Congratulations Avtar Singh. He got tourist visa of Australia. 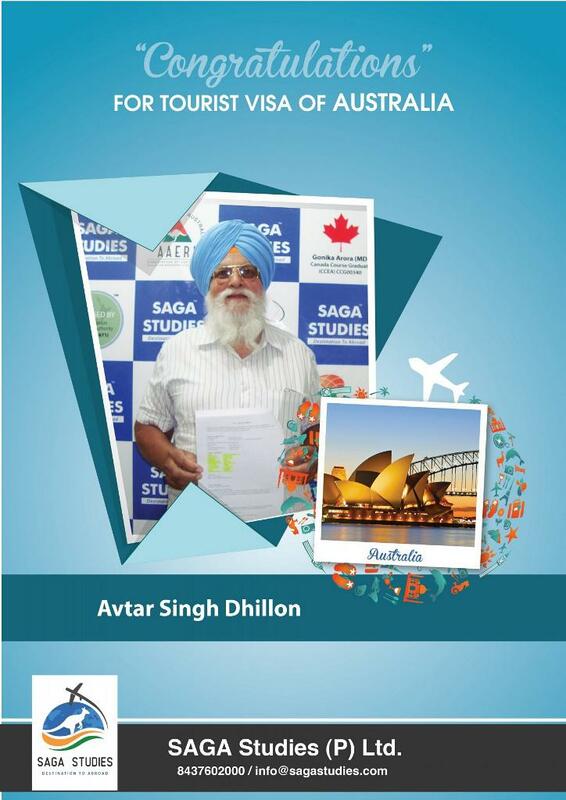 Congratulations Avtar Singh Dhillon. 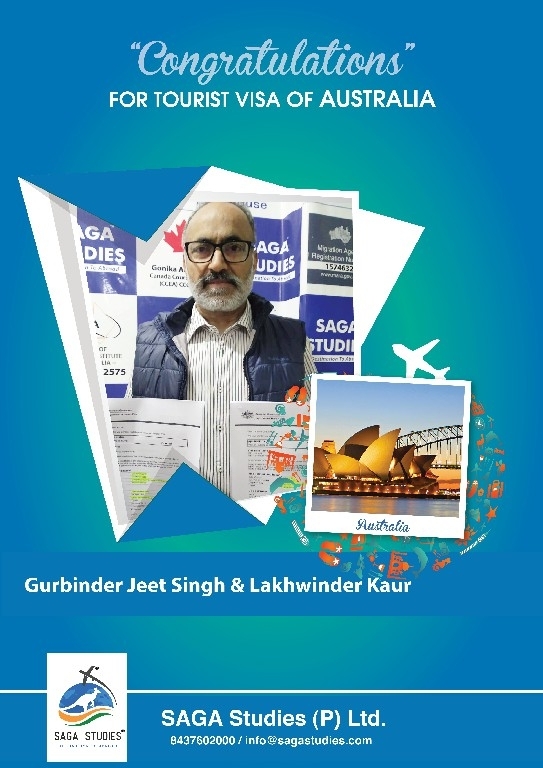 He got tourist visa of Australia. 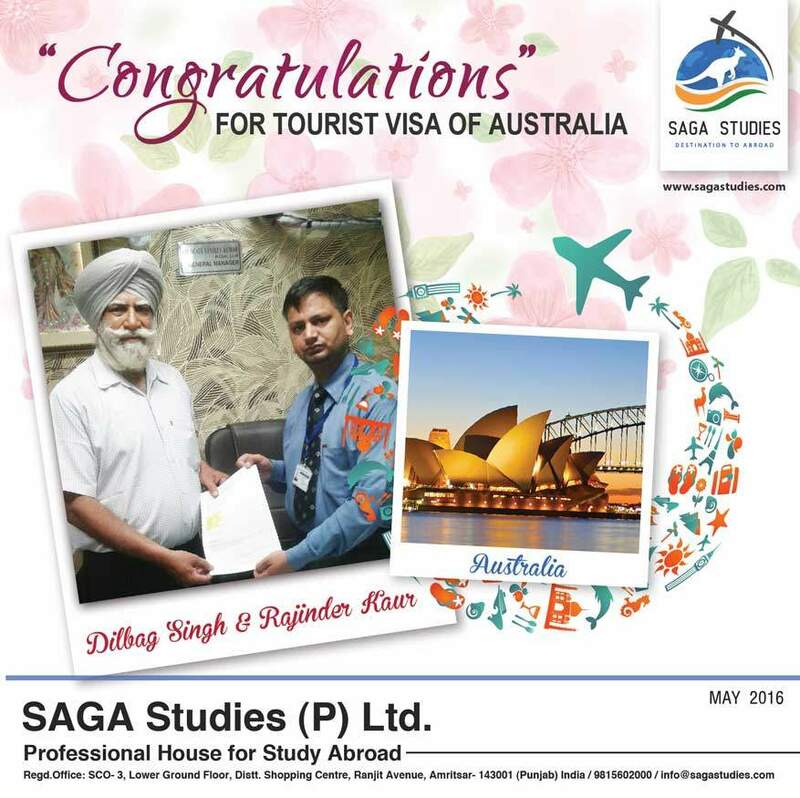 Congratulations Balbir Singh. He got tourist visa of Australia. Congratulations Balwinder Kaur. 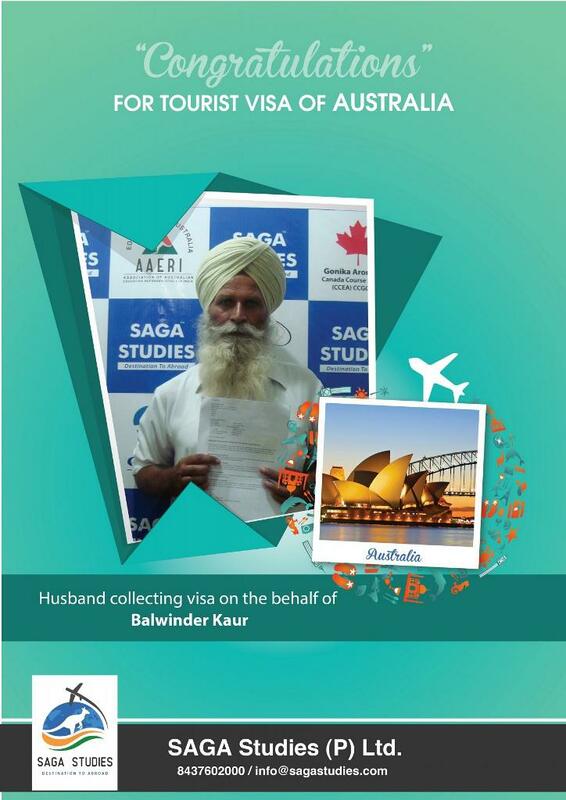 Her husband collecting tourist visa of Australia on the behalf of Balwinder Kaur. 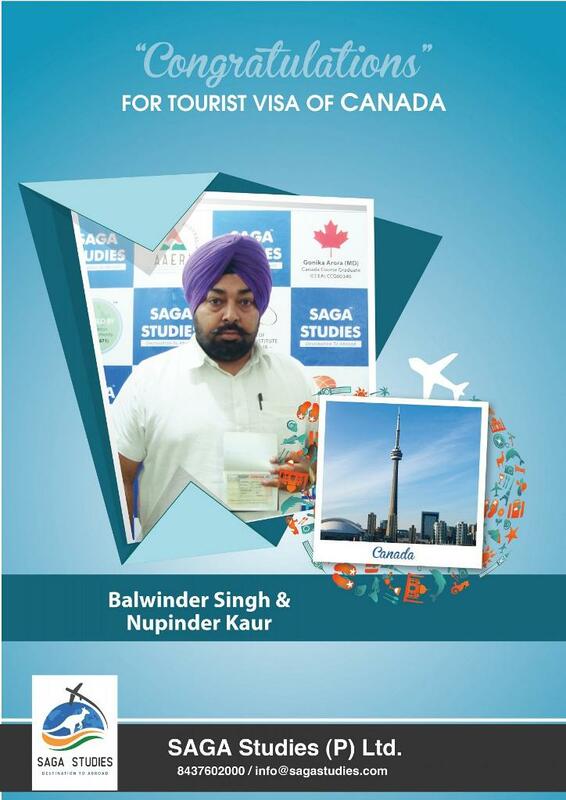 Congratulations Balwinder Singh & Nupinder Kaur. He got tourist visa of Canada. Congratulations Balwinder Singh Khehra & his wife. They got tourist visa of Australia. Congratulations Davinder Kaur. She got tourist visa of Australia. Congratulations Gurmeet Kaur. Her husband collecting tourist visa of Australia on the behalf of Gurmeet Kaur. Congratulations Gurmeet Kaur. 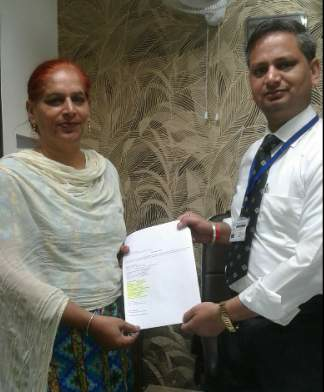 Her son collecting tourist visa of Australia on the behalf of Gurmeet Kaur. Congratulations Jai Singh. 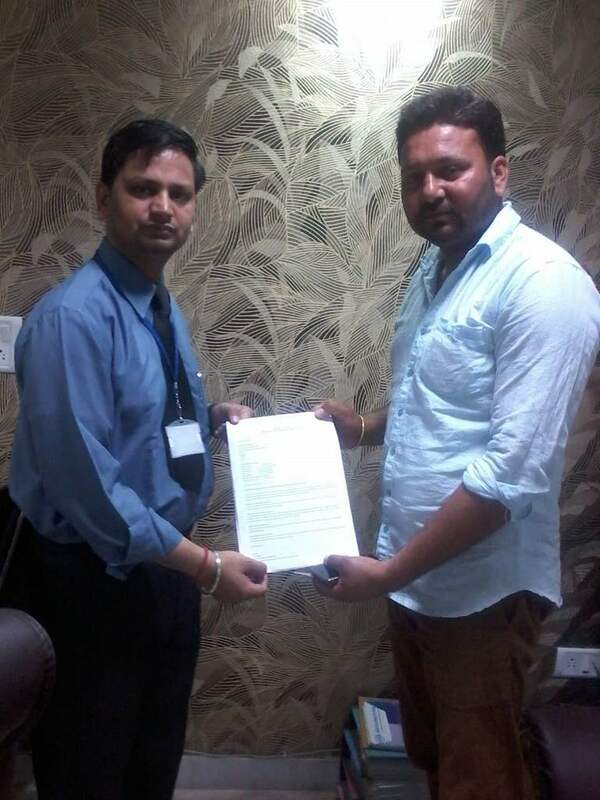 He got tourist visa of Australia. 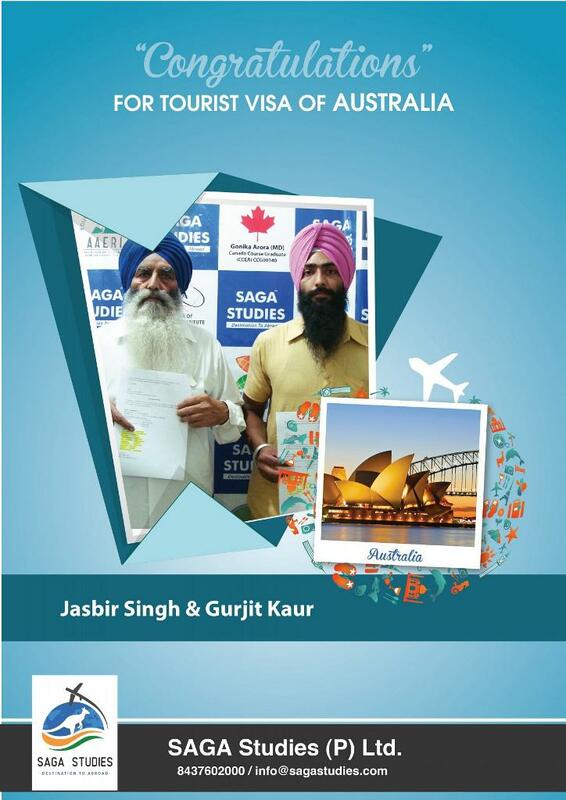 Congratulations Jasbir Singh & Gurjit Kaur. They got tourist visa of Australia. 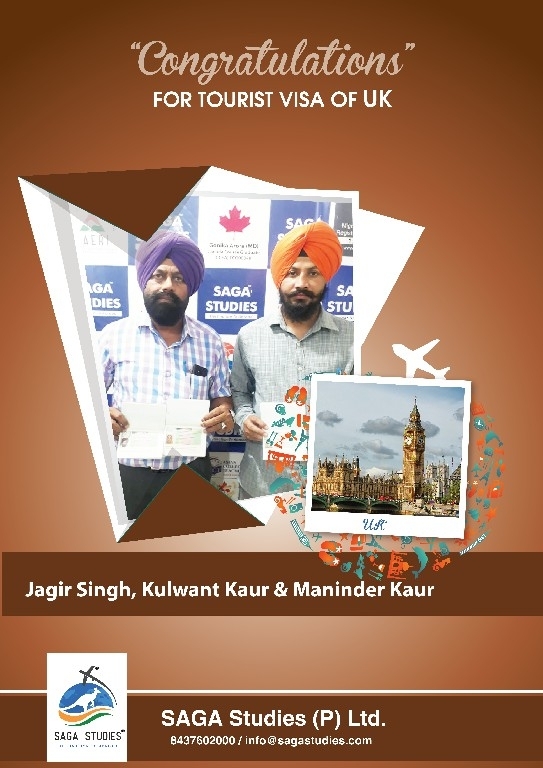 Congratulations Jasjit Singh & Jaswinder Kaur. They got tourist visa of Australia. 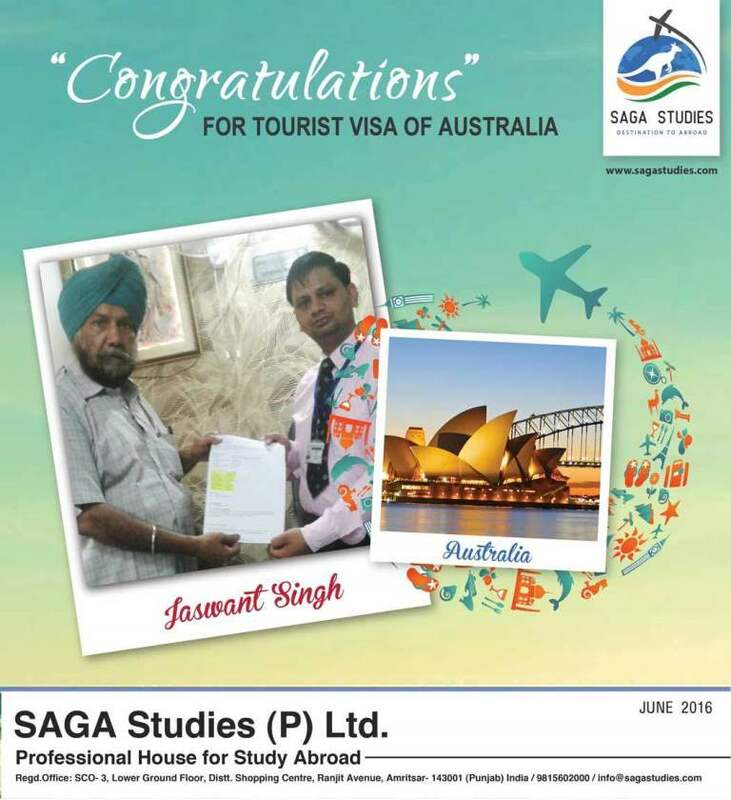 Congratulations Jaswant Singh. 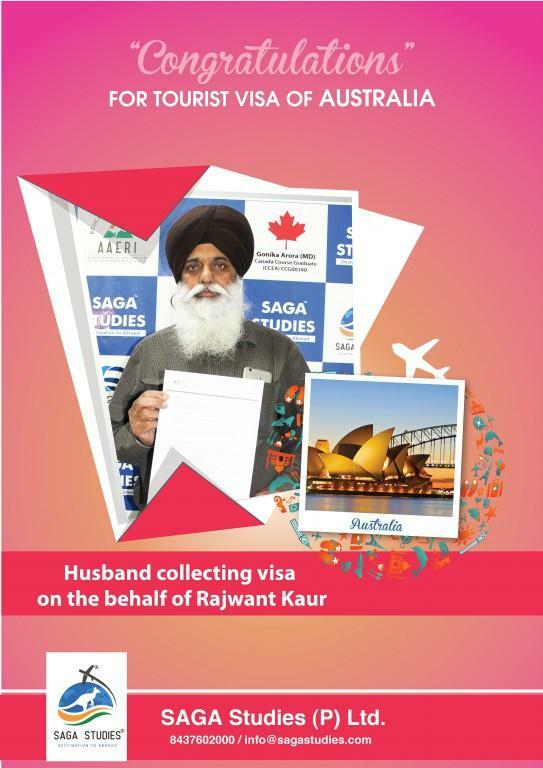 His Daughter-in-law collecting tourist visa of Australia on the behalf of Jaswant Singh. Congratulations Joginder Kaur. She got tourist visa of Australia. 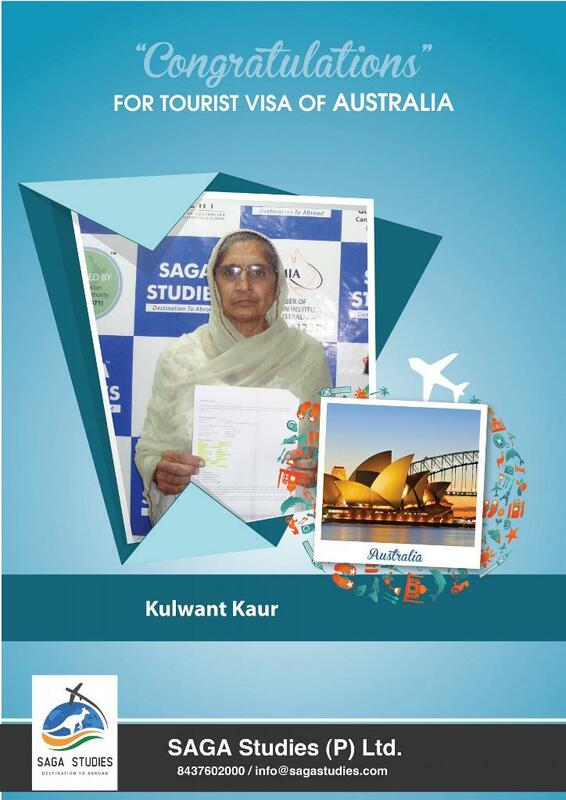 Congratulations Kulwant Kaur. She got tourist visa of Australia. Congratulations Kulwant kaur. 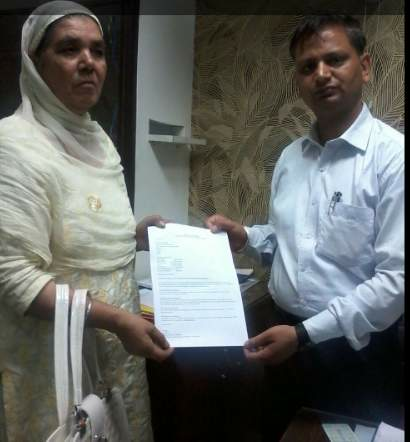 Her son collecting tourist visa of Australia on the behalf of Kulwant kaur. Congratulations Navjot Kaur & her Father-in-law. They got tourist visa of Australia. 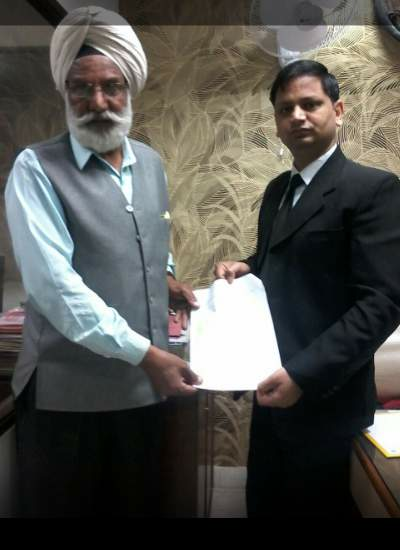 Congratulations Nirmaljit Kaur. She got tourist visa of Australia. Congratulations Parveen Kumari. 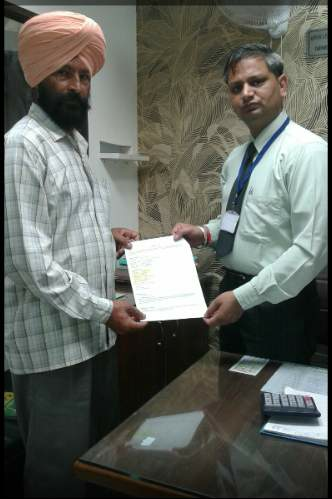 Her brother collecting tourist visa of Australia on the behalf of Parveen Kumari. Congratulations Parveen Kumari. 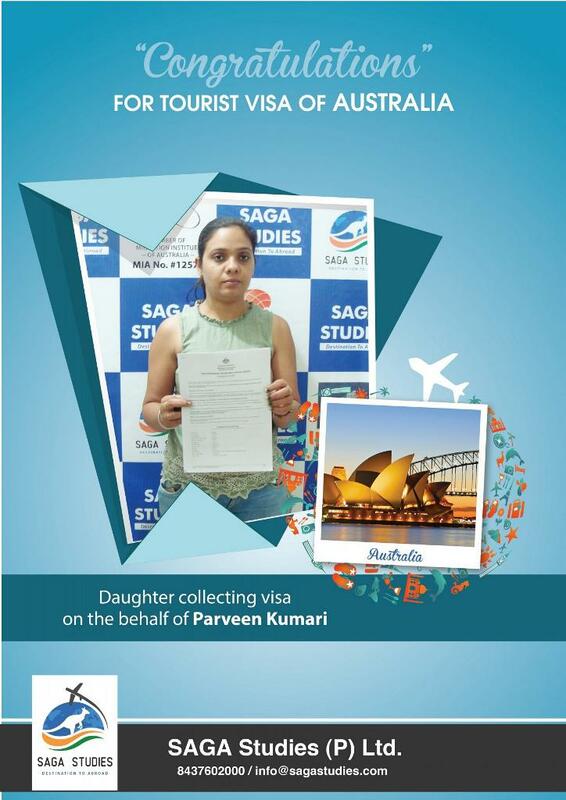 Her daughter collecting tourist visa of Australia on the behalf of Parveen Kumari. Congratulations Rajinder Singh & Sukhwinder Kaur. They got tourist visa of Australia. Congratulations Balwinder Singh. He is a businessman & Inderjit Kaur is Principle of Sacred Souls Public School, Amritsar. He got tourist visa of Australia. 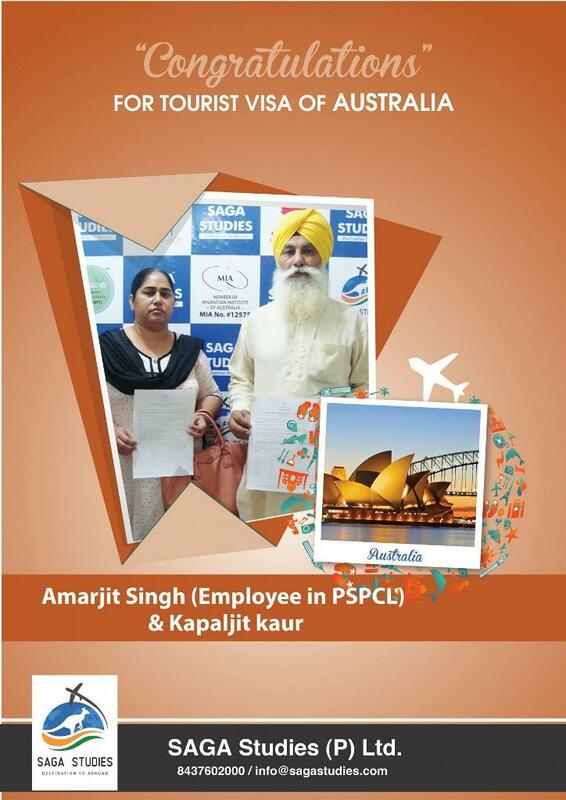 Congratulations Amarjit Singh & Kapaljit Kaur. They got tourist visa of Australia. 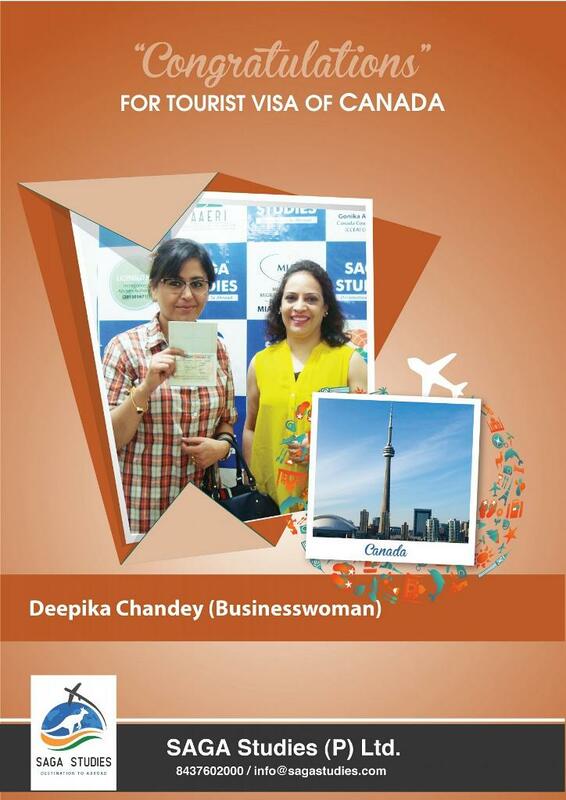 Congratulations Deepika Chandey. She is a Businesswoman. 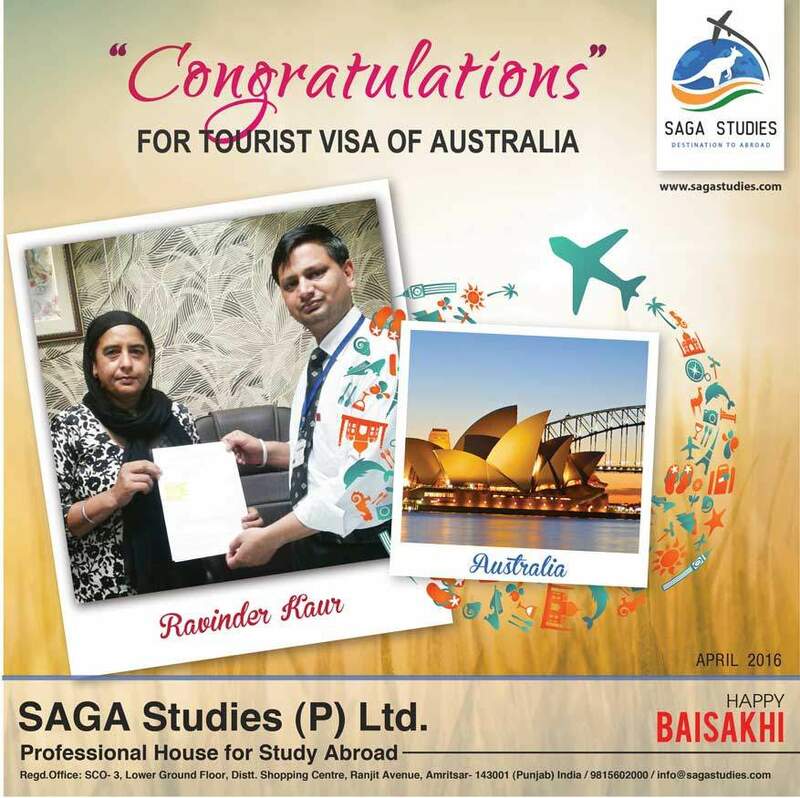 She got tourist visa of Australia. 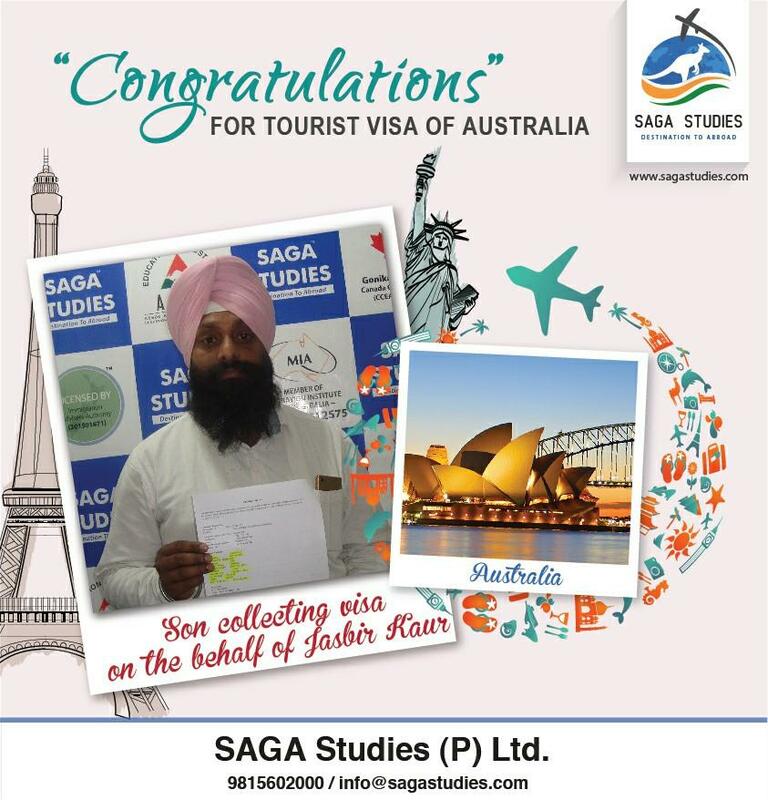 Congratulations Jasbir Singh Arora. 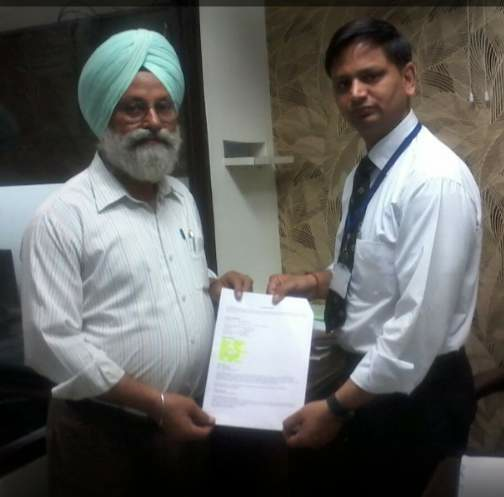 He is Retired as Assistant general manager from Punjab & Sindh Bank. 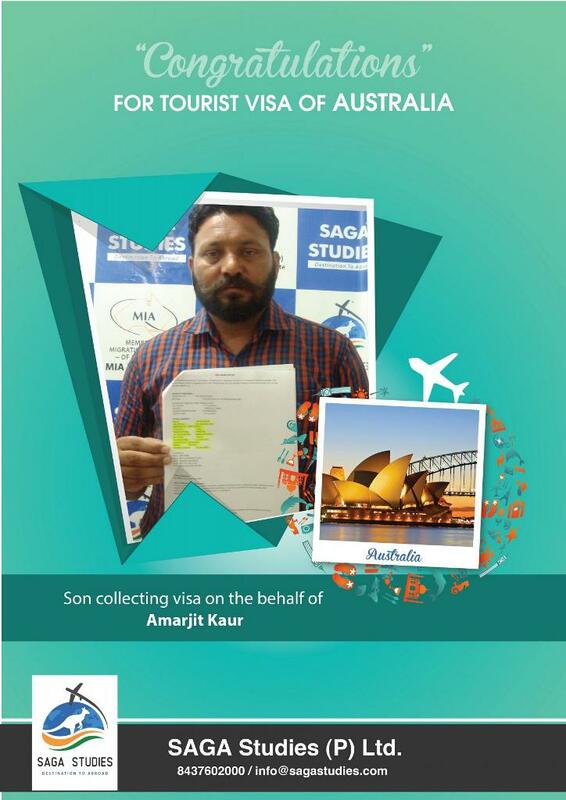 He got tourist visa of Australia. Congratulations Narinder Kaur & Gurmeet Kaur. They got tourist visa of Australia. Congratulations Nirmal Singh. 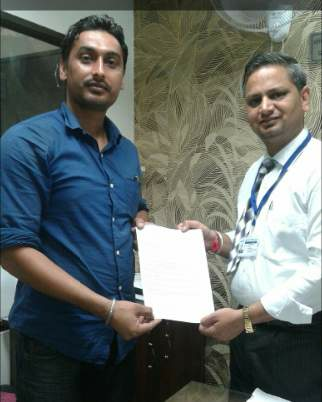 He got tourist visa of Australia. Congratulations Nirmaljit Singh. He got tourist visa of Australia. Congratulations Rajwinder Kaur. 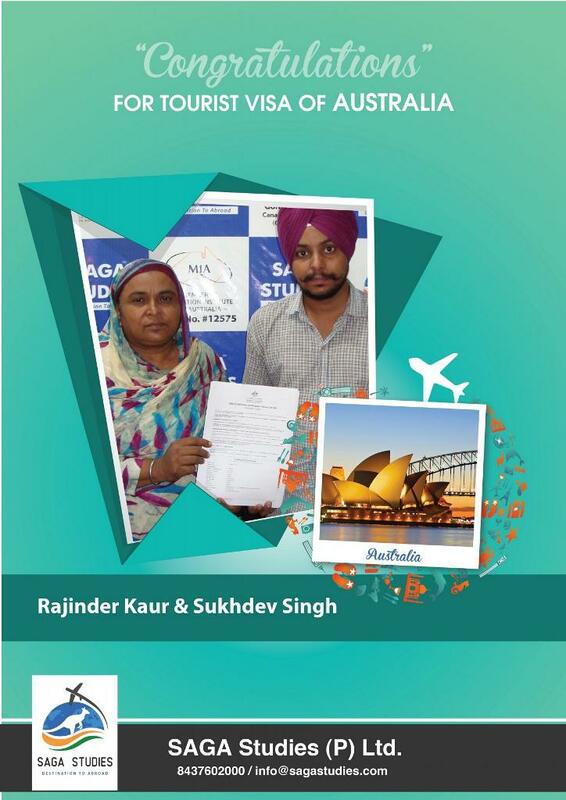 Her son collecting tourist visa of Australia on the behalf of Rajwinder Kaur. Congratulations Rani. Her husband collecting tourist visa of Australia on the behalf of Rani. Congratulations Sandeep Kaur. 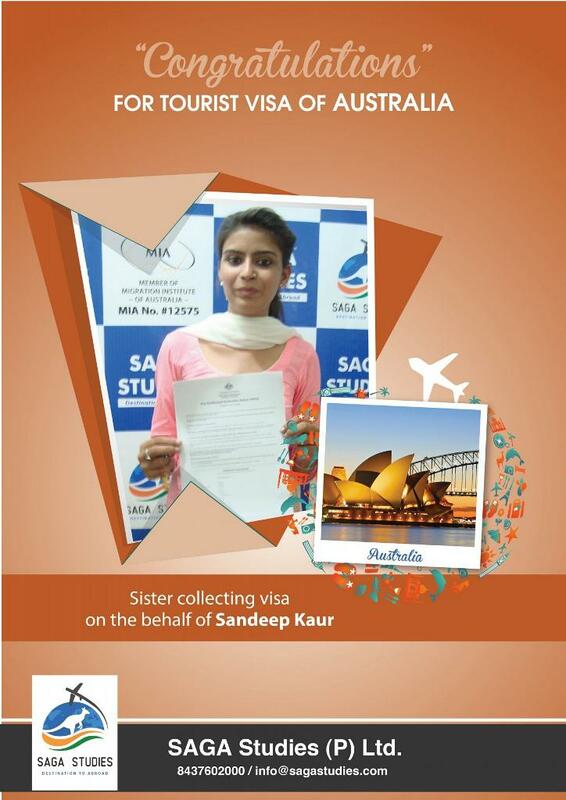 Her sister collecting tourist visa of Australia on the behalf of Sandeep Kaur. Congratulations Sarbhjeet Singh & Malwider Kaur. They got tourist visa of Canada. 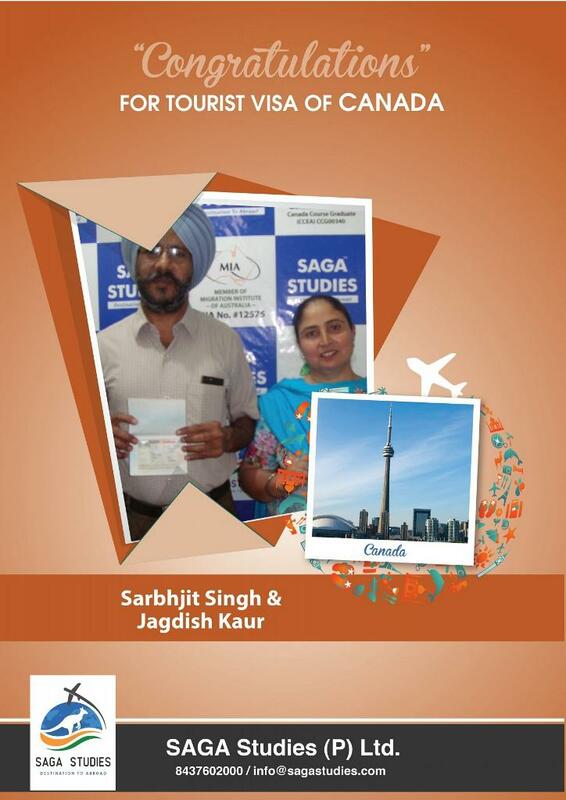 Congratulations Sarbhjit Singh & Jagdish Kaur. They got tourist visa of Canada. Congratulations Shashi Bhalla. She got tourist visa of Australia. 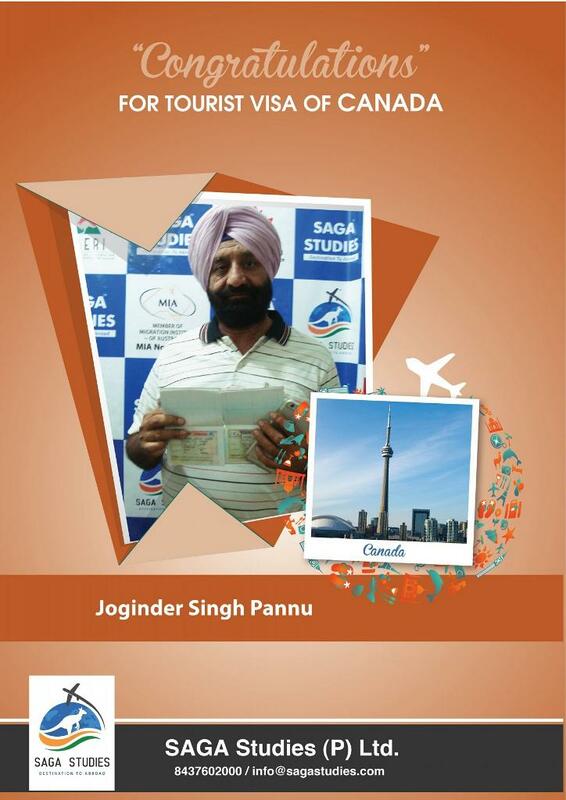 Congratulations Joginder Singh Pannu. He got tourist visa of Canada. 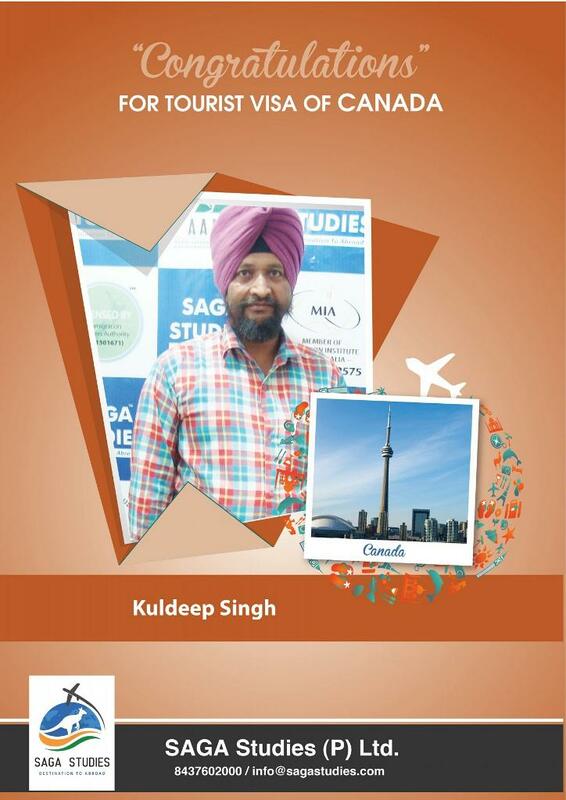 Congratulations Kuldeep Singh. He got tourist visa of Canada. 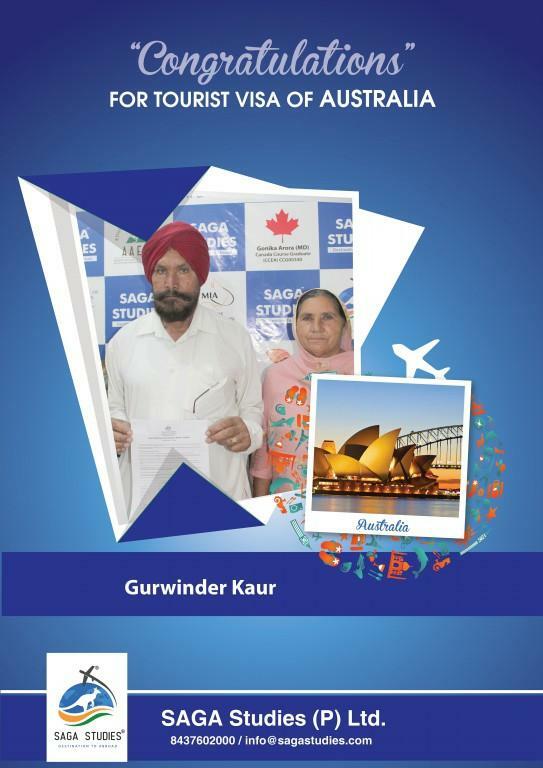 Congratulations Sukhdev Singh & Palwinder Kaur. They got tourist visa of Australia. 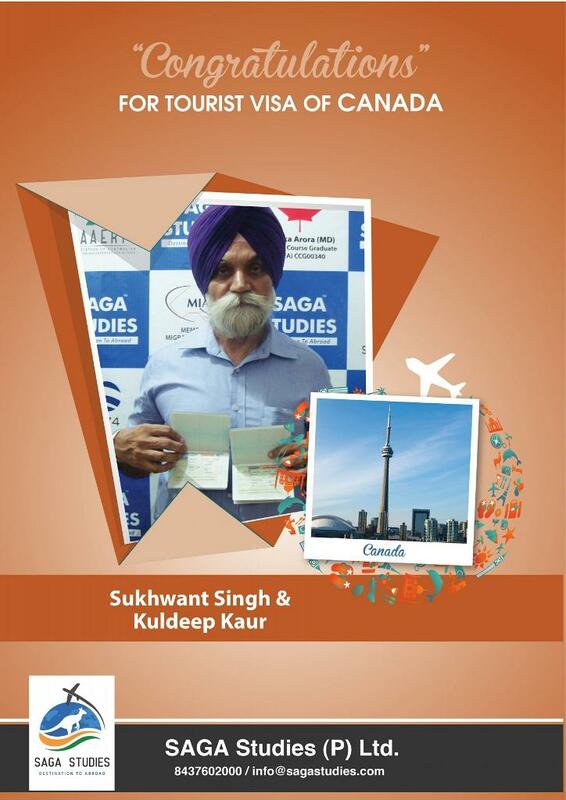 Congratulations Sukhwant Singh & Kuldeep Kaur. They got tourist visa of Canada. 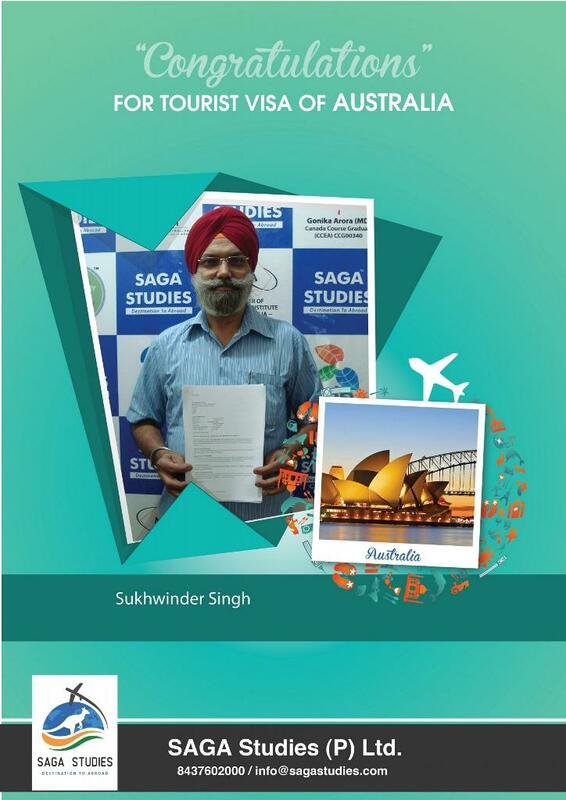 Congratulations Sukhwinder Singh. He got tourist visa of Australia. 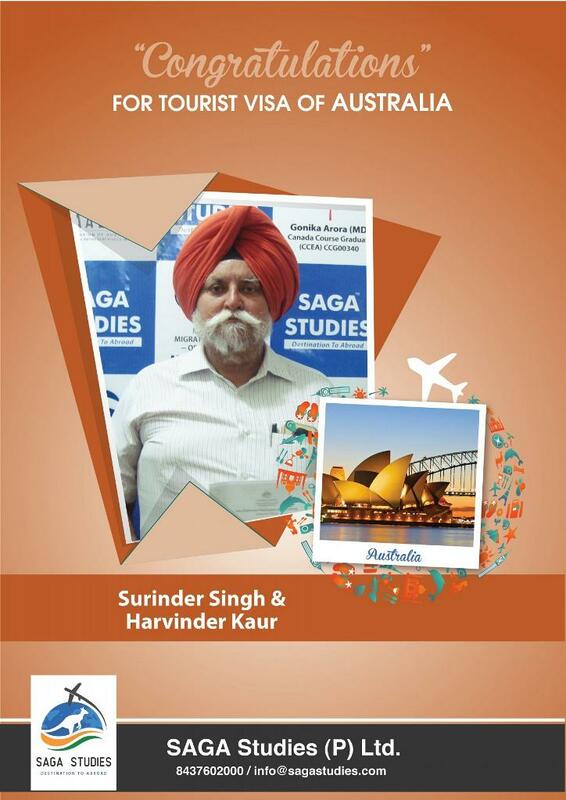 Congratulations Surinder Singh & Harvinder Kaur. They got tourist visa of Australia. 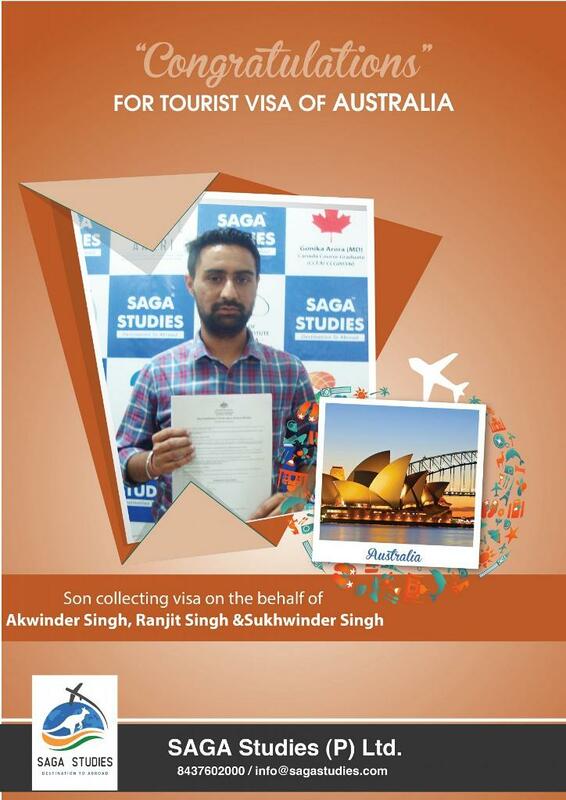 Congratulations Akwinder Singh, Ranjit Singh & sukhwinder Singh. 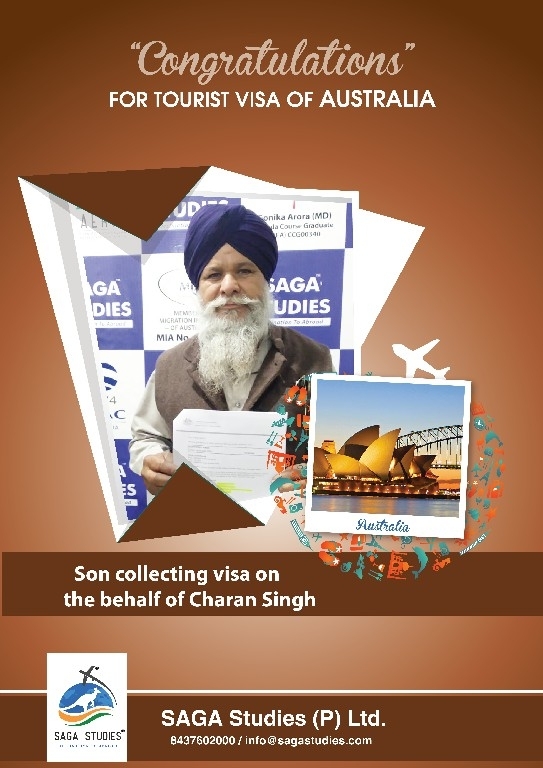 Their son collecting tourist visa of Australia on the behalf of them. 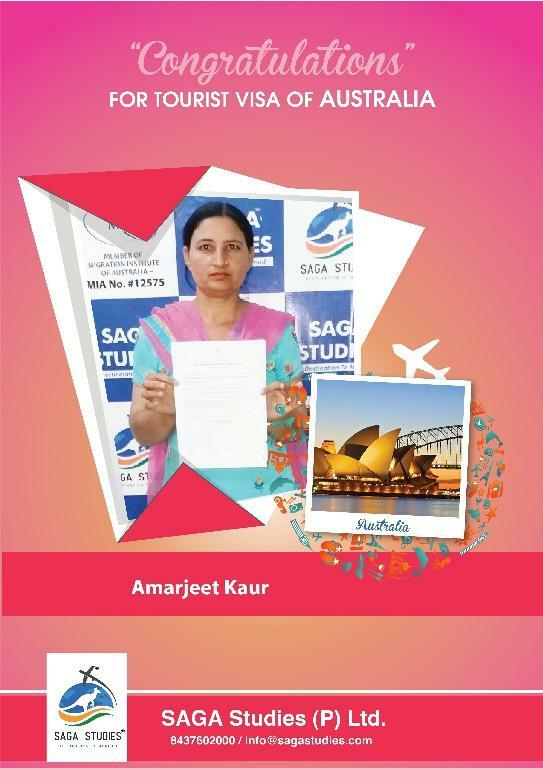 Congratulations Amarjeet Kaur. 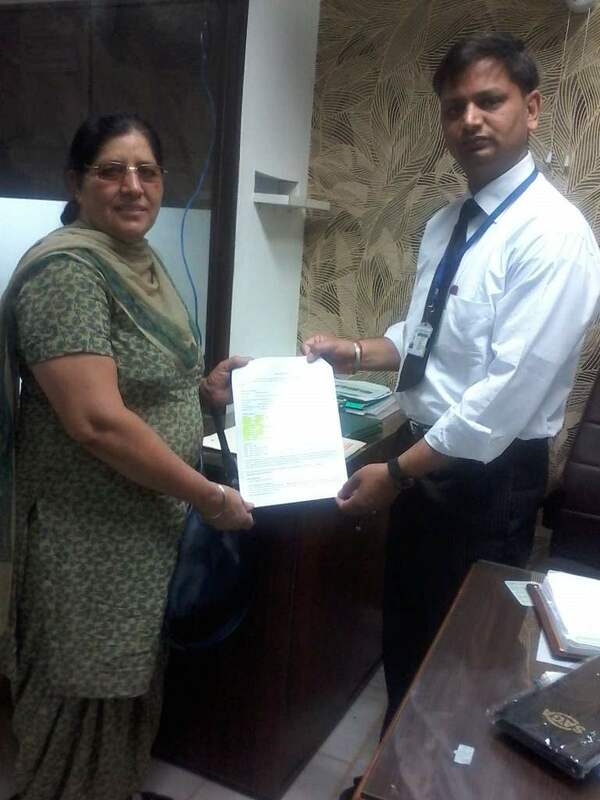 Her son collecting tourist visa of Australia on the behalf of Amarjeet Kaur. Congratulations Amarjit Singh and Kapaljit Kaur. They got tourist visa of Australia. 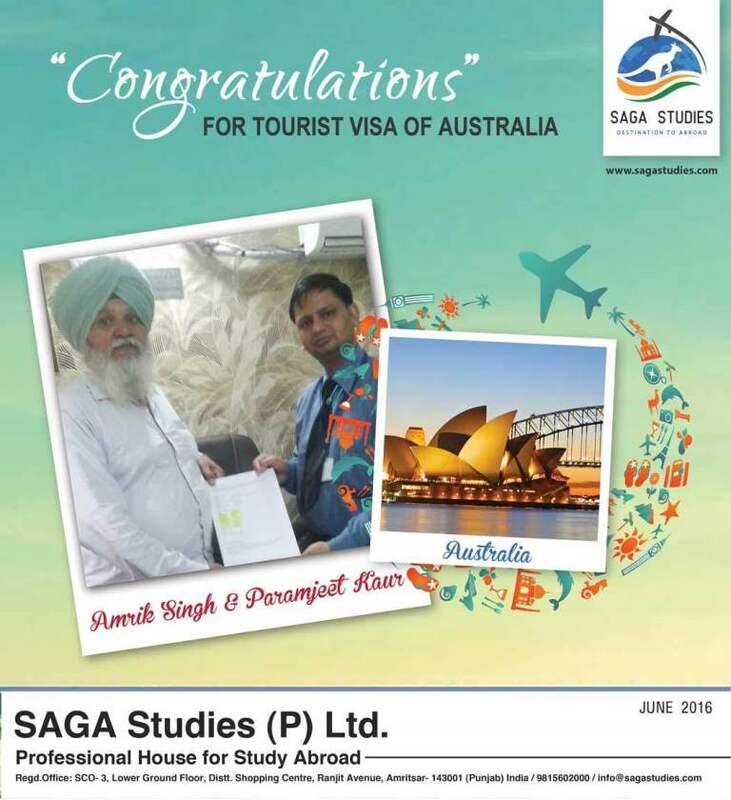 Congratulations Angrej Singh. 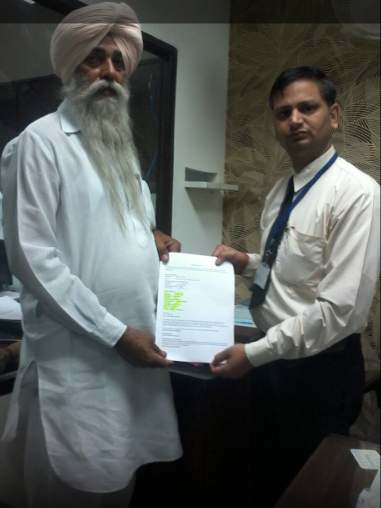 His son collecting tourist visa of Australia on the behalf of Angrej Singh. Congratulations Bal Krishan. 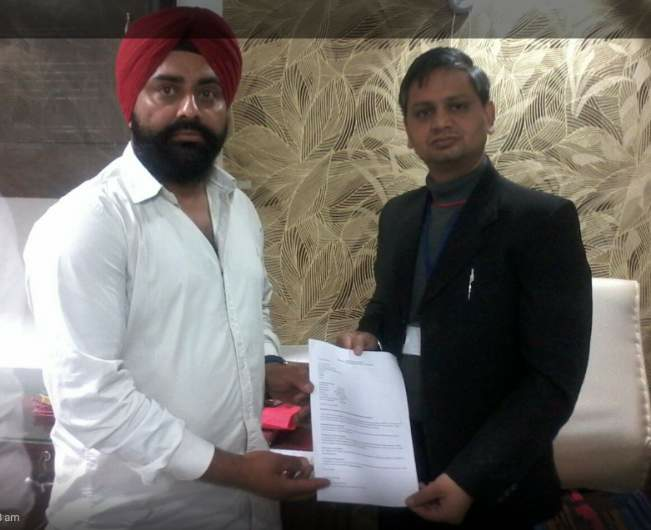 He got tourist visa of Australia. 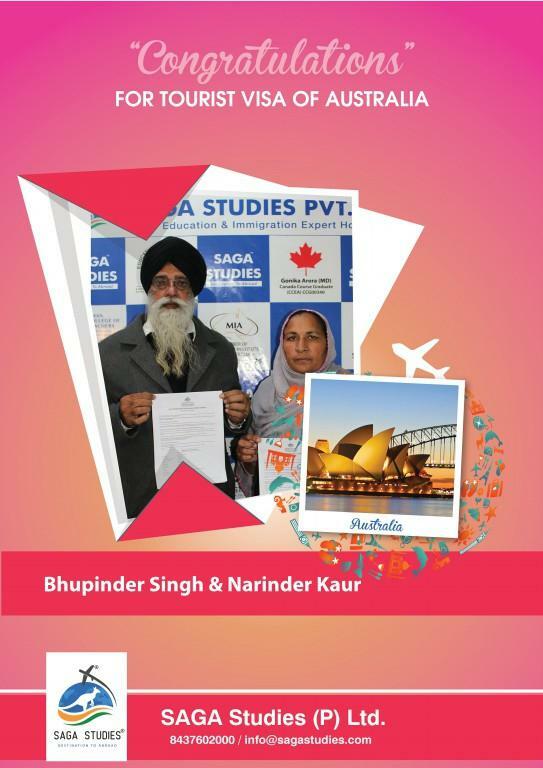 Congratulations Bhupinder Singh & Manjit Kaur. They got tourist visa of Australia. Congratulations Harbhajan Singh. 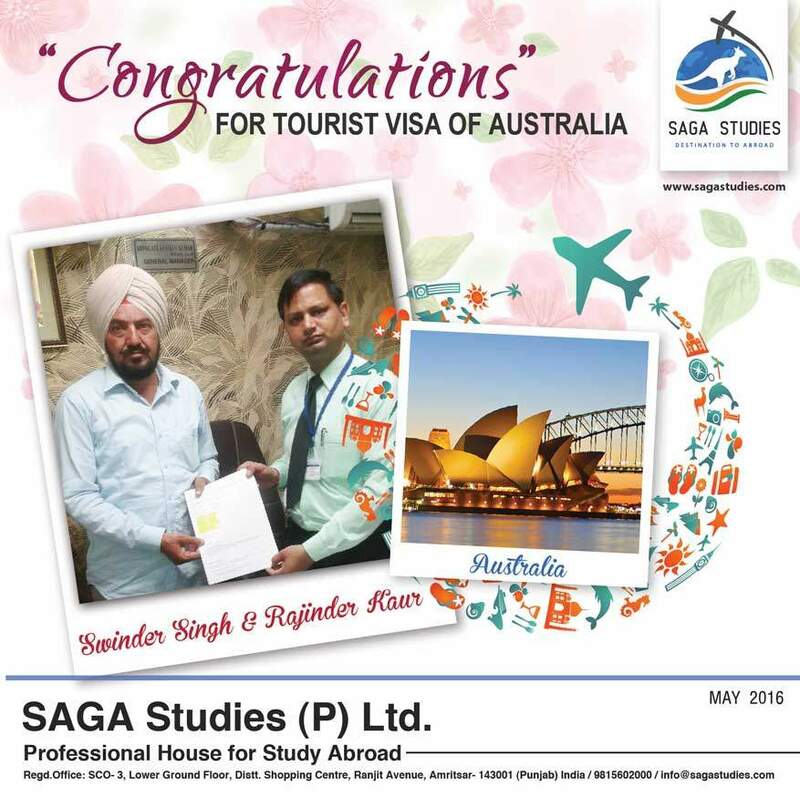 He got tourist visa of Australia. 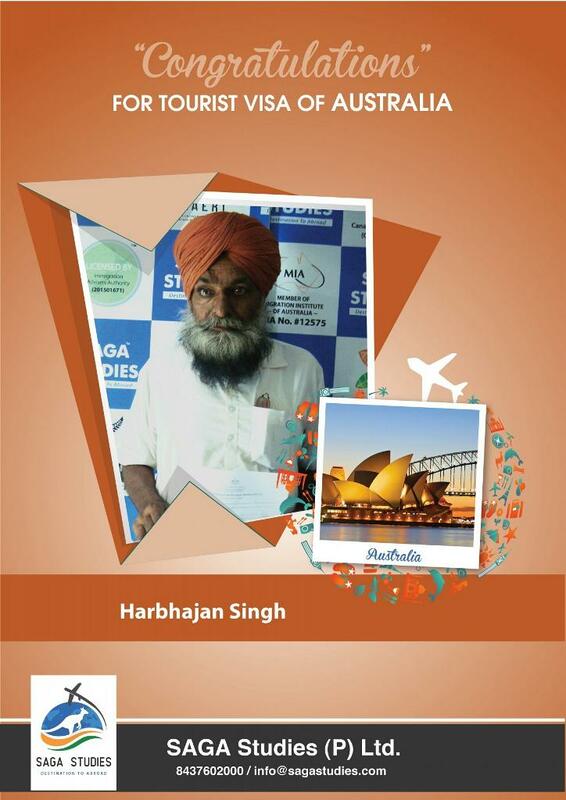 Congratulations Harbhinder Kaur. 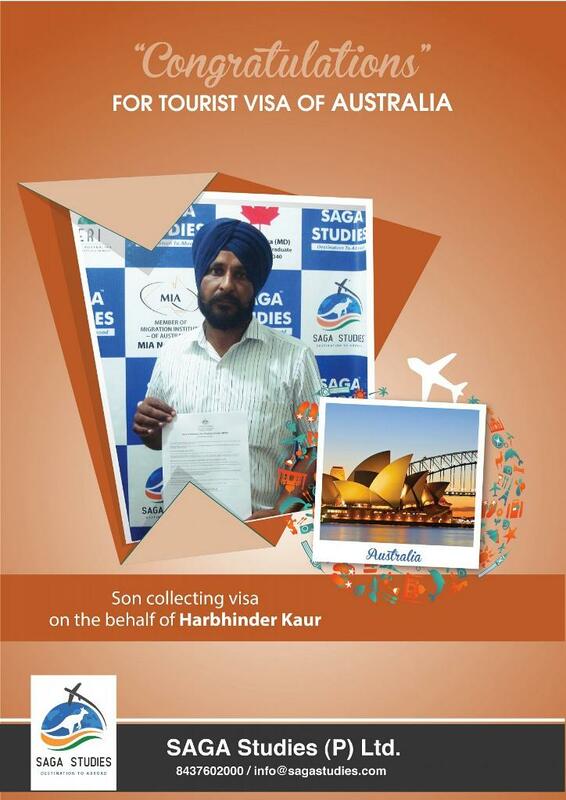 Her son collecting tourist visa of Australia on the behalf of Harbhinder Kaur. 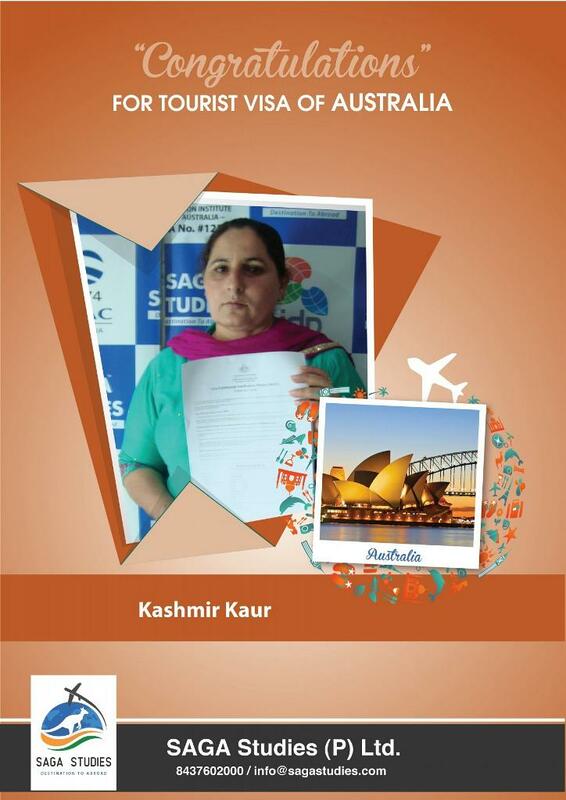 Congratulations Kashmir Kaur.She got tourist visa of Australia. 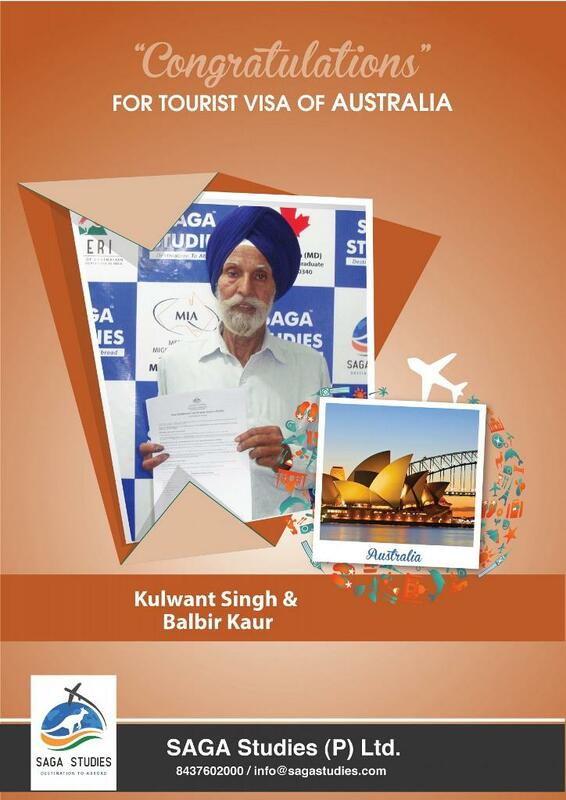 Congratulations Kulwant Singh & Balbir Kaur. They got tourist visa of Australia. Congratulations Kulwinder Kaur. She got tourist visa of Australia. 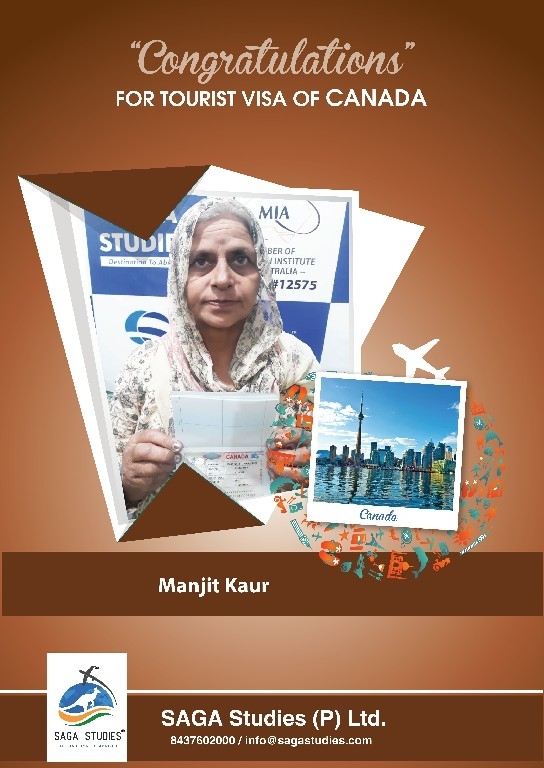 Congratulations Manjit kaur. She got tourist visa of Australia. Congratulations Manmohan Singh. 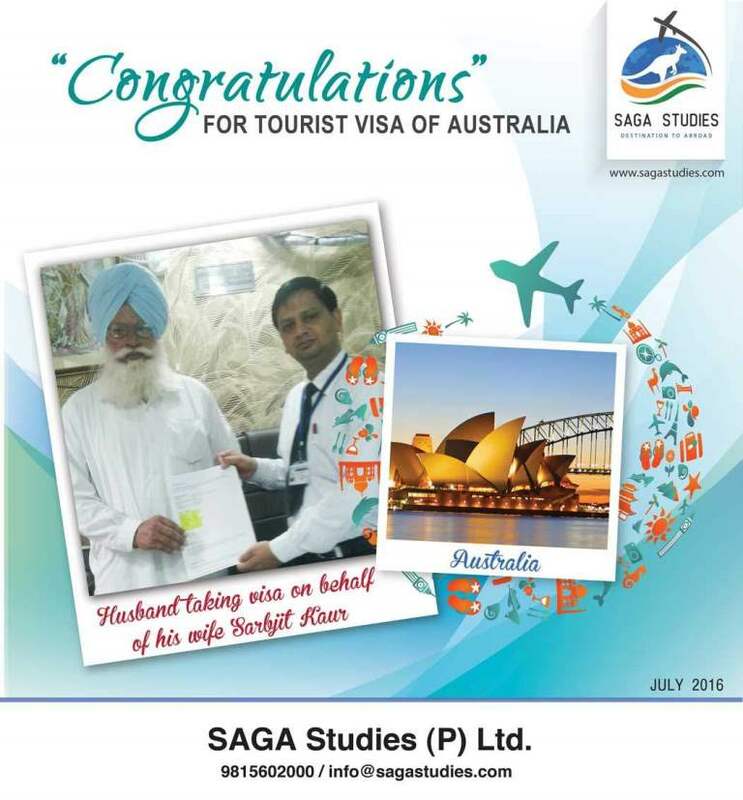 He got tourist visa of Australia. Congratulations Jaswinder kaur & Jasjit Singh. 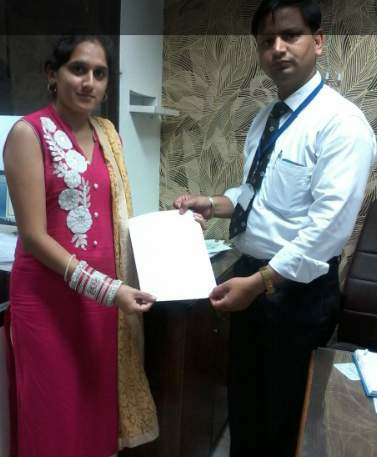 Jaswinder kaur is working in Health & Family Welfare Dept. & Jasjit Singh is a Businessman. They got tourist visa of Australia. 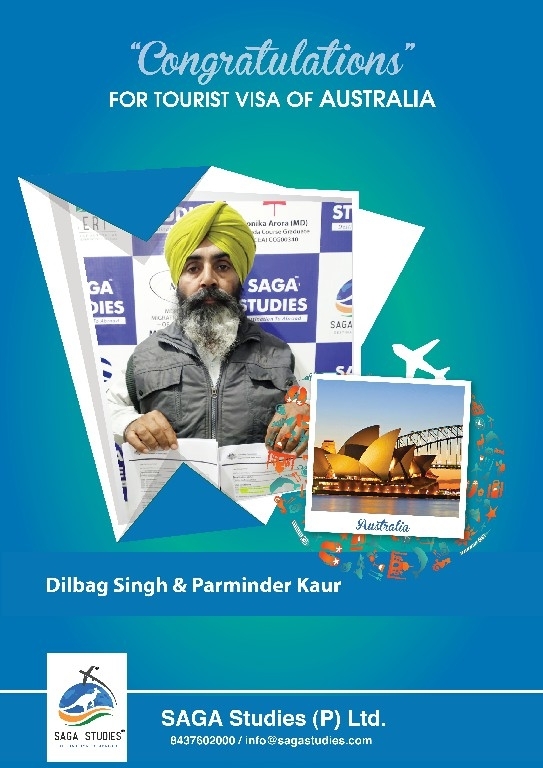 Congratulations Balbir Singh & Daljit Kaur. 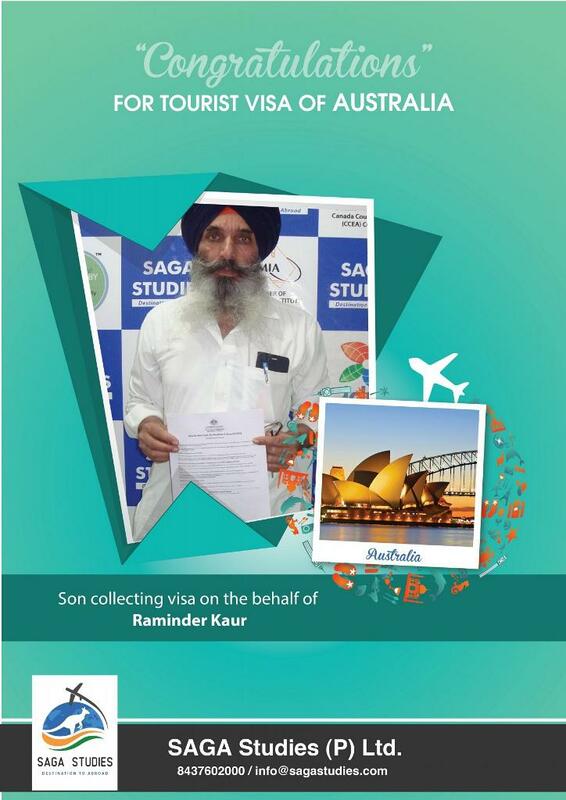 Their son collecting tourist visa of Australia on the behalf of Balbir Singh & Daljit Kaur. 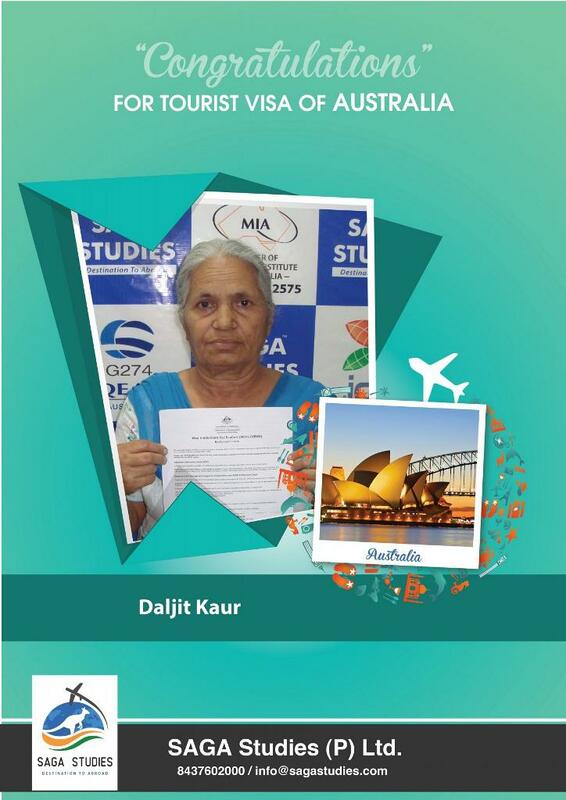 Congratulations Daljit Kaur. She got tourist visa of Australia. 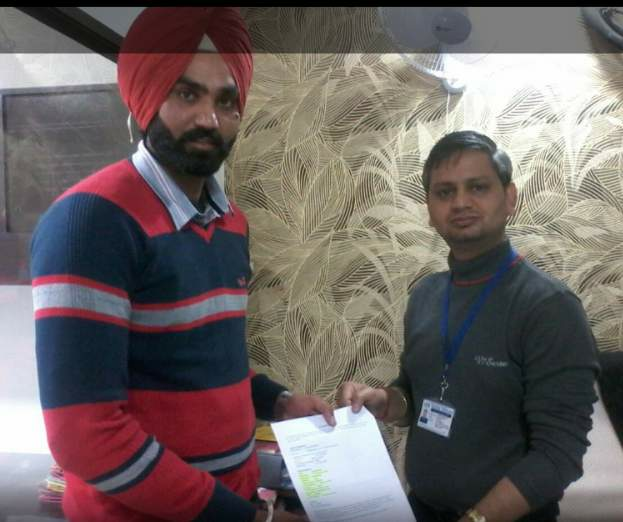 Congratulations Gurmeet Singh. 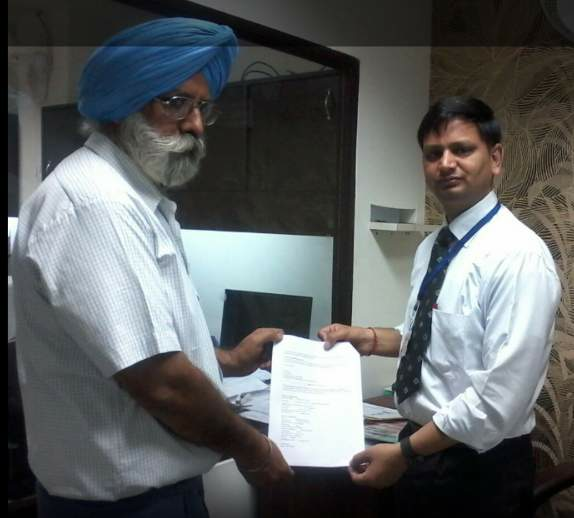 He got tourist visa of Australia. 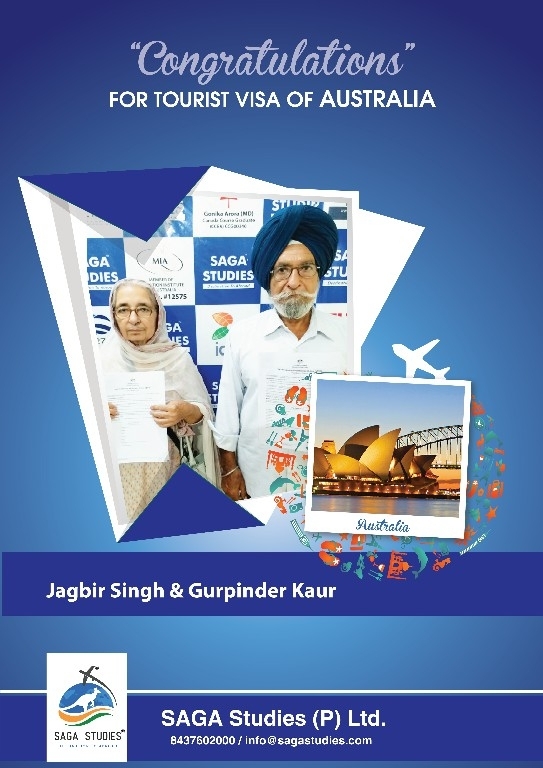 Congratulations Jaswant Singh & Joginder Kaur. They got tourist visa of Australia. 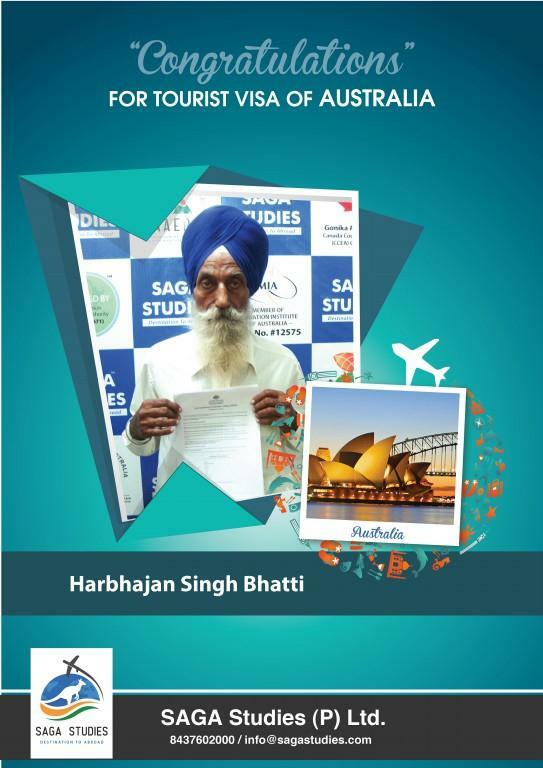 Congratulations Harbhinder Kaur. 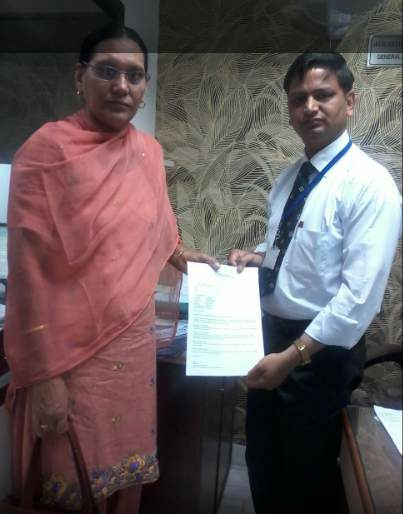 Her son collecting tourist visa of Australia on the behalf of Australia. 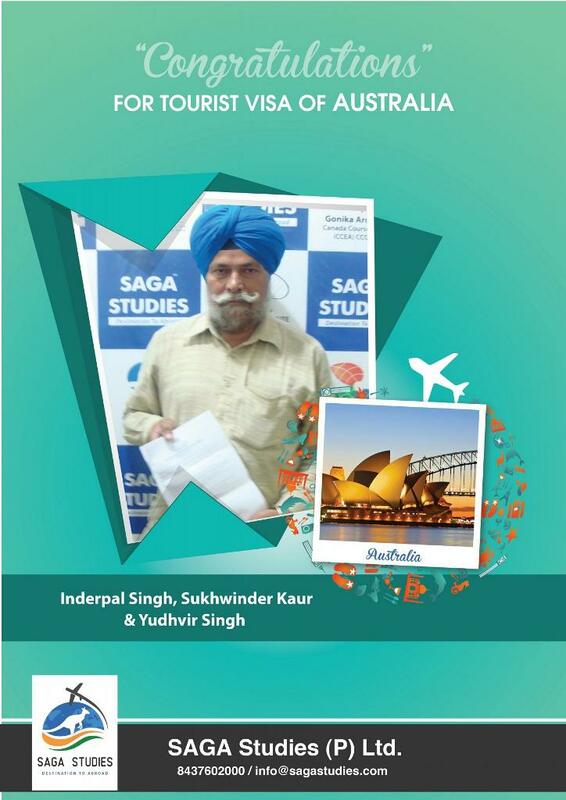 Congratulations Inderpal Singh, Sukhwinder Kaur & Yudhvir Singh. They got tourist visa of Australia. 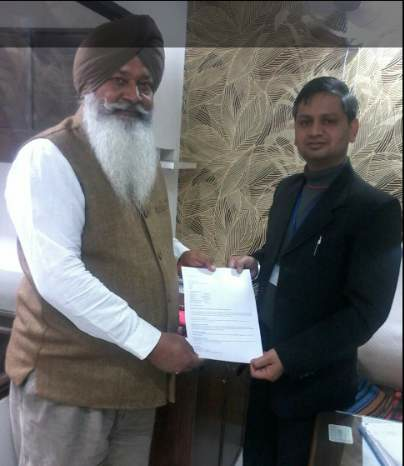 Congratulations Jagatbir Singh. 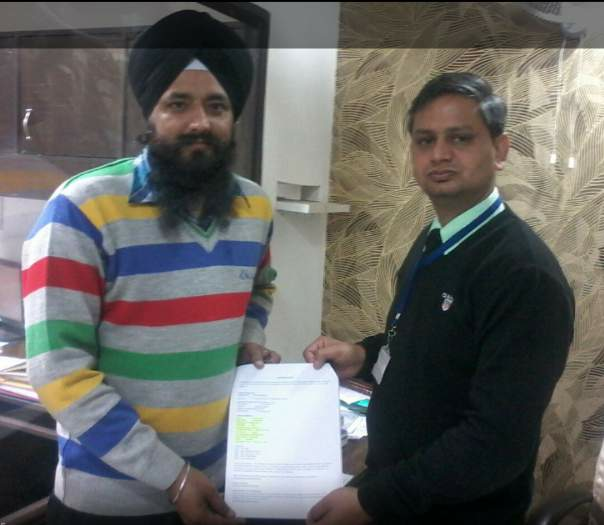 He got tourist visa of Australia. 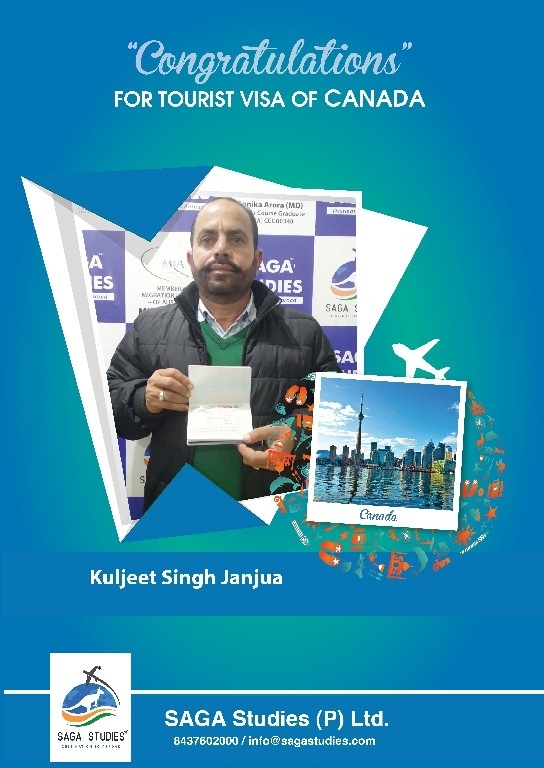 Congratulations Jatinder Kaura. 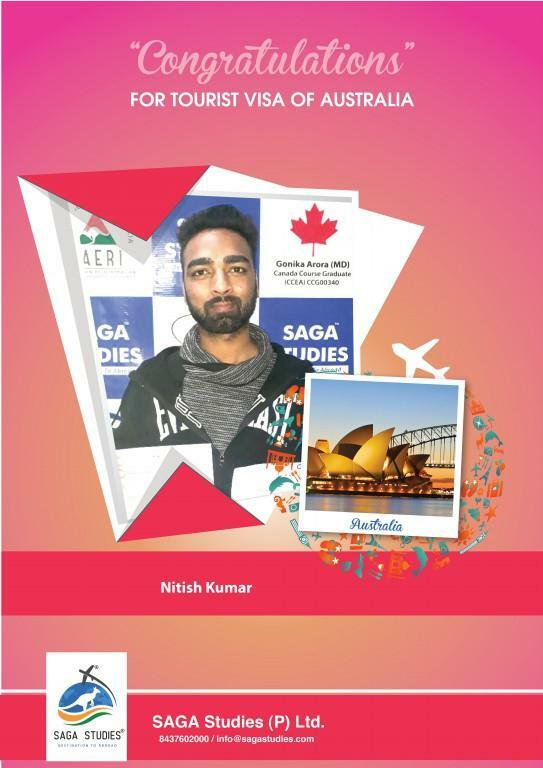 He got tourist visa of Australia. 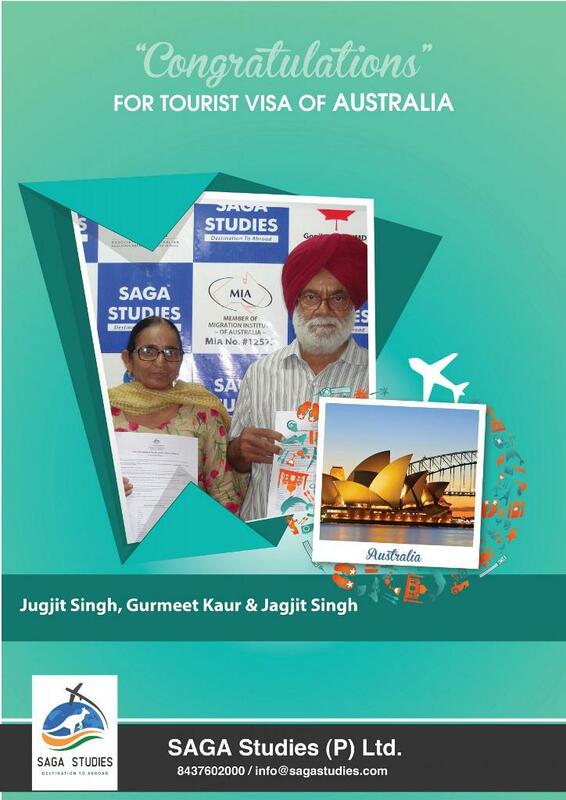 Congratulations Jugjit Singh, Gurmeet Kaur & Jagjit Singh. They got tourist visa of Australia. Congratulations Major Singh & Gurmeet Kaur. They got tourist visa of Australia. 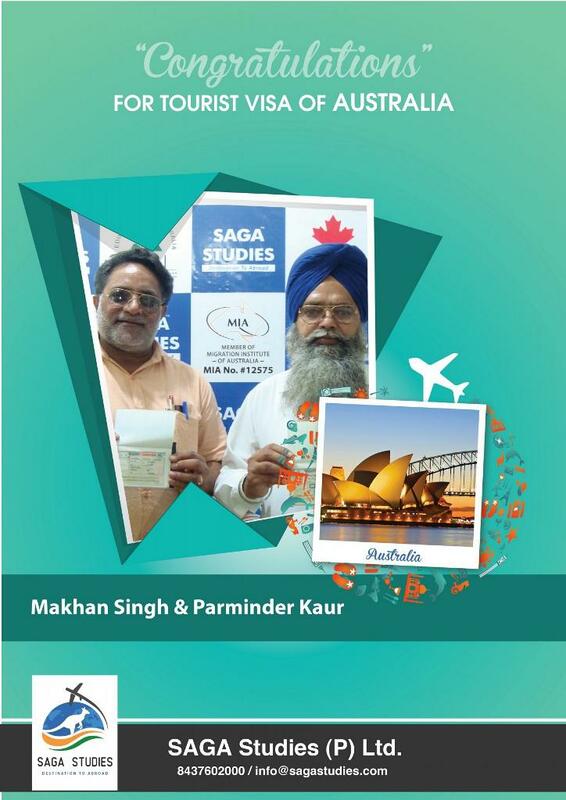 Congratulations Makhan Singh & Parminder Kaur. They got tourist visa of Australia. 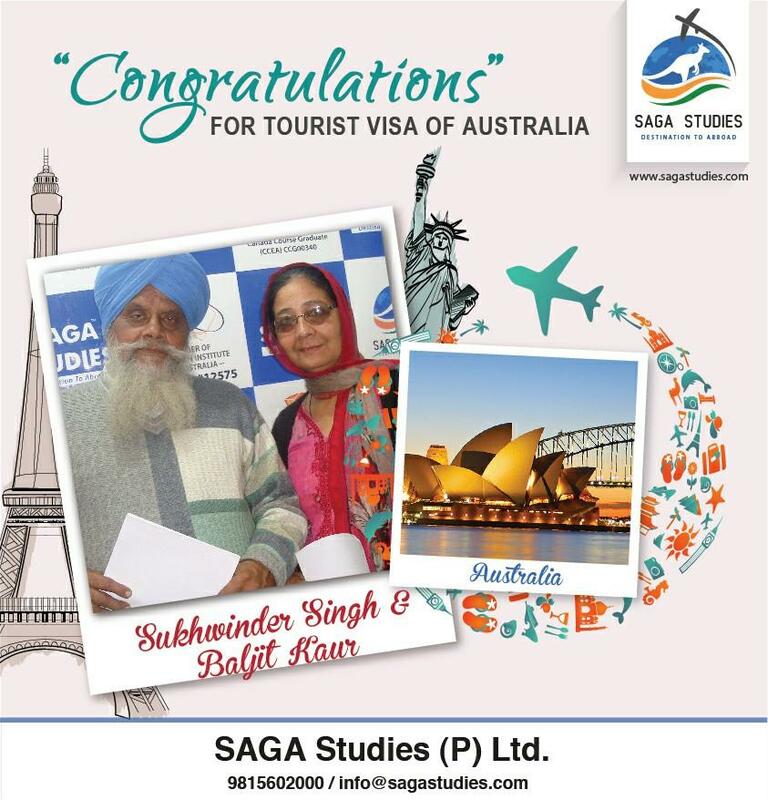 Congratulations Mohinder Singh & Balvinder Kaur. 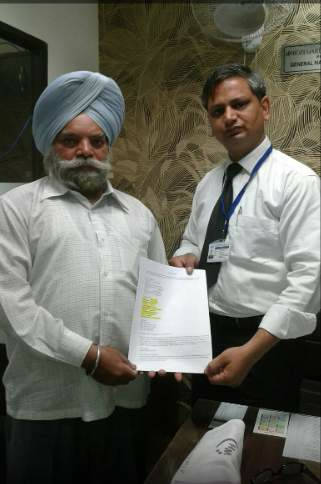 Their son collecting tourist visa of Australia on the behalf of Mohinder Singh & Balvinder Kaur. 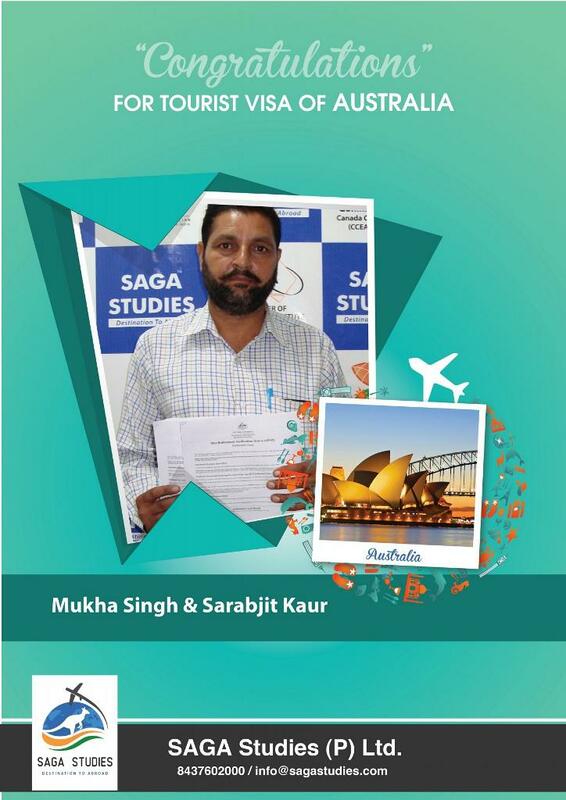 Congratulations Mukha Singh & Sarabjit Kaur. They got tourist visa of Australia. Congratulations Narinder Kaur. She got tourist visa of Australia. 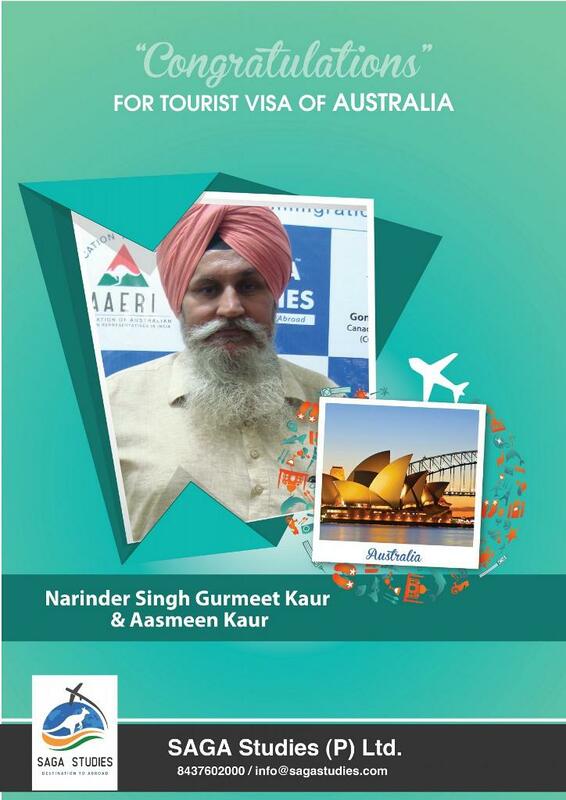 Congratulations Narinder Singh, Gurmeet Kaur & Aashmeen Kaur. They got tourist visa of Australia. 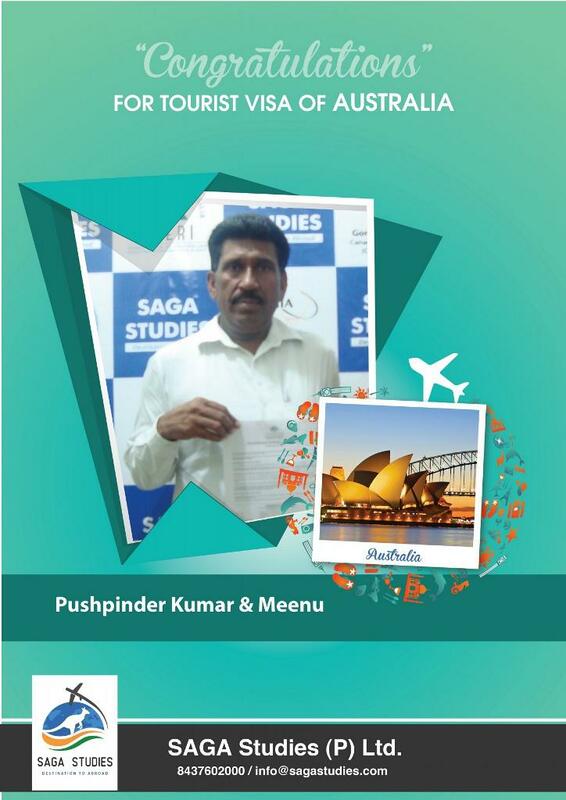 Congratulations Pushpinder Kumar & Meenu. They got tourist visa of Australia. 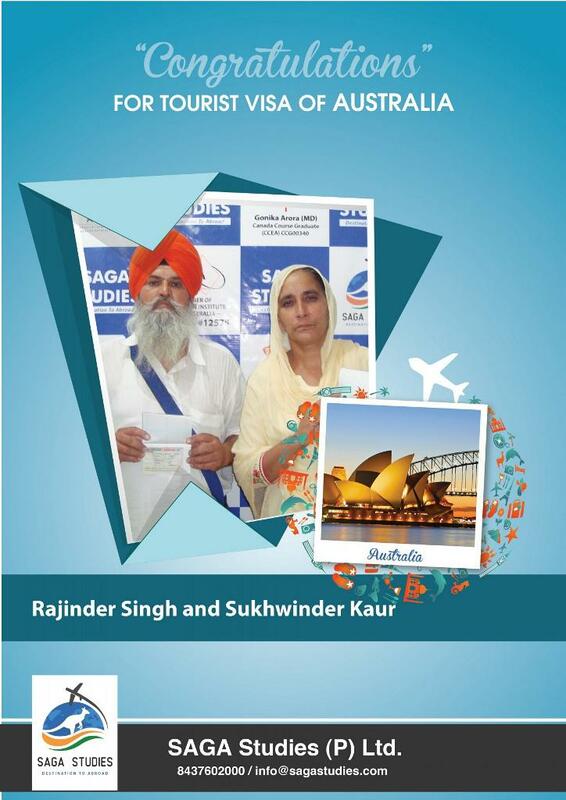 Congratulations Rajinder Kaur & Sukhdev Singh. They got tourist visa of Australia. Congratulations Rajwinder Kaur. She got tourist visa of Australia. 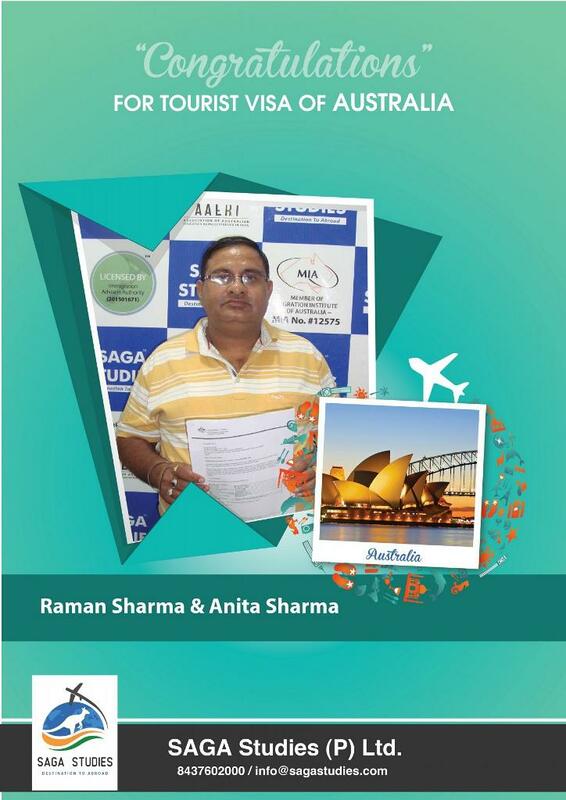 Congratulations Raman Sharma & Anita Sharma. They got tourist visa of Australia. Congratulations Raminder Kaur. 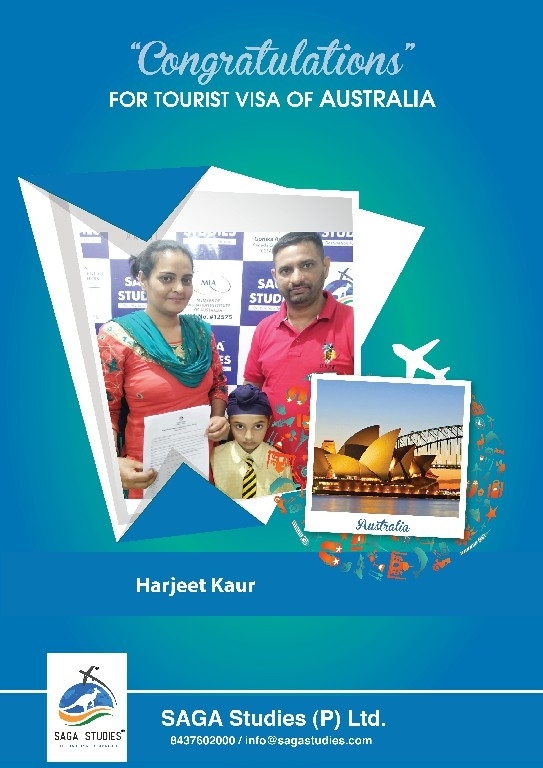 Her son collecting tourist visa of Australia on the behalf of Australia. 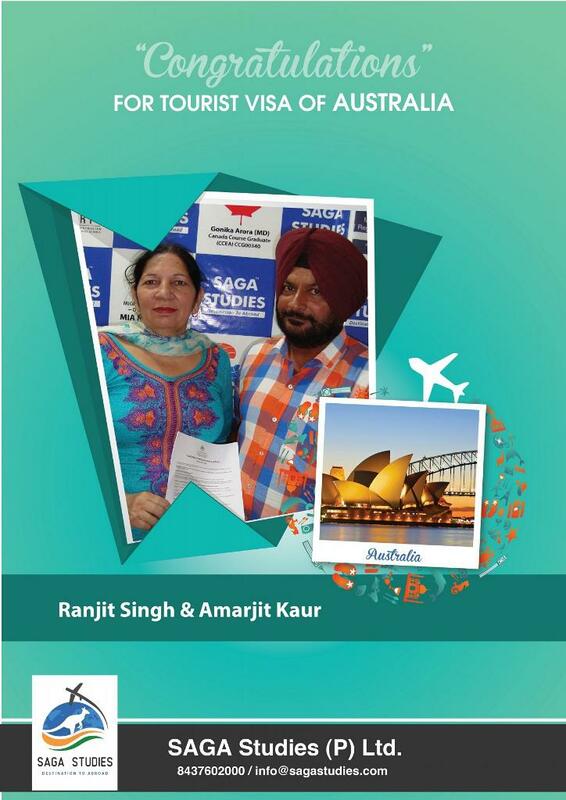 Congratulations Ranjit Singh & Amarjit Kaur. They got tourist visa of Australia. 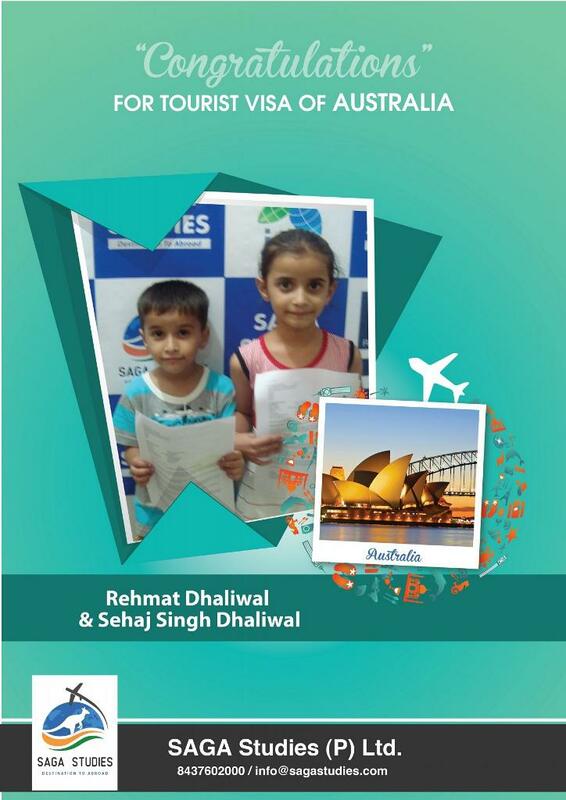 Congratulations Rehmat Dhaliwal & Sehaj Singh Dhaliwal. They got tourist visa of Australia. Congratulations Sahib Singh Sandhu. 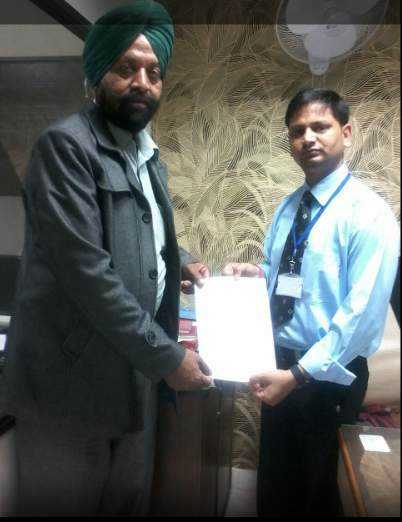 He got tourist visa of Australia. 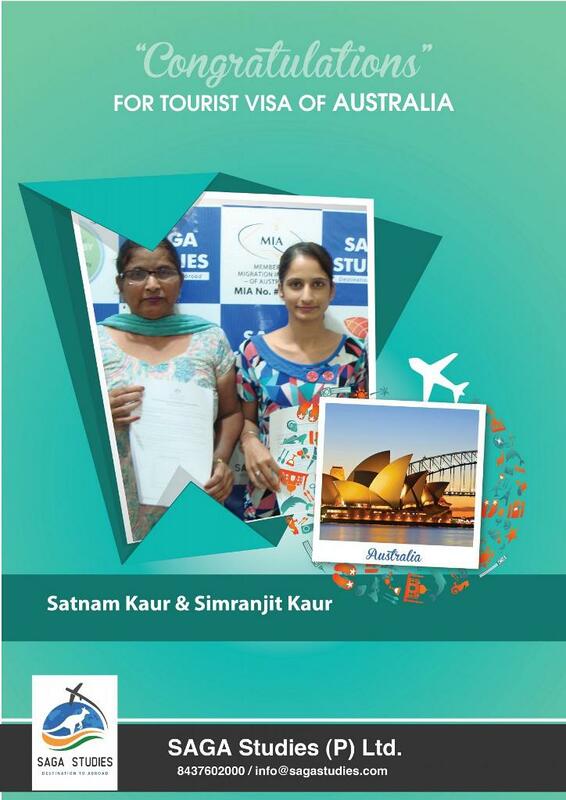 Congratulations Satnam Kaur & Simranjit Kaur. They got tourist visa of Australia. 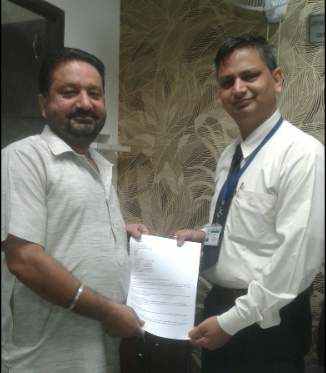 Congratulations Sudesh Rani. She got tourist visa of Australia. 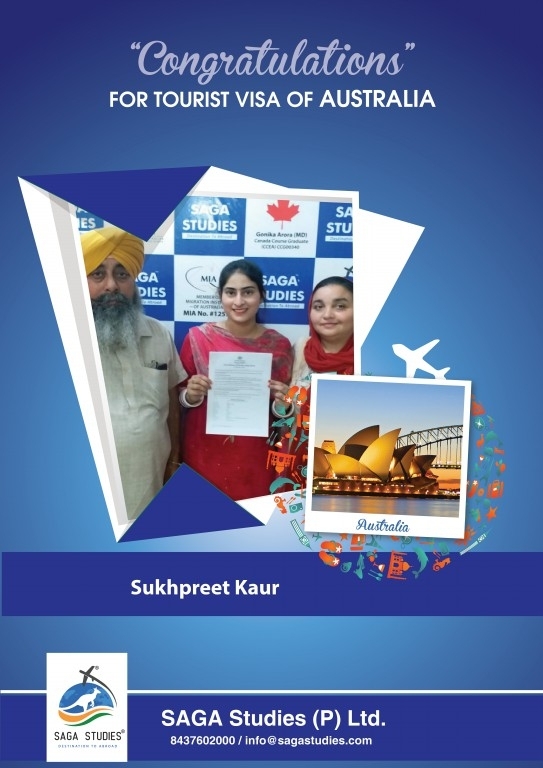 Congratulations Sukhbir Kaur. She got tourist visa of Australia. Congratulations Sukhwant Kaur. 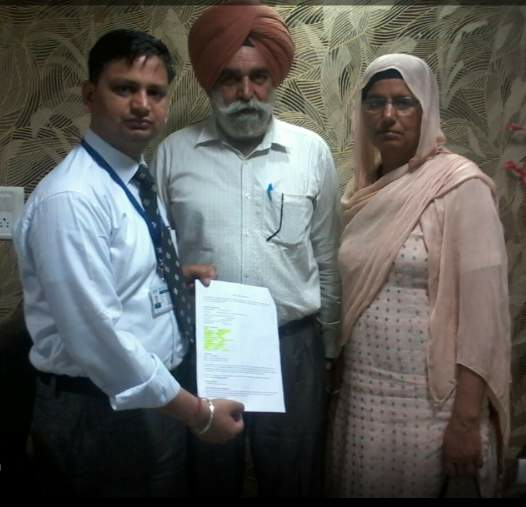 Her son collecting tourist visa of Australia on the behalf of Sukhwant Kaur. Congratulations Surinder Kaur. She got tourist visa of Australia. Congratulations Tejwinder Singh Pannu & Balraj Kaur. They got tourist visa of Australia. 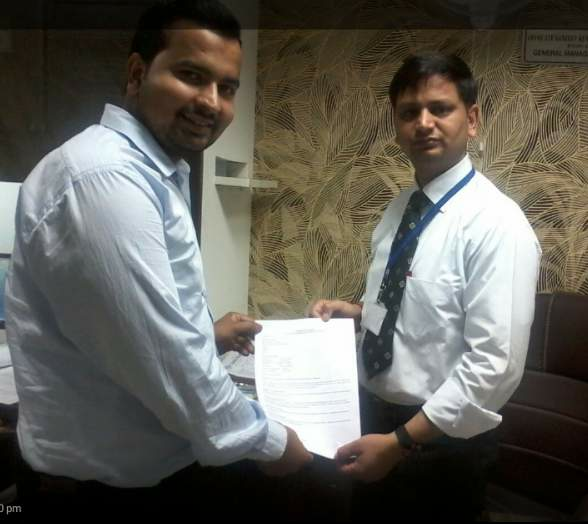 Congratulations Vishal Sharma. He got tourist visa of Australia. Congratulations Sahib Singh Sandhu. 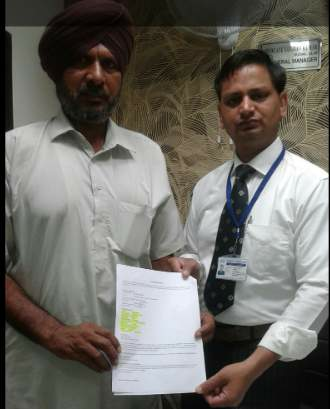 He is Assistant Manager in Cooperative bank in Taran Taran. He got tourist visa of Australia. 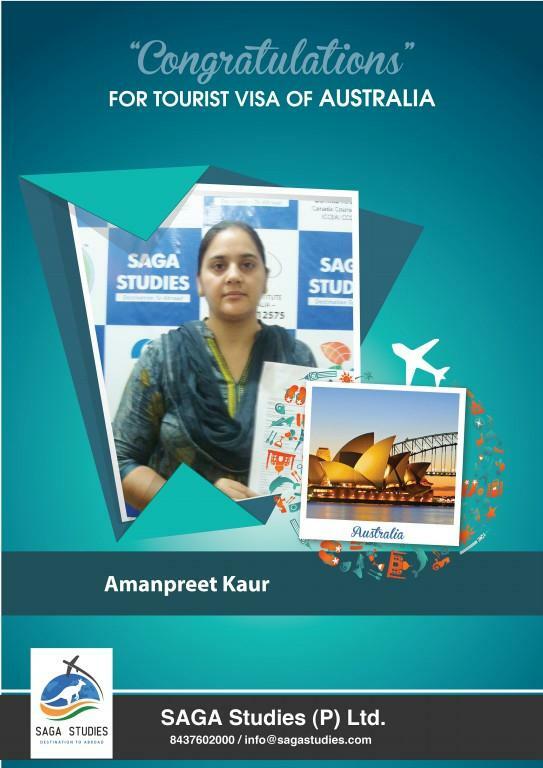 Congratulations Amanpreet Kaur. She got tourist visa of Australia. 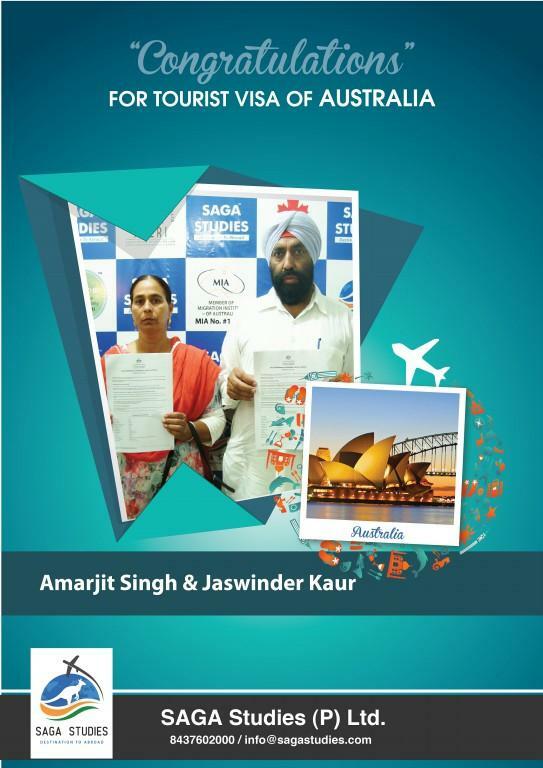 Congratulations Amarjit Singh and Jaswinder Kaur. They got tourist visa of Australia. 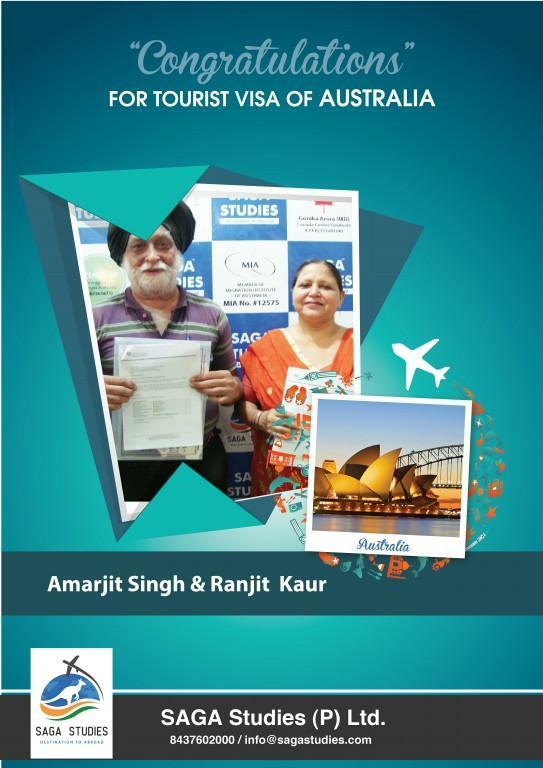 Congratulations Amarjit Singh and Ranjit Kaur. They got tourist visa of Australia. 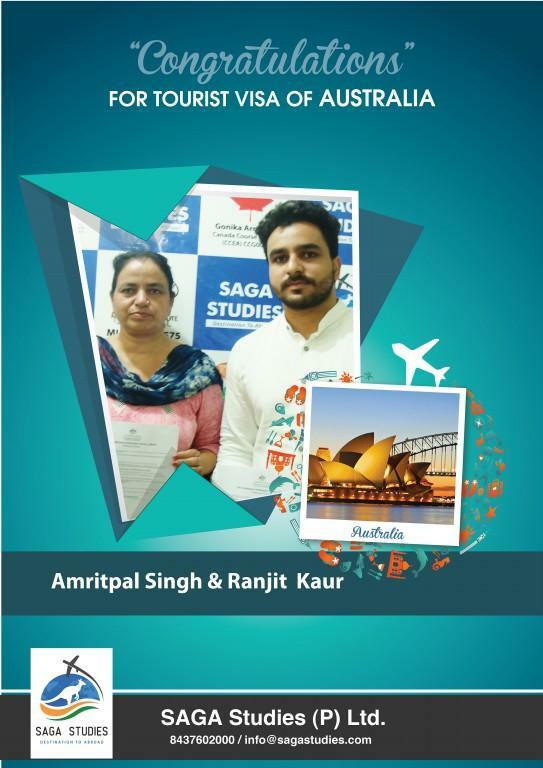 Congratulations Amritpal Singh and Ranjit Kaur. They got tourist visa of Australia. 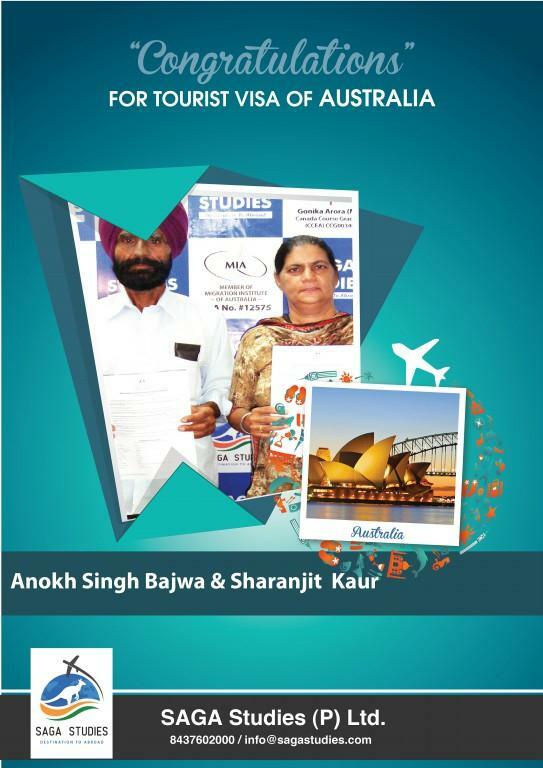 Congratulations Anokh Singh Bajwa and Sharanjit Kaur. They got tourist visa of Australia. 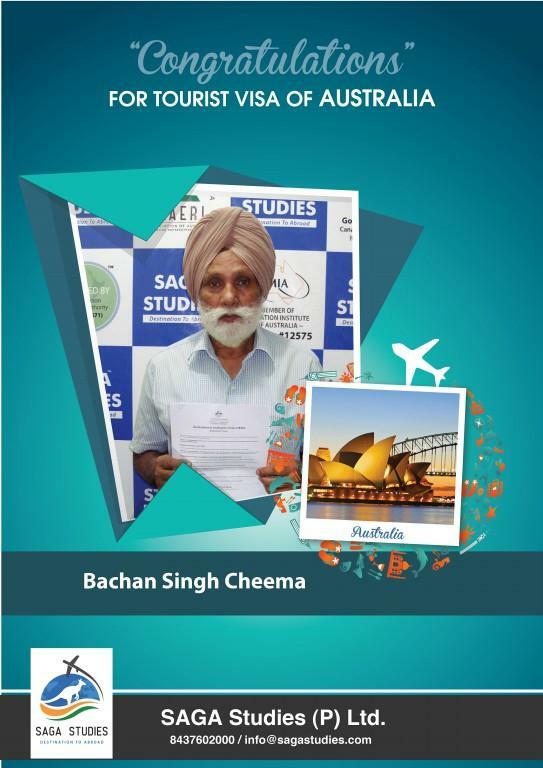 Congratulations Bachan Singh Cheema. He got tourist visa of Australia. Congratulations Charanjit Kaur. Her husband collecting tourist visa of Australia on the behalf of Charanjit Kaur. 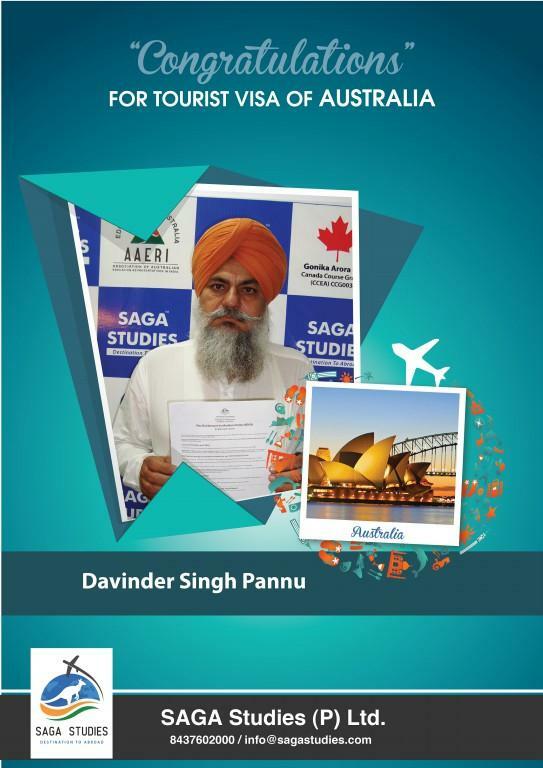 Congratulations Davinder Singh Pannu. 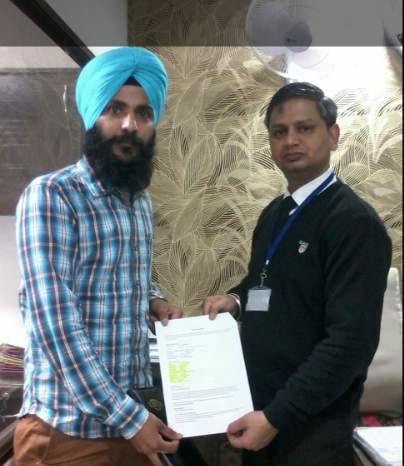 He got tourist visa of Australia. 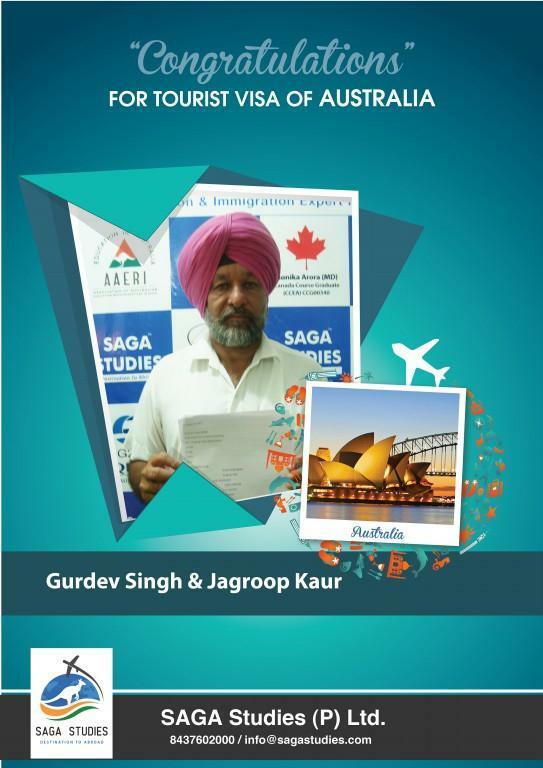 Congratulations Gurdev Singh and Jagroop Kaur. They got tourist visa of Australia. 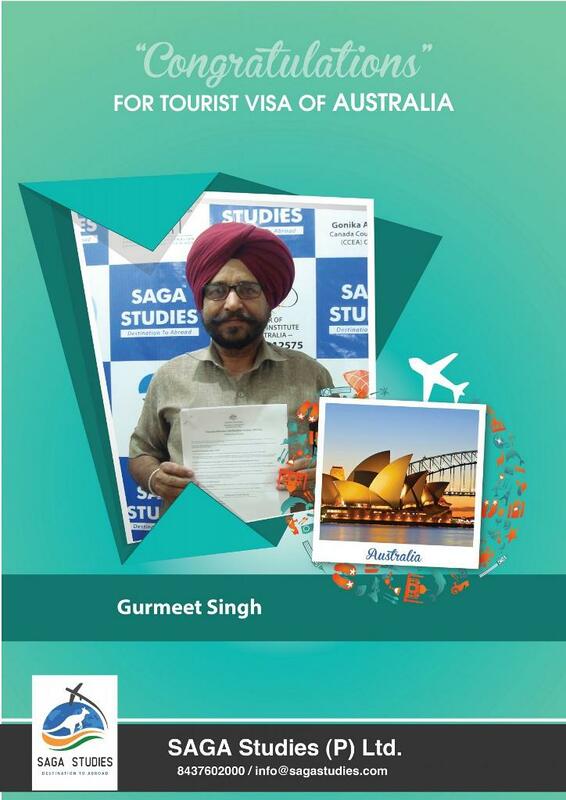 Congratulations Gurpal Singh. He got tourist visa of Australia. Congratulations Harbhajan Singh Bhatti. 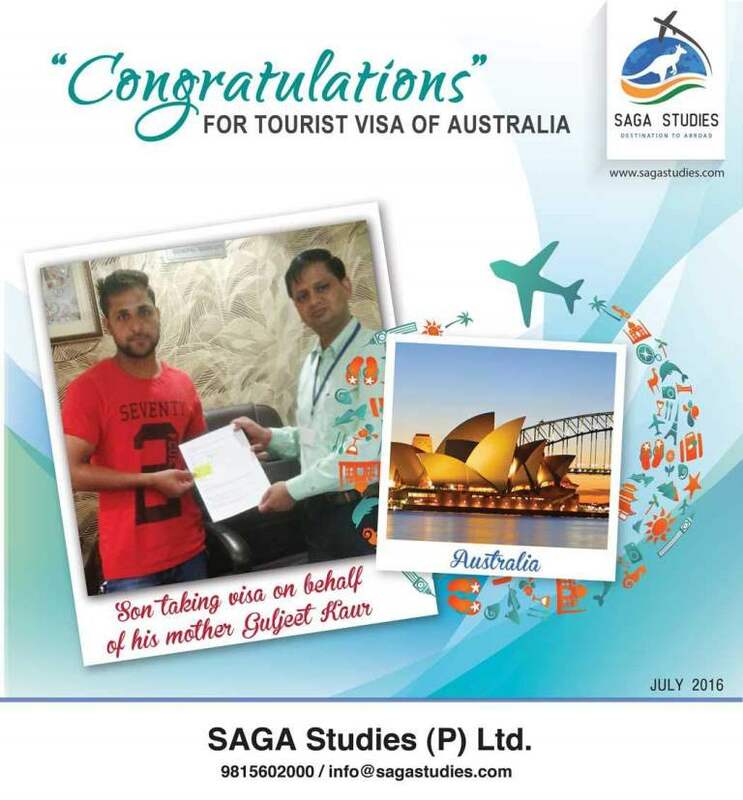 He got tourist visa of Australia. 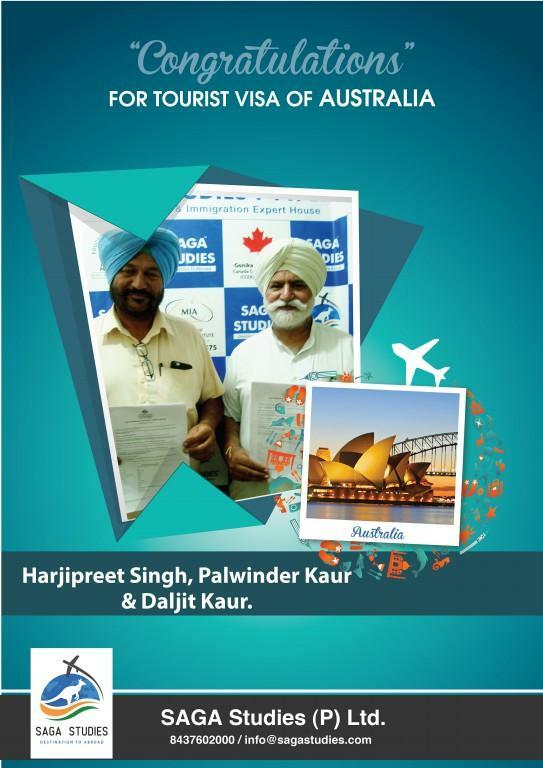 Congratulations Harjipreet Singh, Palwinder Kaur & Daljit Kaur. They got tourist visa of Australia. 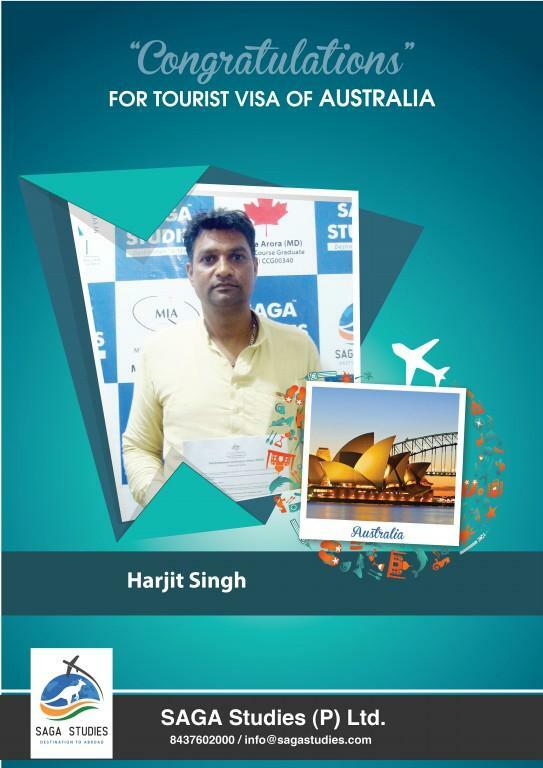 Congratulations Harjit Singh. 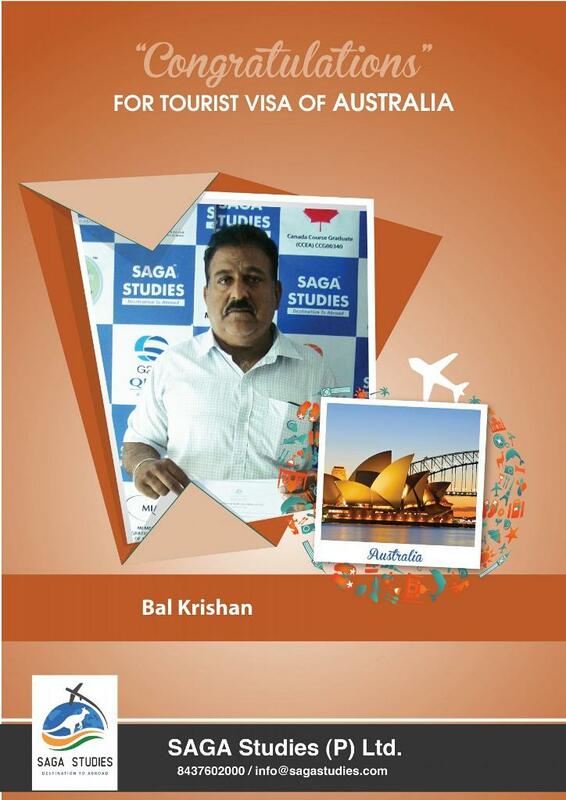 He got tourist visa of Australia. 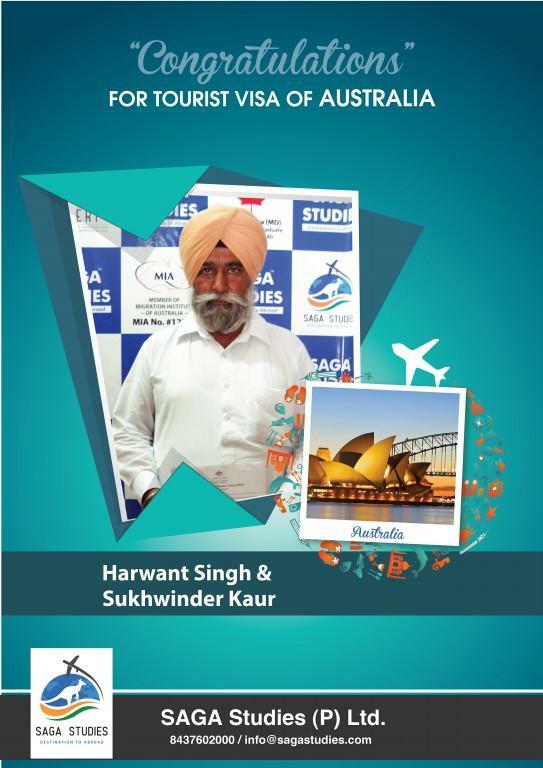 Congratulations Harwant Singh & Sukhwinder kaur. They got tourist visa of Australia. 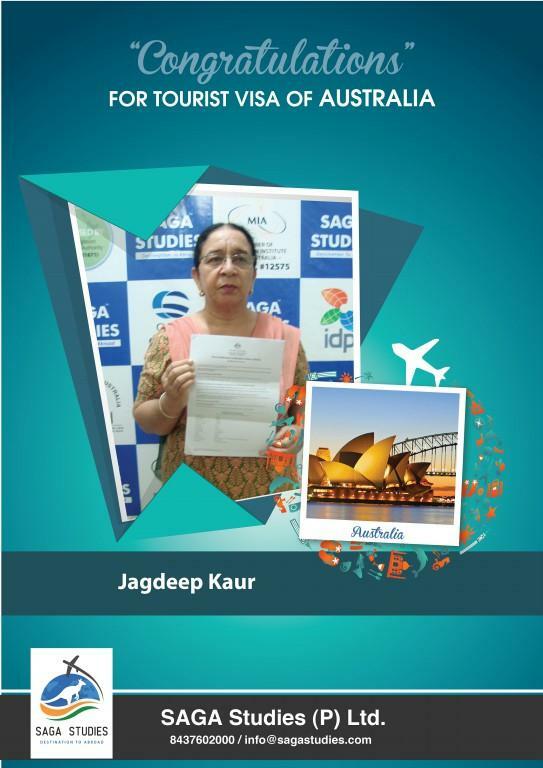 Congratulations Jagdeep Kaur. She got tourist visa of Australia. Congratulations Jasmangal Singh & Bablipreet kaur. They got tourist visa of Australia. 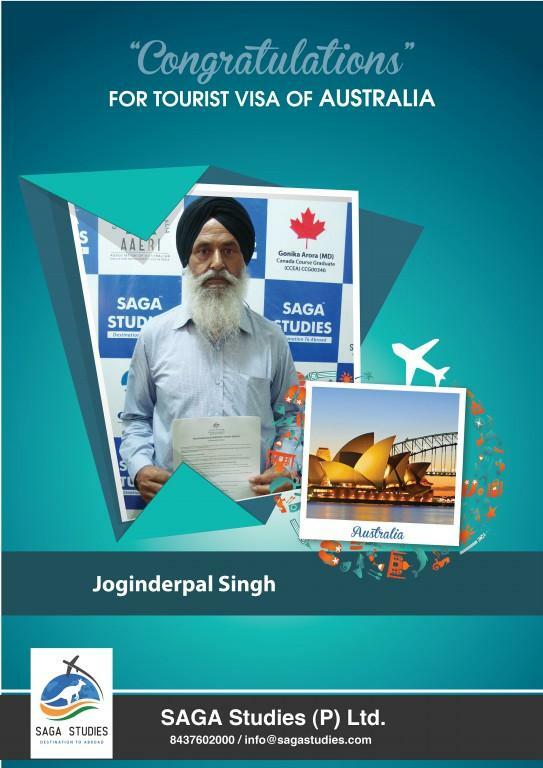 Congratulations Joginderpal Singh. He got tourist visa of Australia. 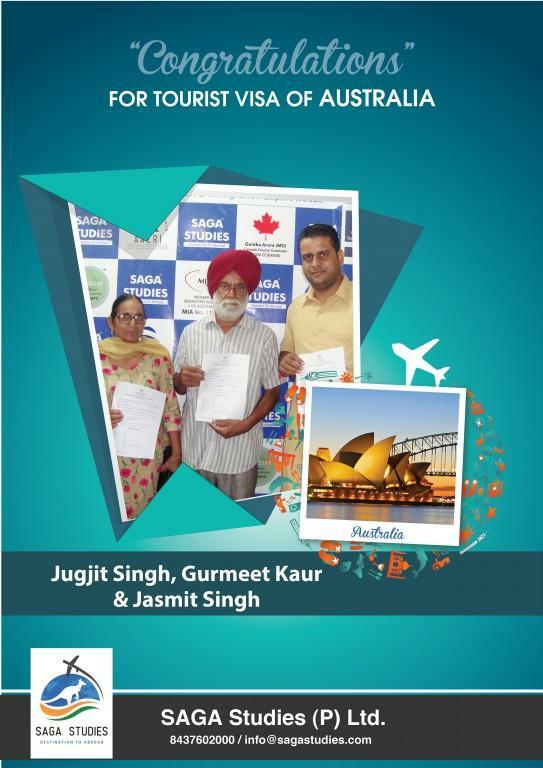 Congratulations Jugjit Singh, Gurmeet Kaur & Jasmit Singh. They got tourist visa of Australia. Congratulations Kawaljit Kaur. 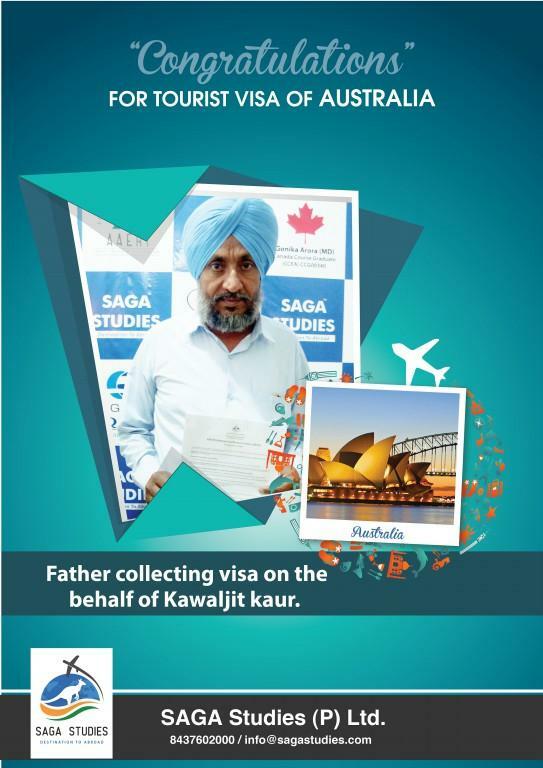 Her father collecting tourist visa of Australia on the behalf of Kawaljit Kaur. 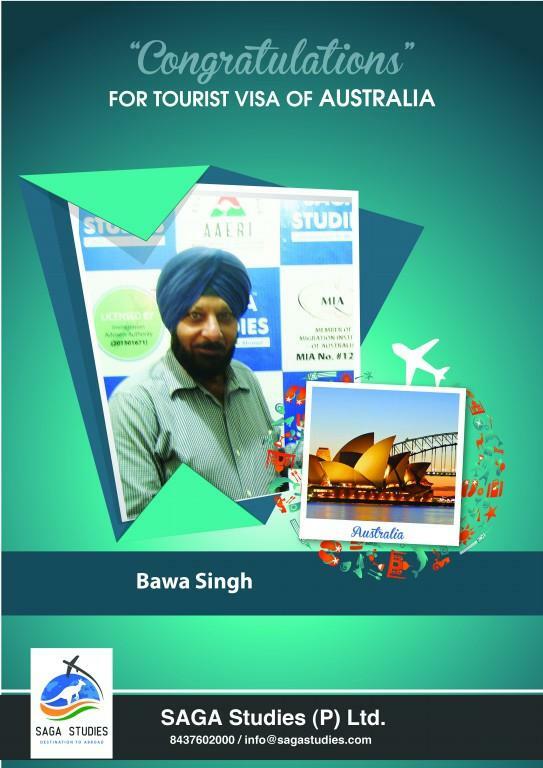 Congratulations Bawa Singh. He got tourist visa of Australia. Congratulations Avinash Chander and Asha Rani. 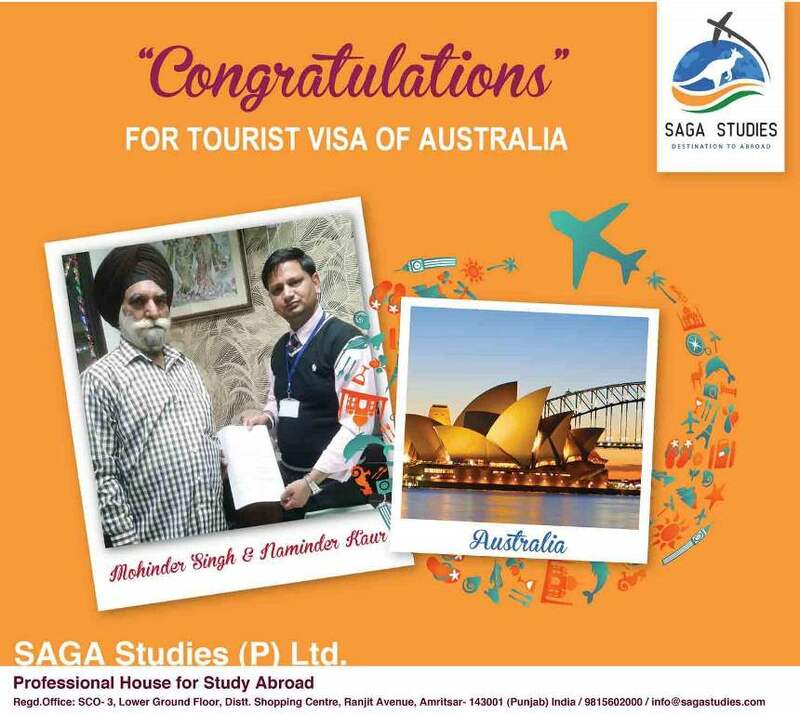 They got tourist visa of Australia.. SAGA Studies wishing you sucess and Prosperous life ahead. Congratulations Joga Singh & Narinder Kaur.They got tourist visa of Australia. Garjeet Singh is getting visa on behalf of his parents.. SAGA Studies wishing you sucess and Prosperous life ahead. 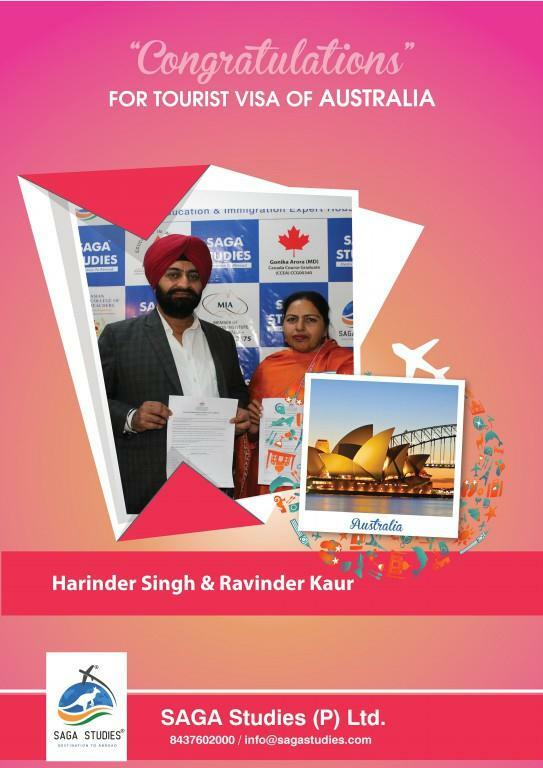 Congratulations Hardev Singh & Daljinder Kaur. 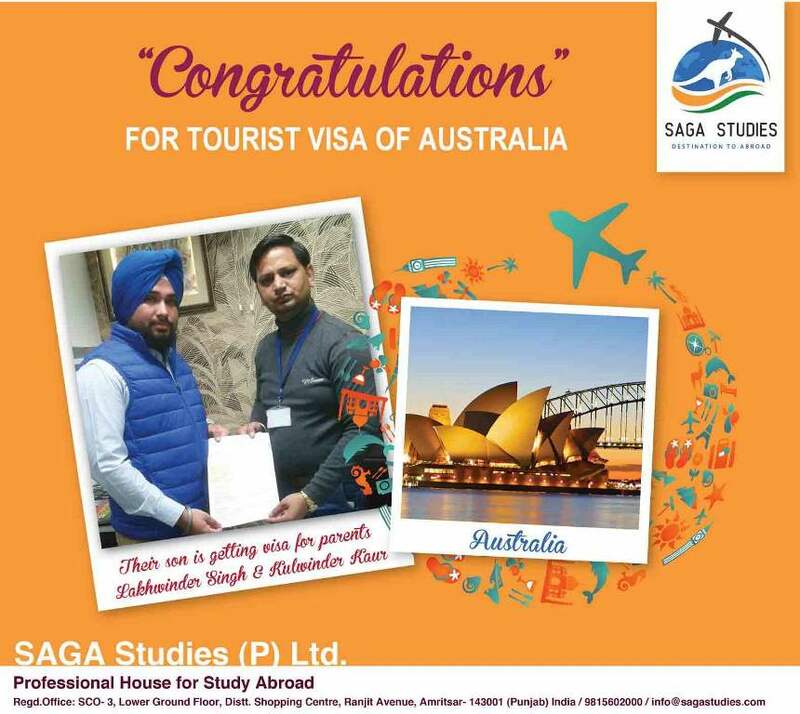 They got tourist visa of Australia.. SAGA Studies wishing you sucess and Prosperous life ahead. 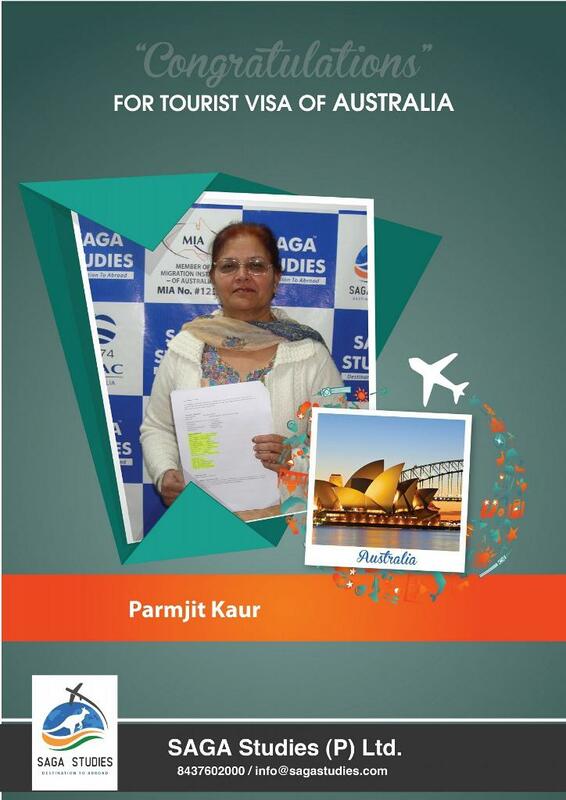 Congratulations Paramjit Kaur. She got tourist visa of Australia. 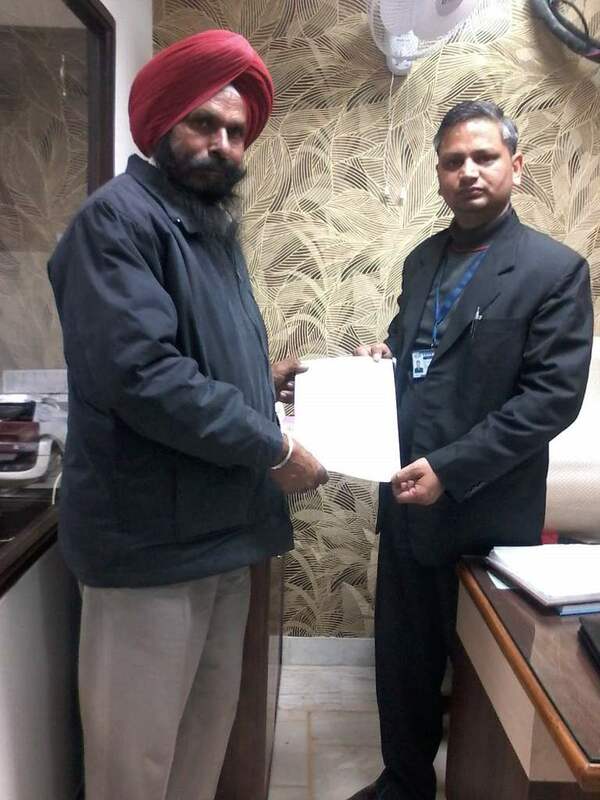 Kashmir Singh is getting tourist visa on behalf of his wife. SAGA Studies wishing you sucess and Prosperous life ahead. Congratulations Hazur Singh. 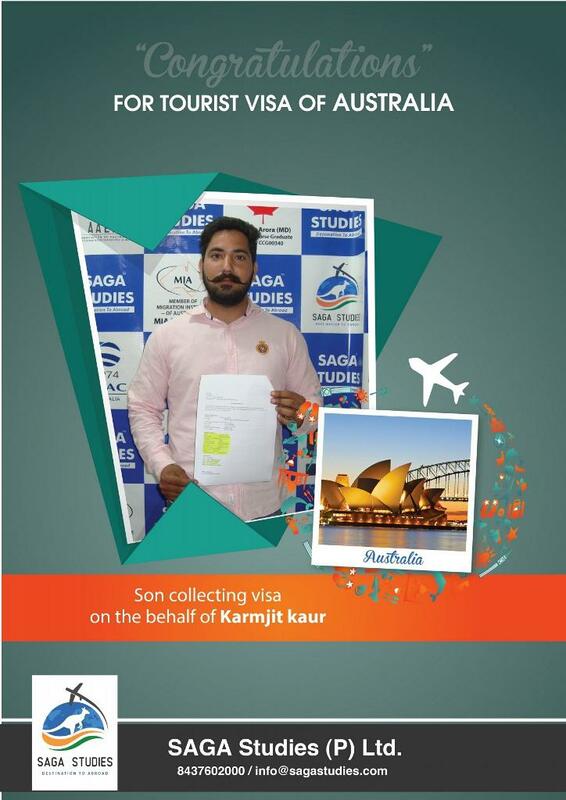 He got tourist visa of Australia..Katan Singh getting visa on behalf of his relatives. 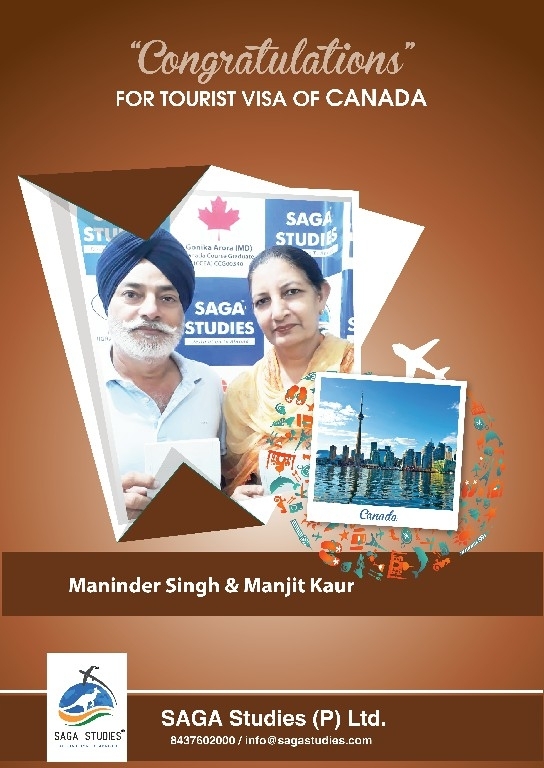 SAGA Studies wishing you sucess and Prosperous life ahead..
Congratulations Mohinder Singh Kaler and Manjit Kaur. They got tourist visa of Australia.. SAGA Studies wishing you sucess and Prosperous life ahead. 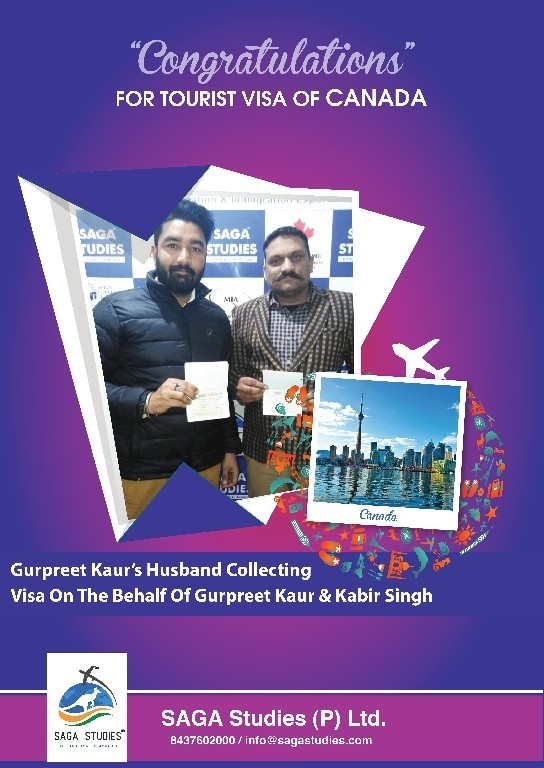 Congratulations Gurbinder Singh & Sarabjeet Kaur. They got tourist visa of Australia. Navdeep Singh is getting visa on behalf of his parents.. SAGA Studies wishing you sucess and Prosperous life ahead. 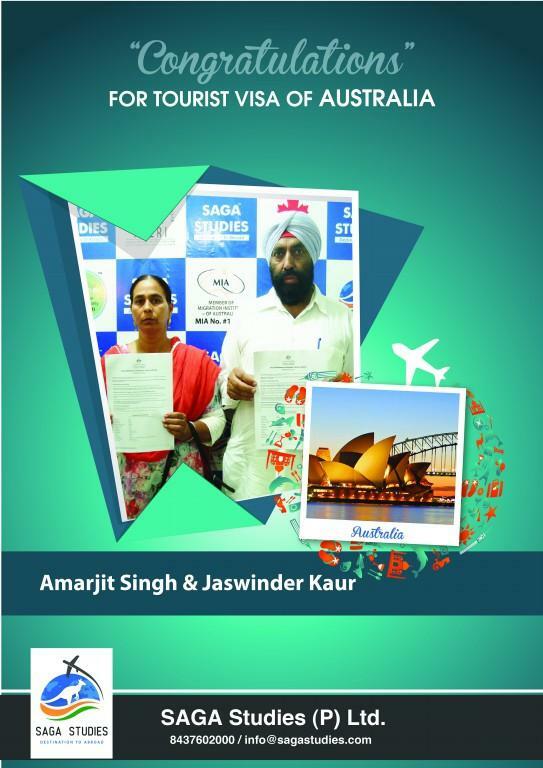 Congratulations Nirmal Singh and Jaswinder Kaur. 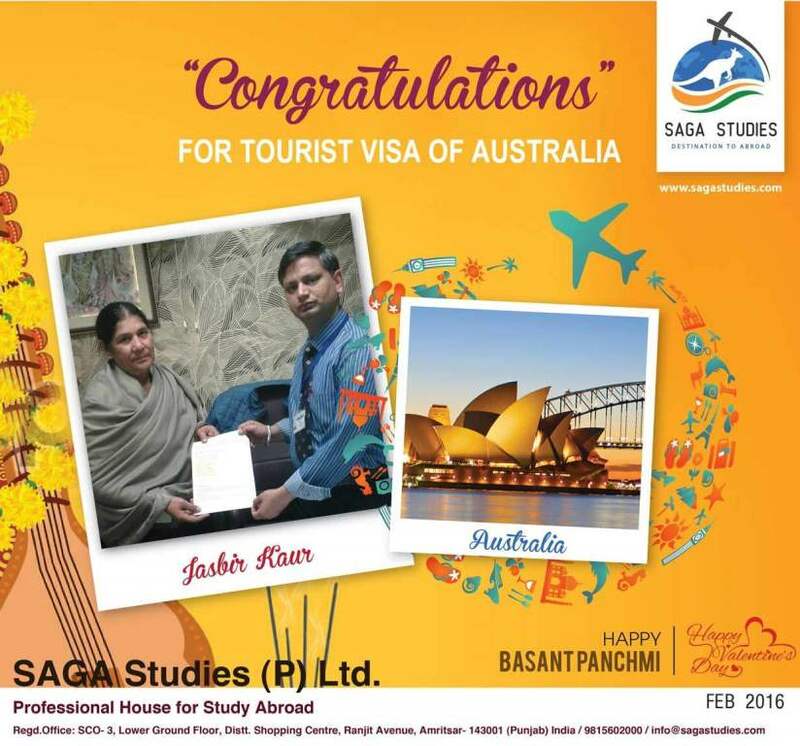 They got tourist visa of Australia.. SAGA Studies wishing you sucess and Prosperous life ahead. 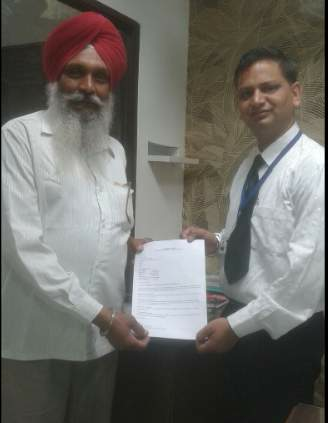 Congratulations Santokh Singh. He got tourist visa of Australia. SAGA Studies wishing you sucess and Prosperous life ahead. Congratulations Samsher Singh & Gurmit Kaur. 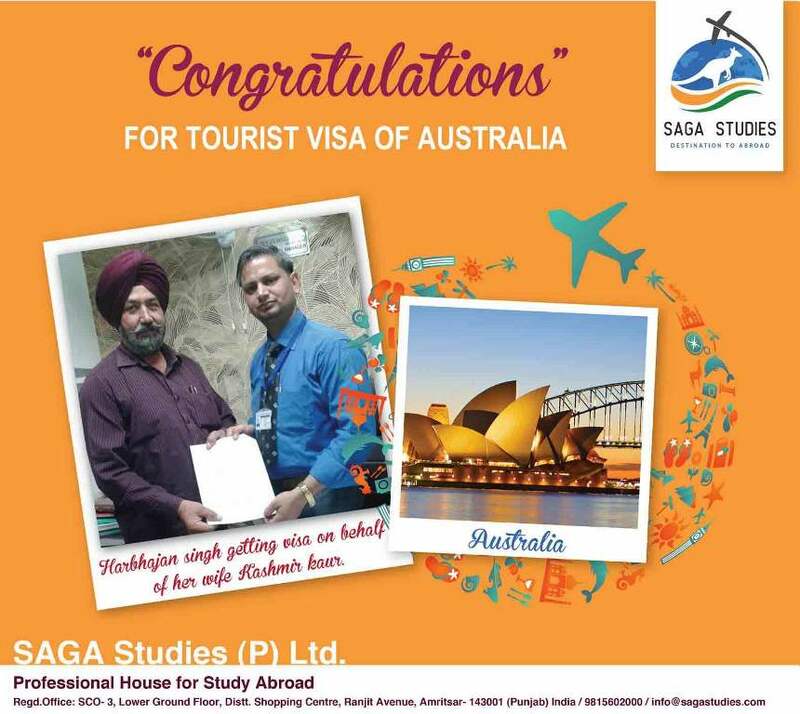 They got tourist visa of Australia.. SAGA Studies wishing you sucess and Prosperous life ahead. 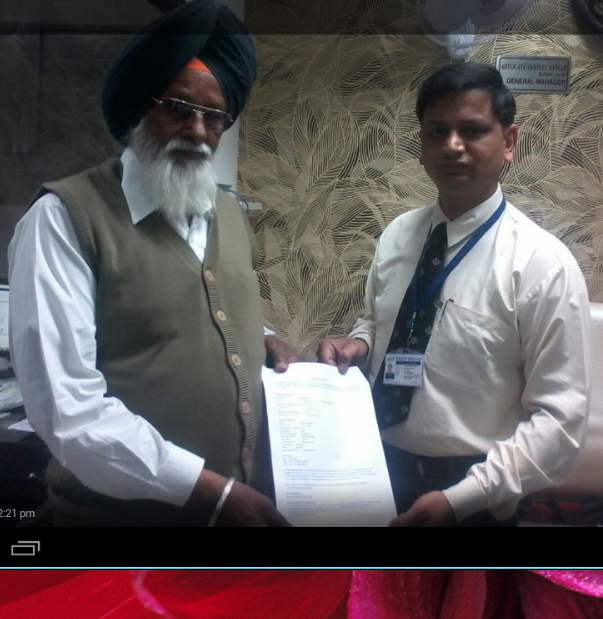 Congratulations Tanjit Singh & Nirmaljit Kaur. 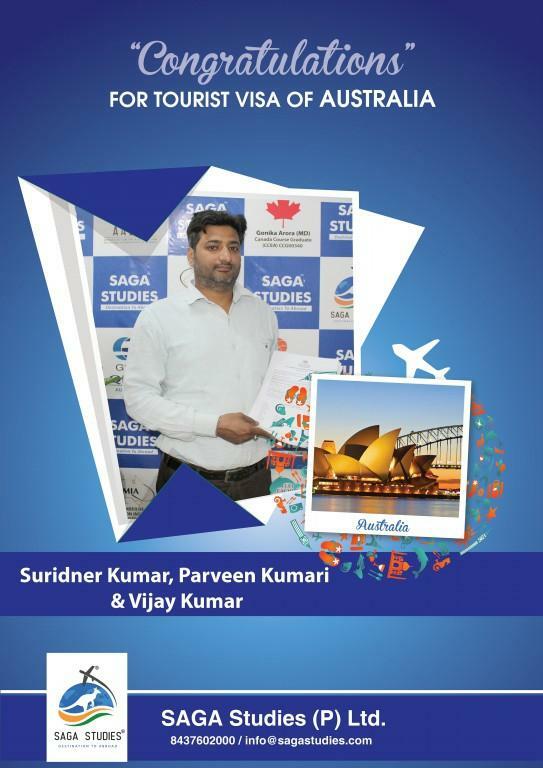 They got tourist visa of Australia.. SAGA Studies wishing you sucess and Prosperous life ahead. 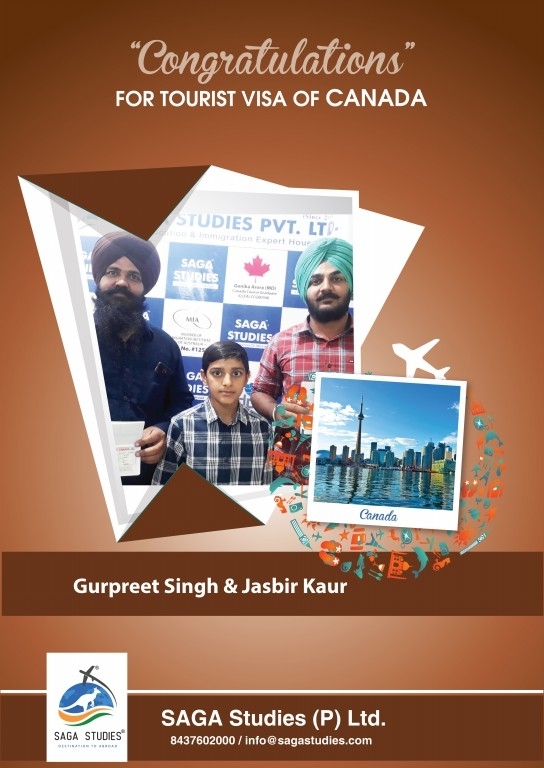 — at SAGA Studies (P) Ltd.
Congratulations Jasbir Kaur. 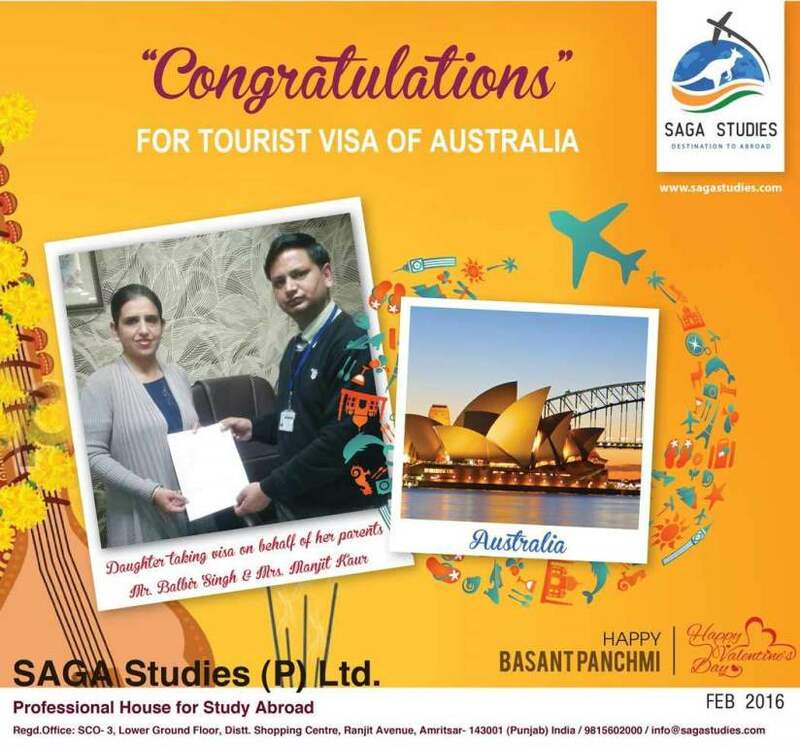 She got tourist visa of Australia.. SAGA Studies wishing you sucess and Prosperous life ahead. Congratulations Jasbeer Kaur. 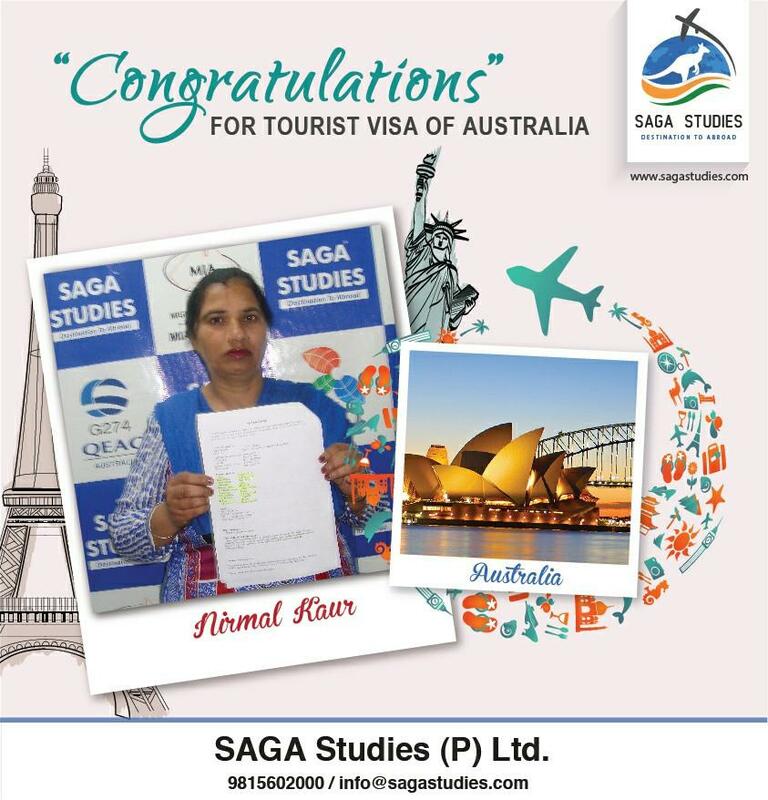 She got tourist visa of Australia.. SAGA Studies wishing you sucess and Prosperous life ahead. 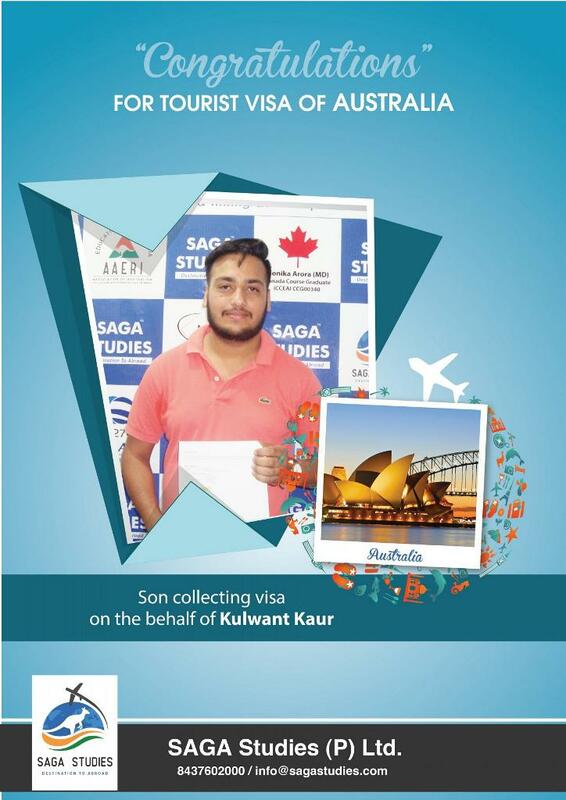 Congratulations Kulwant Singh. 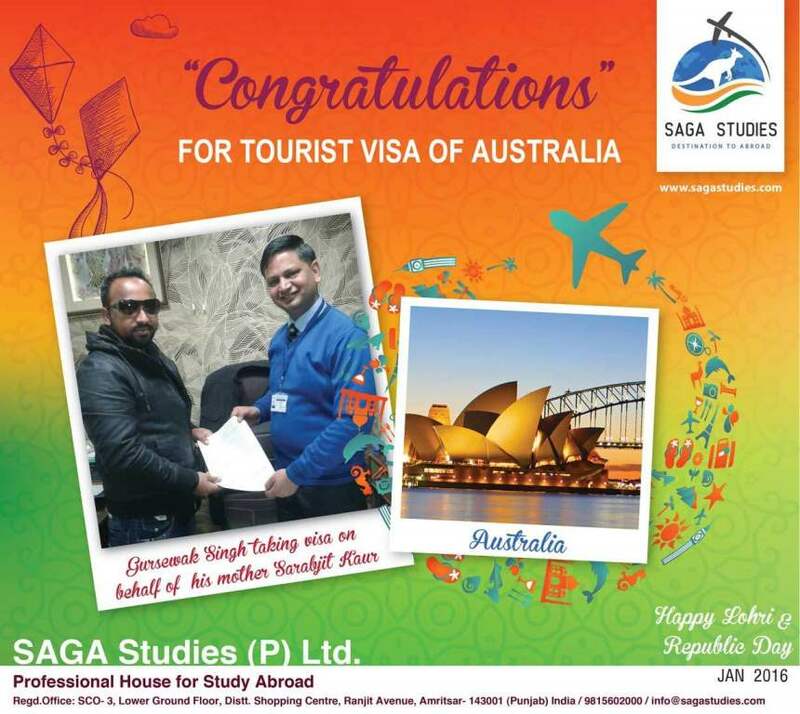 He got tourist visa of Australia.. SAGA Studies wishing you sucess and Prosperous life ahead. Congratulations Navneet Kaur. She got tourist visa of Australia. 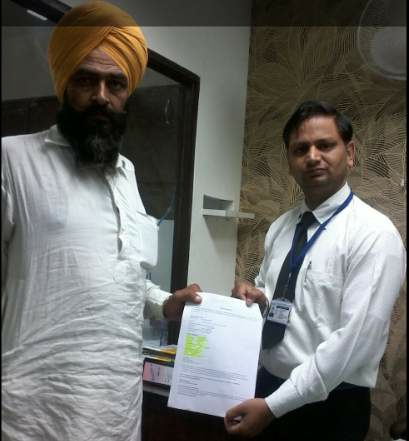 Her husband getting visa on behalf of his wife. 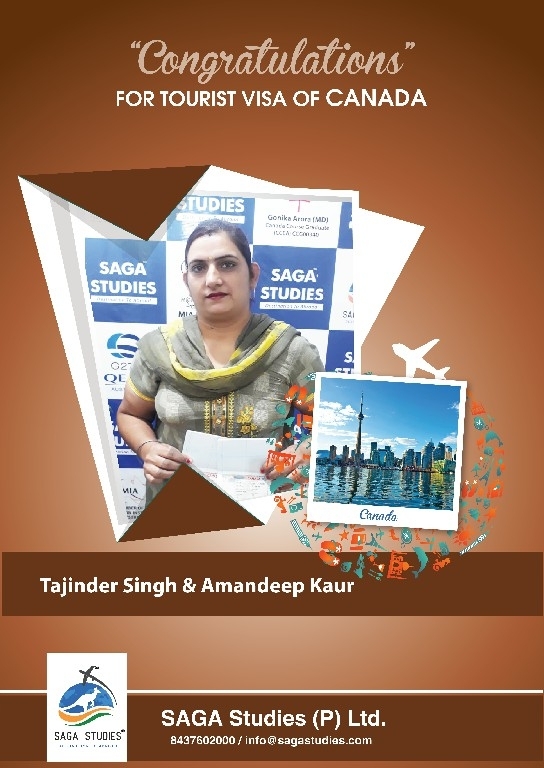 SAGA Studies wishing you sucess and Prosperous life ahead..
Congratulations Raminder Kaur. She got tourist visa of Australia. 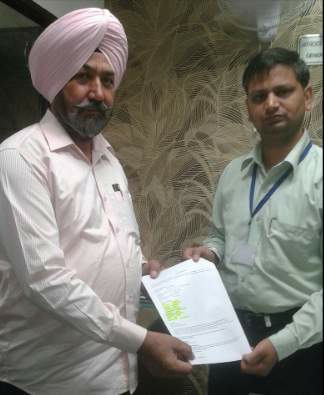 Her husband getting visa on behalf of his wife. 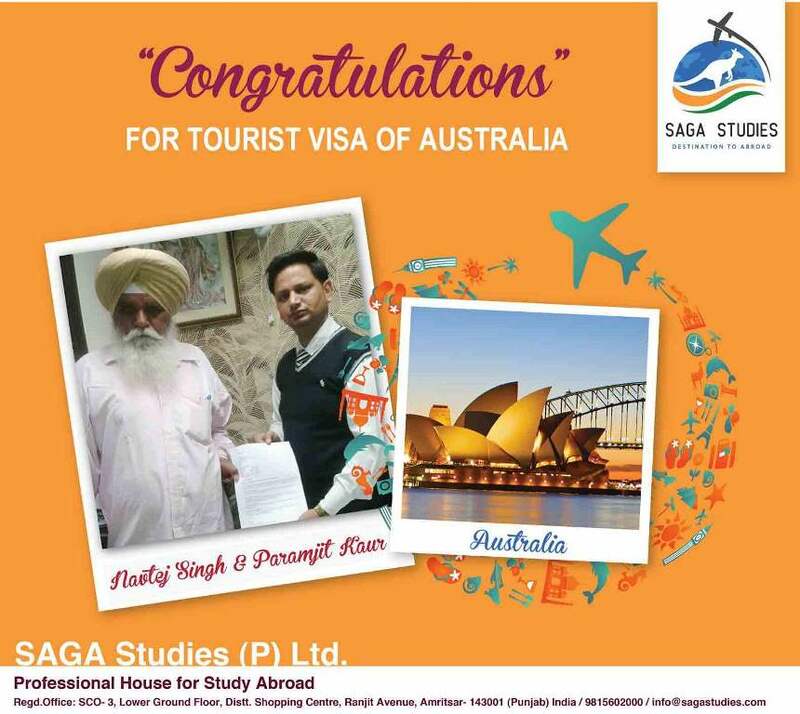 SAGA Studies wishing you sucess and Prosperous life ahead..
Congratulations Prem Lal & Rajwinder Kaur. They got tourist visa of Australia.. SAGA Studies wishing you sucess and Prosperous life ahead. 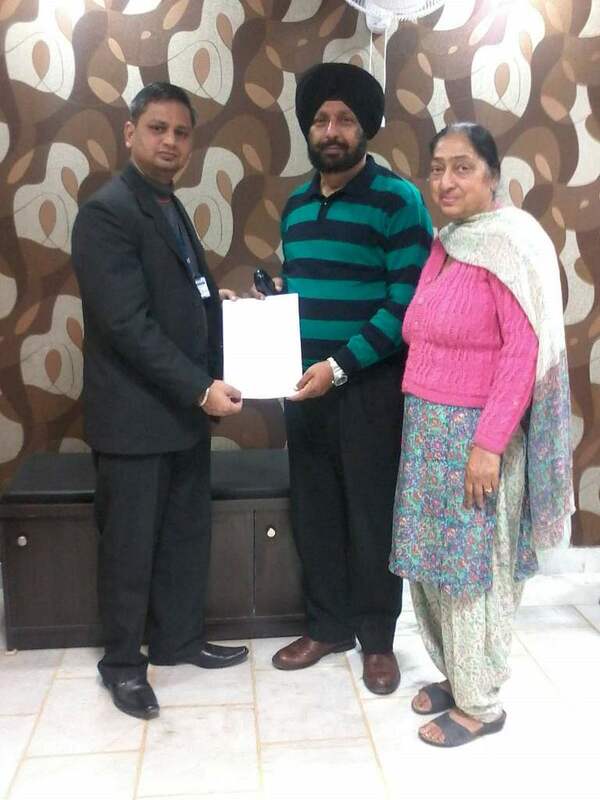 Congratulations Iqbal Chhina & Daljit Kaur. They got tourist visa of Australia. 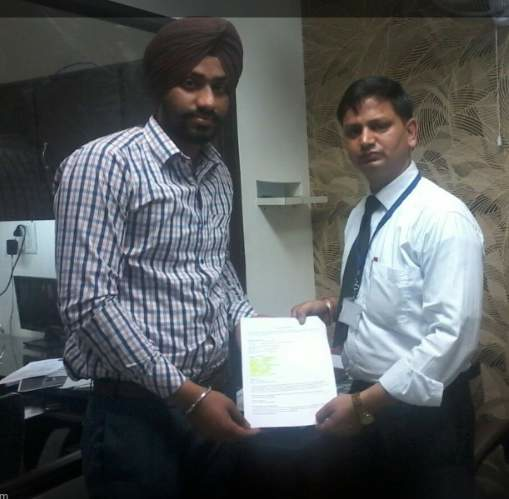 Simarjeet Singh is getting visa on behalf of his parents.. SAGA Studies wishing you sucess and Prosperous life ahead. 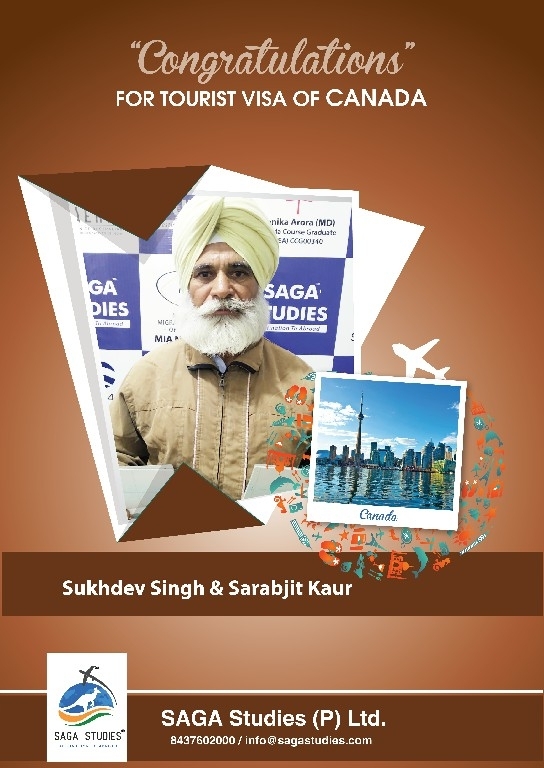 Congratulations Skattar Singh & Kulbir Kaur. 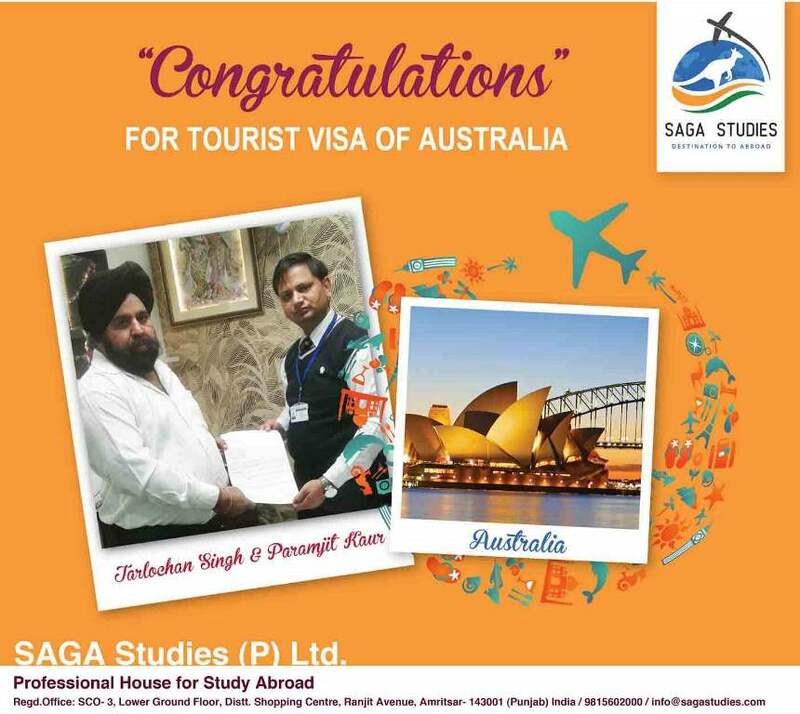 They got tourist visa of Australia.. SAGA Studies wishing you sucess and Prosperous life ahead. 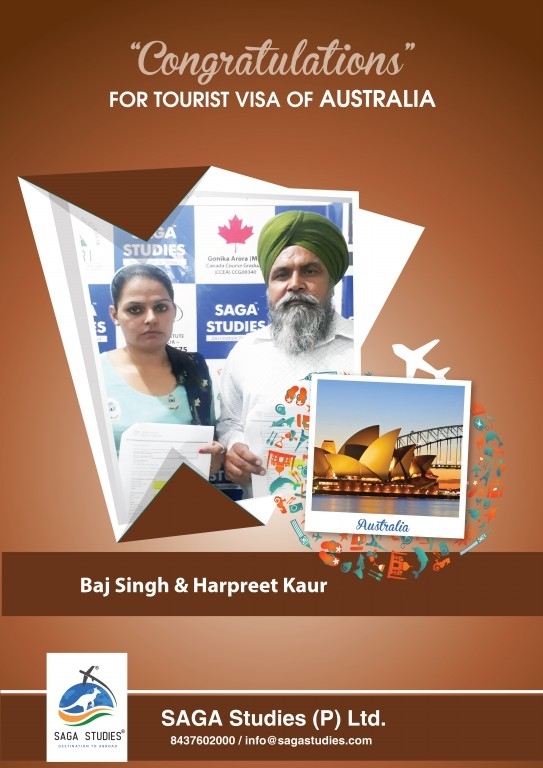 Congratulations Balbir Singh & Manjit Kaur. They got tourist visa of Australia. 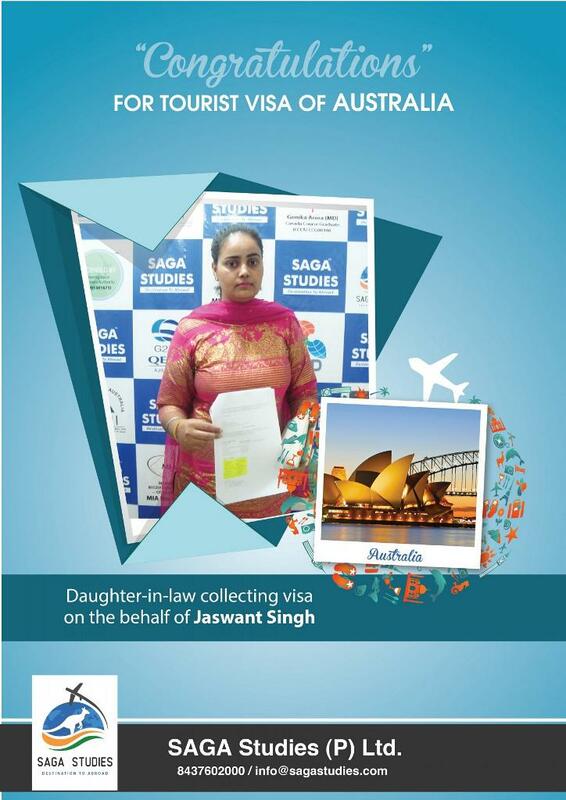 Daughter taking visa on behalf of her parents.. SAGA Studies wishing you sucess and Prosperous life ahead. 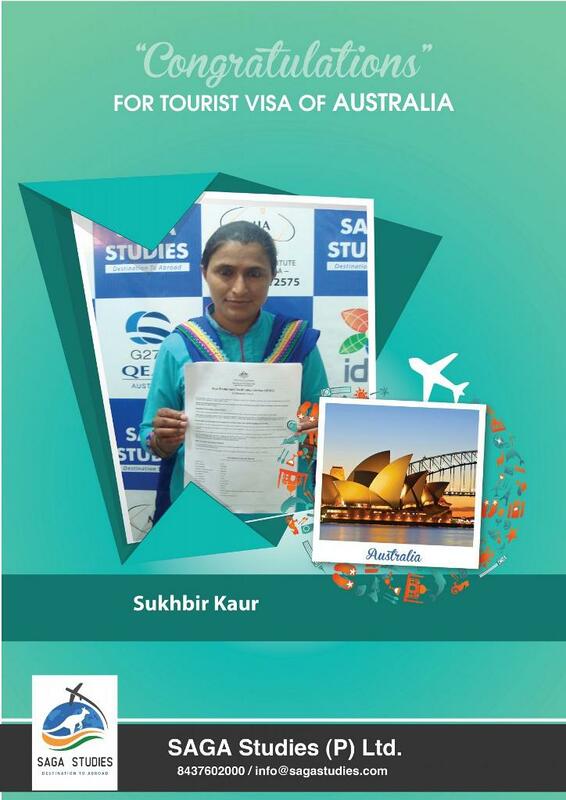 Congratulations Sukhwinder Kaur. She got tourist visa of Australia. 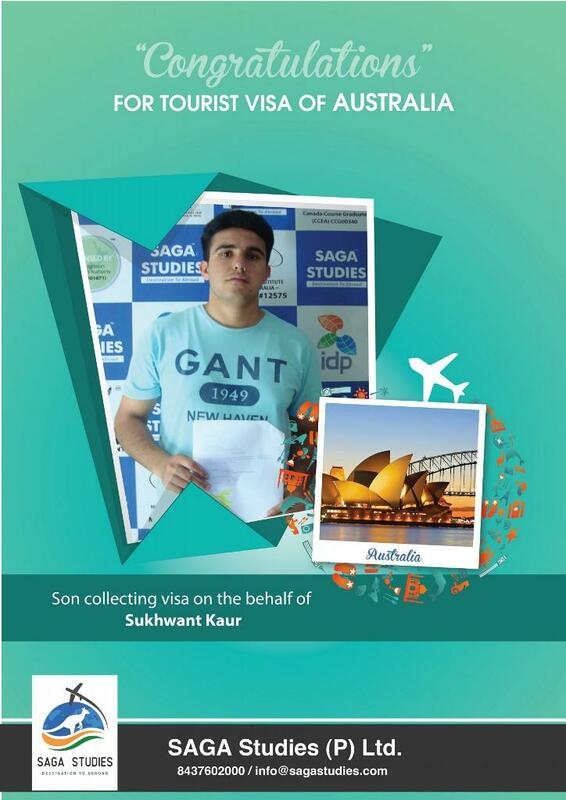 Son taking visa on behalf of his Mother.. SAGA Studies wishing you sucess and Prosperous life ahead. Congratulations Rajwinder Kaur. 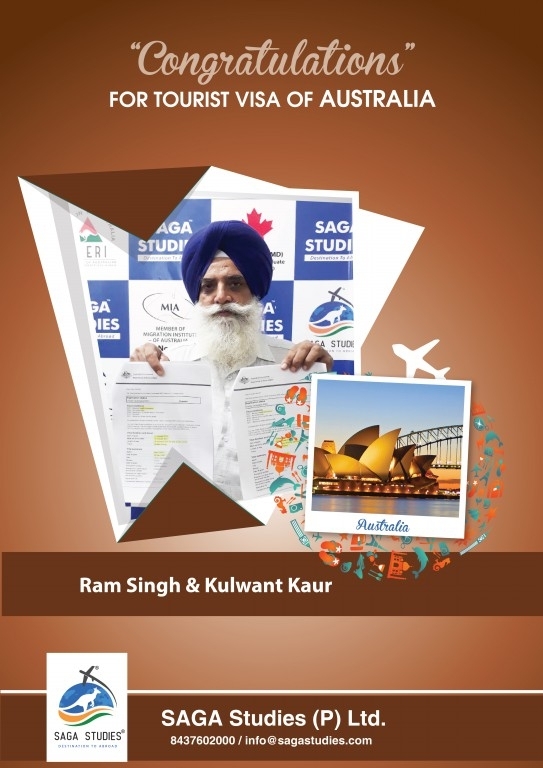 They got tourist visa of Australia.. 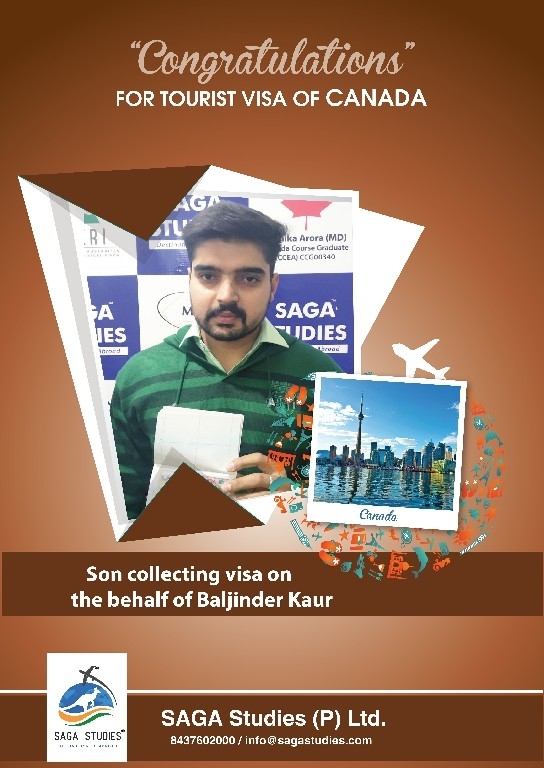 Her son Karanbir Singh also got tourist visa along with her. 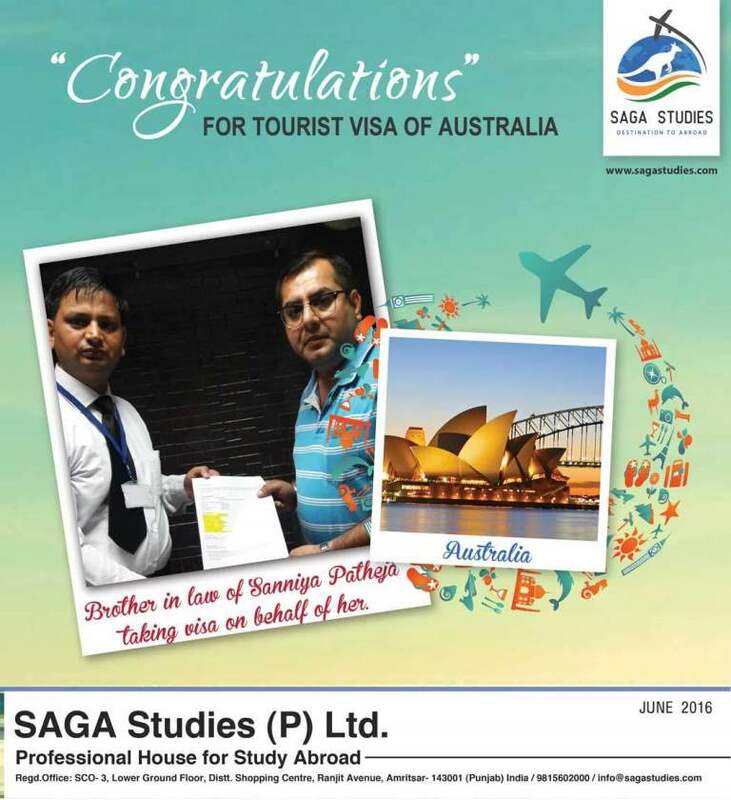 SAGA Studies wishing you sucess and Prosperous life ahead. 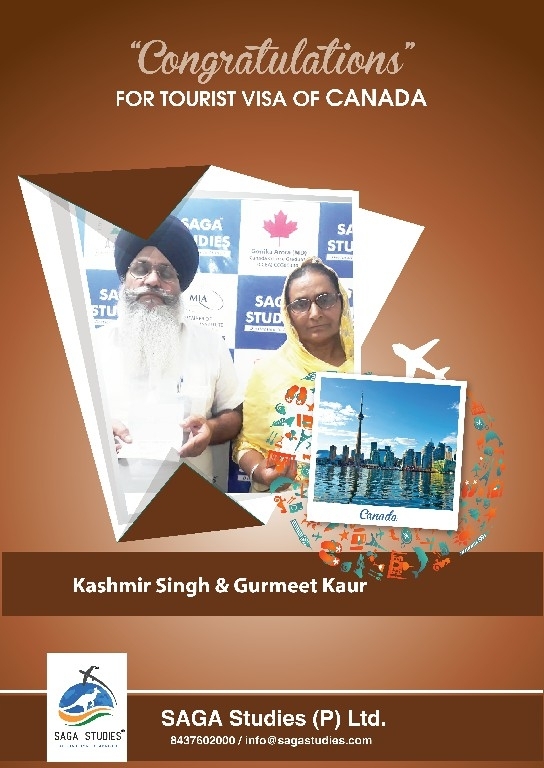 Congratulations Davinder Singh & Karamjit Kaur. 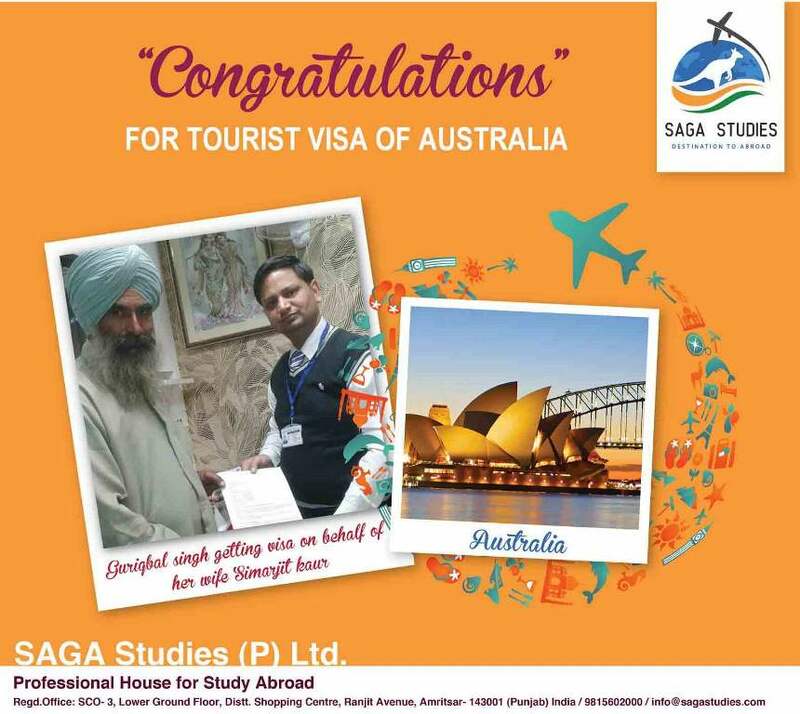 They got tourist visa of Australia.. SAGA Studies wishing you sucess and Prosperous life ahead. 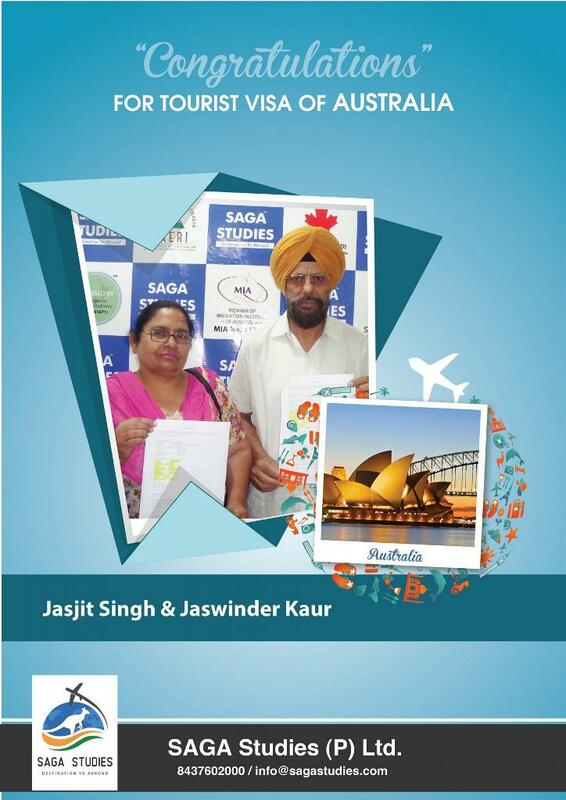 Congratulations Jasbir Singh & Balbir Kaur. They got tourist visa of Australia.. SAGA Studies wishing you sucess and Prosperous life ahead. 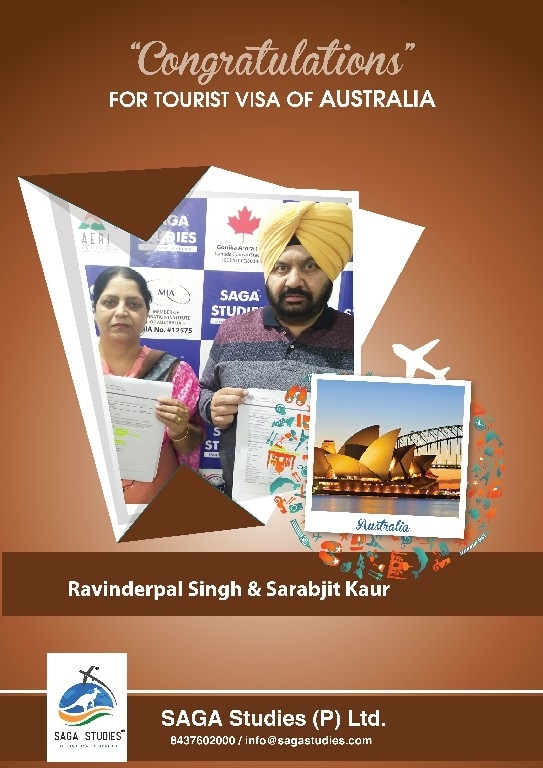 Congratulations Sarabjit Singh & Dalvinder Kaur. 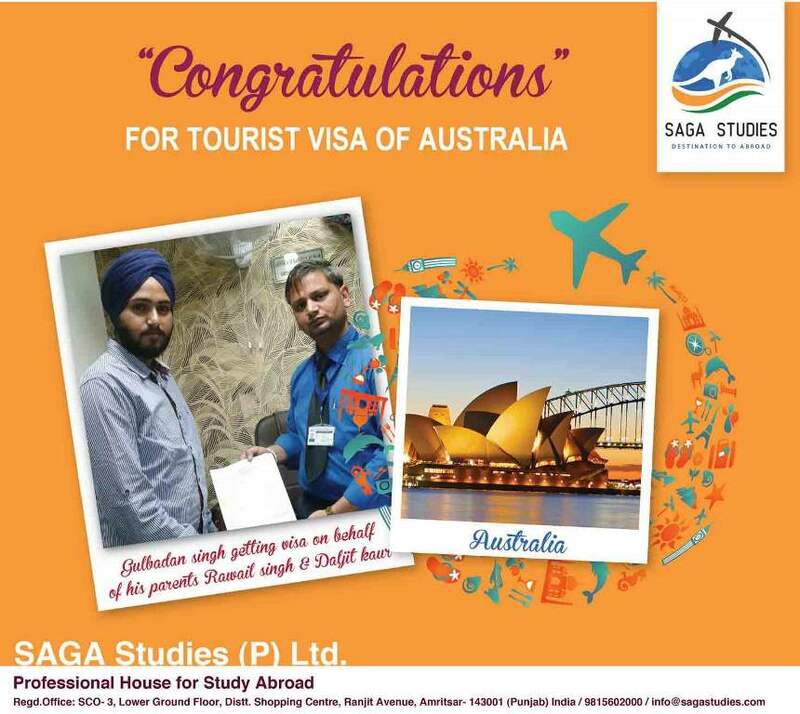 They got tourist visa of Australia.. SAGA Studies wishing you sucess and Prosperous life ahead. Congratulations Balkar Singh Sandhu and Kulwant Kaur Sandhu. They got tourist visa of Australia. 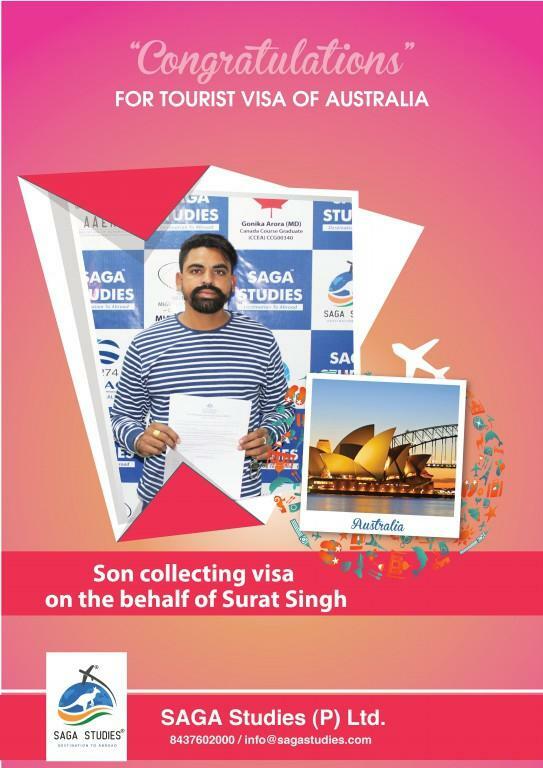 Son taking visa on behalf of their parents.. SAGA Studies wishing you sucess and Prosperous life ahead. 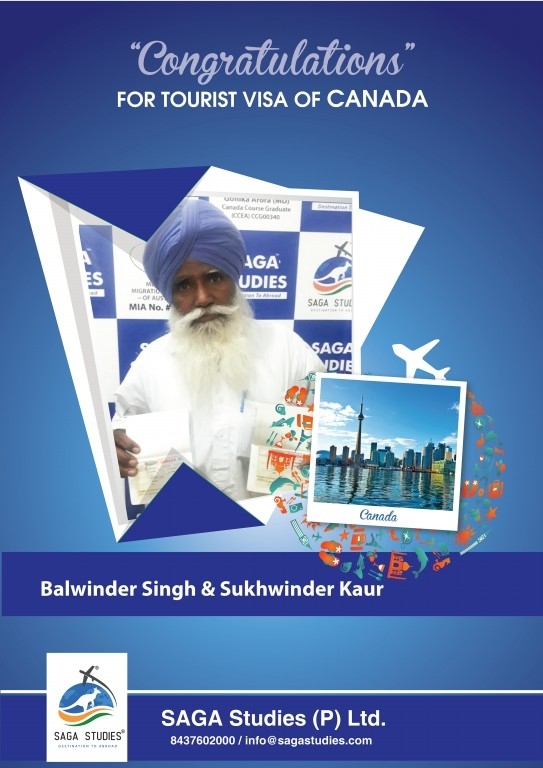 Congratulations Balwinder Singh & Sukhwinder Kaur. They got tourist visa of Australia. SAGA Studies wishing you success and Prosperous life ahead. 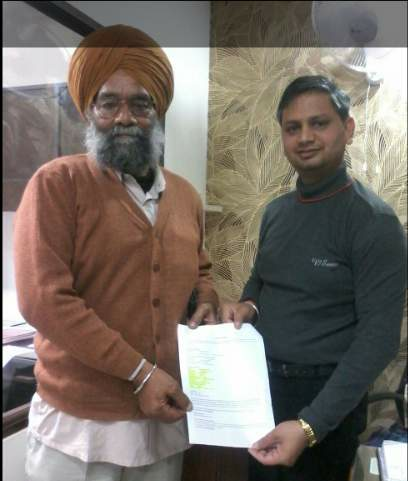 Congratulations Gurdev Singh Mann. He got tourist visa of Australia.. SAGA Studies wishing you sucess and Prosperous life ahead. 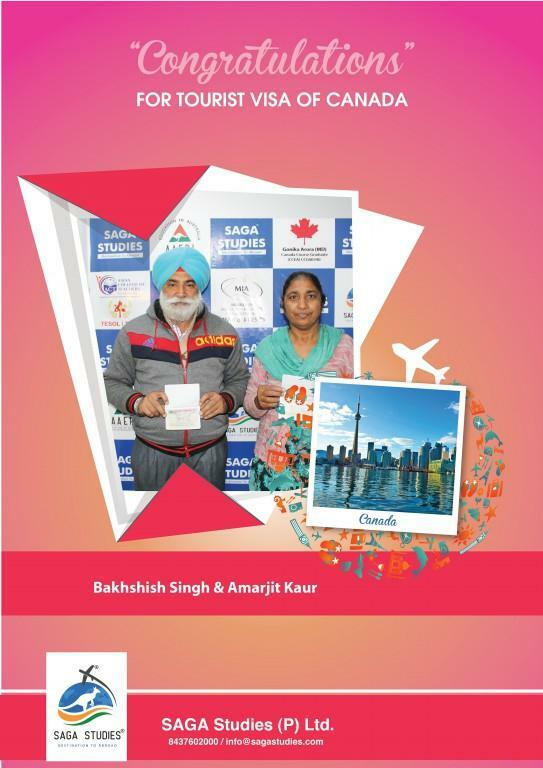 Congratulations Jagbir Singh & Baljit Kaur. They got tourist visa of Canada. SAGA Studies wishing you success and Prosperous life ahead. 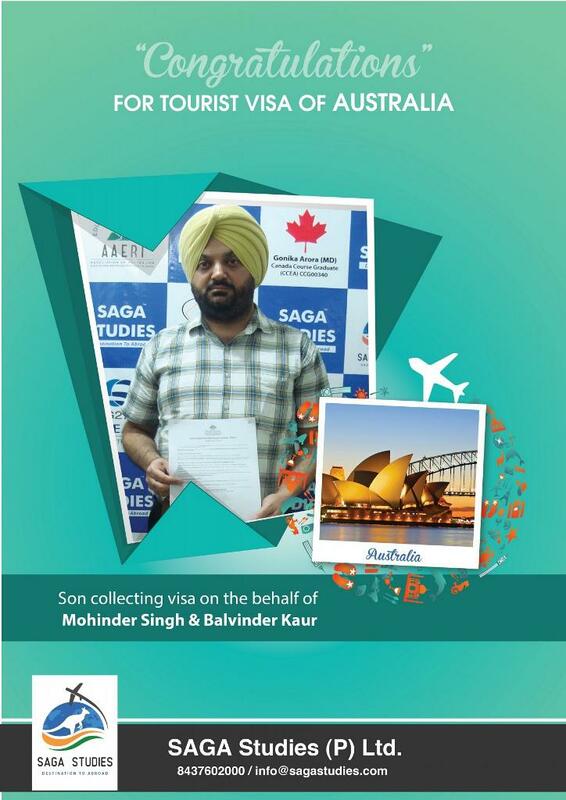 Congratulations Mohinder Singh & Baljit Kaur. They got tourist visa of Australia. SAGA Studies wishing you success and Prosperous life ahead. 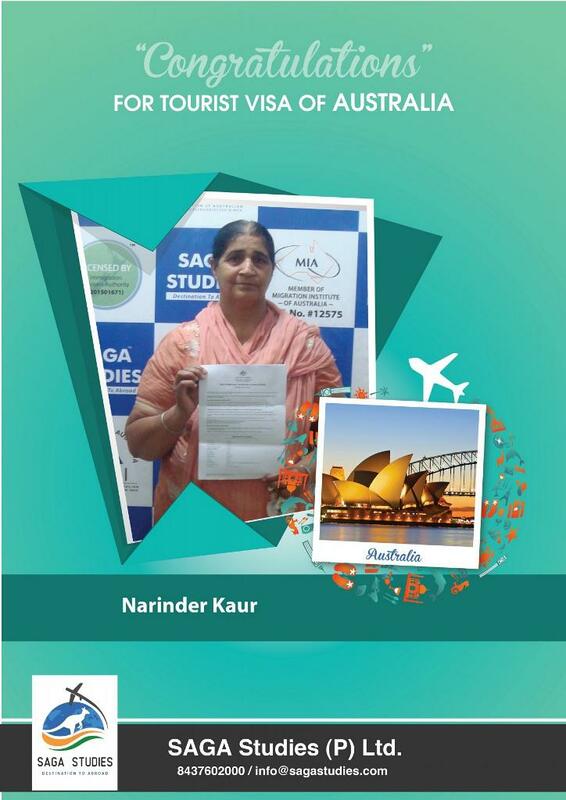 Congratulations Narinder Kumari. 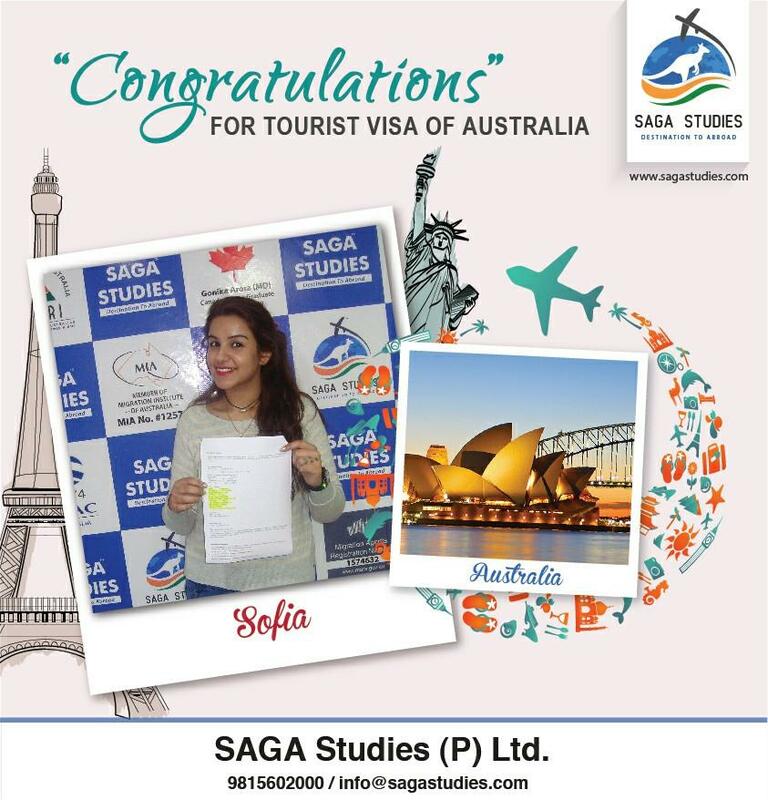 She got tourist visa of Australia.. SAGA Studies wishing you success and Prosperous life ahead. 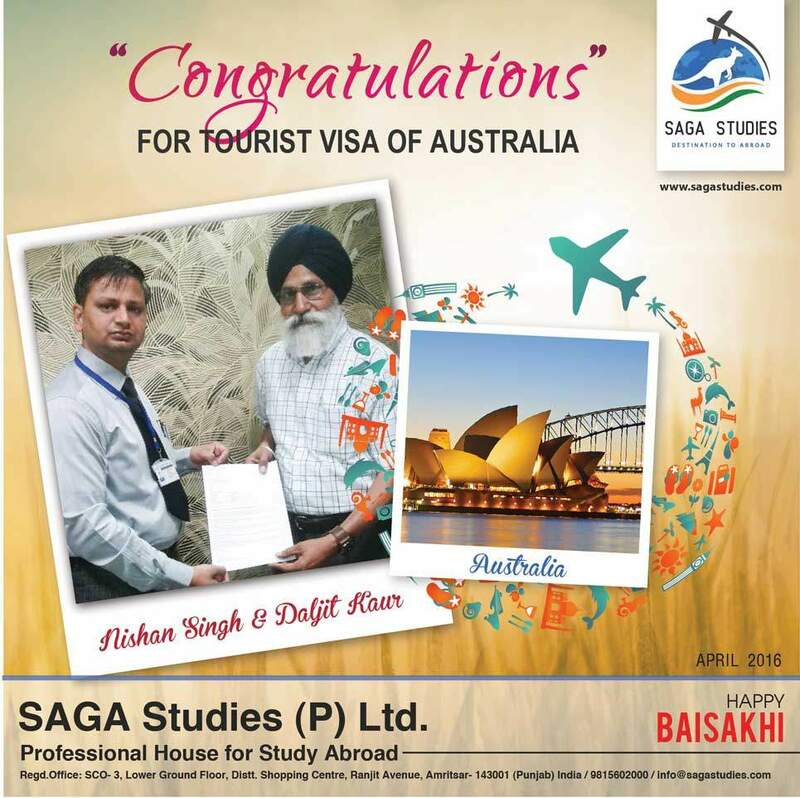 Congratulations Nishan Singh & Daljit Kaur. They got tourist visa of Australia. SAGA Studies wishing you success and Prosperous life ahead. Congratulations Paramjit Kaur. She got tourist visa of Australia.. SAGA Studies wishing you success and Prosperous life ahead. Congratulations Ravinder Kaur. 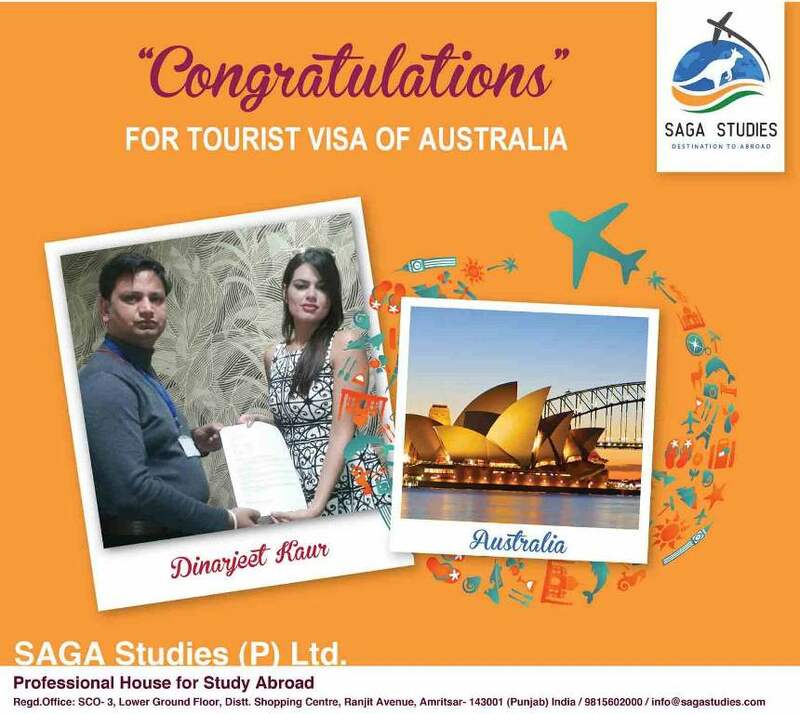 She got tourist visa of Australia.. SAGA Studies wishing you success and Prosperous life ahead. Congratulations Swinder Singh & Rajinder Kaur. They got tourist visa of Australia. SAGA Studies wishing you success and Prosperous life ahead. 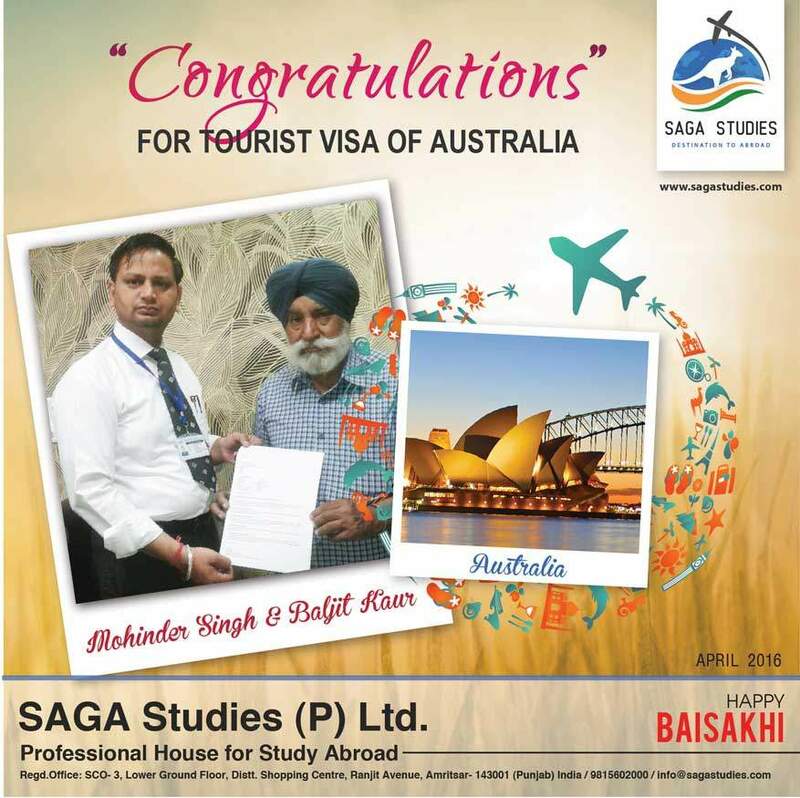 Congratulations Bakshish Singh. They got tourist visa of Australia.. SAGA Studies wishing you sucess and Prosperous life ahead. 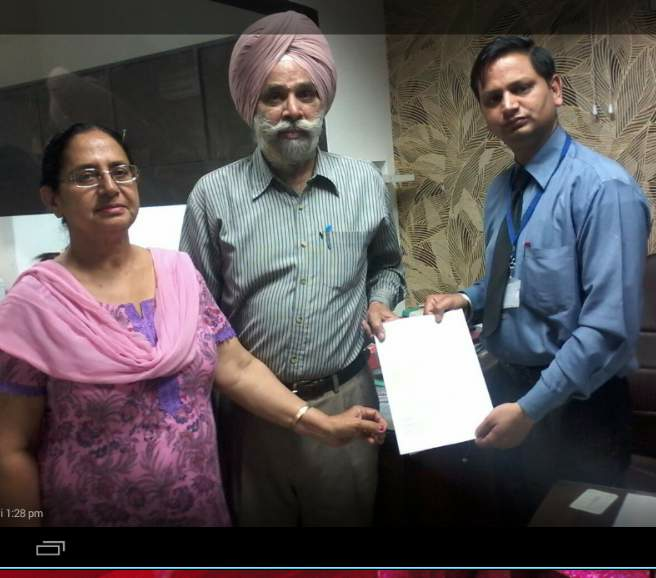 — at SAGA Studies (P) Ltd.
Congratulations Balbir Kaur. She got tourist visa of Australia. 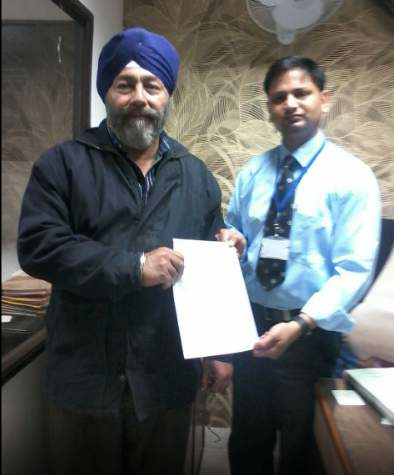 Lakhwinder Singh taking visa on behalf of his wife.. SAGA Studies wishing you sucess and Prosperous life ahead. — at SAGA Studies (P) Ltd.
Congratulations Baldev Singh & Rajvinder Kaur. They got tourist visa of Australia. 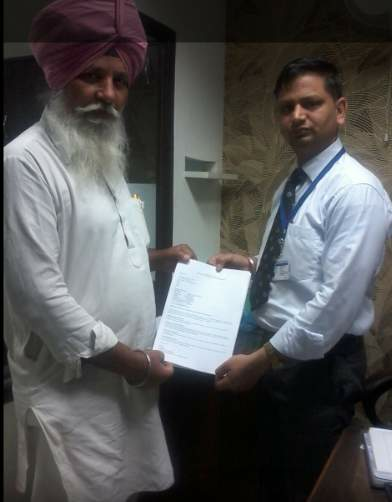 Sarwan Singh taking visa on behalf of their parents.. SAGA Studies wishing you sucess and Prosperous life ahead. 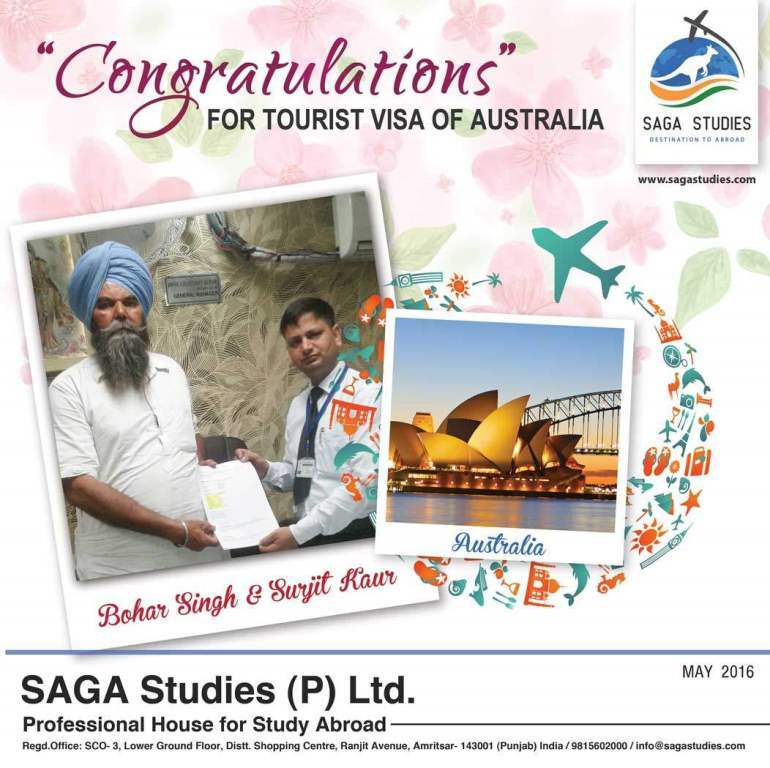 Congratulations Bohar Singh & Surjit Kaur. They got tourist visa of Australia.. SAGA Studies wishing you sucess and Prosperous life ahead. 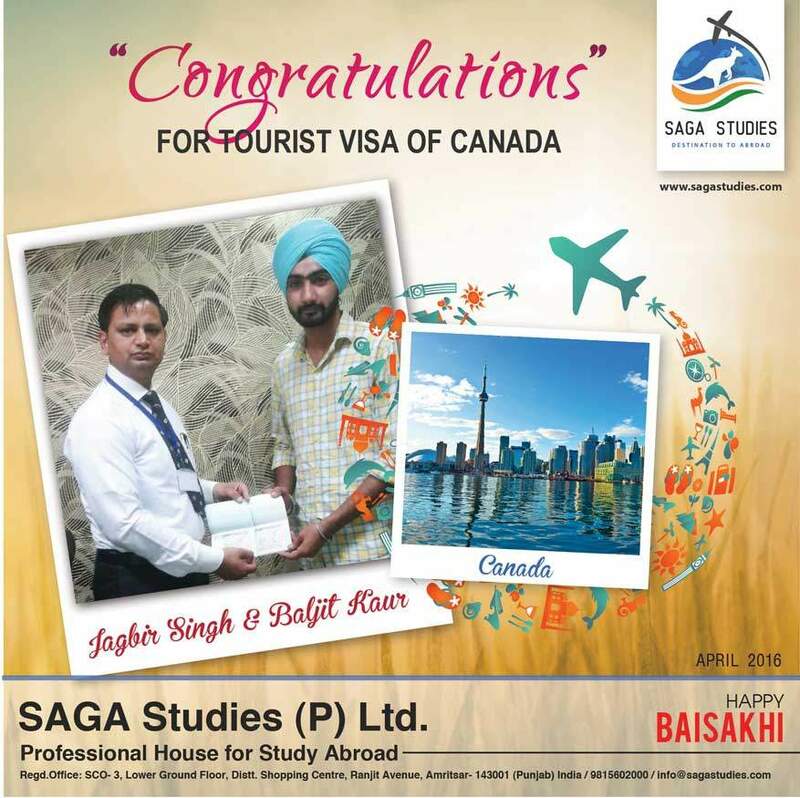 — at SAGA Studies (P) Ltd.
Congratulations Jagbir Singh & Baljit Kaur. They got tourist visa of Australia. 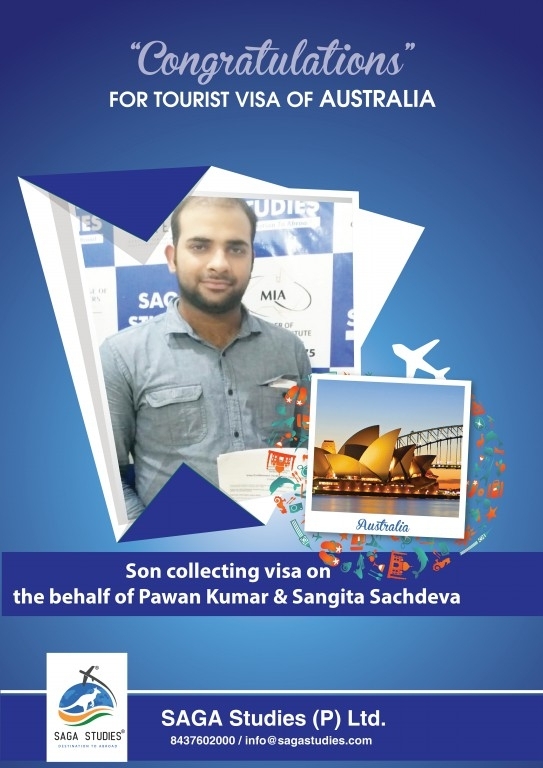 Son taking visa on behalf of their parents.. SAGA Studies wishing you sucess and Prosperous life ahead. 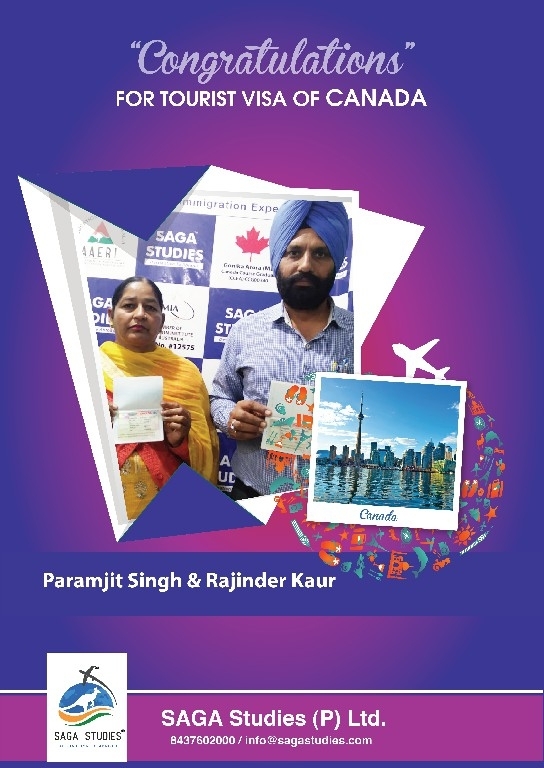 Congratulations Kartar Singh & Rajwant Kaur. 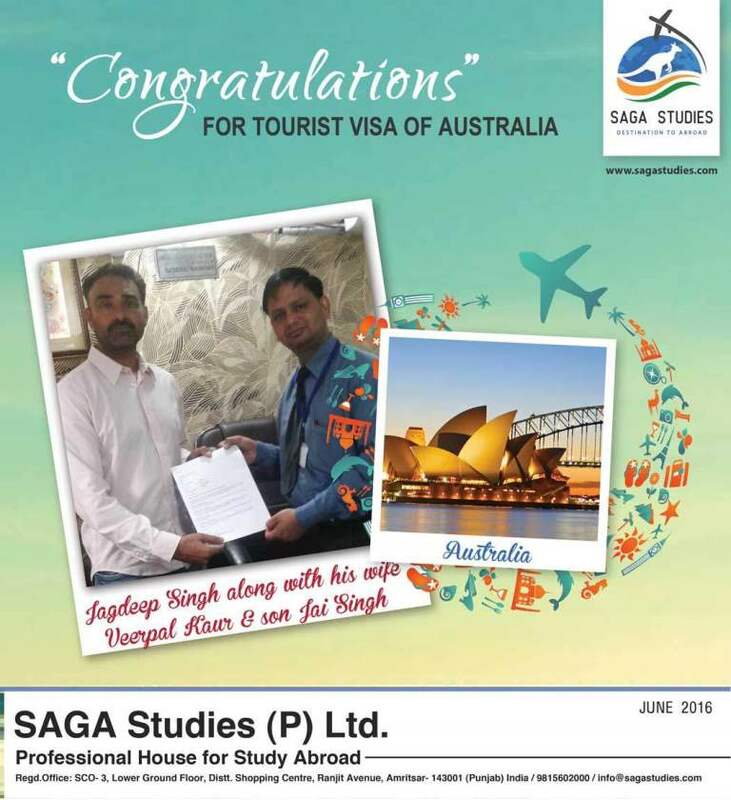 They got tourist visa of Australia.. SAGA Studies wishing you sucess and Prosperous life ahead. Congratulations Raminder Kaur. She got tourist visa of Australia. 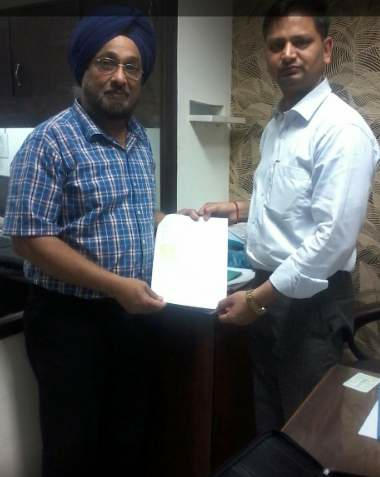 Balwinder Singh taking visa on behalf of his wife.. SAGA Studies wishing you sucess and Prosperous life ahead. Congratulations Swinder Singh & Rajinder Kaur. They got tourist visa of Australia.. SAGA Studies wishing you sucess and Prosperous life ahead. Congratulations Jaswant Singh. 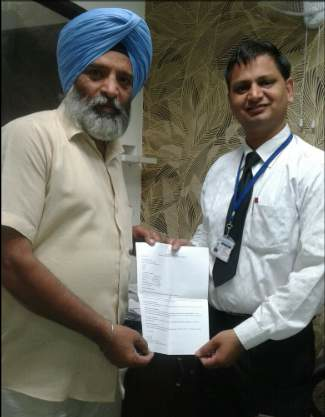 He got tourist visa of Australia. 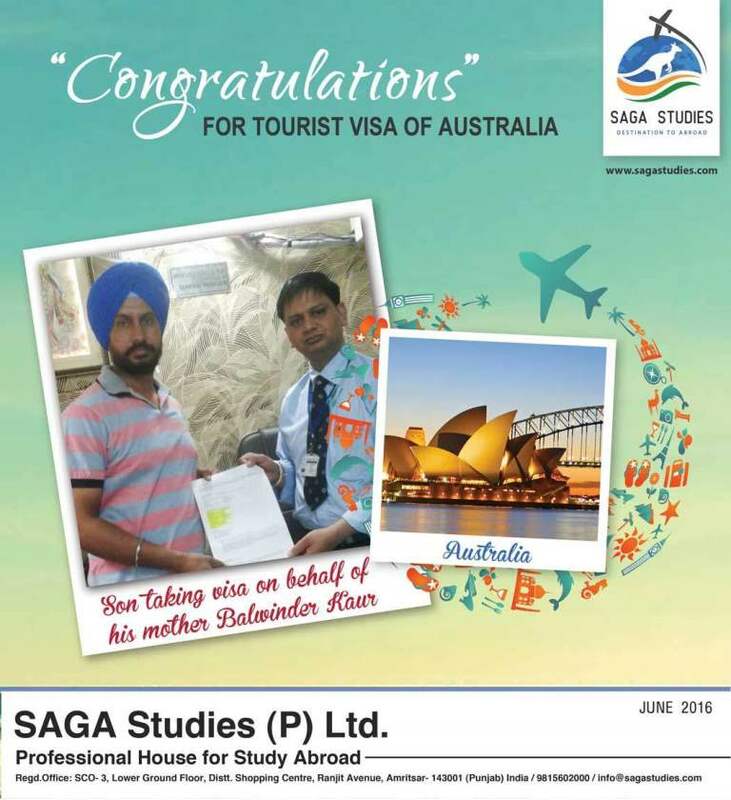 SAGA Studies wishing you sucess and Prosperous life ahead. 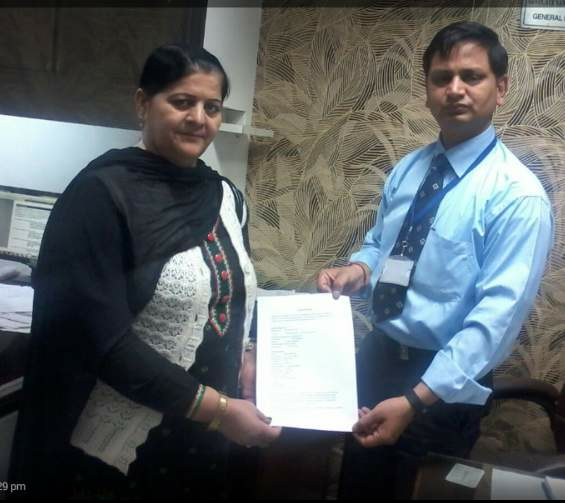 Congratulations Kuldeep Kaur. She got tourist visa of Australia. SAGA Studies wishing you sucess and Prosperous life ahead. Congratulations Kulwant Kaur. She got tourist visa of Australia. 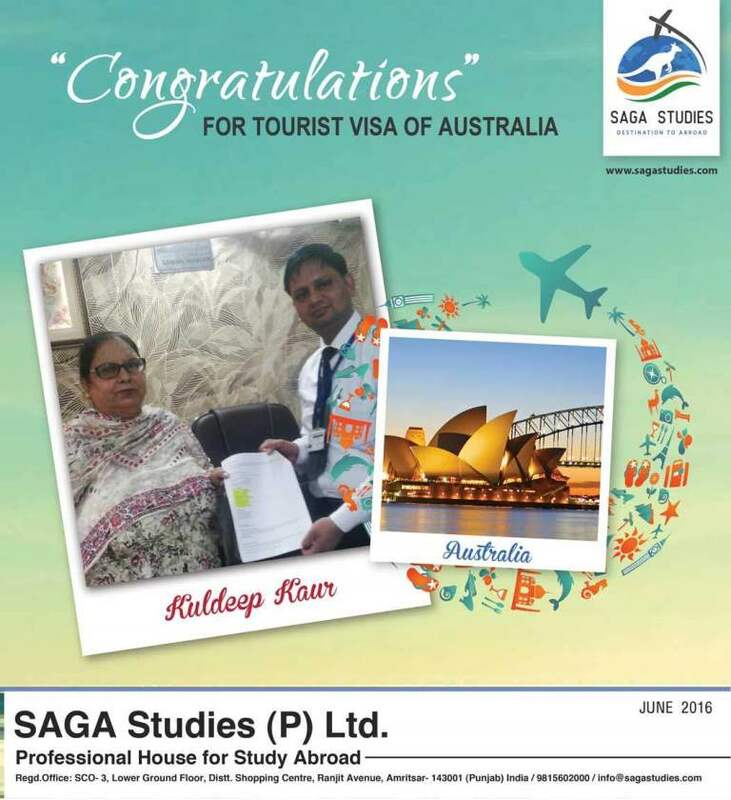 Son taking visa on her behalf.. SAGA Studies wishing you sucess and Prosperous life ahead. Congratulations Manpreet Kaur. She got tourist visa of New Zealand. 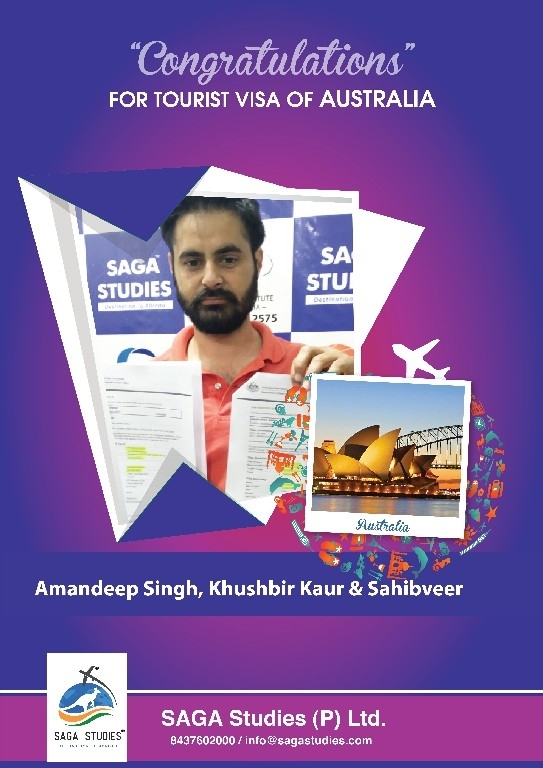 SAGA Studies wishing you sucess and Prosperous life ahead. Congratulations Parambir Kaur. She got tourist visa of Australia. 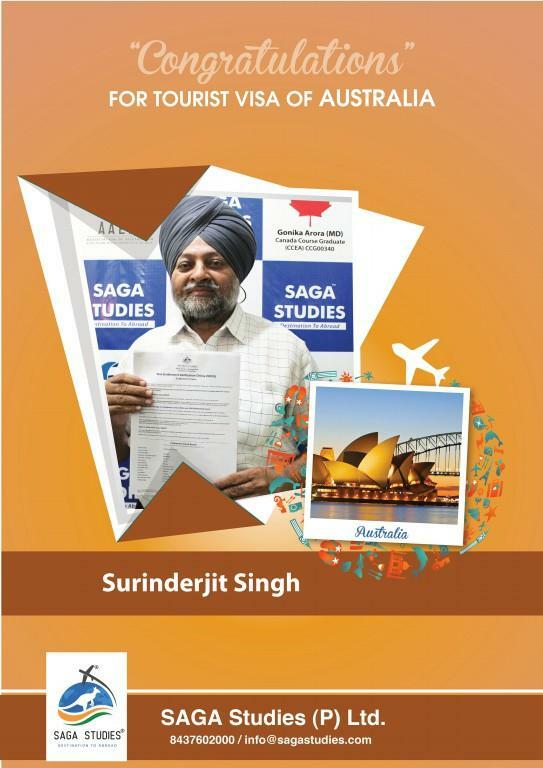 SAGA Studies wishing you sucess and Prosperous life ahead. Congratulations Rajbir Kaur. She got tourist visa of Australia. 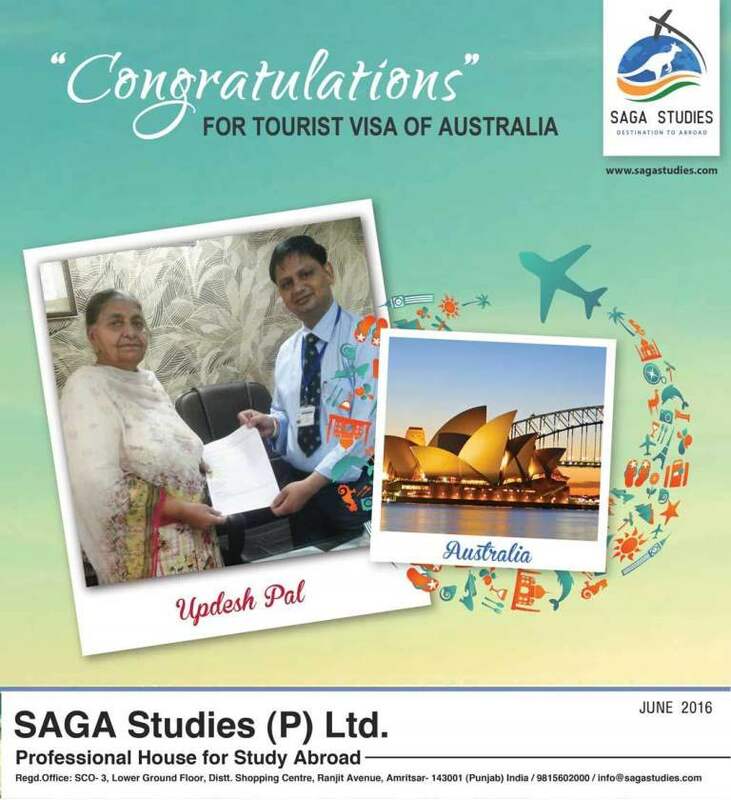 Son taking visa on her behalf.. SAGA Studies wishing you sucess and Prosperous life ahead. Congratulations Sanniya Patheja. She got tourist visa of Australia. 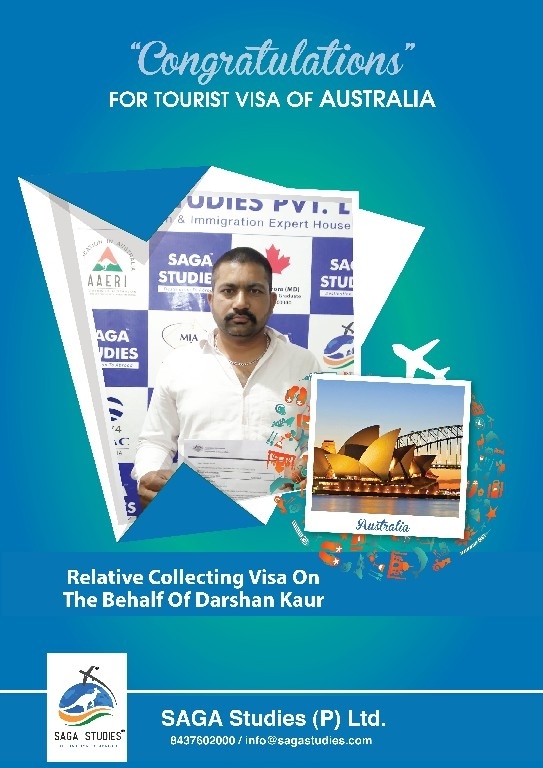 Brother in Law taking visa on her behalf.. SAGA Studies wishing you sucess and Prosperous life ahead. 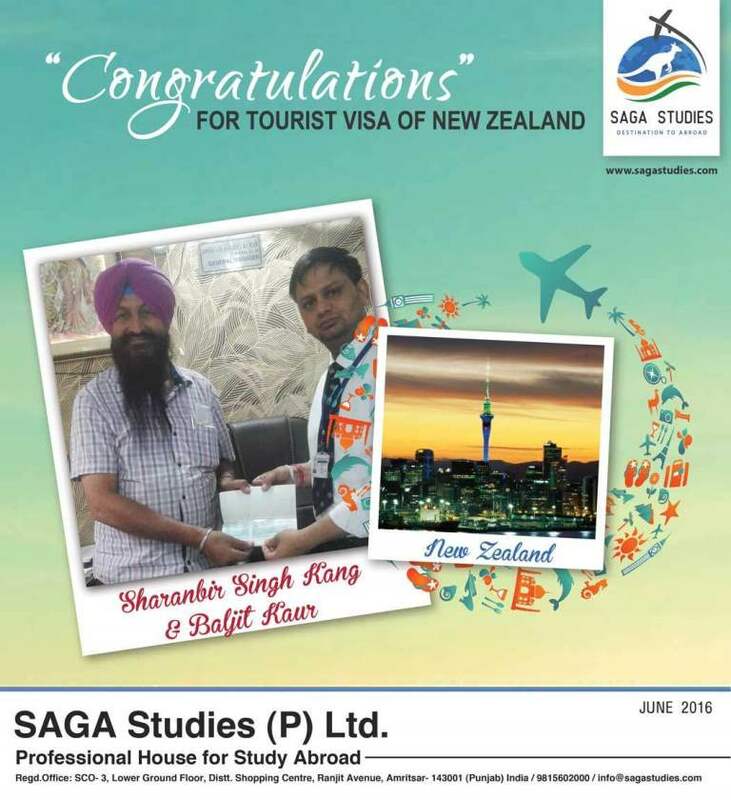 Congratulations Sharanbir Singh Kang & Baljit Kaur. 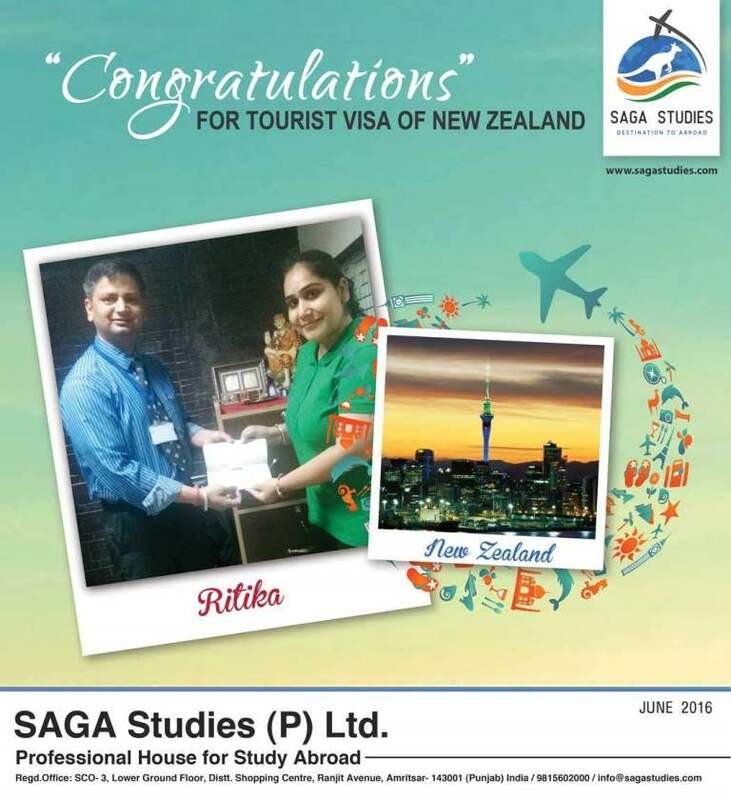 They got tourist visa of New Zealand. 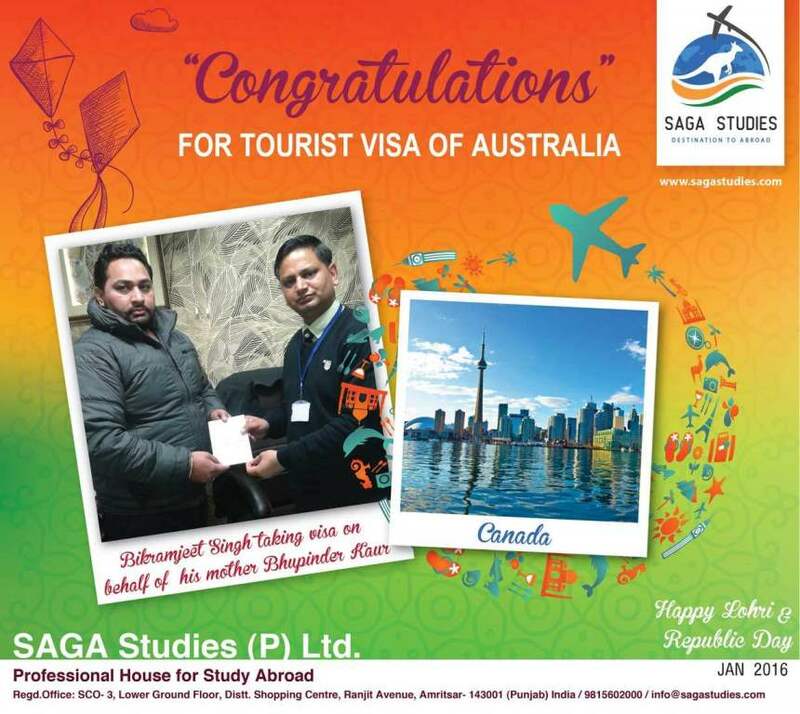 SAGA Studies wishing you sucess and Prosperous life ahead. 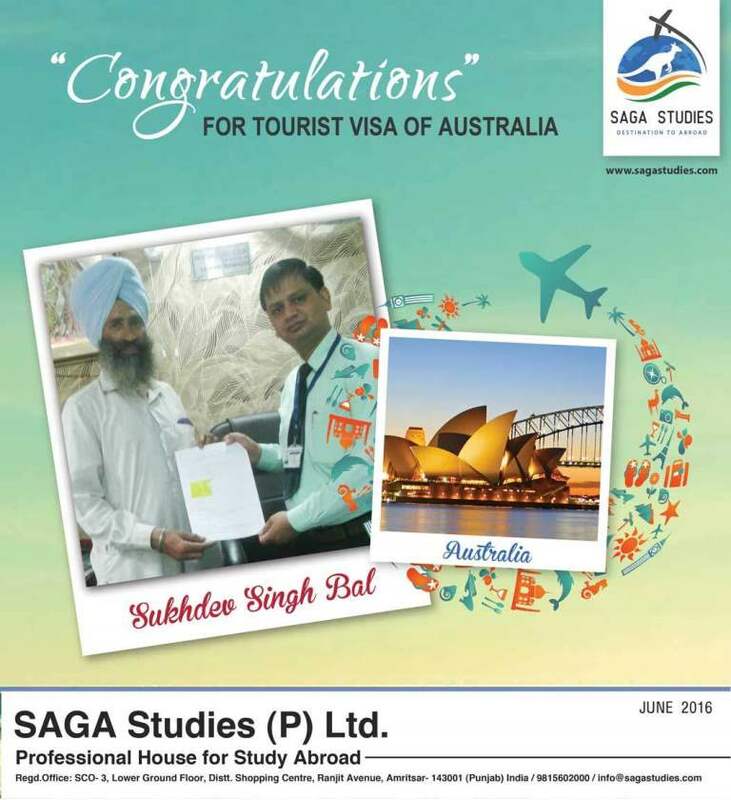 Congratulations Sukhdev Singh Bal. 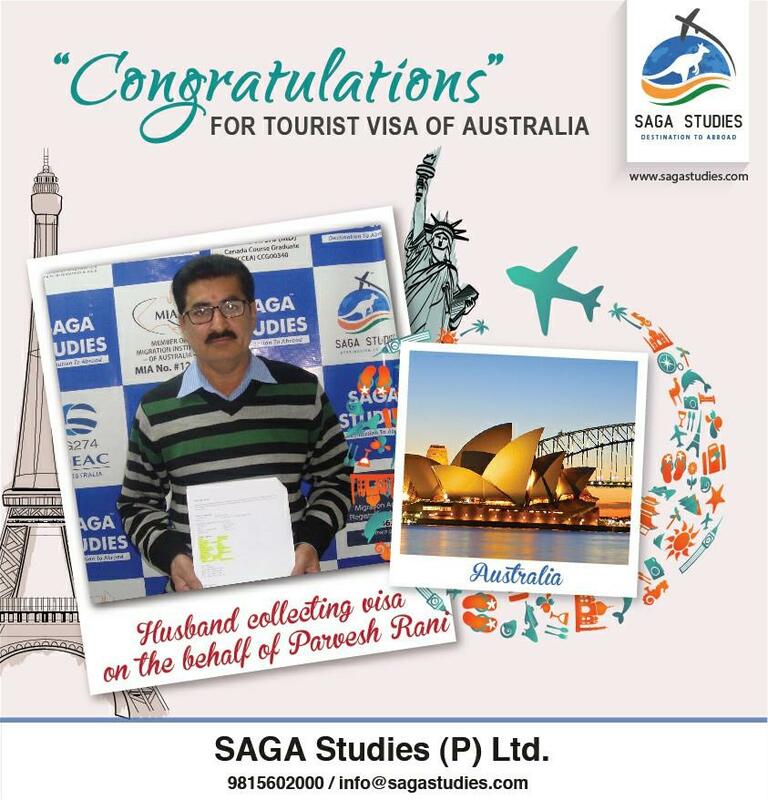 He got tourist visa of Australia. 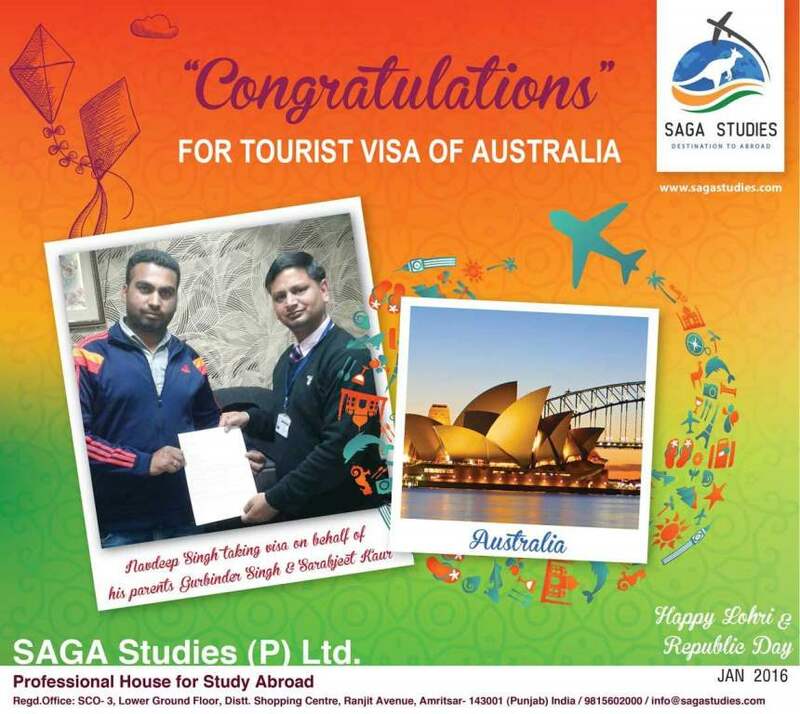 SAGA Studies wishing you sucess and Prosperous life ahead. Congratulations Updesh Pal. She got tourist visa of Australia. SAGA Studies wishing you sucess and Prosperous life ahead. Congratulations Varinderjit Singh Bamrah & Ranjit Kaur. They got tourist visa of Canada. 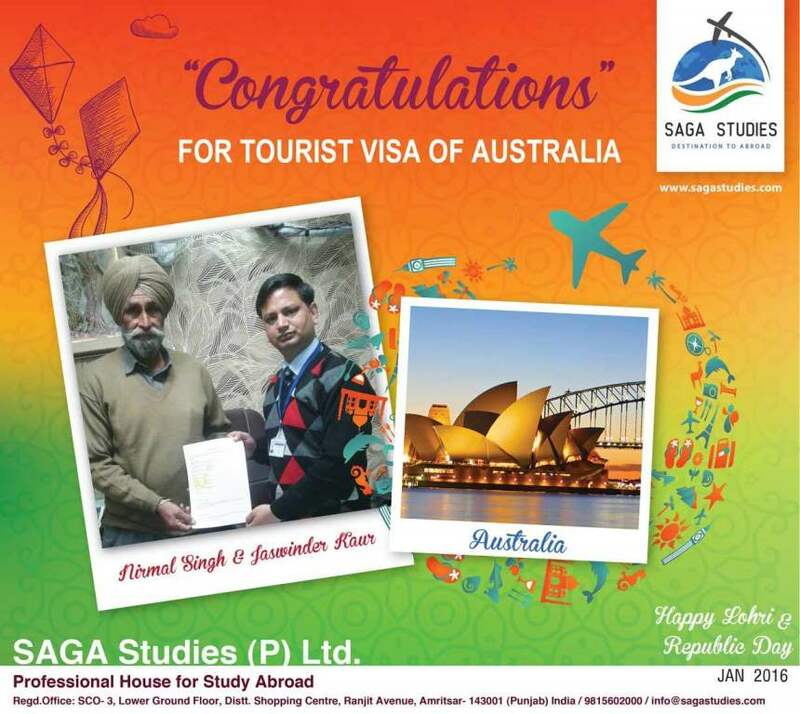 SAGA Studies wishing you sucess and Prosperous life ahead. 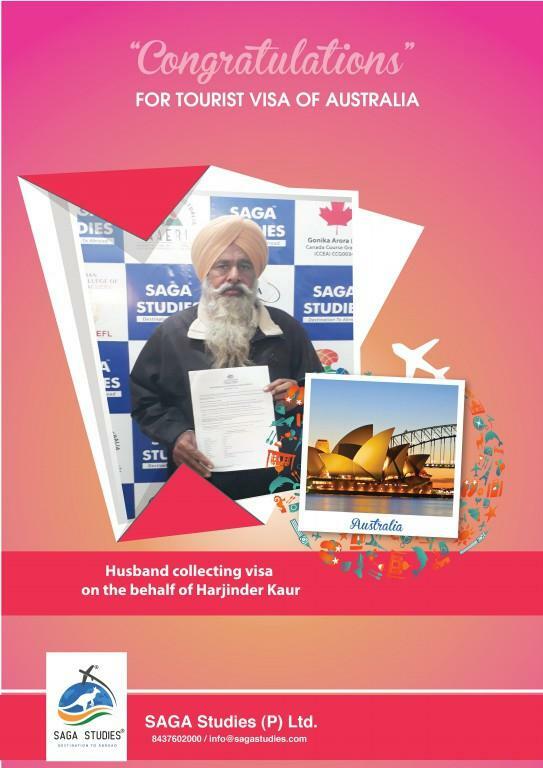 Congratulations Surinder Kaur Alias Hardip Kaur. She got tourist visa of Australia. 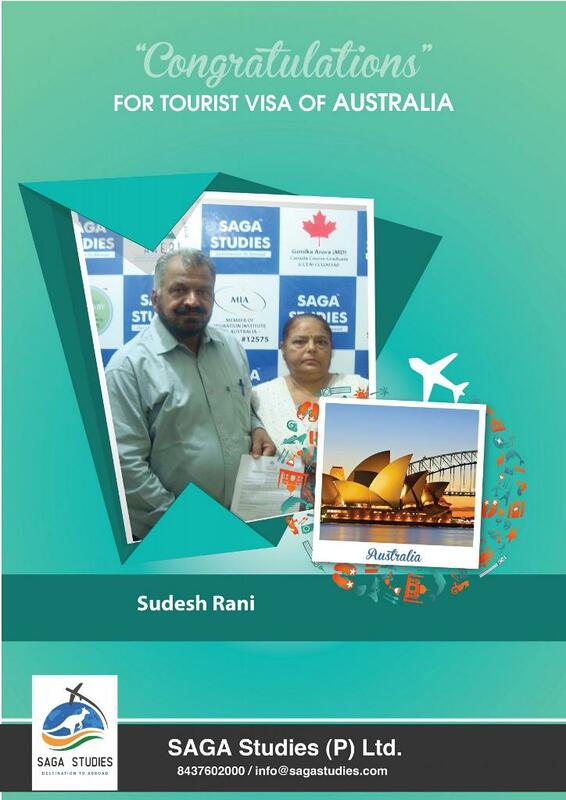 Son taking visa on her behalf.. SAGA Studies wishing you sucess and Prosperous life ahead. 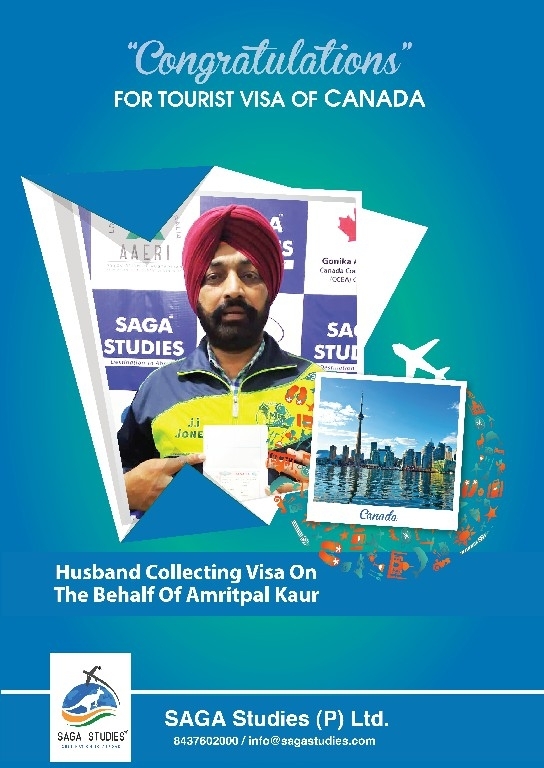 Congratulations Amrik Singh & Paramjeet Kaur. They got tourist visa of Australia. SAGA Studies wishing you sucess and Prosperous life ahead. Congratulations Balwinder Kaur. She got tourist visa of Australia. 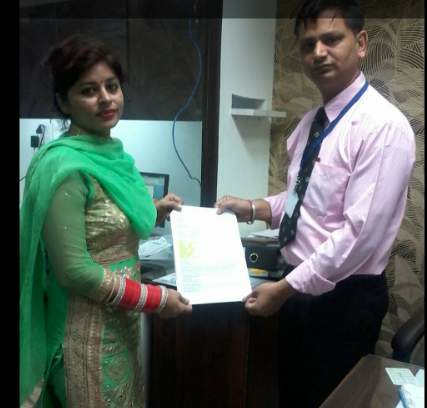 Son taking visa on her behalf.. SAGA Studies wishing you sucess and Prosperous life ahead. 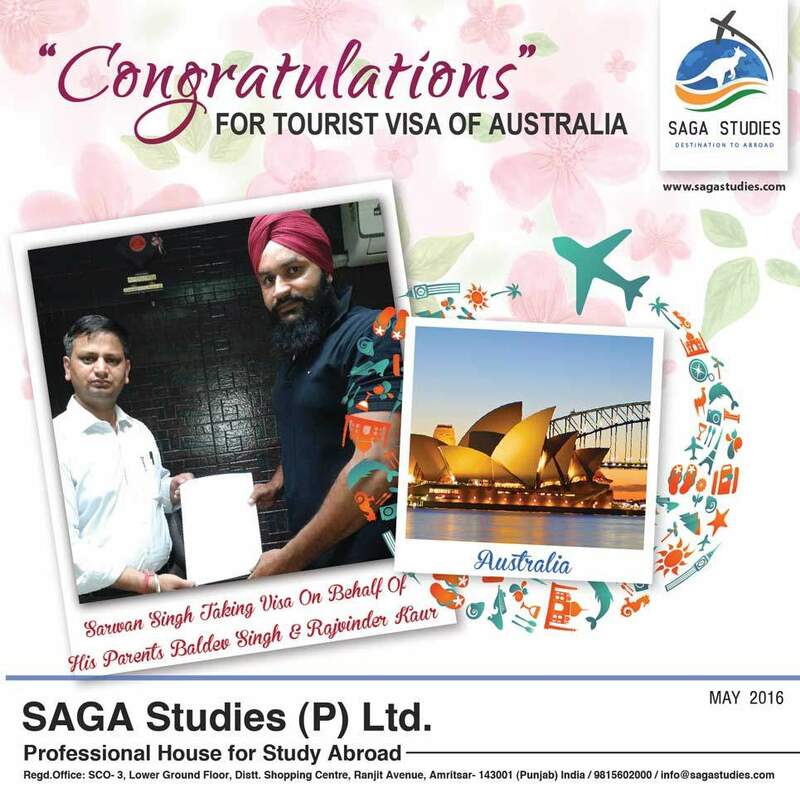 Congratulations Bhagwant Singh. He got tourist visa of Canada. SAGA Studies wishing you sucess and Prosperous life ahead. 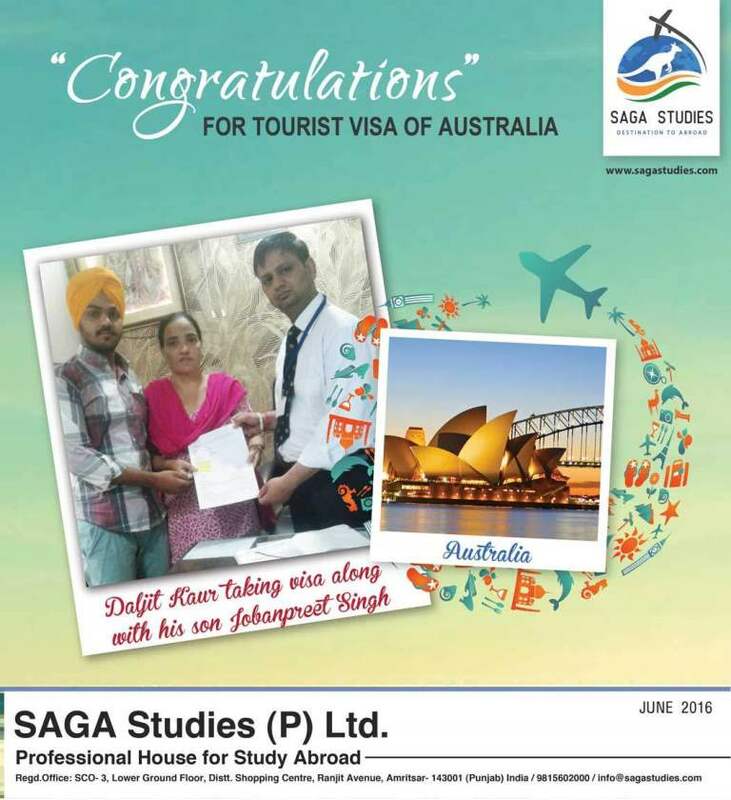 Congratulations Daljit Kaur and her son Jobanpreet Singh. They got tourist visa of Australia. 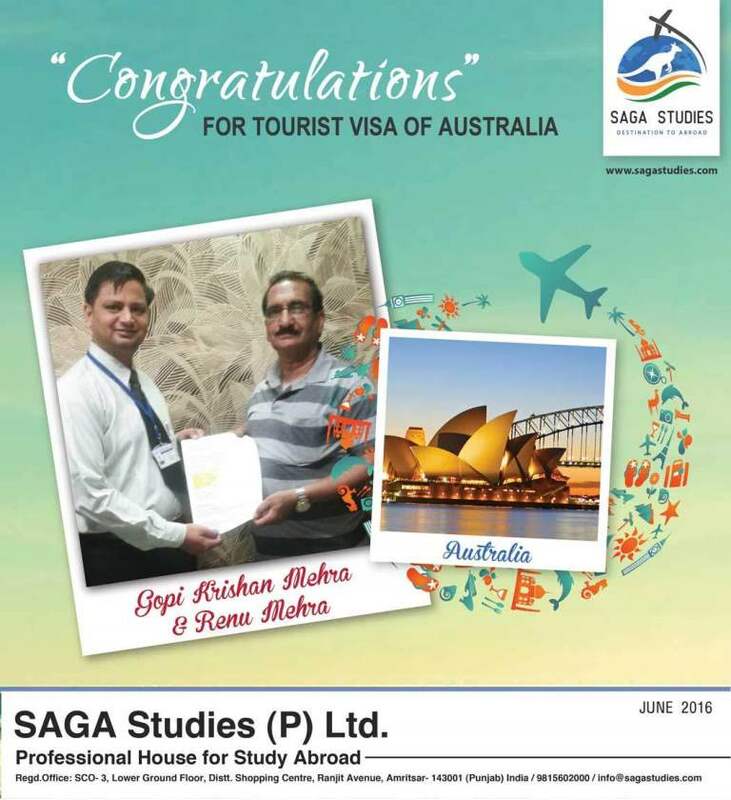 SAGA Studies wishing you sucess and Prosperous life ahead. Congratulations Gopi Krishan Mehra & Renu Mehra. They got tourist visa of Australia. 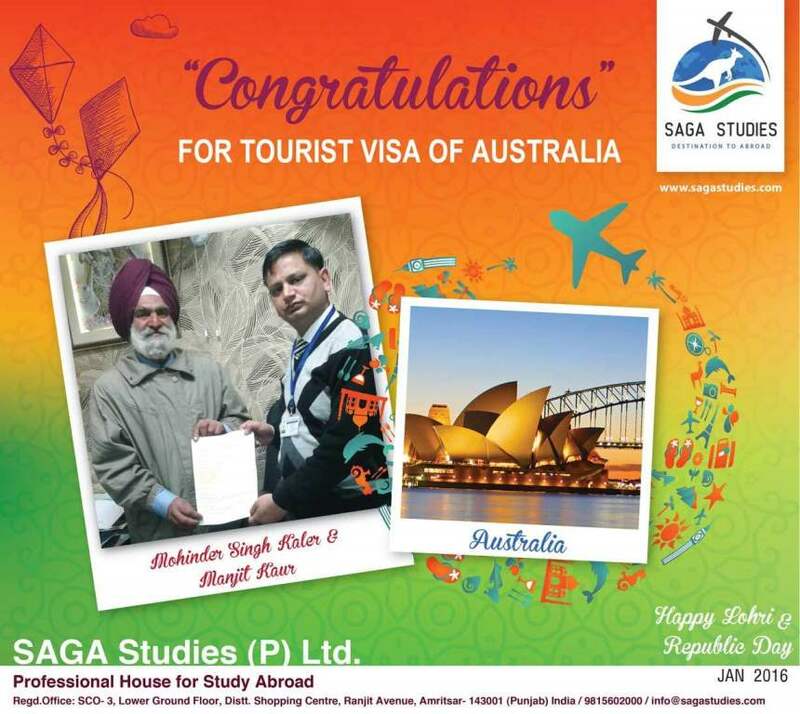 SAGA Studies wishing you sucess and Prosperous life ahead. 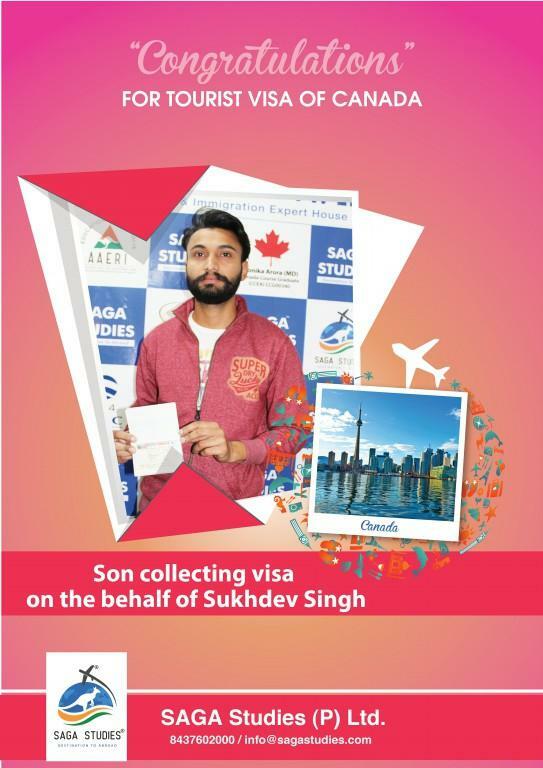 Congratulations Jagdeep Singh, his wife Veerpal Kaur and son Jai Singh. They got tourist visa of Australia.. SAGA Studies wishing you sucess and Prosperous life ahead. Congratulations Baswinder Kaur. She got tourist visa of Canada. 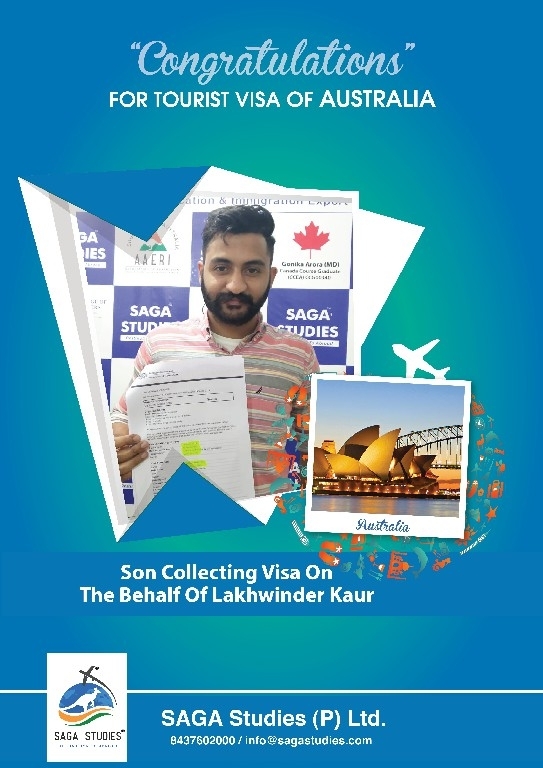 Son taking visa on her behalf.. SAGA Studies wishing you sucess and Prosperous life ahead. Congratulations Guljeet Kaur. She got tourist visa of Australia. 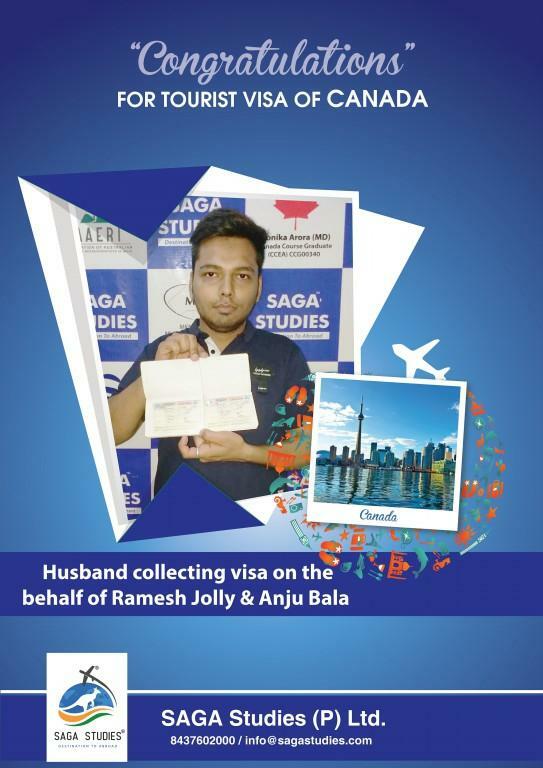 Son taking visa on her behalf.. SAGA Studies wishing you sucess and Prosperous life ahead. 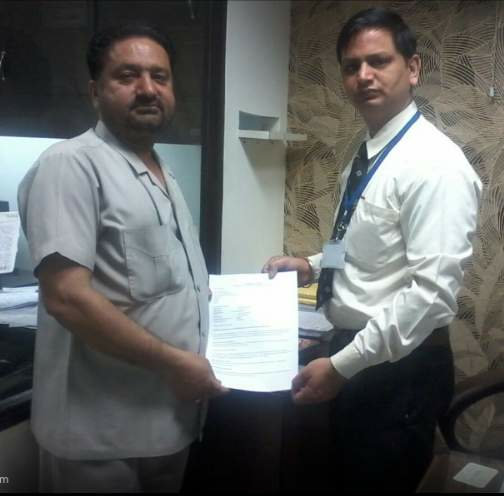 — at SAGA Studies (P) Ltd.
Congratulations Harbans Lal & Kashmiro. They got tourist visa of Australia. SAGA Studies wishing you sucess and Prosperous life ahead. 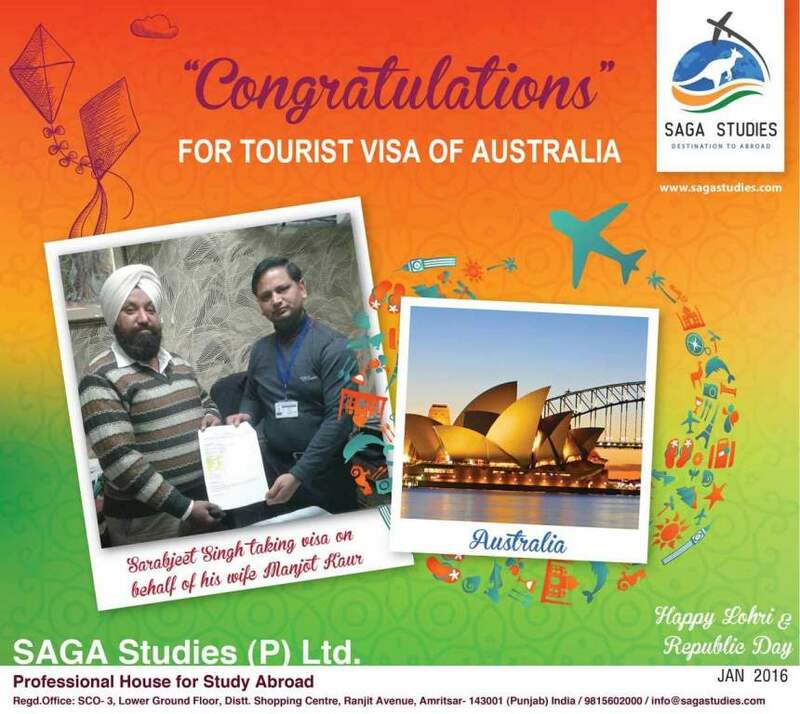 — at SAGA Studies (P) Ltd.
Congratulations Jaspal Singh & Dharambeer Kaur. They got tourist visa of Australia. SAGA Studies wishing you sucess and Prosperous life ahead. — at SAGA Studies (P) Ltd.
Congratulations Sarbjit Kaur. She got tourist visa of Australia. 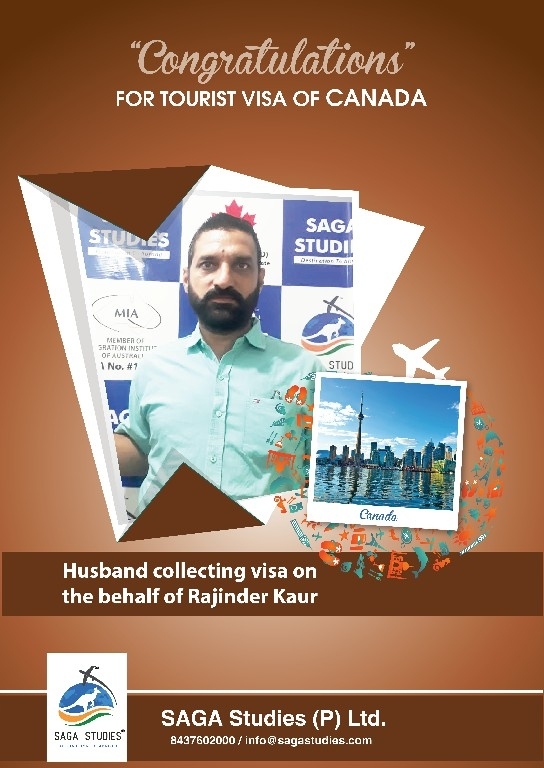 Husband taking visa on her behalf.. SAGA Studies wishing you sucess and Prosperous life ahead. — at SAGA Studies (P) Ltd.
Congratulations Simranjit Kaur. She got tourist visa of Australia. SAGA Studies wishing you sucess and Prosperous life ahead. 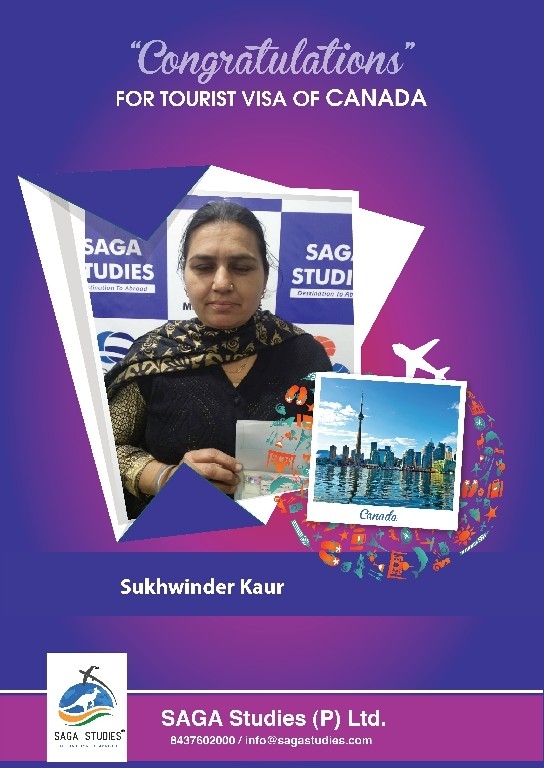 — at SAGA Studies (P) Ltd.
Congratulations Sukhwinder Kaur. She got tourist visa of Australia. 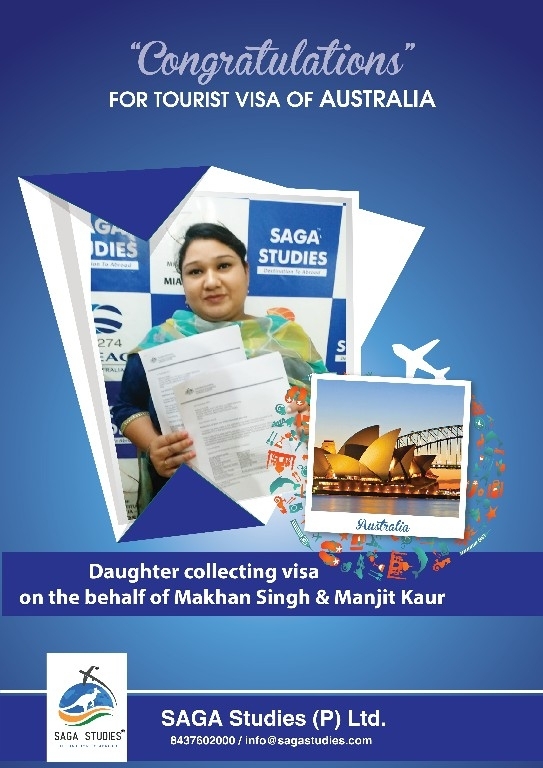 Son taking visa on her behalf.. SAGA Studies wishing you sucess and Prosperous life ahead. — at SAGA Studies (P) Ltd.
Congratulations Surinder Kaur. She got tourist visa of Australia. 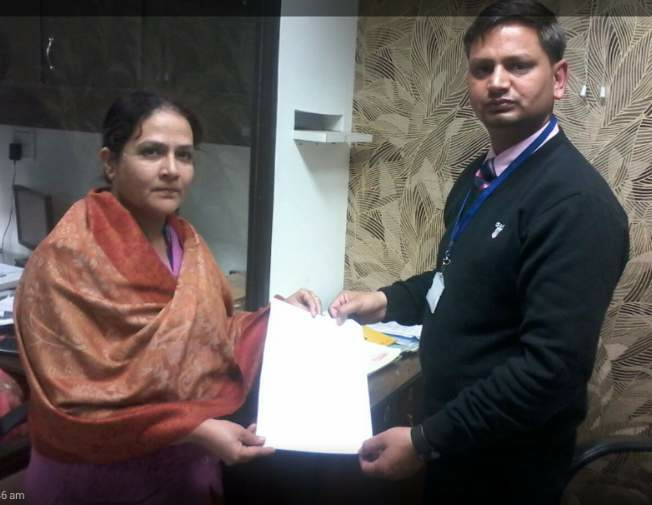 Relative taking visa on her behalf.. SAGA Studies wishing you sucess and Prosperous life ahead. 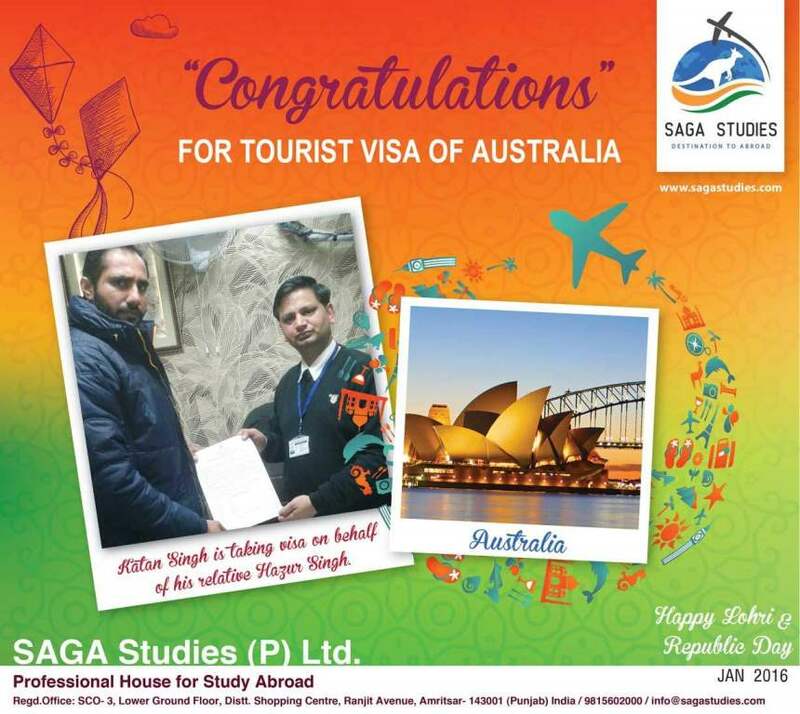 — at SAGA Studies (P) Ltd.
Congratulations Baldev Singh & Kuldeep kaur... 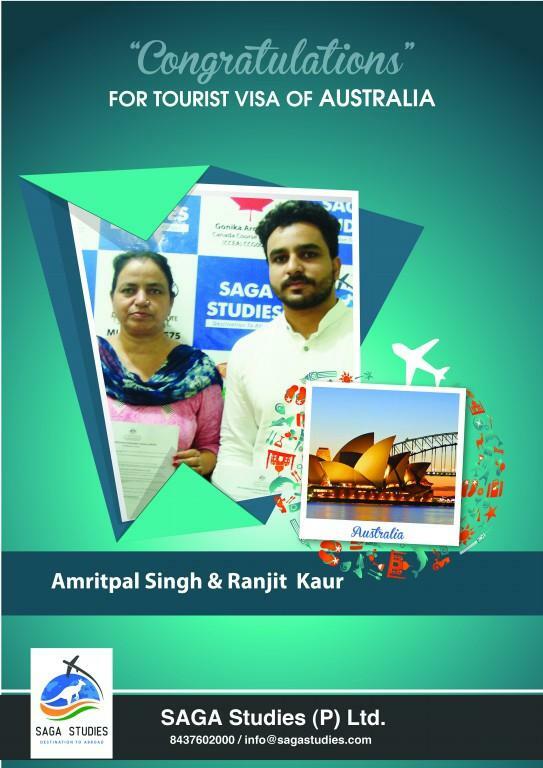 They got tourist visa for Australia... we wish them all the best for life ahead. Congratulations Baldev Singh & Kuldeep kaur... 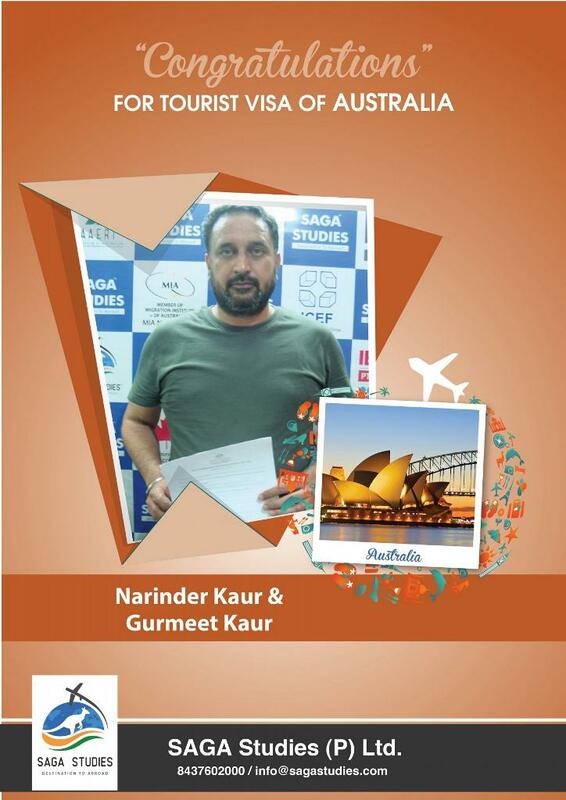 They got tourist visa for Australia... we wish them all the best for life ahead..
congratulations Narinderpal singh... He got tourist visa of her wife Mrs. Balwinder kaur for Australia... SAGA Studies wishing them all the best for life head..
Congratulations Simarjit kaur. 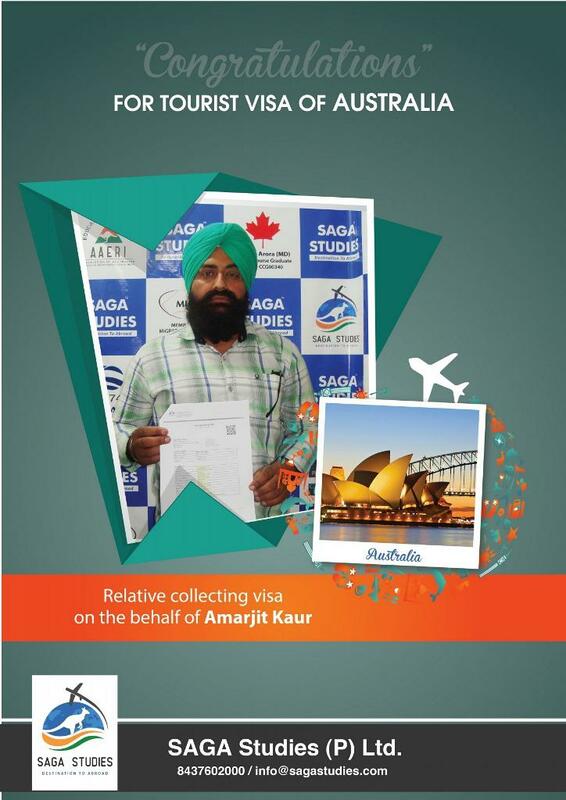 She got tourist visa of Australia....Guriqbal singh getting visa of his wife simarjit kaur. 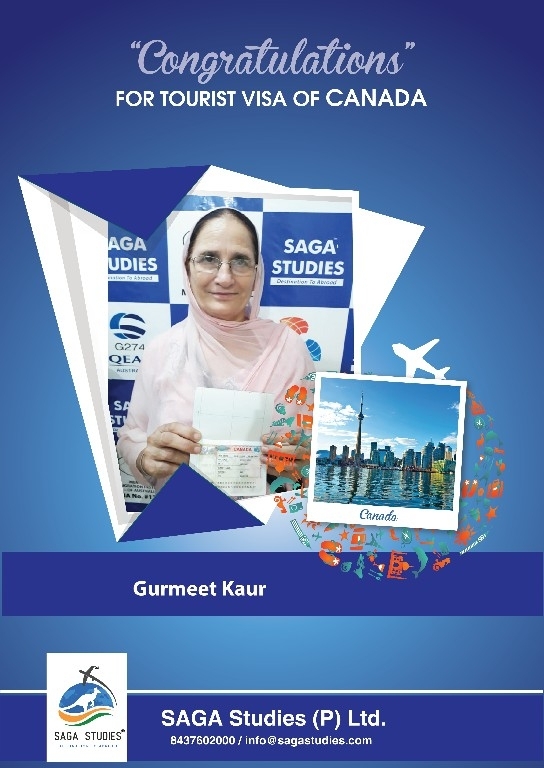 SAGA Studies wishing you sucess and Prosperous life ahead..
Congratulations Kashmir Kaur. 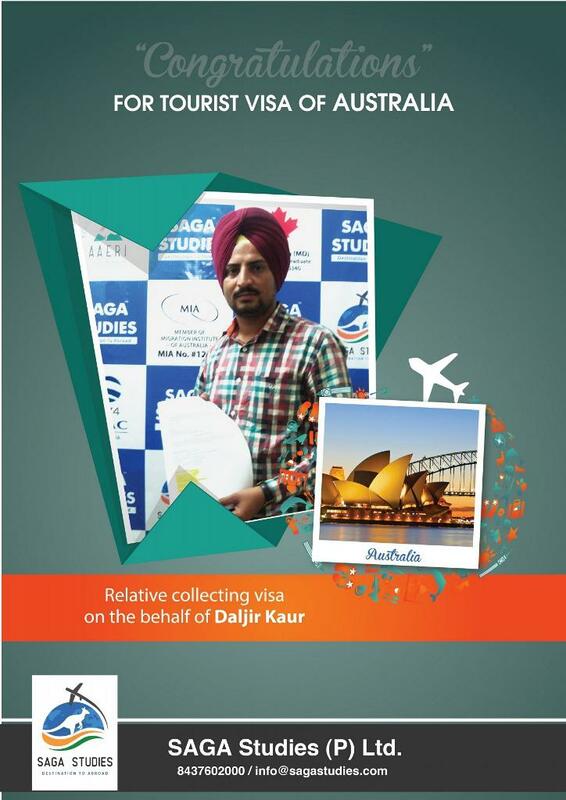 She got tourist visa of Australia....Harbhajan Singh is getting visa on behalf of her wife. 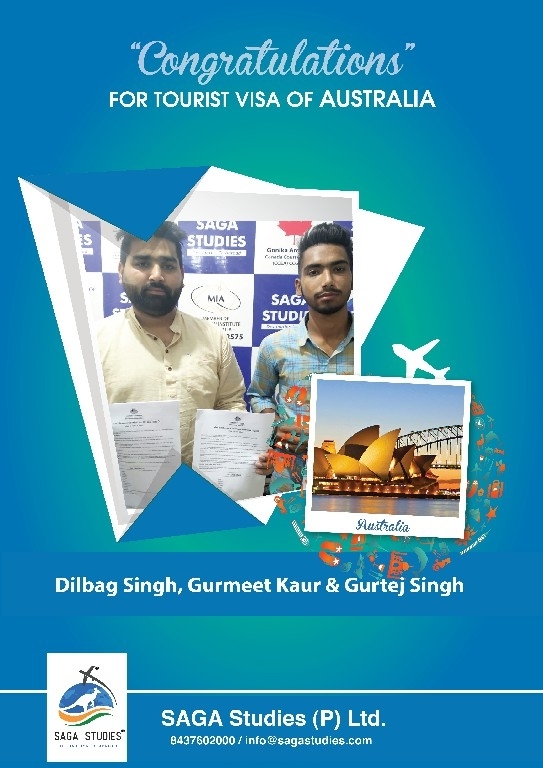 SAGA Studies wishing you sucess and Prosperous life ahead..
Congratulations Kewal Krishan Dhawan.He got tourist visa of Australia.. SAGA Studies wishing you sucess and Prosperous life ahead..
Congratulations Lakhwinder Singh & Kulwinder Kaur. Their son is taking visa on behalf of them. SAGA Studies wishing you sucess and Prosperous life ahead. Congratulations Mohinder Singh & Naminder Kaur.They got tourist visa of Australia.. SAGA Studies wishing you sucess and Prosperous life ahead. 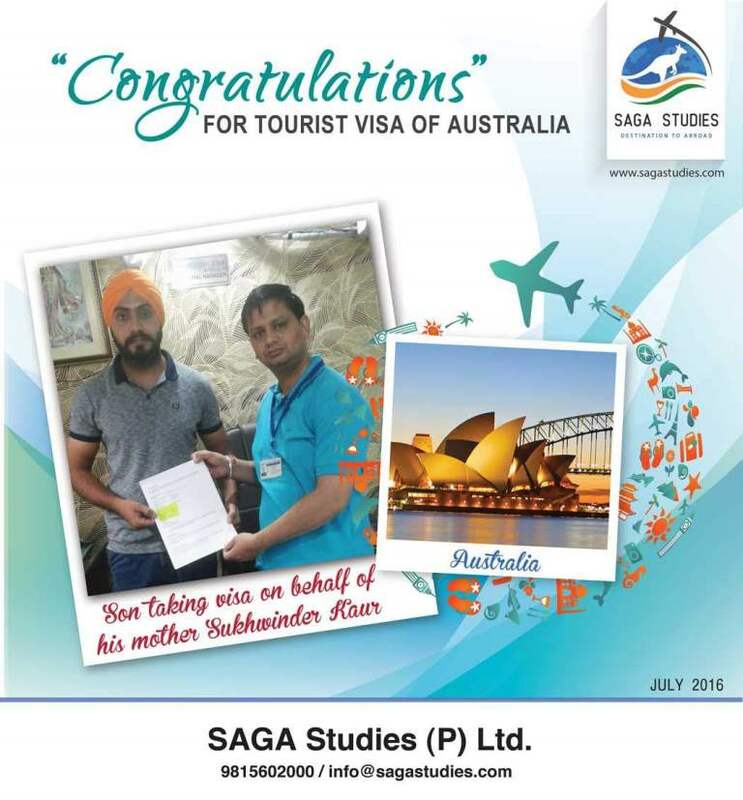 Congratulations Sarmej Singh. 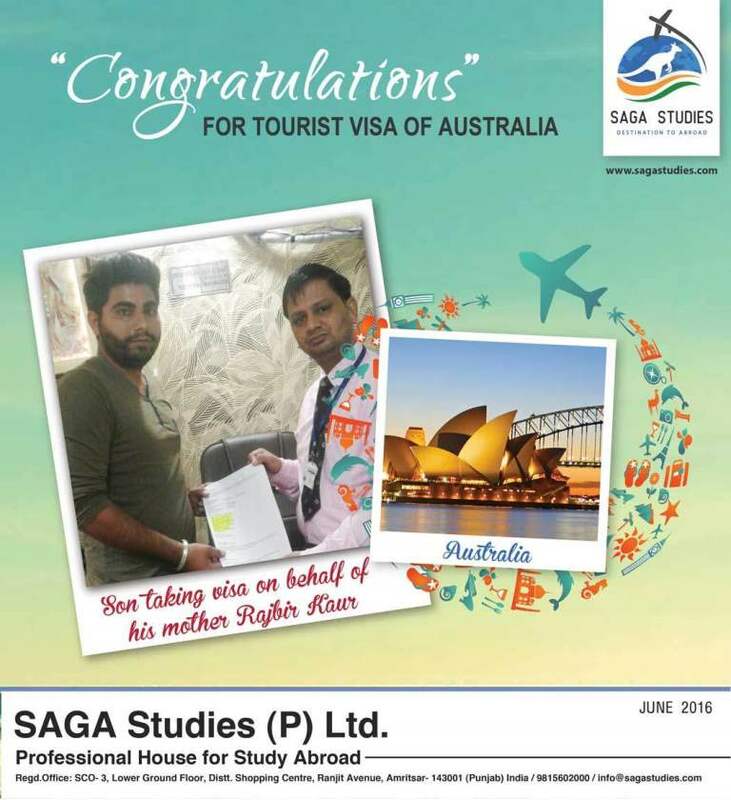 He got tourist visa of Australia.. SAGA Studies wishing you sucess and Prosperous life ahead. 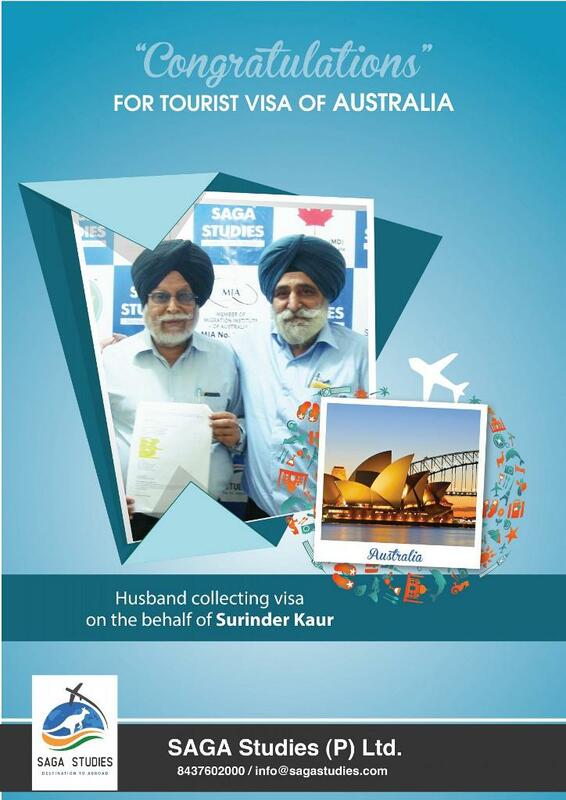 Congratulations Baldev Singh & Surinder Kaur. 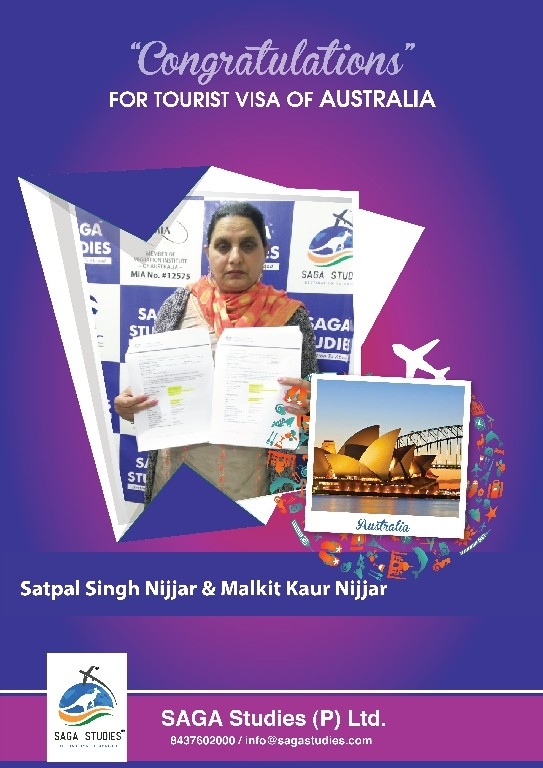 They got tourist visa of Australia.. SAGA Studies wishing you sucess and Prosperous life ahead..
Congratulations Baljit kaur. 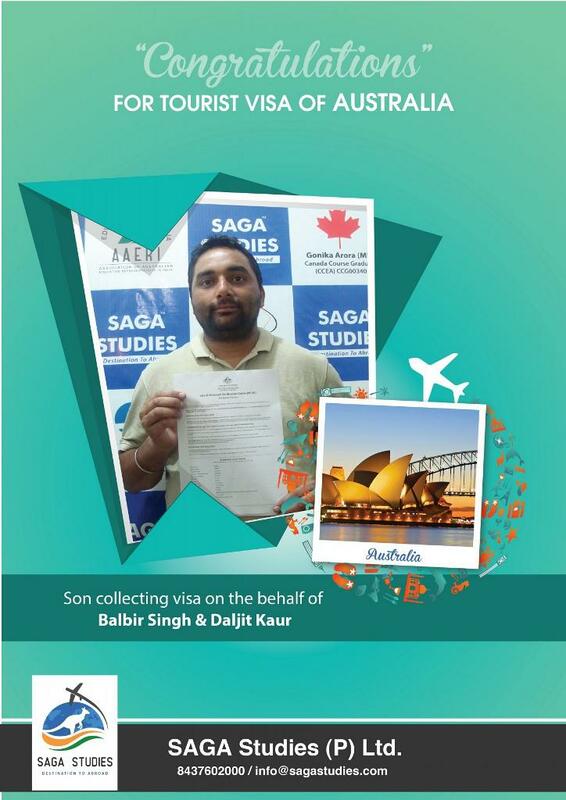 She got tourist visa of Australia...Balraj Singh is getting visa on behalf of her mother. 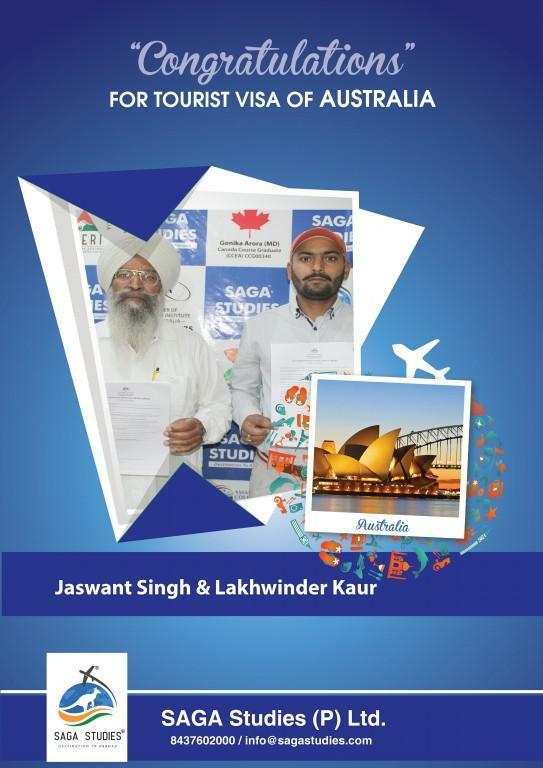 SAGA Studies wishing you sucess and Prosperous life ahead..
Congratulations Lakhwinder Singh & Swaranjit Kaur. 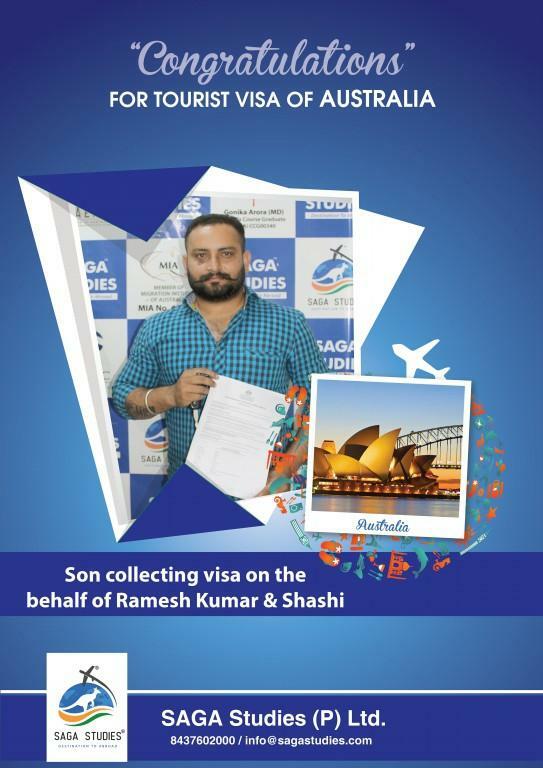 They got tourist visa of Australia....Nephew is getting visa on their behalf. SAGA Studies wishing you sucess and Prosperous life ahead..
Congratulations Smt. Rani. 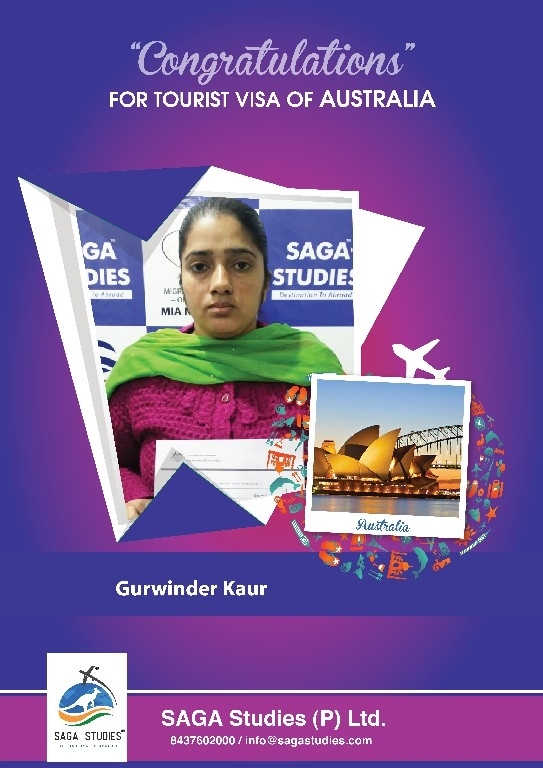 She got tourist visa of Australia.. SAGA Studies wishing you sucess and Prosperous life ahead..
Congratulations Surinder Kaur. Sarmej Singh is getting tourist visa on behalf of their relative.. SAGA Studies wishing you sucess and Prosperous life ahead..
Congratulations Ravi Kanta. 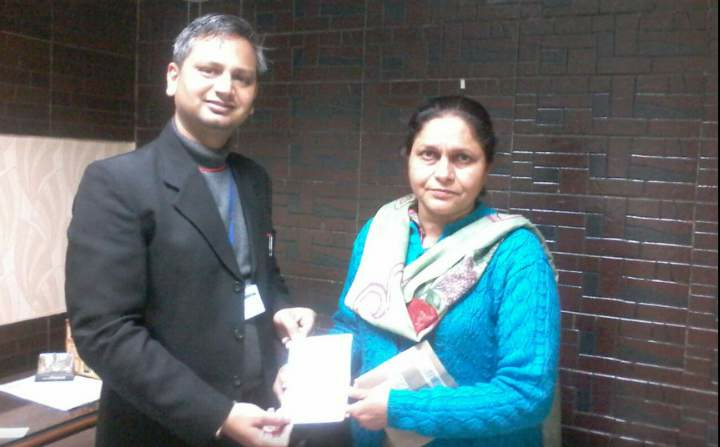 She got tourist visa of Australia...Tarlok Chand getting visa on behalf of her wife. SAGA Studies wishing you sucess and Prosperous life ahead..
Congratulations Narinder Kaur. 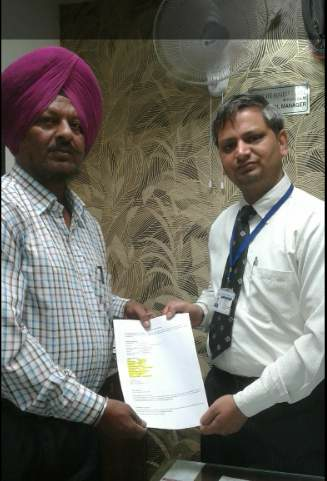 She got tourist visa of Australia..Tejbir Singh getting visa on behalf of her mother. 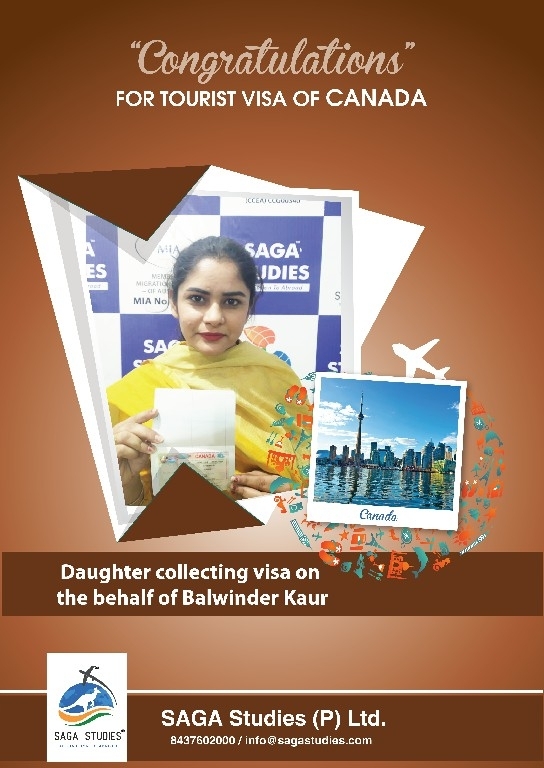 SAGA Studies wishing you sucess and Prosperous life ahead..
Congratulations Vir kaur. 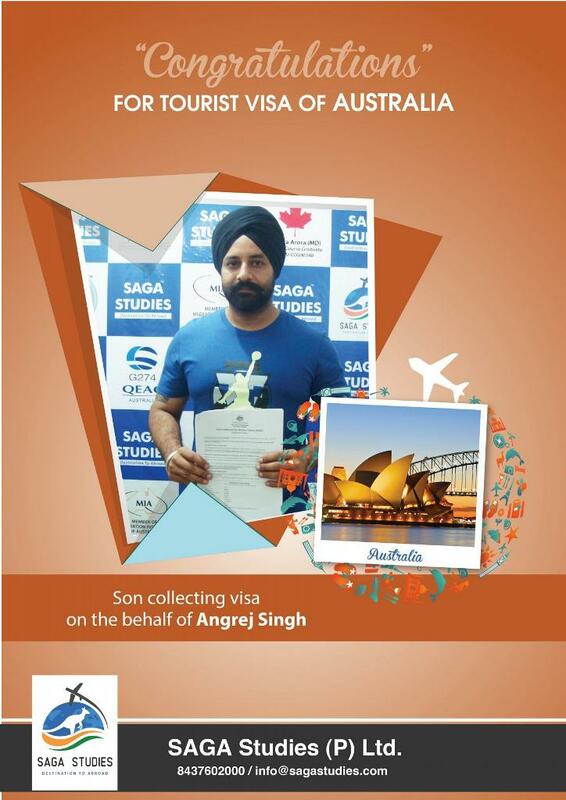 She got tourist visa of Australia....Arvinder Singh, her nephew is getting visa on their behalf. 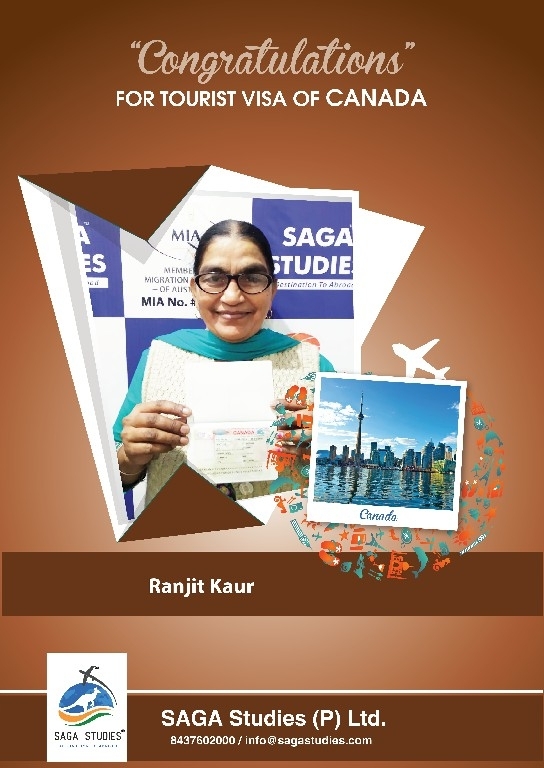 SAGA Studies wishing you sucess and Prosperous life ahead..
Congratulations Raminder Kaur!!! She got tourist visa for Australia.. Wish you all the best for life ahead... 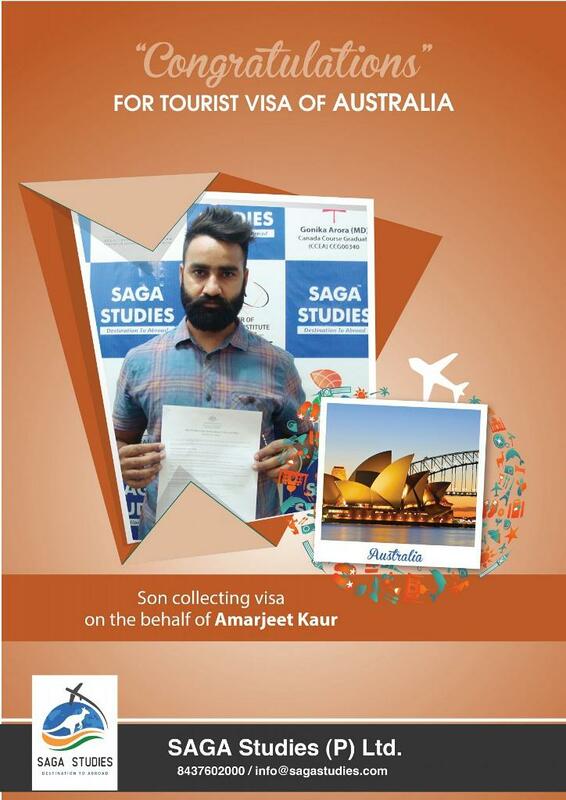 Happy Journey..
Congratulations Tarsem Singh... He got tourist visa for australia.. Wish you all the best for life ahead... Happy Journey..
Congratulations.. 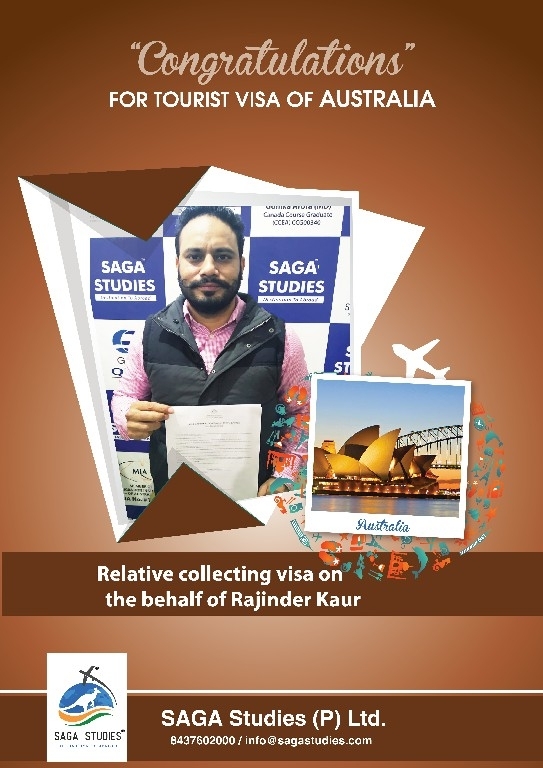 He got Tourist visa For her Dauther in Law (Rupinder Kaur).. Wish you all the best for life ahead..
Congratulation Surjit singh... He got tourist visa for Australia... Wish you all the best for life ahead...Happy Journey..
Congratulations Ajmer singh.. 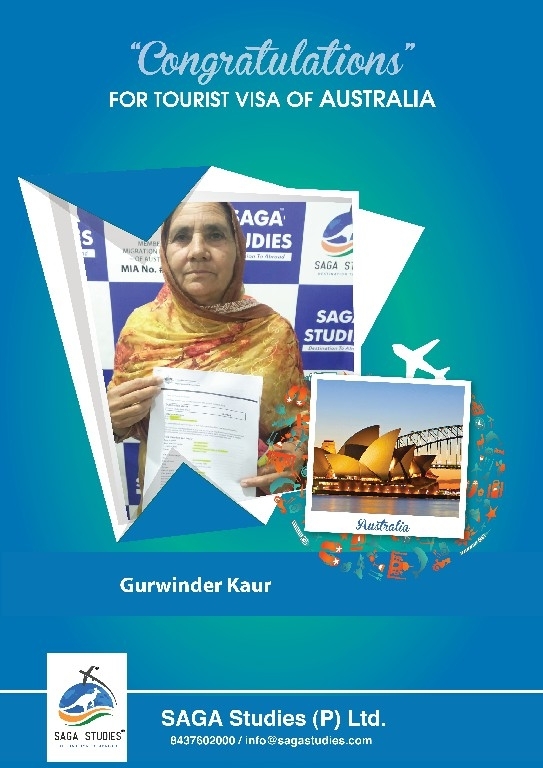 He got tourist visa for Australia... Best wishes from SAGA Studies..
Congratulation Sawinder kaur.. She got tourist visa of her mother... Wish you all the best for life ahead..